A group of Akron H.S. 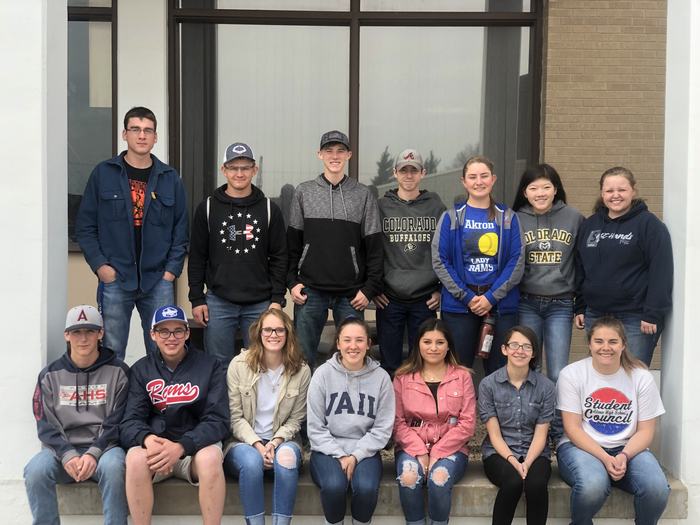 students competed at the NJC Math and Science contest today in Sterling. Only top three placers were announced today. Results: Nadalyn Poss - 3rd in Geometry, Dawson McMillion -1st in Physics, and Derrick Poss -1st in Critical Thinking. We look forward to receiving the remainder of the results in the near future. Congratulations Rams! 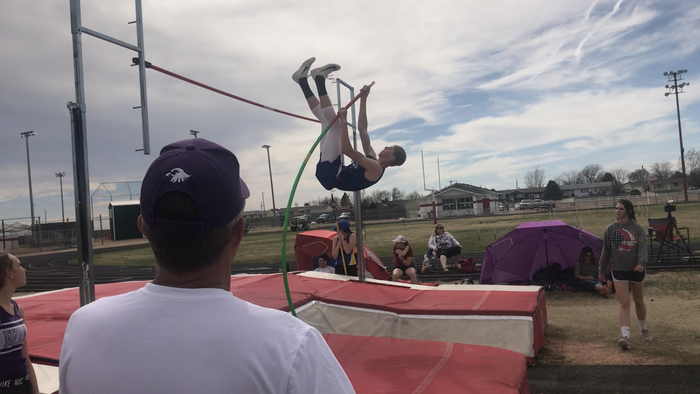 Akron Ram pole vaulters were competing last night at Yuma. 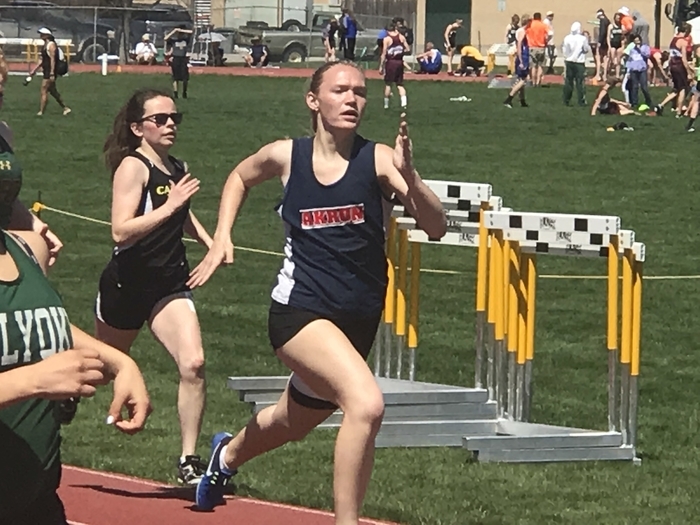 Akron Ram Track team competes at Byers on Saturday. The Rams has several good performances. 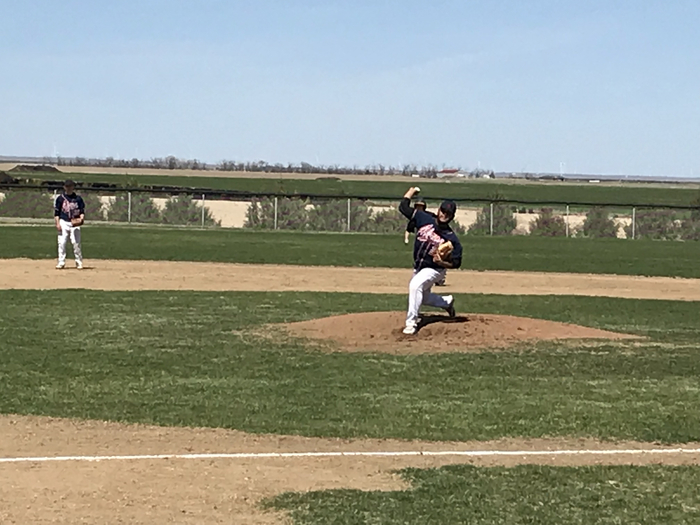 The Akron Ram baseball team dropped both games of their doubleheader at Wiggins on Saturday. 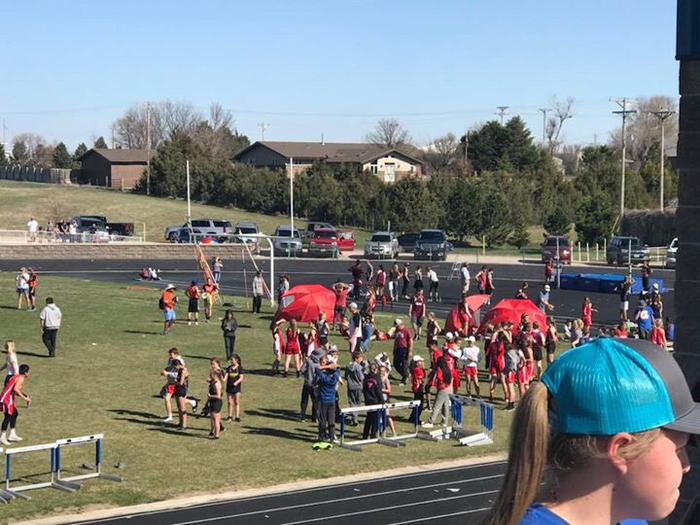 The Junior High track meet scheduled for tomorrow, April 12th, has been cancelled. The Akron School District will be closed tomorrow, Thursday, April 11th due to forecasted blizzard conditions. Please be safe. The Akron School District will have an early release Wednesday, April 10th. Students will be dismissed and buses will run at 12 (noon). The national weather service has issued a blizzard warning for our area starting as rain and transitioning rapidly to snow on Wednesday afternoon. Please check our website newsfeed and Facebook page concerning school on Thursday. 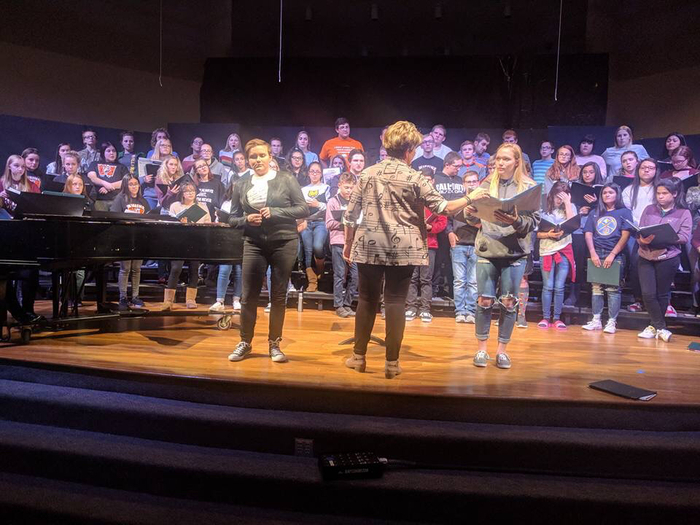 Tomorrow night our 5th and 6th grade students will be putting on a band and choir concert. Come out and support our young musicians. The concert starts at 6:30 p.m. The H.S. baseball doubleheader at Yuma has been rescheduled for Monday, April 1st, at 2 p.m. The H.S. baseball game scheduled for today, March 30th, at Yuma has been postponed due to field conditions. The game will be rescheduled for this coming Monday or Tuesday depending on the availability of umpires. We will communicate the rescheduling of the game as soon as we are informed. 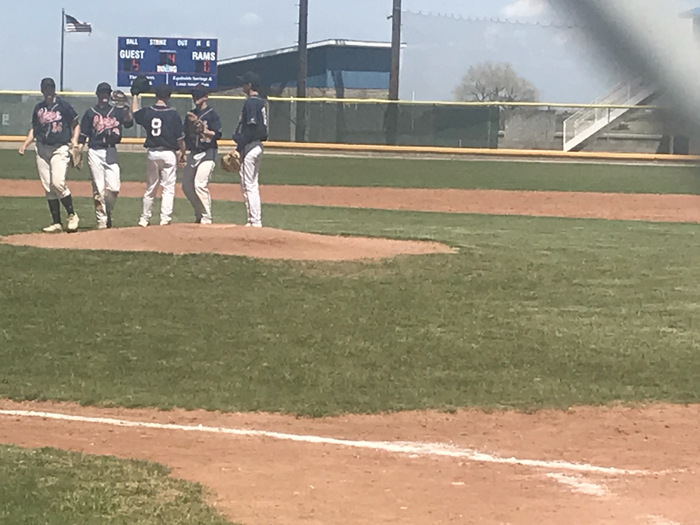 The start time for the Akron HS Baseball game scheduled at Yuma on Saturday March 30 has been moved back to 1 PM due to weather. 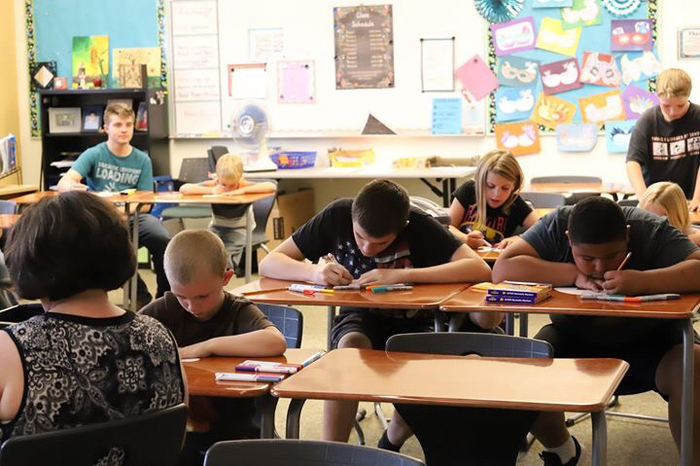 Please go to our school webpage for information on upcoming state standardized testing. 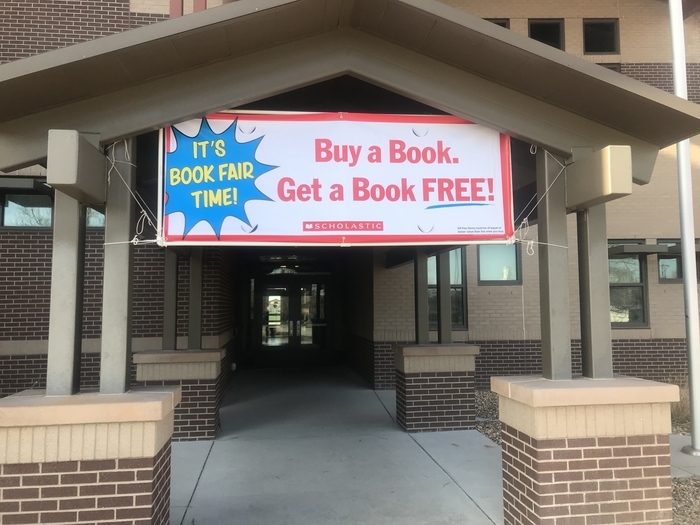 It’s Buy One Get One Fred Book Fair next week. 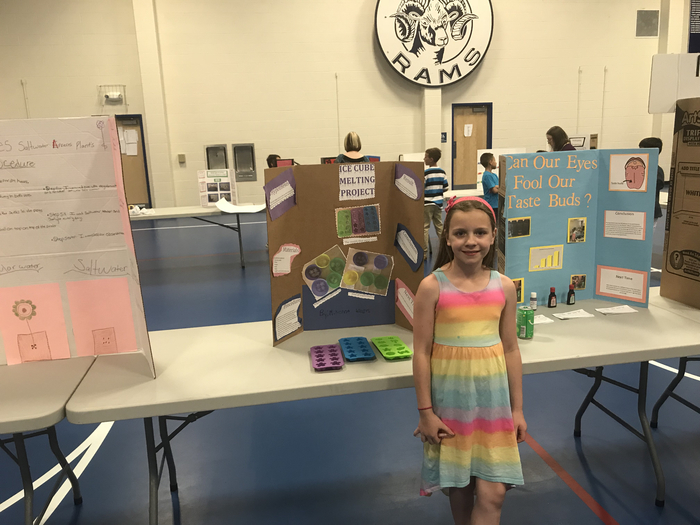 The fair runs all week during school hours in our library. 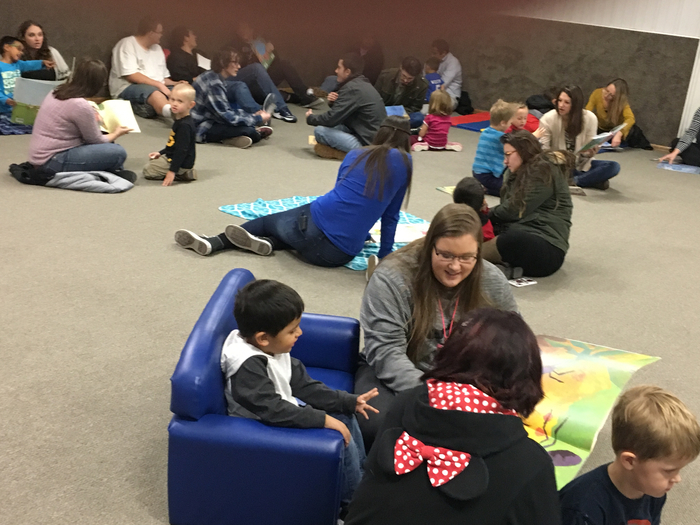 On Wednesday, April 3rd we will have a Family Book Fair Night from 4 p.m. until 6:30 p.m. 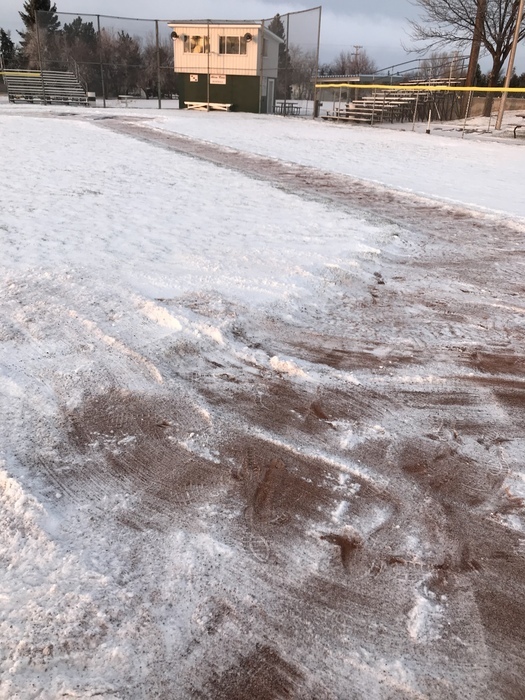 The high school baseball game and track meet scheduled for today, Saturday, March 23rd, 2019 are postponed due to weather. The baseball game vs. Wray has been rescheduled for Tuesday at 3 p.m. the Yuma Track meet is T.B.D. 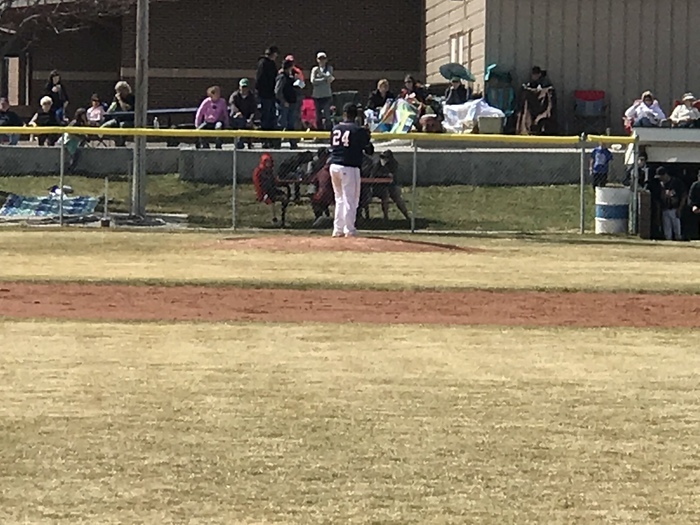 The Akron high school baseball game against Caliche scheduled for tomorrow, March 16th, has been moved to Tuesday, March 19th at 3 p.m.
Due to adverse road and weather conditions, Akron School District will he closed tomorrow, Thursday, March 14, 2019. Due to the threat of adverse weather conditions, Akron SD is cancelling school for tomorrow, Wednesday, March 13, 2019. The Akron J.H. 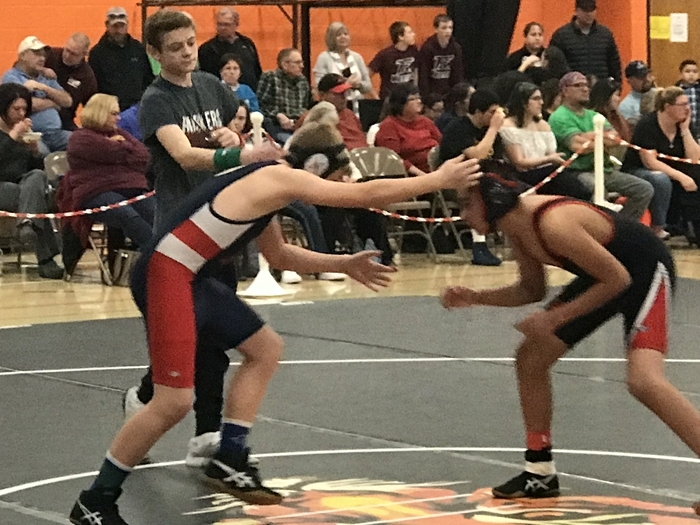 wrestling team finished their season at the LPAA tournament in Caliche. Nice job wrestlers and coaches! 📣 Calling all students PS-4th grade!! 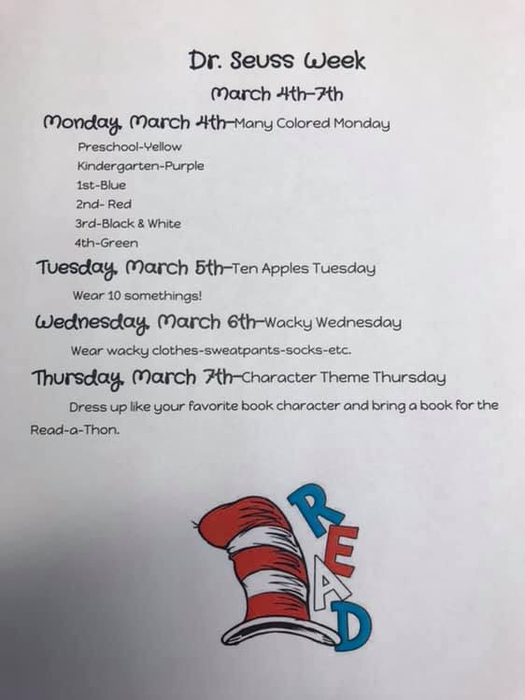 📣 Join in the fun for Dr. Seuss Week next week! 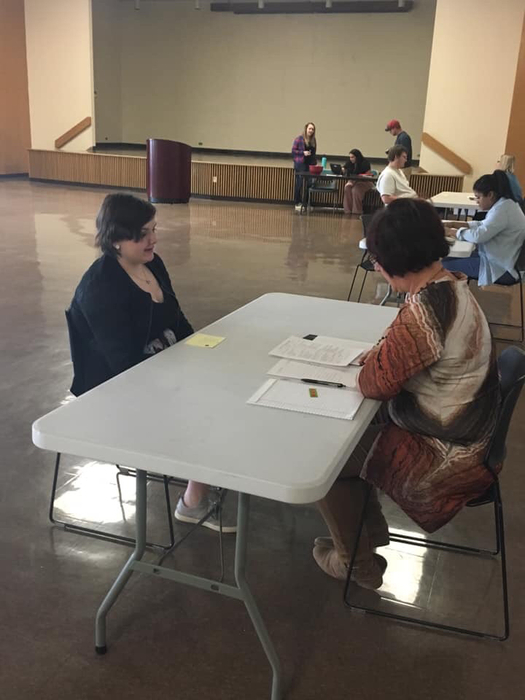 The seniors had the opportunity to attend a mock interview last Tuesday at NJC; which was set up through the COSI grant. The Rams finish fourth at Districts today. 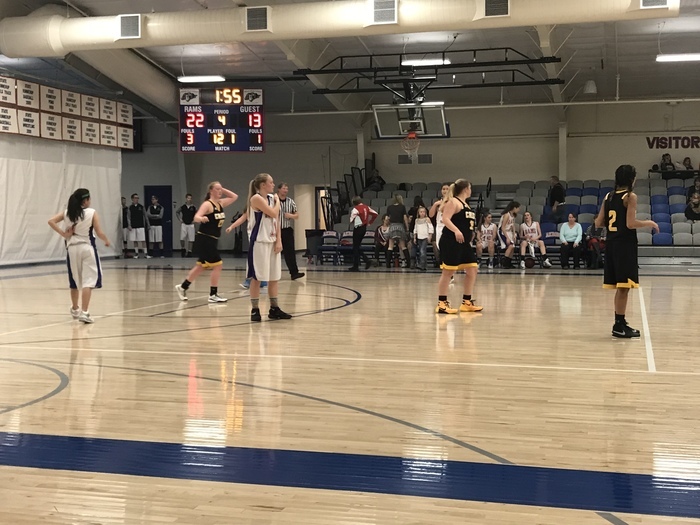 They lost a tough game to Sedgwick County by six, 30-36. Rams now wait to see where they will go for Regionals next weekend. Go Rams!! 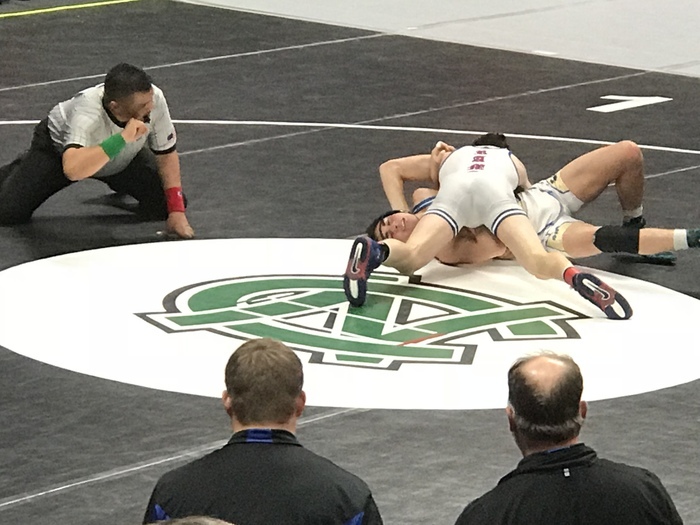 The Akron Ram wrestlers finished the 2019 State Wrestling Tournament with 39 points and two state placers. All four seniors contributed to the point total and Justin Traxler and Carson Reese both finished in 4th place. Thank you wrestlers and coaches for a great season! 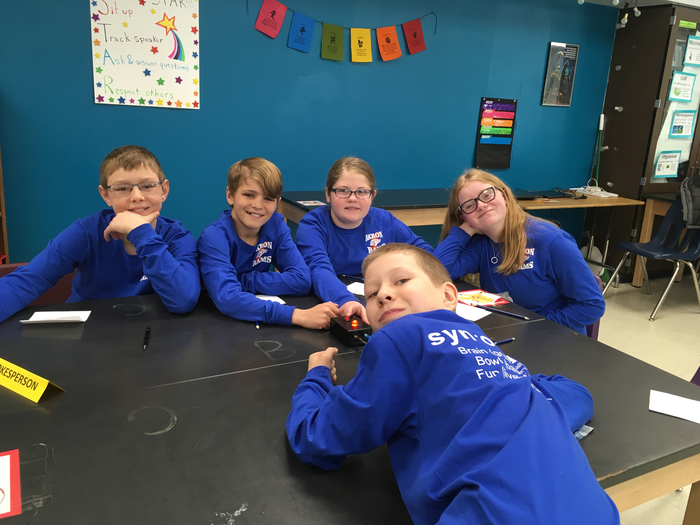 The Akron 6th grade Brain Bowl team had a successful morning at the state competition winning all four matches. After the written round they found out that they had made the top 8 qualifying them for the afternoon rounds. Go Rams! 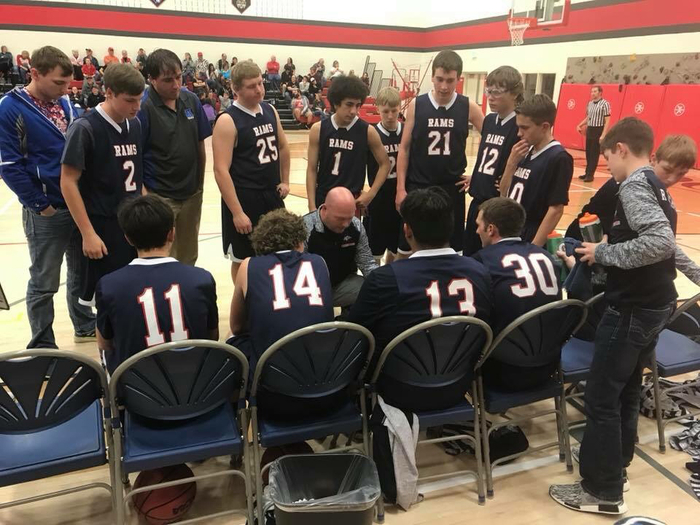 Due to weather conditions the Akron Rams Boys’ Basketball Team will play in Districts on SUNDAY, FEBRUARY 24th at Sterling High School. The Rams have the second game of the afternoon. The first game will tip off at 1:00, and the Akron Rams should tip off around 2:15. Games will immediately follow each other. 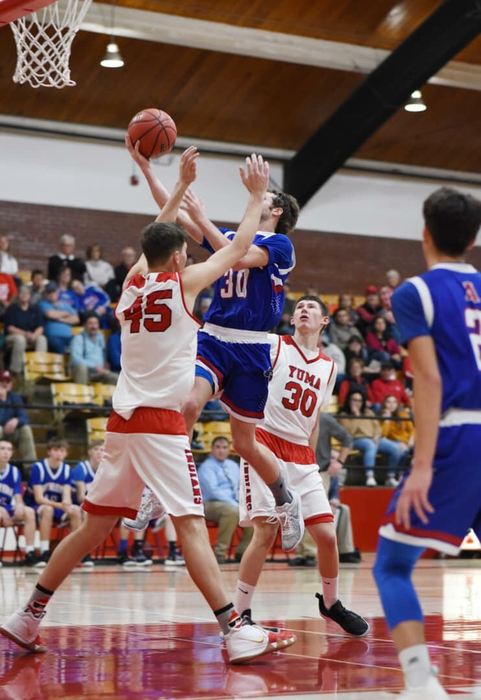 The Akron Ram boys basketball team will play at 4:30 p.m. in the district semifinal against Yuma today at NJC in Sterling. Go Rams! The Akron Ram H.S. 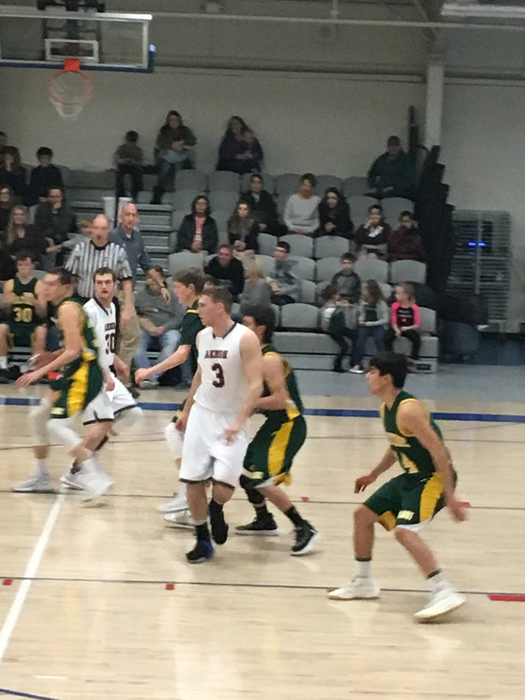 boys basketball team advanced to the semifinals of districts with a victory over the Holyoke Dragons in double overtime 64-58. Go Rams! 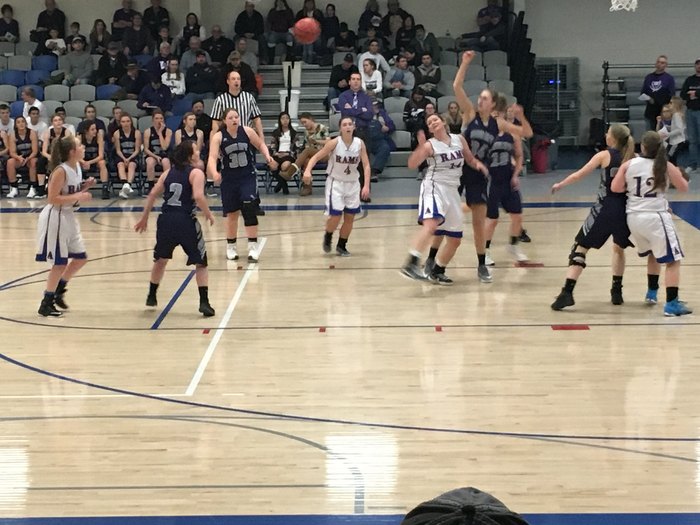 The Akron Lady Rams lost at Holyoke Tuesday night bringing their season to an end. Thank you players and coaches for your effort this season. AKRON RAM PEP RALLY An Akron Ram pep rally was held on Tuesday afternoon for our H.S. Basketball teams, H.S. 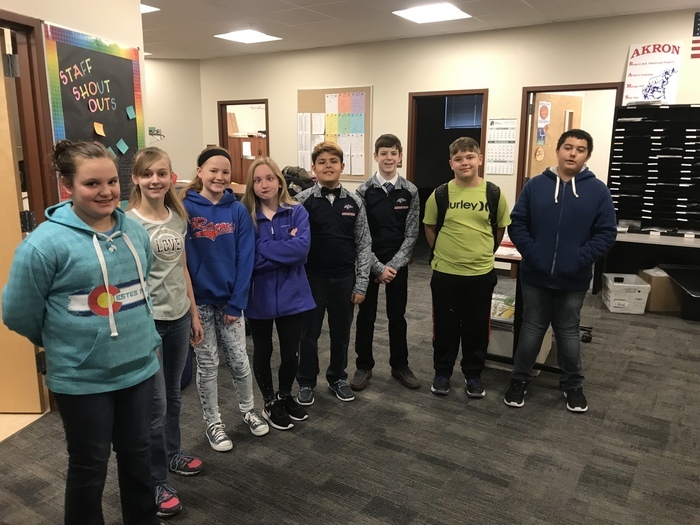 Wrestling team, 6th grade Brain Bowl team, and H.S. 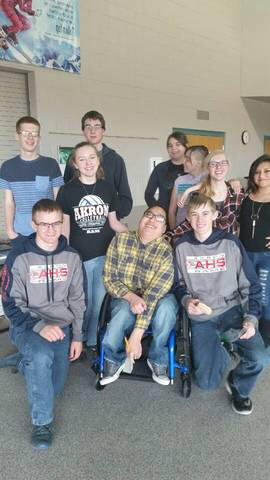 Knowledge Bowl team. 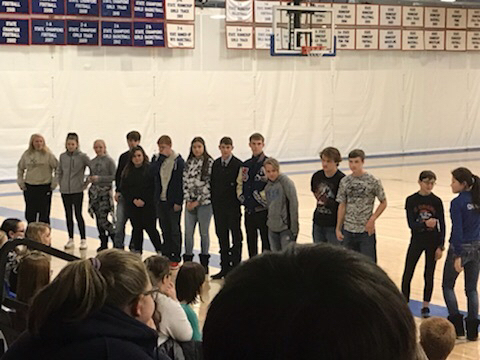 Our basketball teams compete in the first round of districts tonight and the other teams that were recognized will be competing at state. Go Rams!! 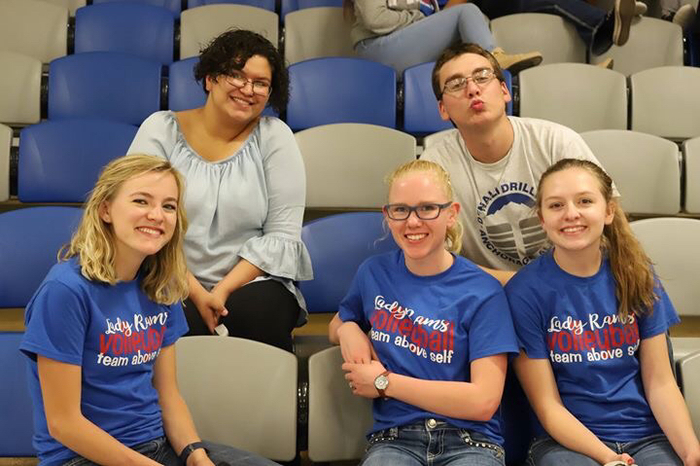 Pep Rally today at 3:05 for Akron Knowledge Bowl teams, H.S. Basketball teams, and H.S. Wrestling. 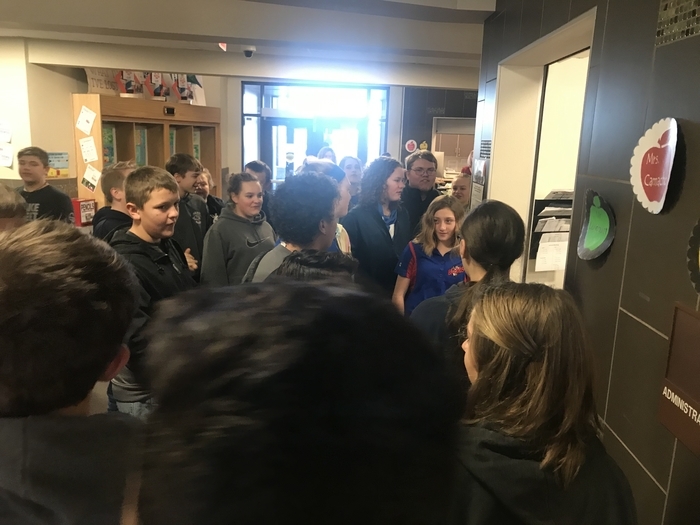 A traditional send off for the wrestling state qualifiers will also take place on Thursday morning at 8 a.m.
AKRON JUNIOR HIGH BASH The Akron J.H. 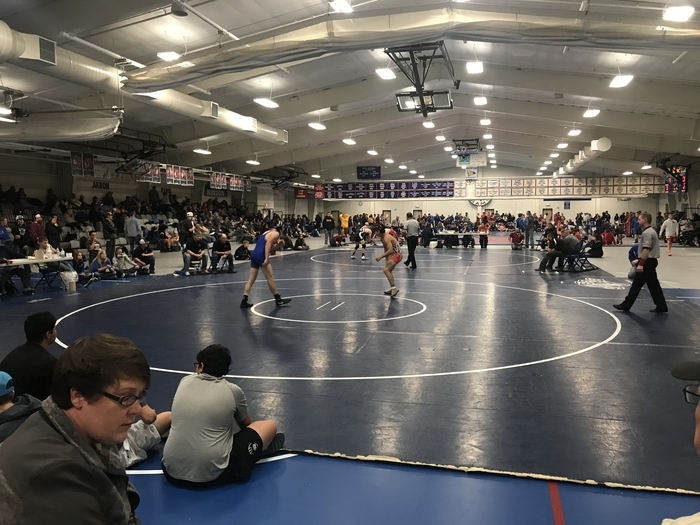 wrestlers hosted teams from Wray, Yuma, Caliche, Sterling, Merino, Holyoke, Sedgwick County, and Fleming. 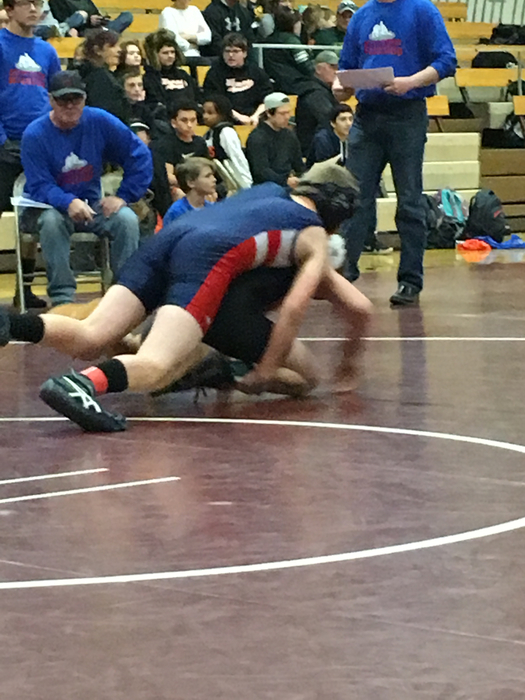 The wrestlers competed in three rounds of competition and gained valuable experience. 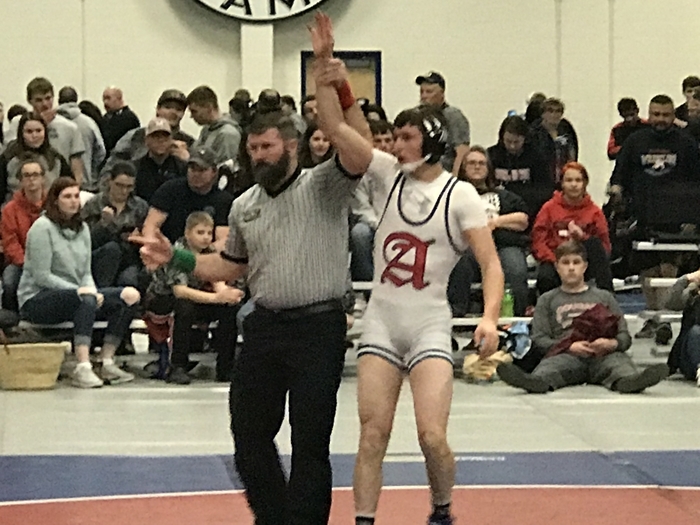 The Akron Rams put together a solid performance in the Region 3 wrestling tournament. 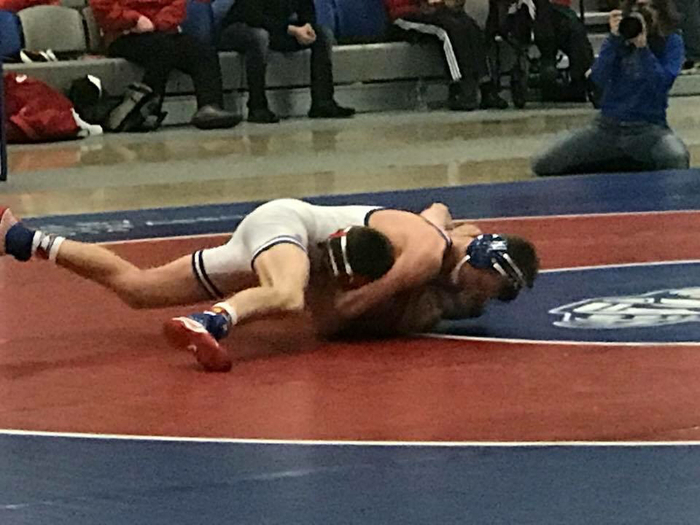 All eight wrestlers scored points and four wrestlers are headed to state next week. The Rams finished in 6th place as a team with 117 points. 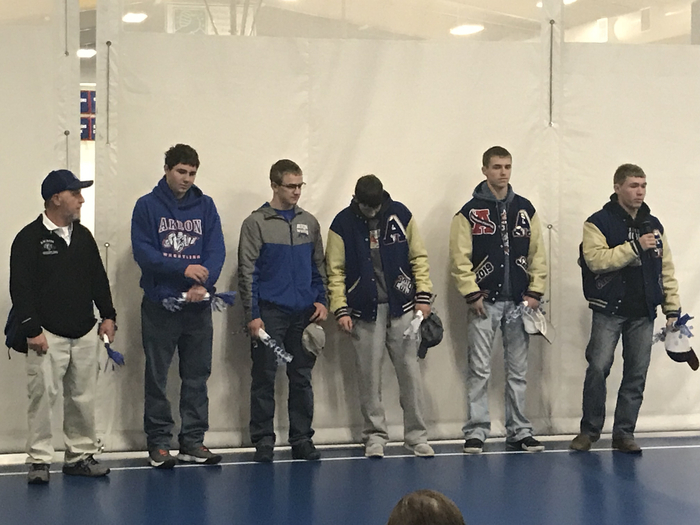 Individual placers: Justin Traxler- Regional Champion, Carson Reese- Regional Champion, Seth Dorrenbacher 3rd, Derrick Poss 4th, Gavin Brown 5th, and Xavier Livesay 6th. Great job Rams! 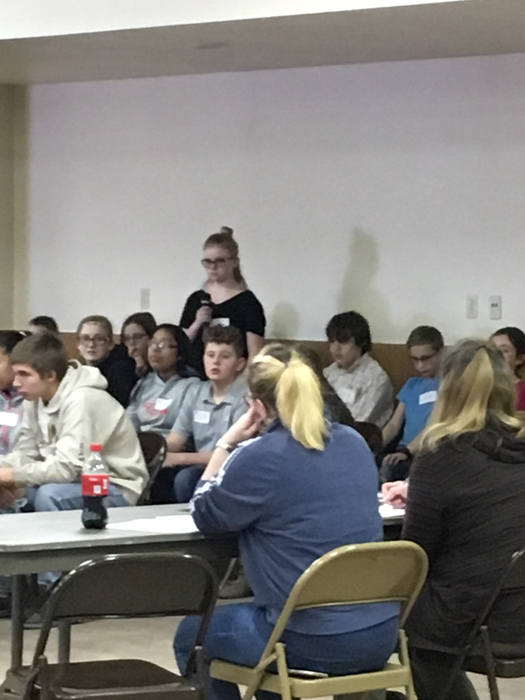 On Friday, a group of our students participated in the regional spelling bee in Brush. 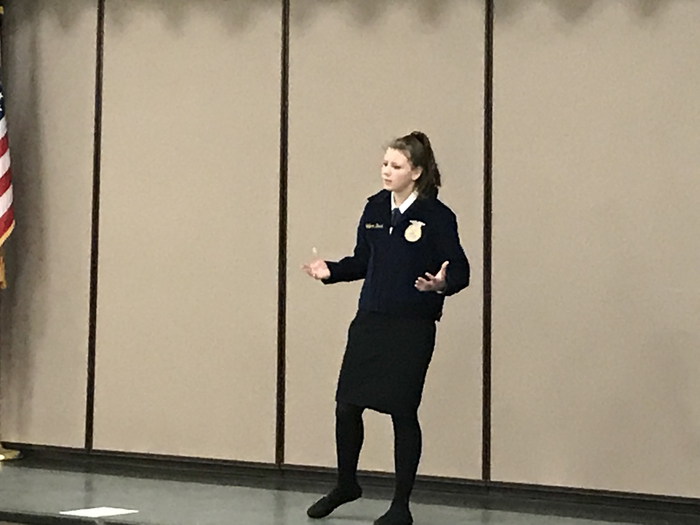 One of those students, Kaylee Roseberry, advanced to the oral round finishing in the top 14. 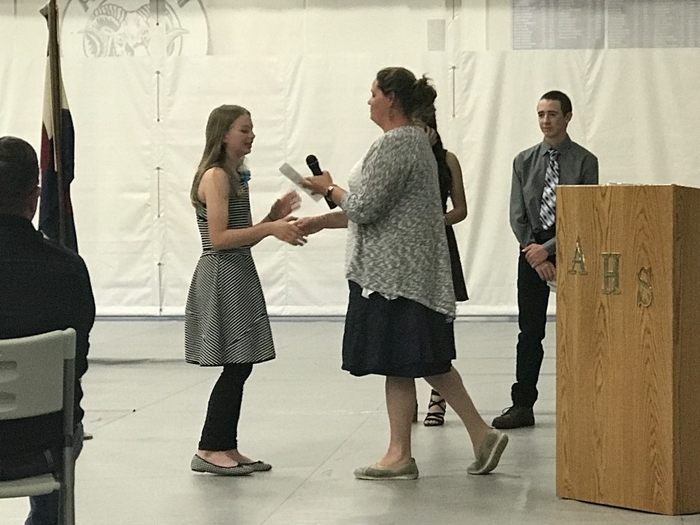 Congratulations to our students and thank Mrs. Kilee Vogt for your work with our students. 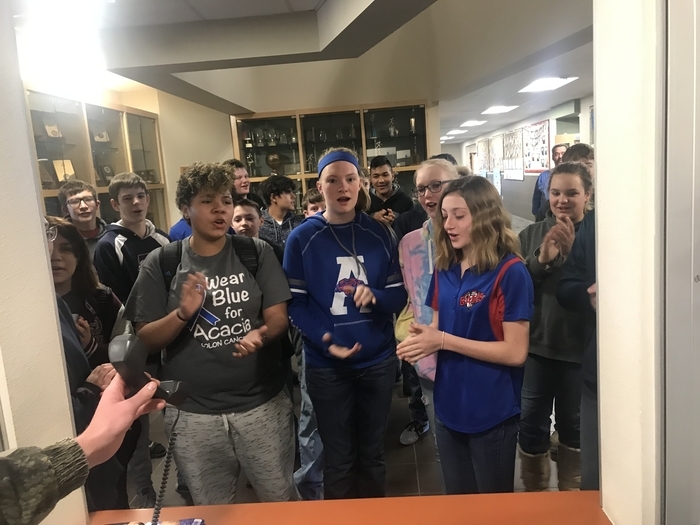 The Akron 6th grade led the school in the Akron Ram Fight Song on Thursday morning. Go Fighting Rams! 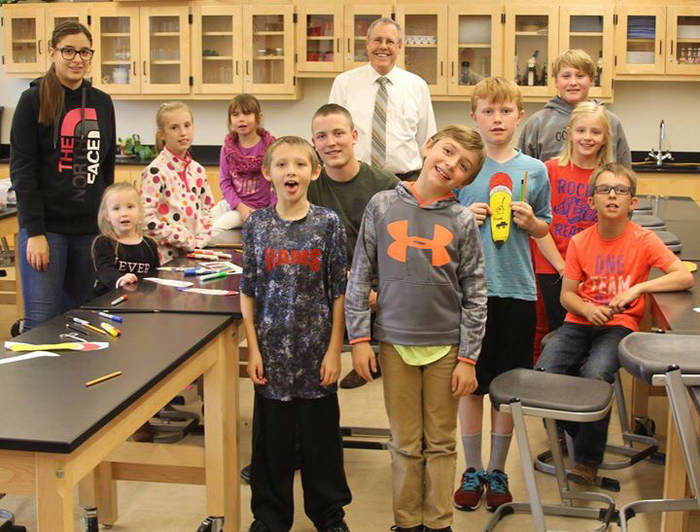 Akron science teacher Ms. Katie Thompson and her students made a trip to Julesburg in Friday. 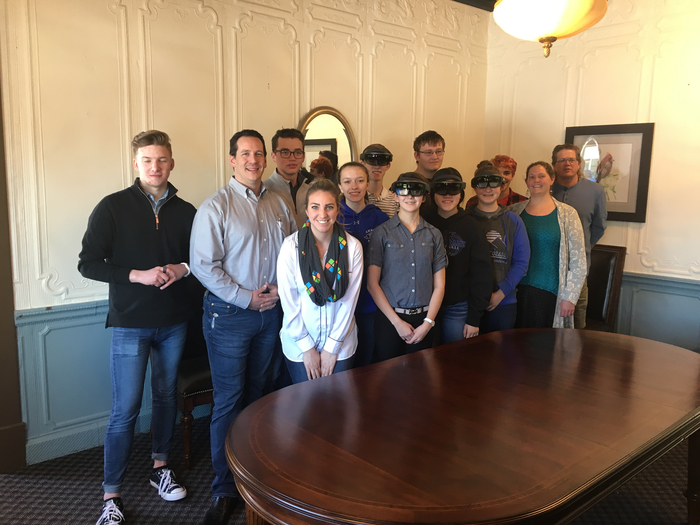 They had lunch with General Jay Lindell, visited IT Works 3D Printing, and met Microsoft Corporate folks today. 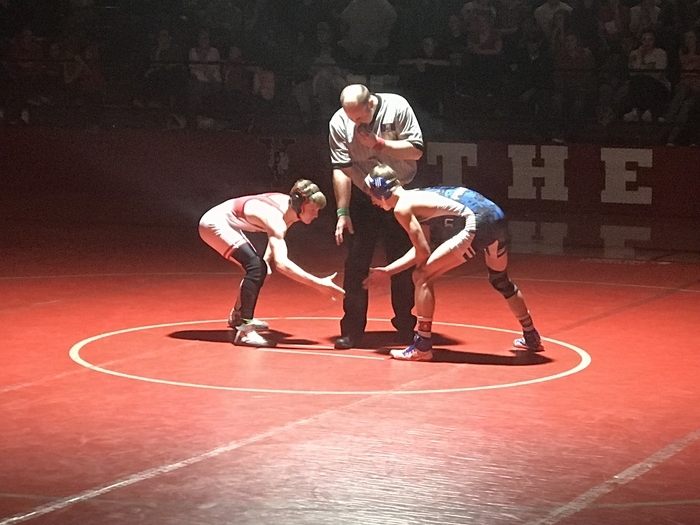 The first night of regional wrestling is in the books. 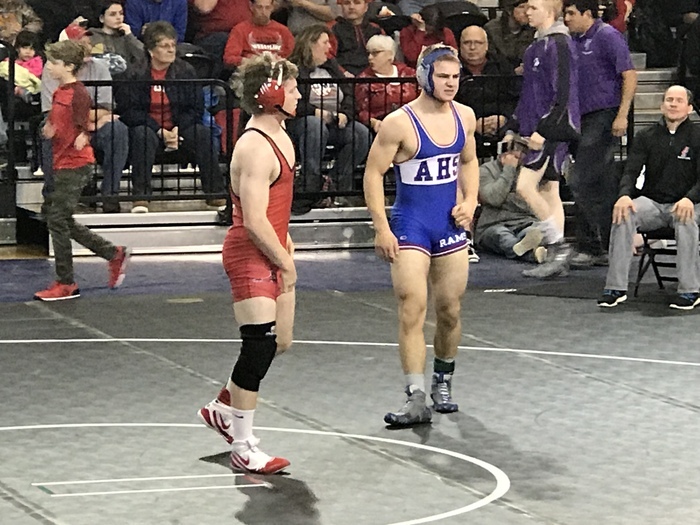 The Akron Rams advanced 5 of 8 wrestlers into the semifinals. Wrestling starts at 9:30 a.m. tomorrow. Come out and cheer on the Rams! 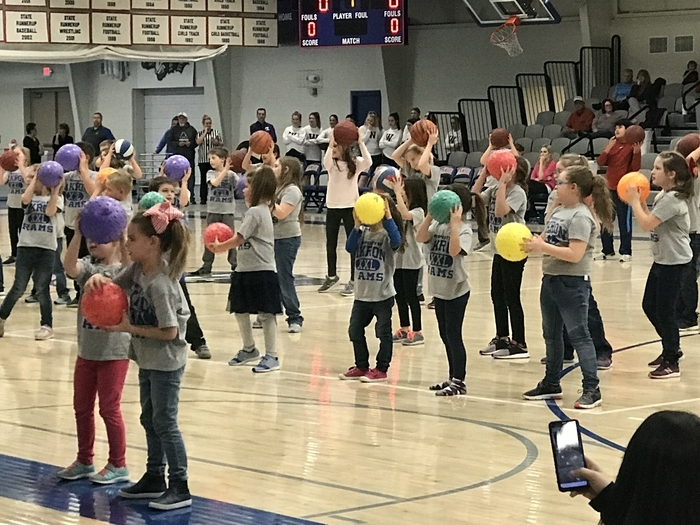 Mrs. Sue Hellyer’s elementary music students entertained basketball fans Thursday evening with a ball handling music routine. 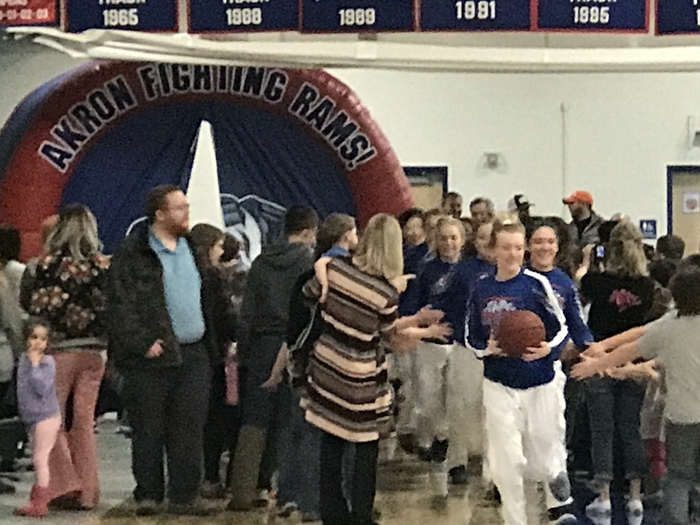 Following their routine several students helped form a spirit line for the Lady Ram basketball team. 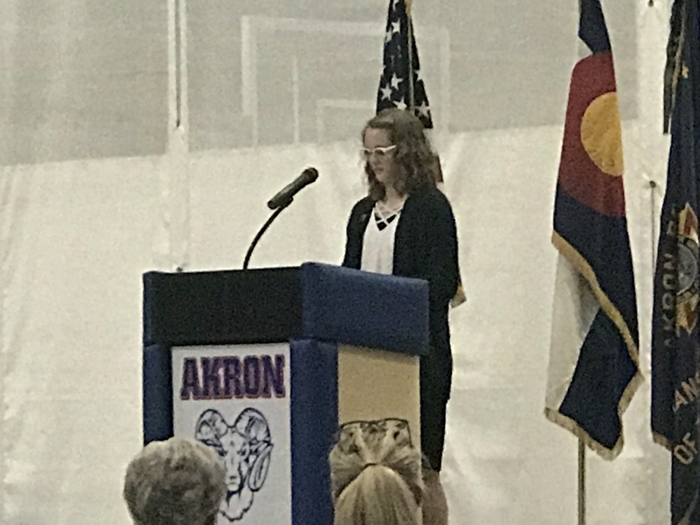 Akron Ram H.S. 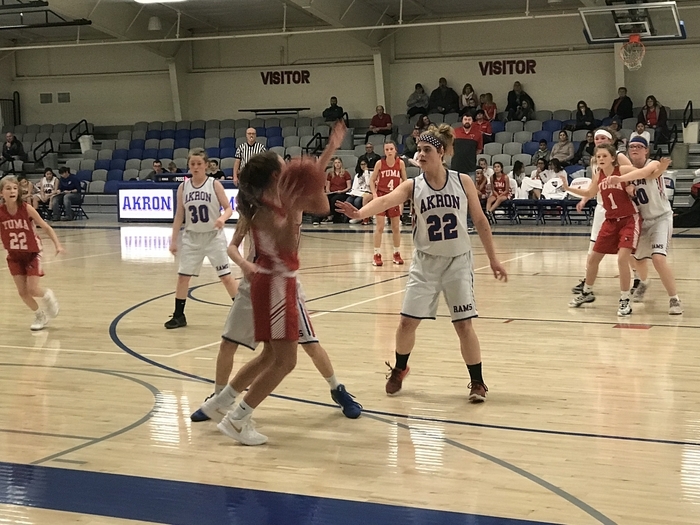 Basketball (2/14/19) Ladies-Akron 33 Wray 67 Men- Akron 51 Wray 61 District basketball starts this coming Tuesday. Go Rams! 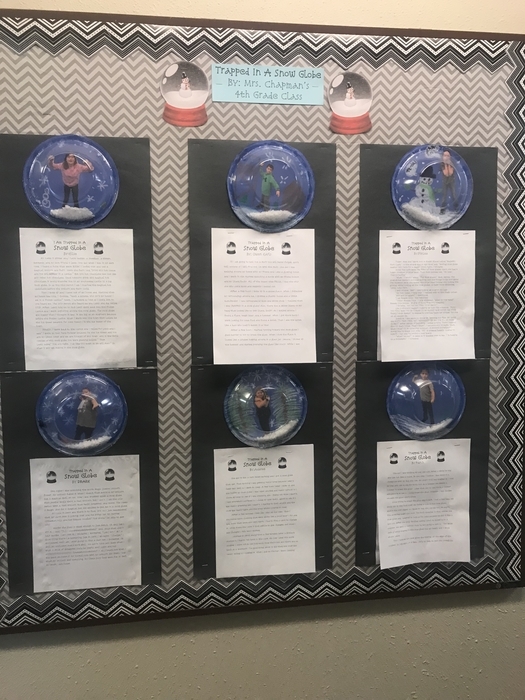 Check out Mrs. Chapman’s 4th grade -Trapped in Snow Globe project. 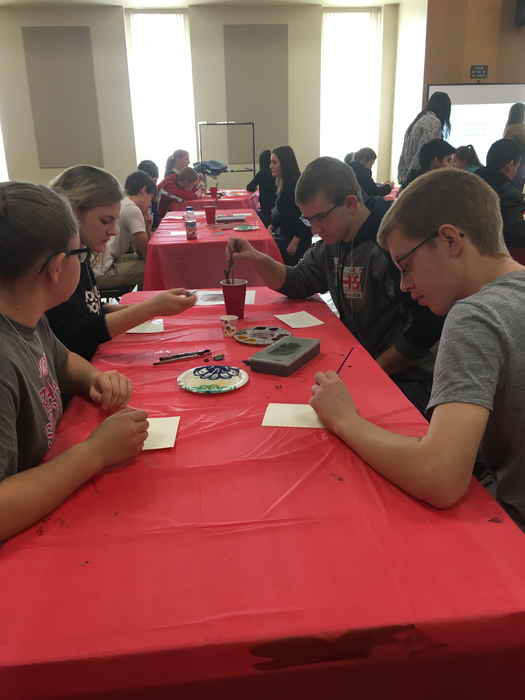 Some of our Akron students participated in the Gifted and Talented Ultimate Summit held at NJC today. 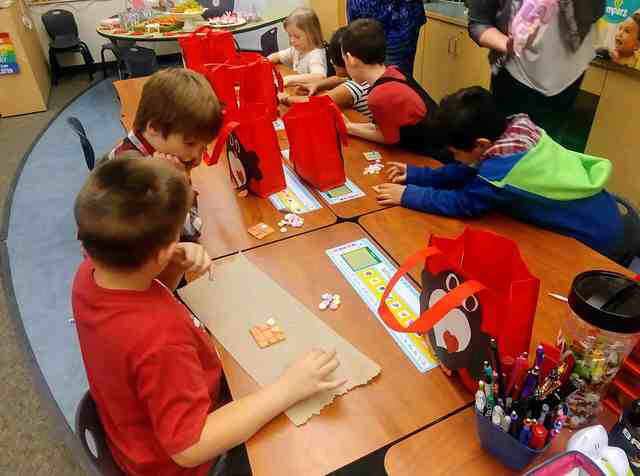 Akron FCCLA students decorated cookies with some of the first grade students. 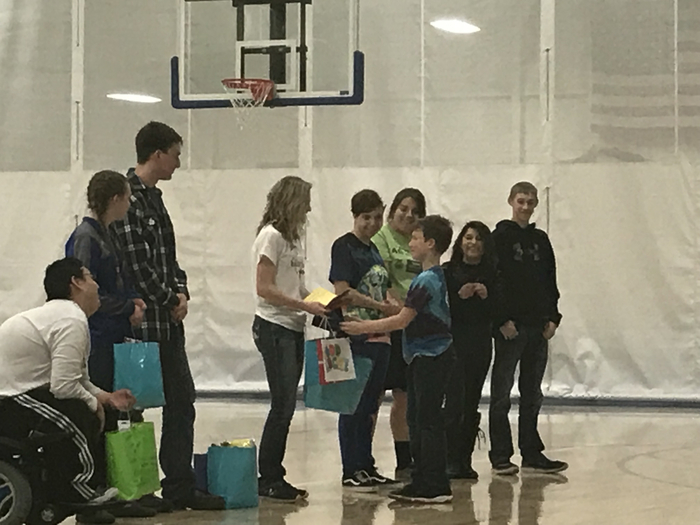 Akron students participated in the Gifted and Talented Ultimate Celebration held at NJC last Friday, February 8th. 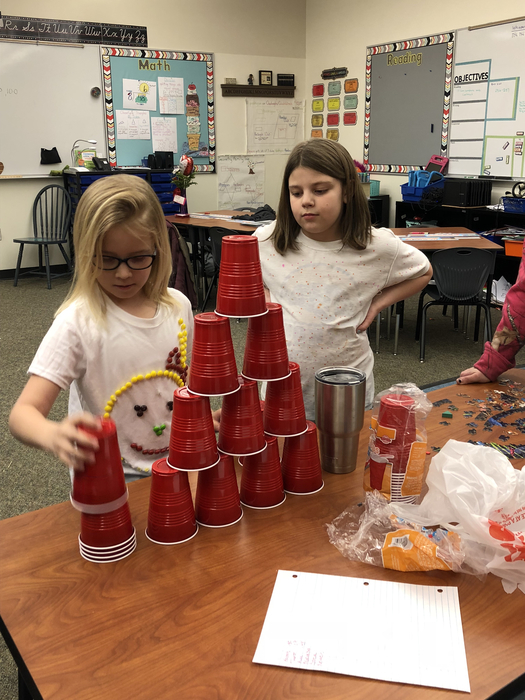 Students learned about the brain and how it works. 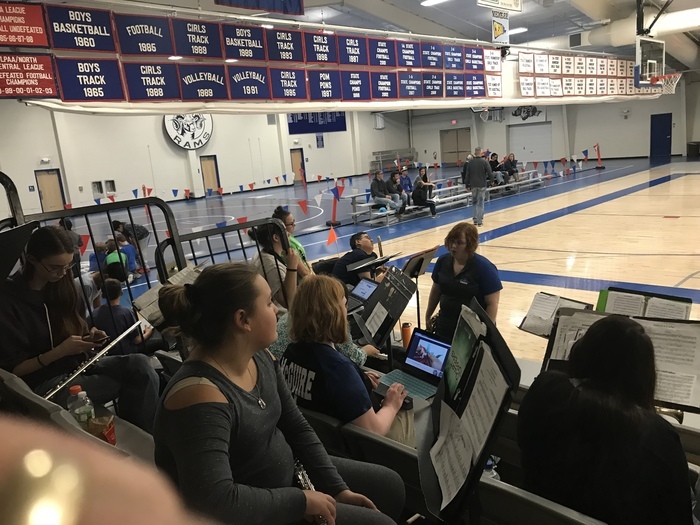 Ms. Lowry and a group of her band students participated in league band held in Wray in Monday. The students were also part of a concert held at the end of the day. Great job Rams! 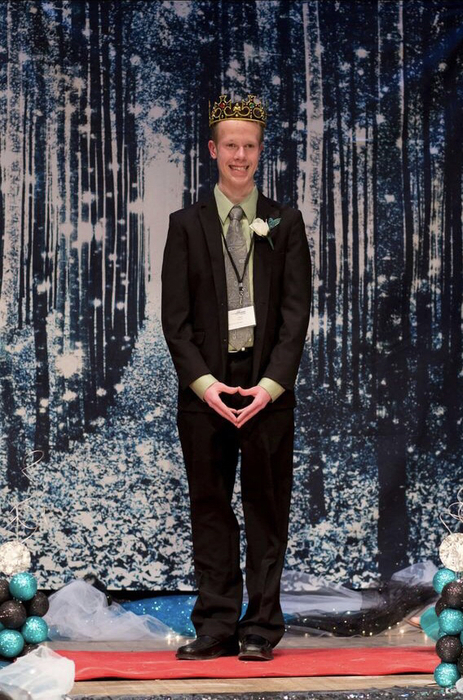 Our own Caleb Moormeier was part of a group of 170 guests that took part in the ‘Night to Shine’ event last Friday night held in Ft. Morgan. The ‘Night to Shine’ events are presented globally by the Tim Tebow Foundation. Thank you to the many sponsors that made this event happen. 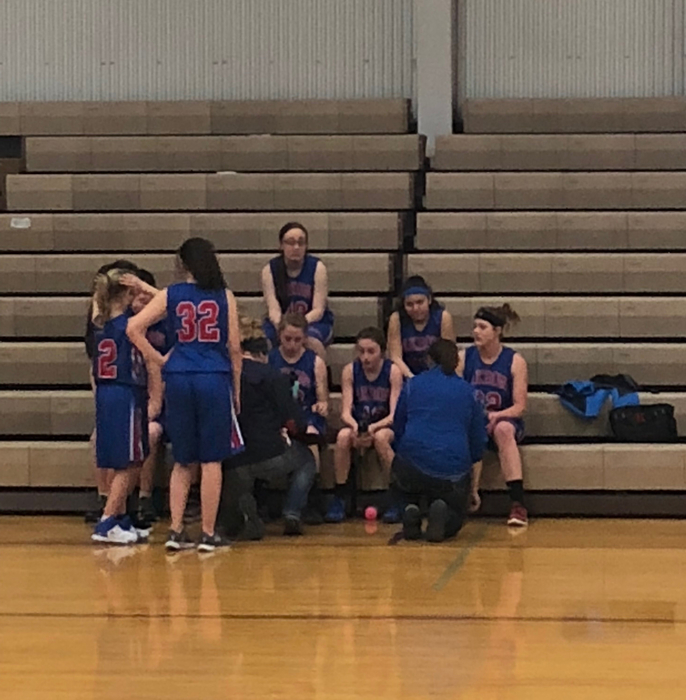 The Akron J.H girls basketball team played at Merino today in the LPAA League Tournament. 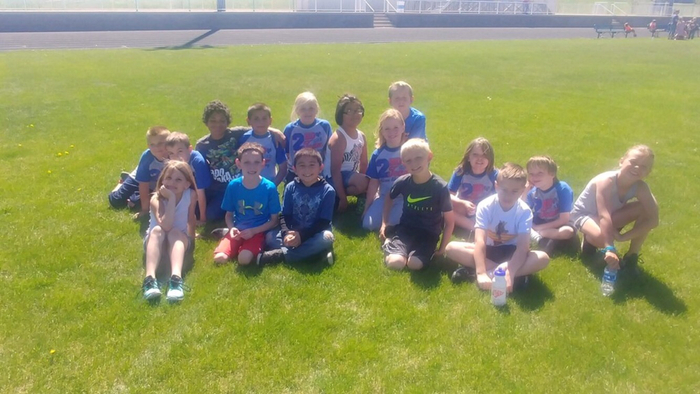 The ‘A’ squad placed 2nd and the ‘B’ team took 4th. Thank you players and coaches for a great season. The Akron Ram H.S. 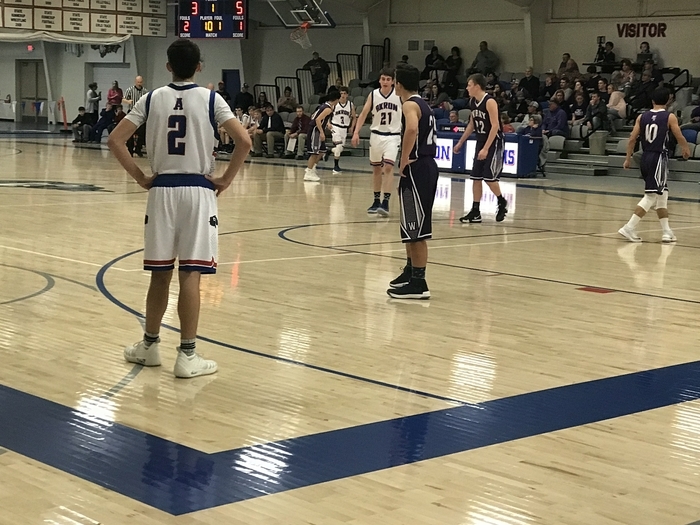 basketball teams hosted the Sedgwick County Cougars last night. 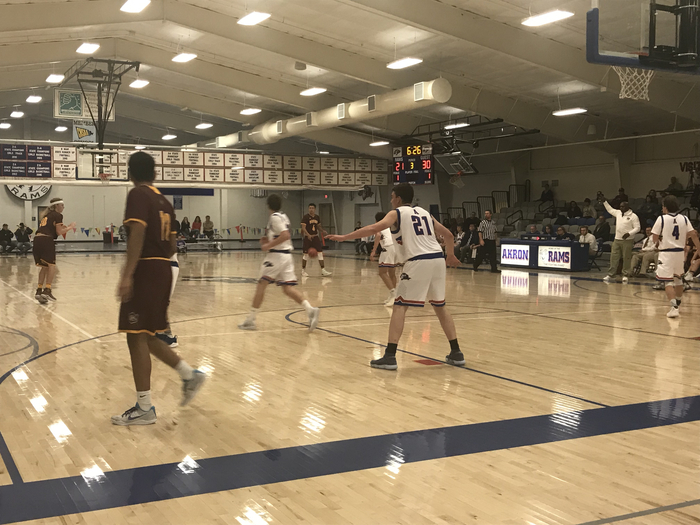 The Cougars won the girls game and the Rams won the boys game 48-44. Go Rams! REGIONAL CHAMPIONS The Akron H.S. 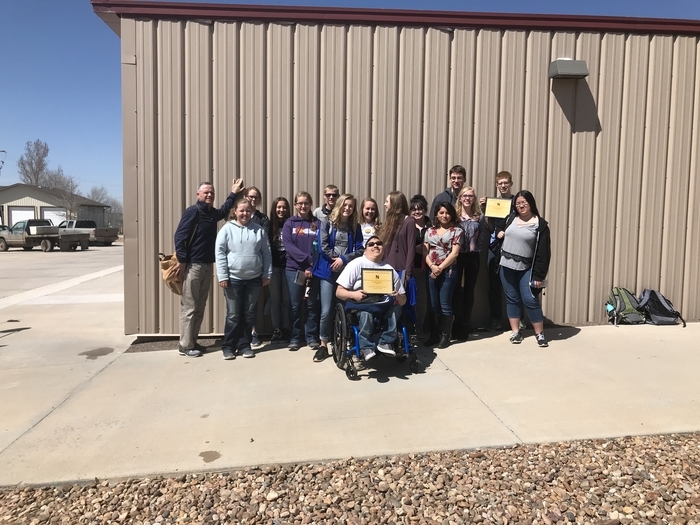 Knowledge Bowl Team won the 2A Region 7 Knowledge Bowl competition held today in Greeley. 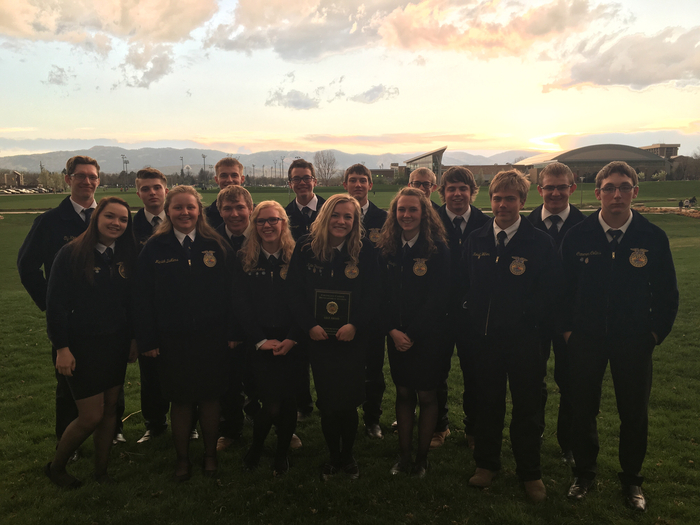 The team will now move on and compete at the state competition. 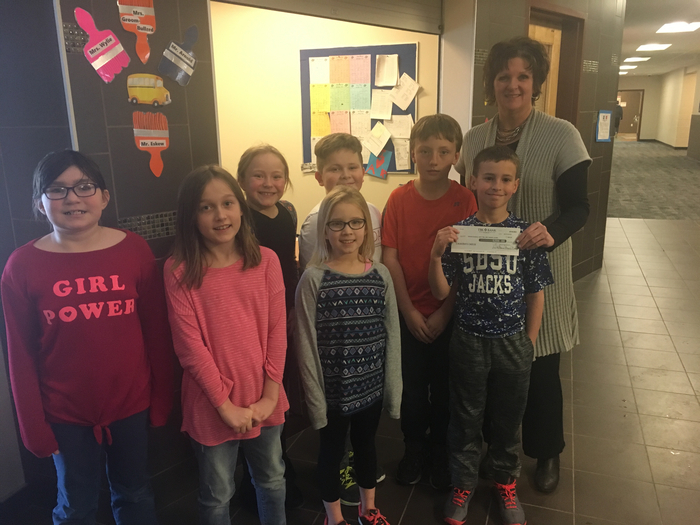 Congratulations to our students and their coach Mrs. Denise Pickens! The Akron Ram H.S. 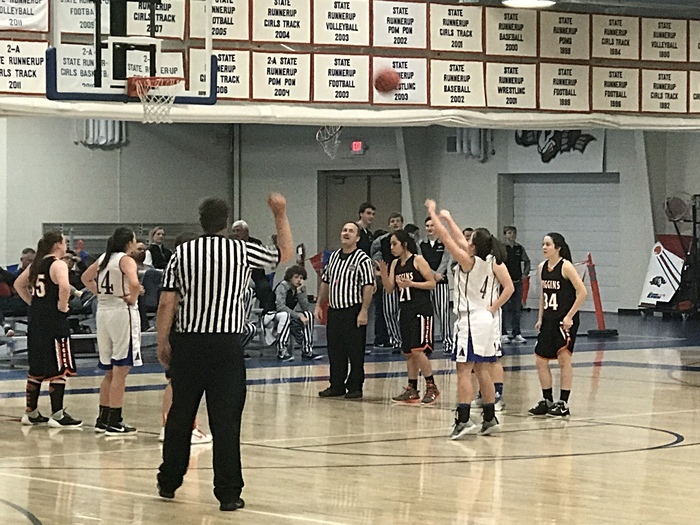 basketball teams were on the road last night against Holyoke. 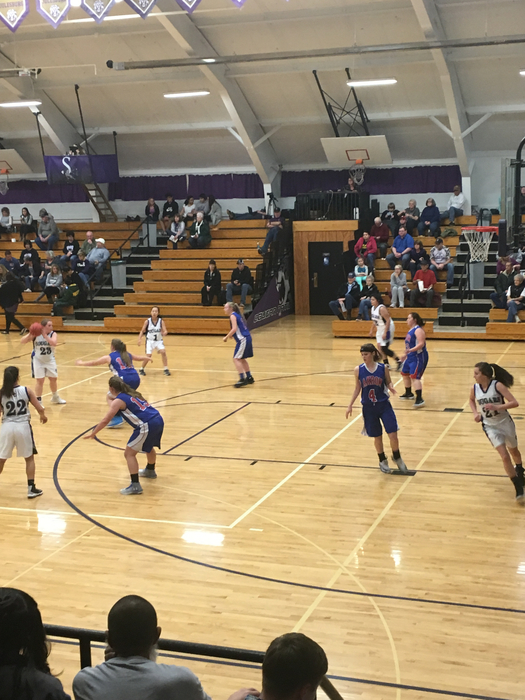 Holyoke came out on top in the girls contest 59-32 and Akron won the boys game 62-52. 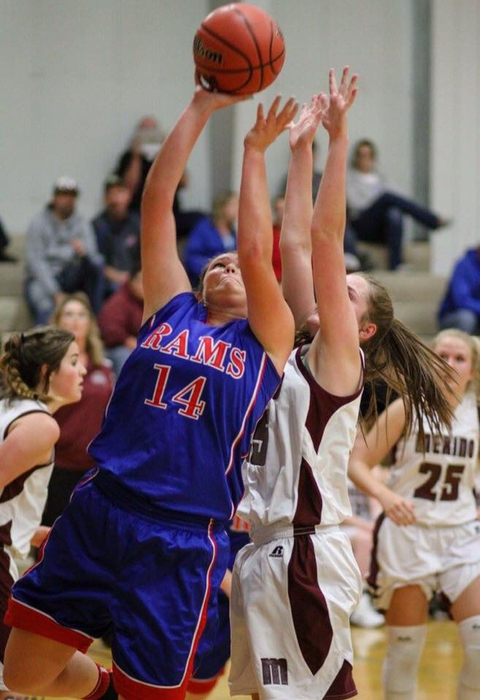 The Rams will be in action again tonight against Sedgwick County at home. It will also be parents night for our basketball teams. Go Rams! 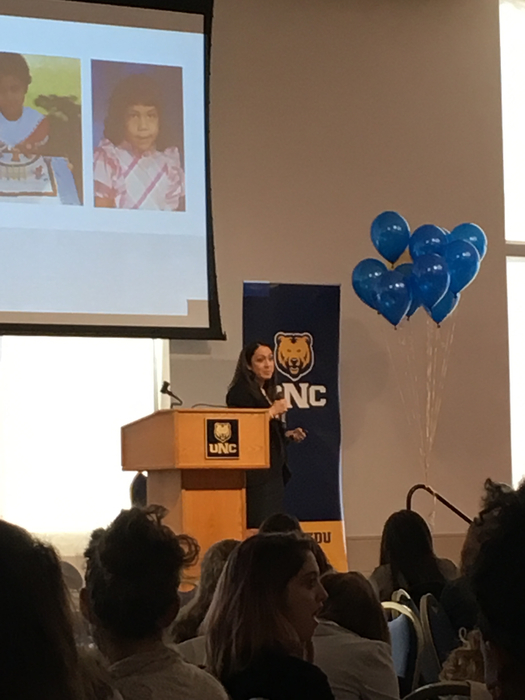 Congratulations to Akron High School’s Ivonne Lozano for being elected as Northeastern Plains FCCLA District President for the 2019-2020 school year! We are proud of you!!! A big THANK YOU to everyone at the Akron Airport. 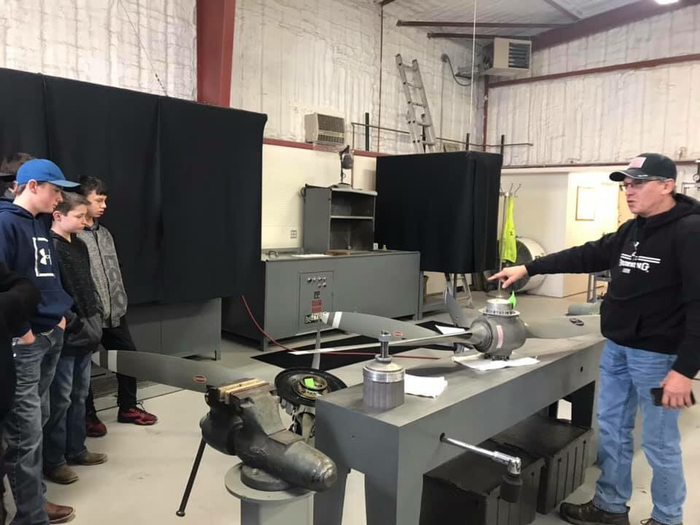 The 8th grade class toured Hayes Aviation, Redline Propellor, and Redline Governor today. 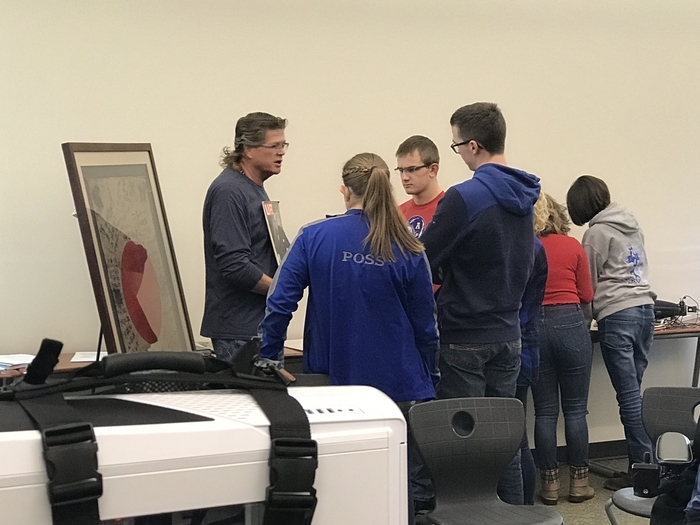 They took this tour for a new project they will be working on in class. 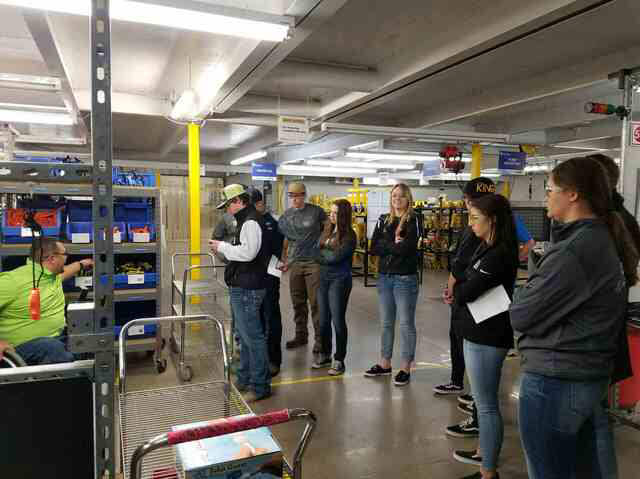 The project’s mission is to expose students to manufacturing opportunities in rural America. 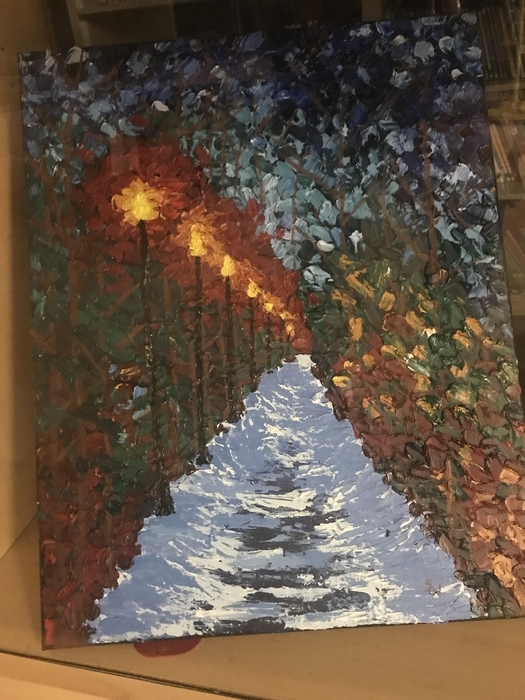 New Akron Ram student art on display in the cafetorium. The Akron J.H. 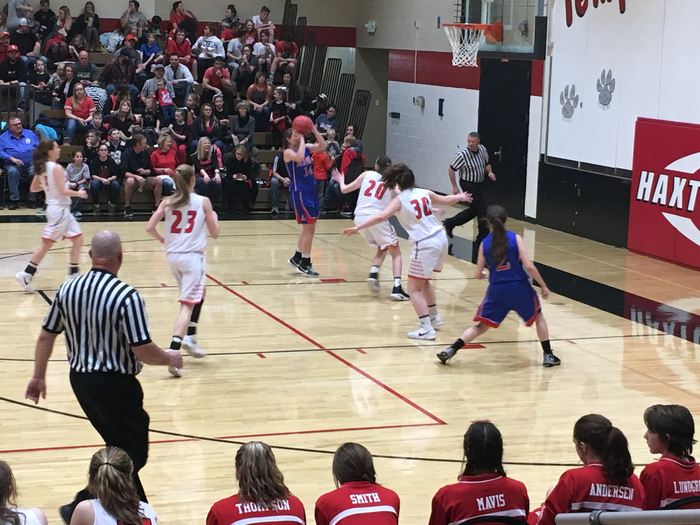 girls teams hosted Merino and Wiggins on Monday night. 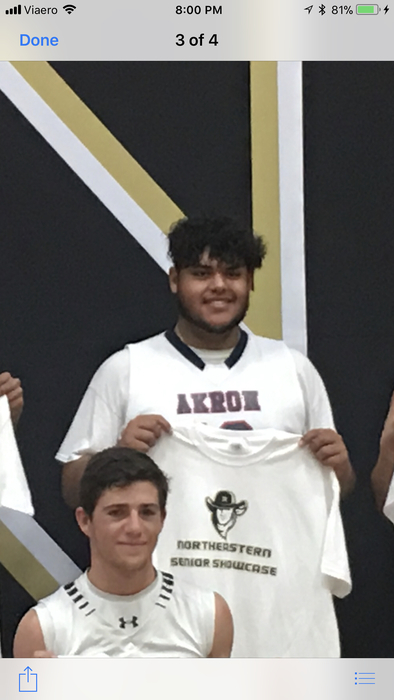 The A squad won both games Akron 29 Merino 16 Akron 25 Wiggins 20 Go Rams! The Akron J.H. 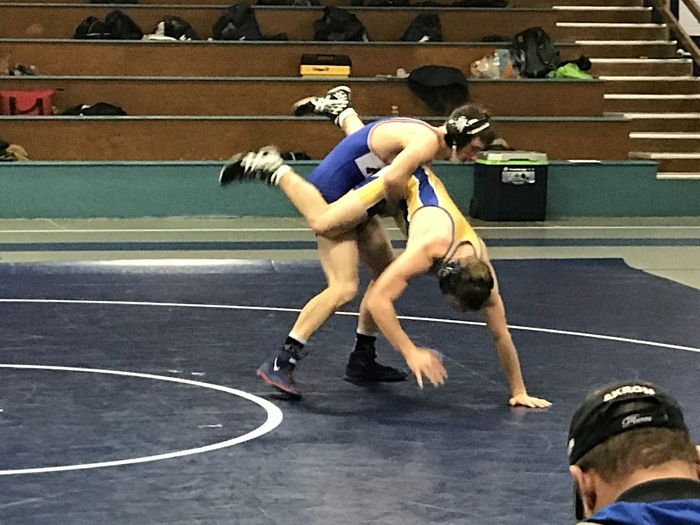 wrestlers competed at Merino on Monday afternoon. THORNTON INVITATIONAL The Akron Ram H.S. 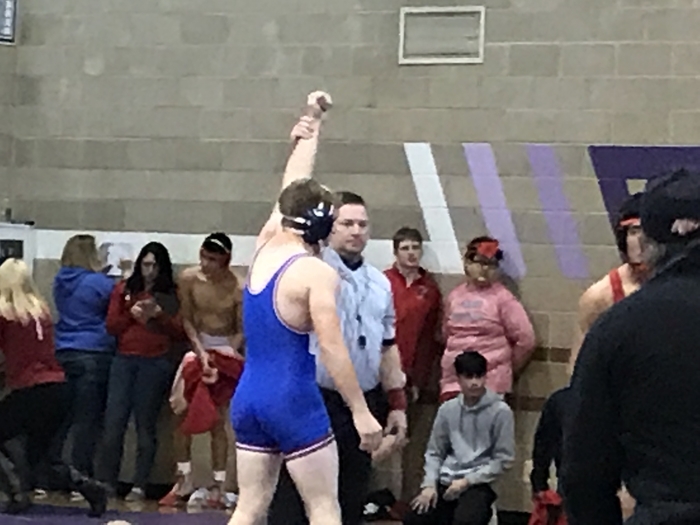 wrestling team traveled to Thornton today with just six wrestlers. 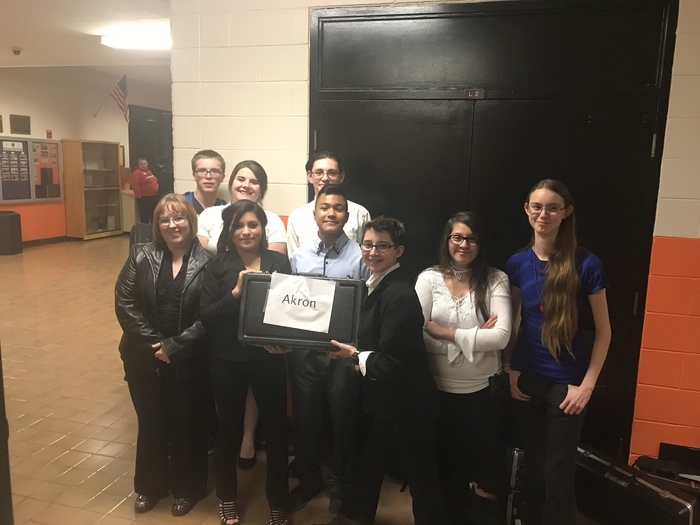 The team performed well scoring 89 points and finishing 6th out of field of 23 teams. 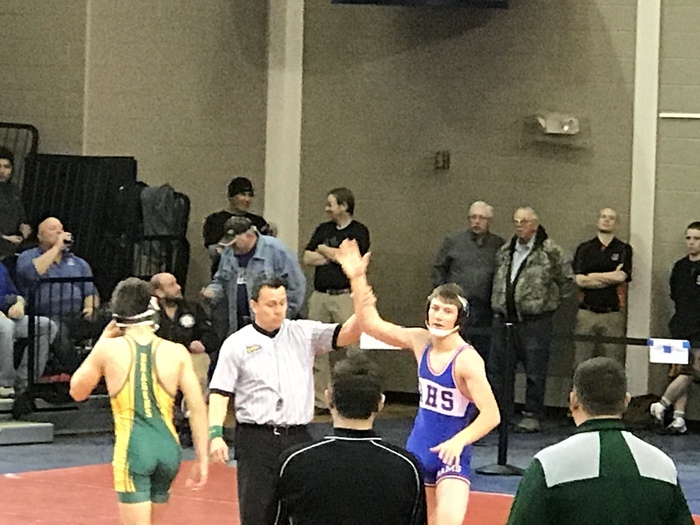 Individual Results: Derrick Poss 1st, Carson Reese 2nd, Seth Dorrenbacher 3rd, Justin Traxler 6th, and Cameron Collins won the consolation side of the bracket. Great job Rams! 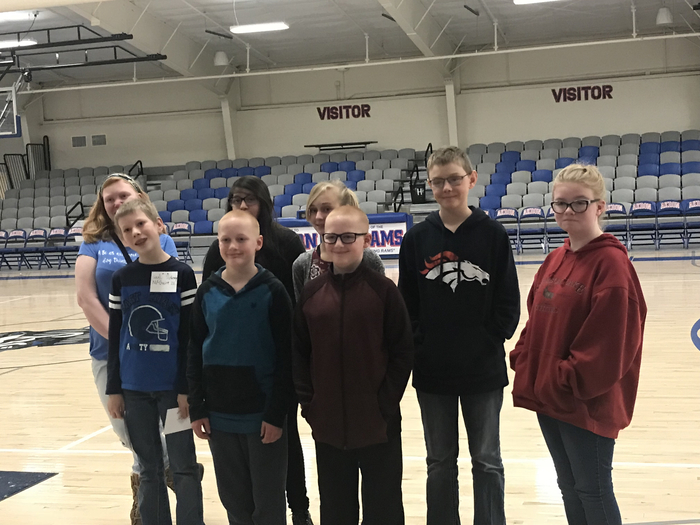 We are proud of our 5th & 6th grade brain bowl team that placed 2nd today at Ft. Morgan. 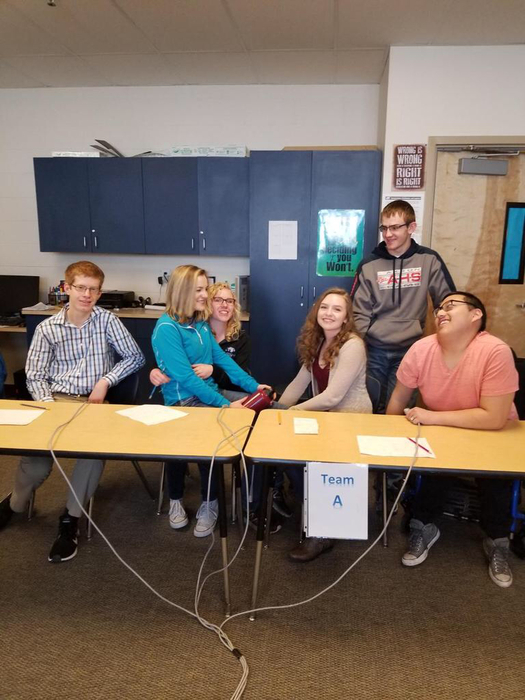 The Akron team lost on a tie breaker question 15-13. Great job Rams! The Akron H.S. 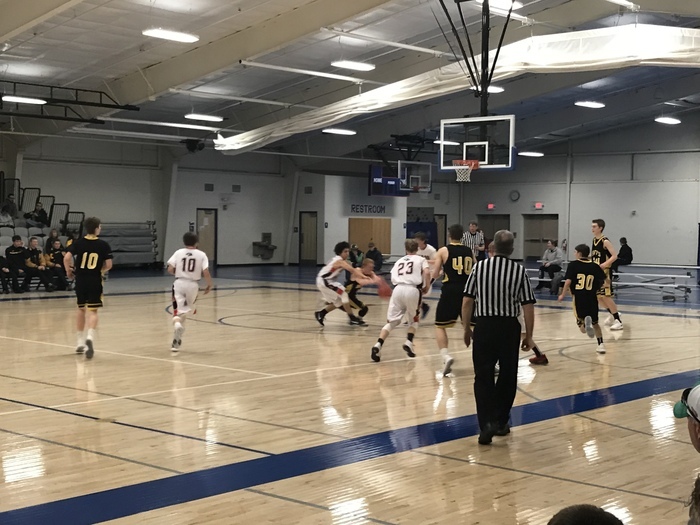 basketball teams traveled to Wiggins Friday night for a league contest. 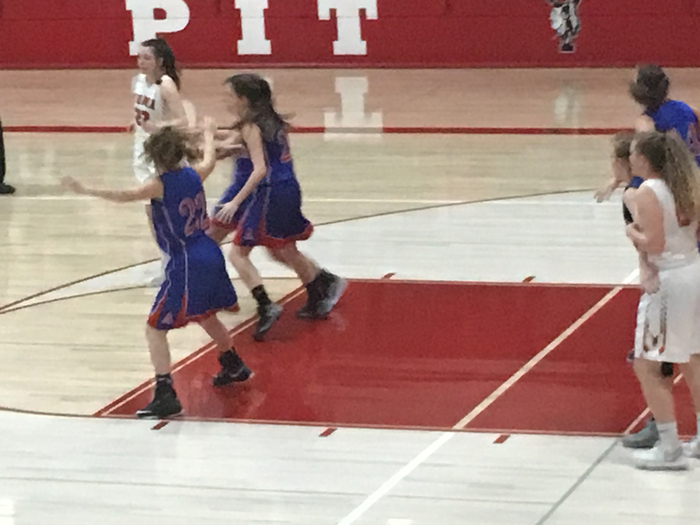 The Akron girls lost a heart breaker in overtime 43-37 and the Akron boys won big 67-40. Good job Rams! 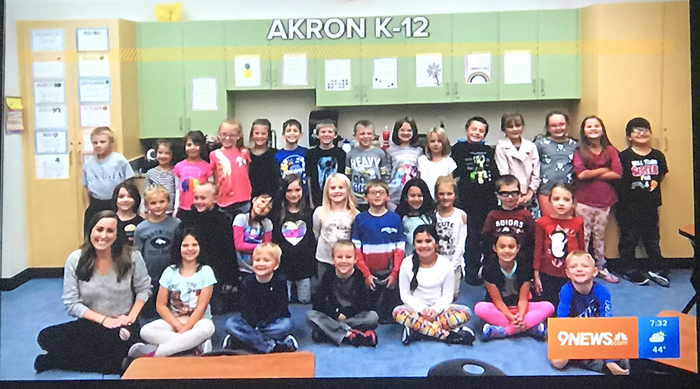 The Akron J.H students led the school in the Akron Ram fight song Thursday morning. Go Rams! 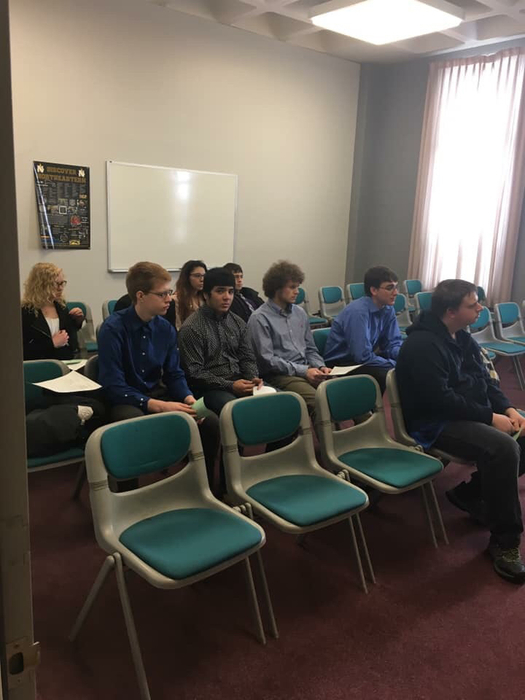 AKRON KNOWLEDGE BOWL COMPETITION Congratulations to our H.S. 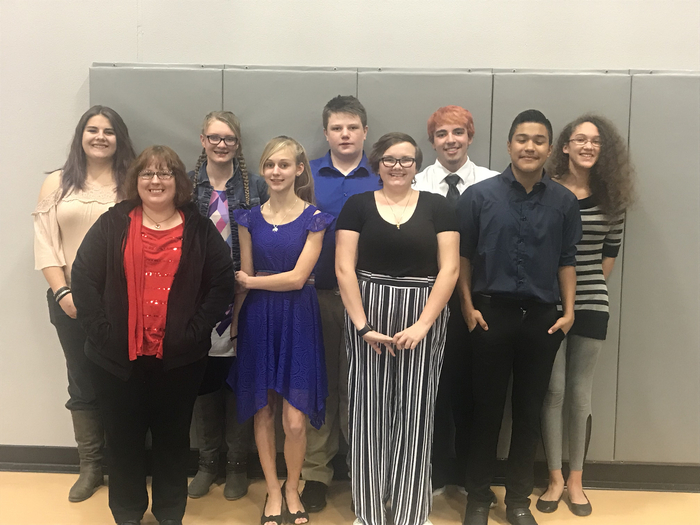 knowledge bowl teams and their their coach Denise Pickens. Our three teams finished 1st, 3rd, and 14th out of 18 teams. We also had two J.H. teams that finished 8th and 20th out of 23 teams. 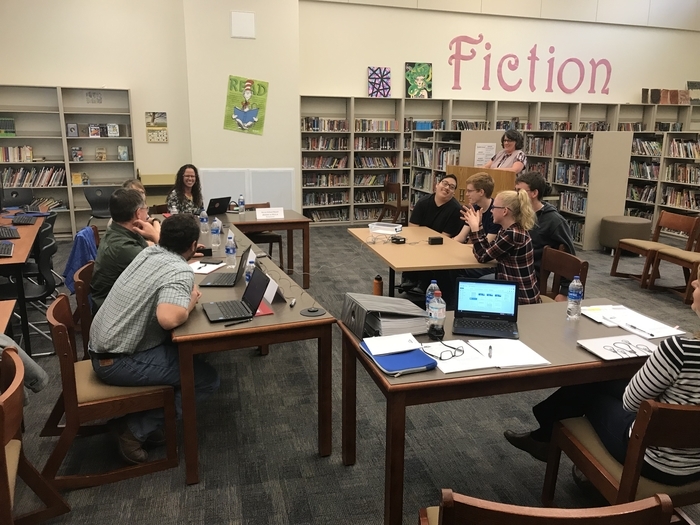 A big thank you goes to Akron school staff and volunteers that helped make the knowledge bowl competition a success today. 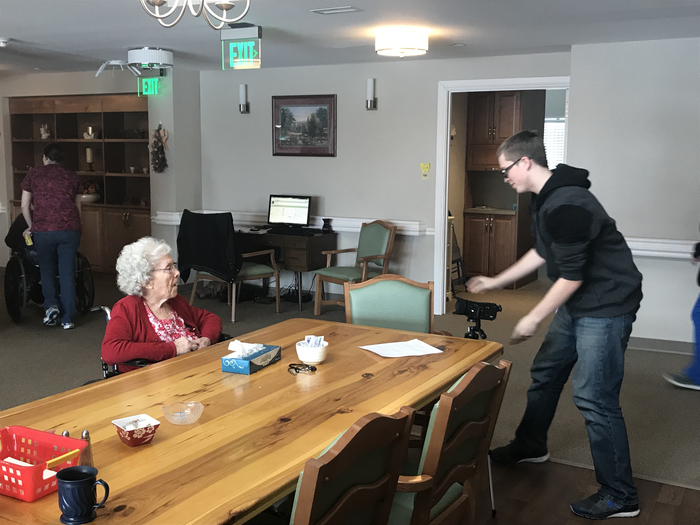 Akron students from Mr. Samber’s sophomore U.S. History class visited the Akron nursing home Wednesday to interview and learn from their elders. Great project! The Akron Ram H.S. 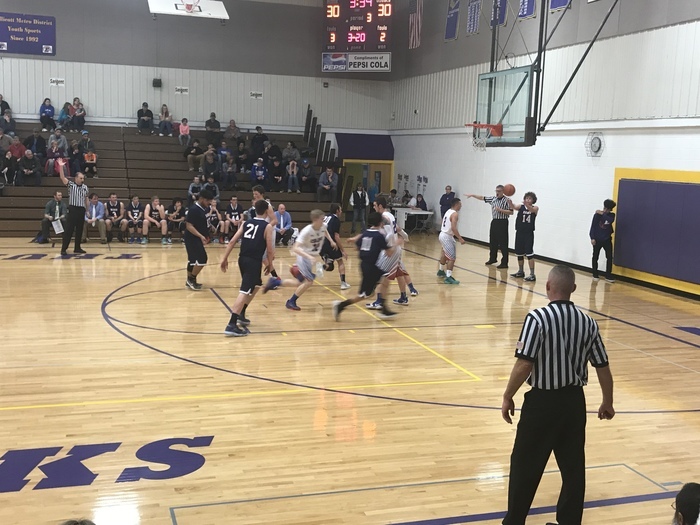 basketball teams hosted the Haxtun Bulldogs Tuesday night. 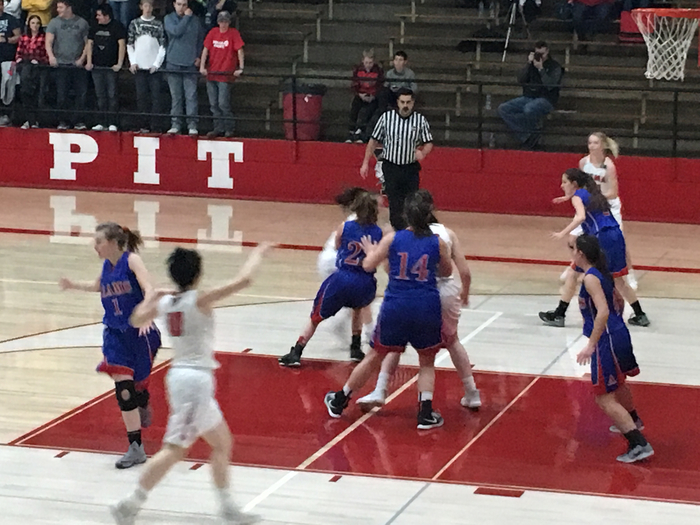 Haxtun won the girls game 62-45 and Akron won the boys game 49-47. Go Rams! 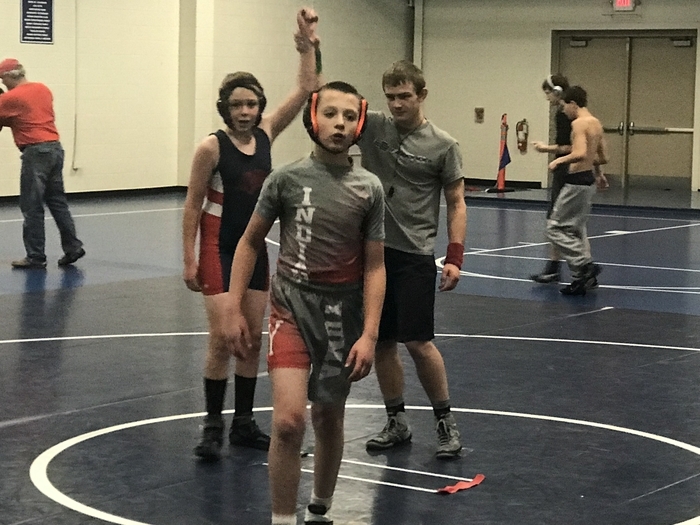 Akron J.H wrestlers were in action at the Sterling Bash on Tuesday. The Akron Ram J.H. 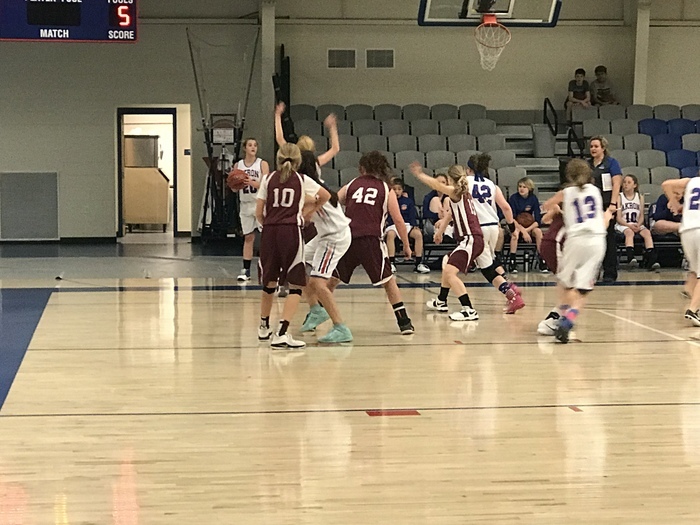 girls’ basketball teams played Caliche on Monday. The Rams won the ‘A’ game 34-12 and lost the ‘B’ game 23-11. Good job Rams! 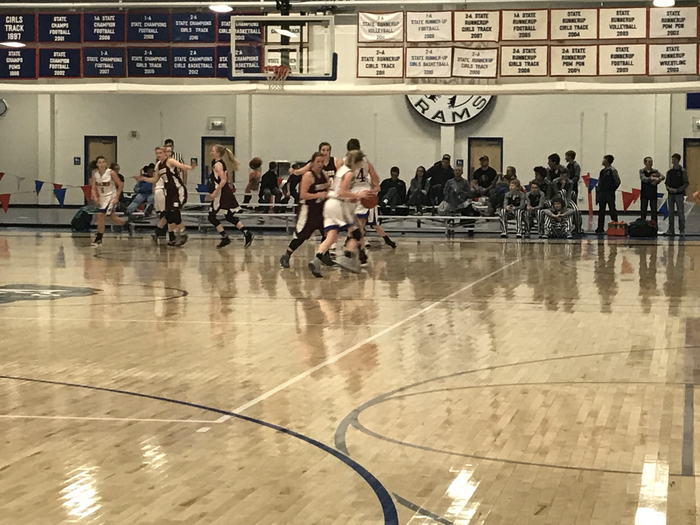 The Akron Rams took on the Liberty Common Eagles Saturday night. 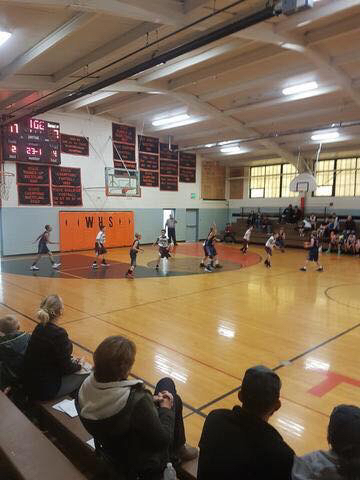 The girls put up a great fight but came up a little short losing 32-37. 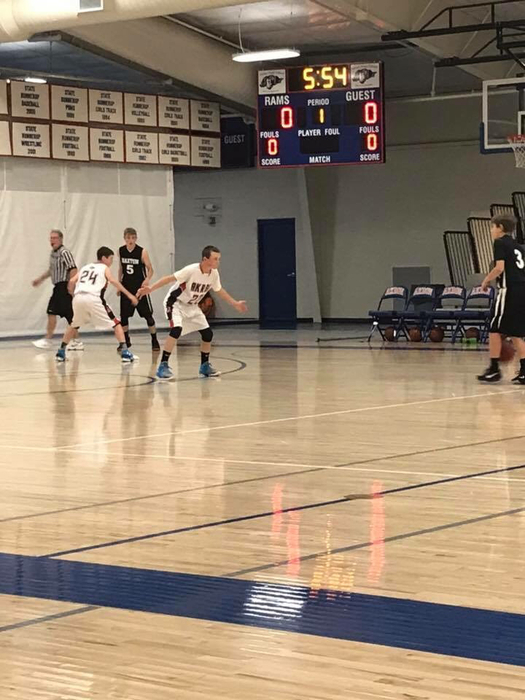 The boys finished with a win, 55-37. Keep working hard, Rams. 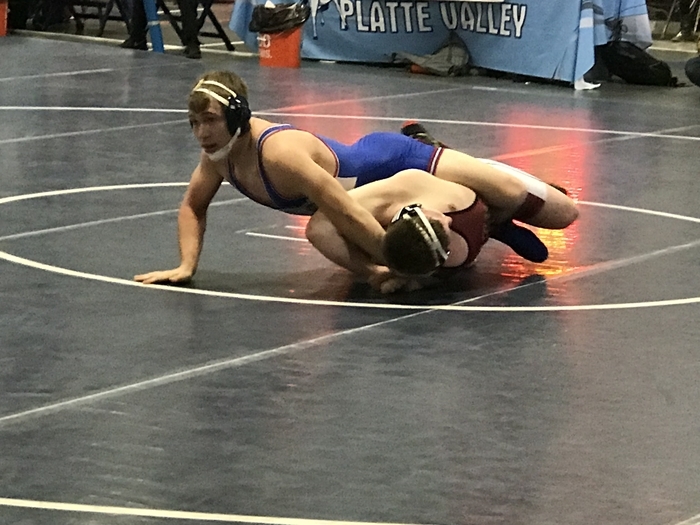 The Akron Ram wrestling team competed in the Platte Valley Team Tournament at Kersey today. The Rams had just six wrestlers competing today. 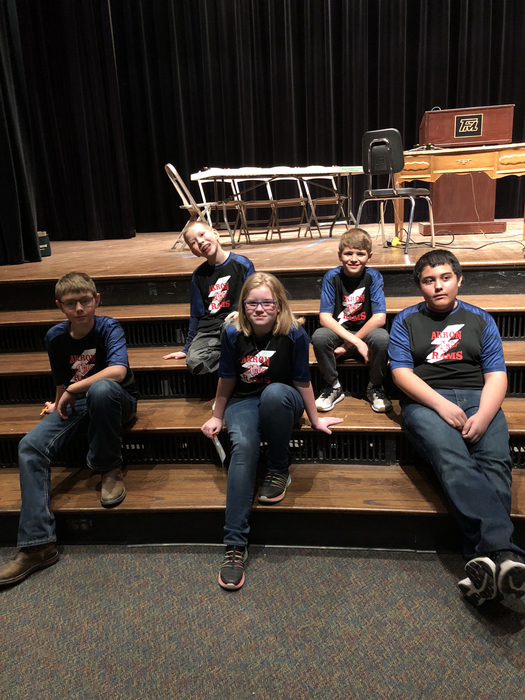 Five of the six finished with a winning record and three of those were undefeated on the day. Nice job Rams! 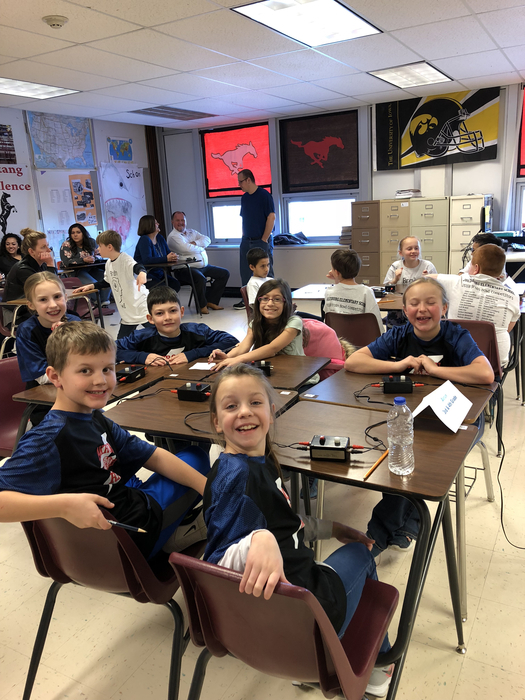 AKRON 6TH GRADE KNOWLEDGE BOWL TEAM QUALIFIES FOR STATE The Akron 6th grade knowledge bowl team composed of Zaya Wells, Caleb Poss, Merek Charney, Carl McGuire, and Haylee Roseberry traveled to Stanley Lake H.S. 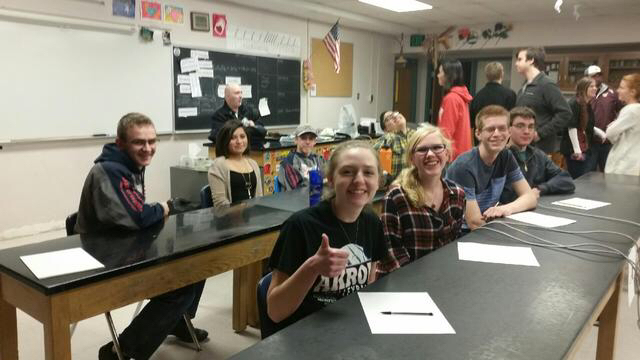 in Denver today with their coach Paula McGuire for a regional knowledge bowl competition. The team competed this morning and qualified for the final eight, which moved them into the afternoon competition. 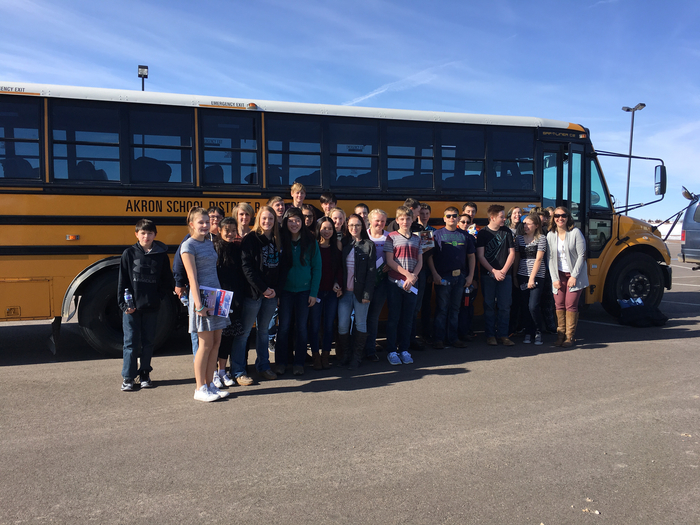 The team then placed 6th which qualifies them for the state competition on February 23rd. Go Rams!!! 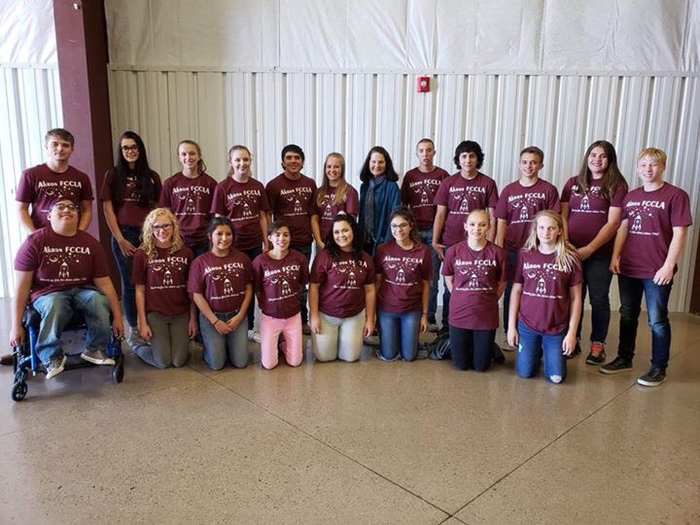 8th Grade Career Fair Our 8th grade students traveled to Holyoke yesterday to take part in a career fair event. 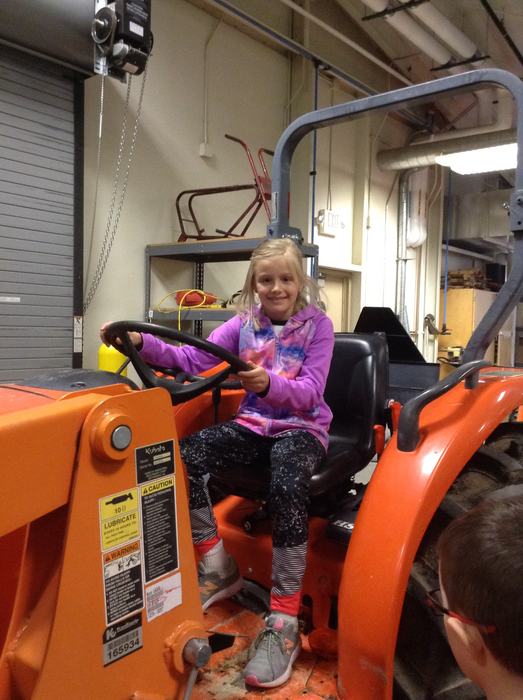 The students had a great time exploring different careers. The Akron J.H. girls basketball team played well on Monday against Yuma. The Rams lost a hard fought battle 24-26. 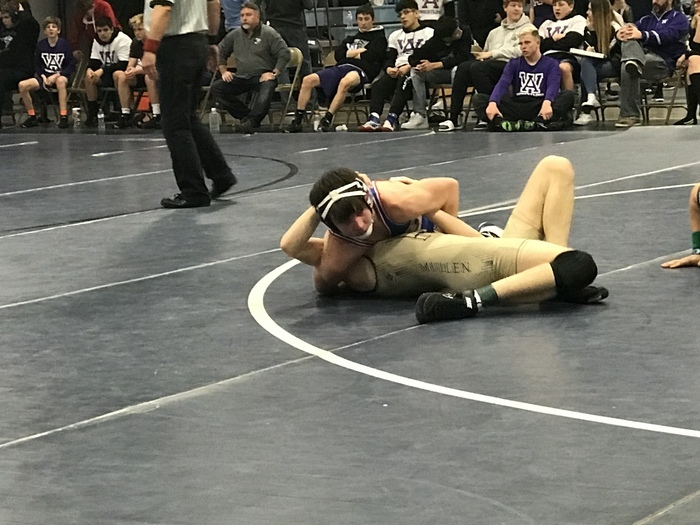 The Akron Ram wrestlers had another solid performance Saturday competing at the Wiggins Tournament. The team finished with 95.5 points. Individual results: Laden Sampson 2nd, Seth Dorrenbacher 1st, Justin Traxler 1st, Derrick Poss 2nd, and Carson Reese 1st. Good job Rams! 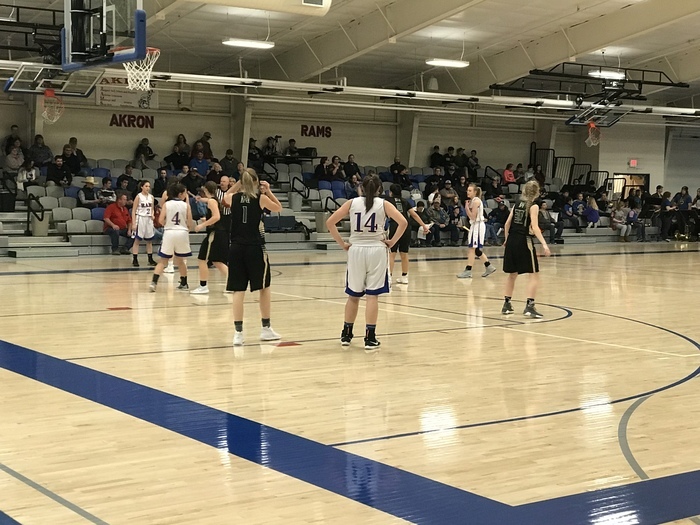 Battle of the Rams On Friday, the Akron Ram girls lost to the Merino Rams 31-56. 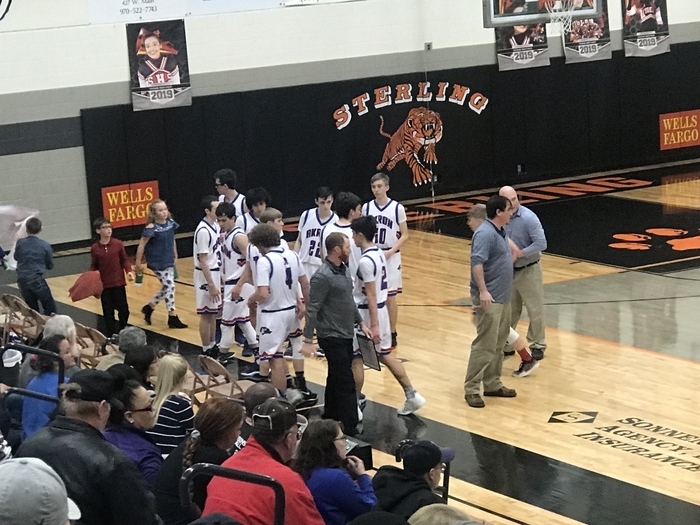 In the boys game Akron defeated the Merino Rams 48-45. Go Blue! 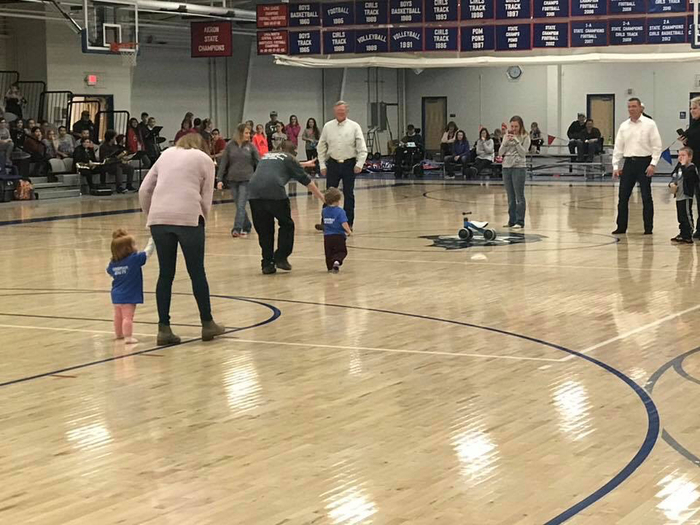 Pictures from the Toddler Trot and Diaper Dash sponsored by Goodman Realty at the High School basketball games Friday night. The J.H. 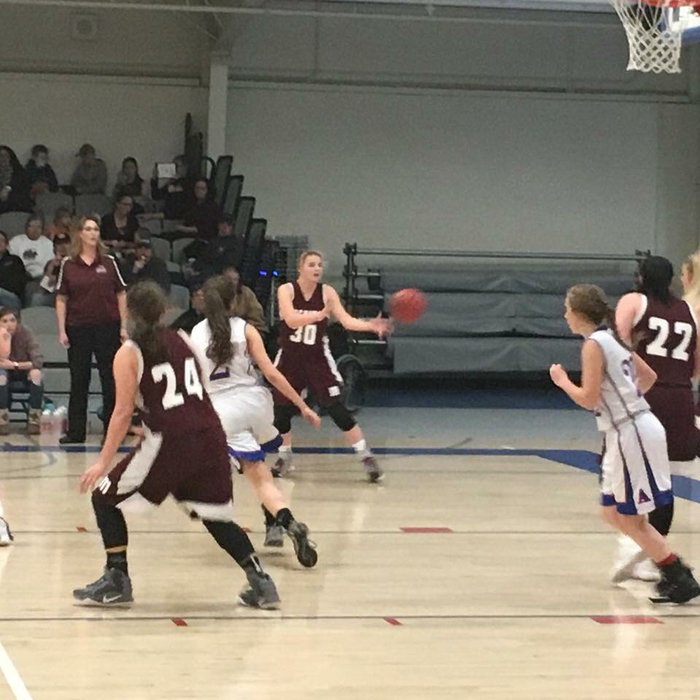 girls basketball teams played tough against Wiggins last night at home but came up short. 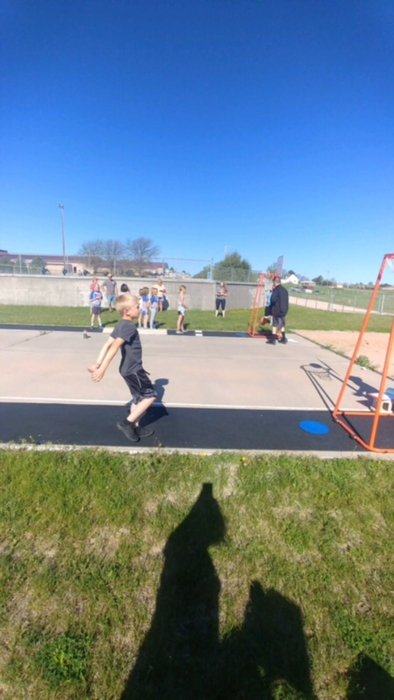 The B team lost 6-32 and the A team lost 14-22. Keep working to improve girls! 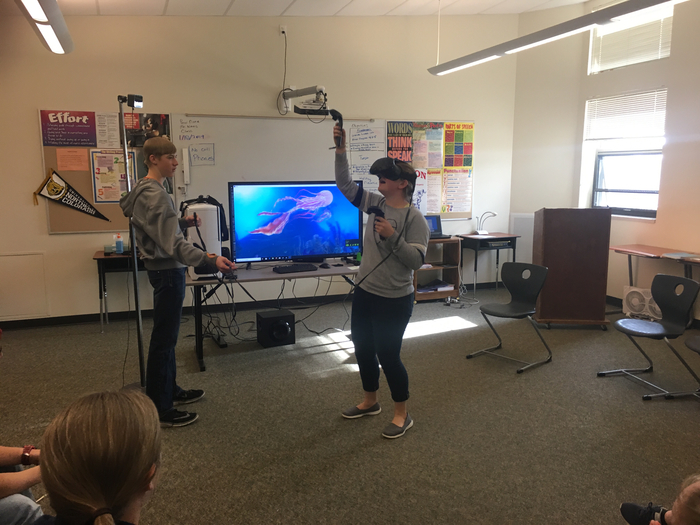 Virtual Reality Week We want to give a big thank you to Mike Sullivan of Sedgwick County Economic Development and Akron Teacher Mrs. Katie Thompson for working to provide this virtual reality opportunity at our school. 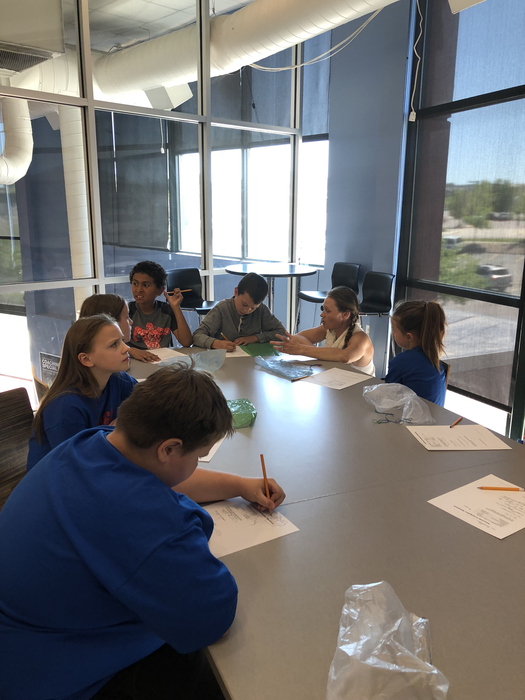 Our students have been able to experience a number programs having to do with art, history, and science. Akron District Spelling Bee The annual school spelling bee was held this morning in the field house. 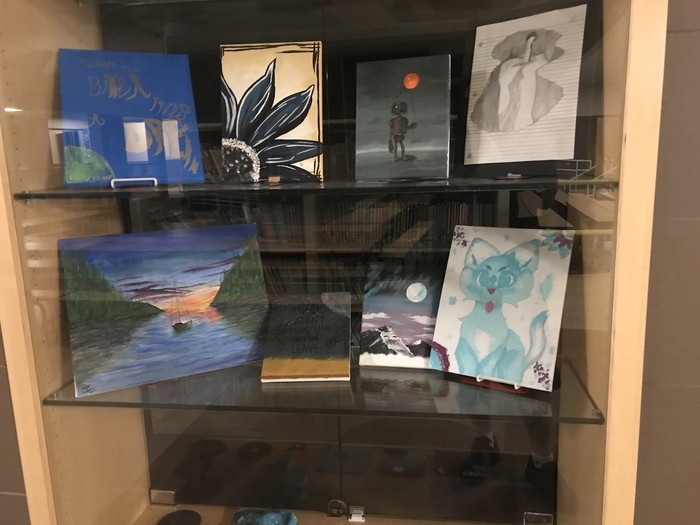 The district winner was Carl McGuire and runner-up was Vashti Winter. 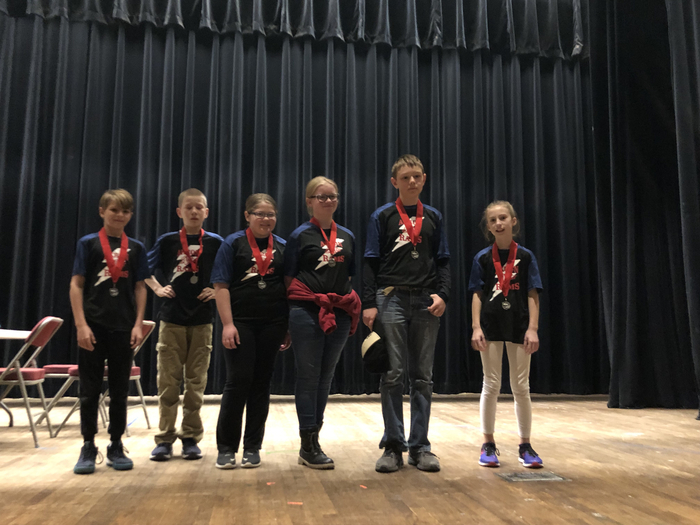 Eight finalists will be moving on to Regionals next month in Brush. 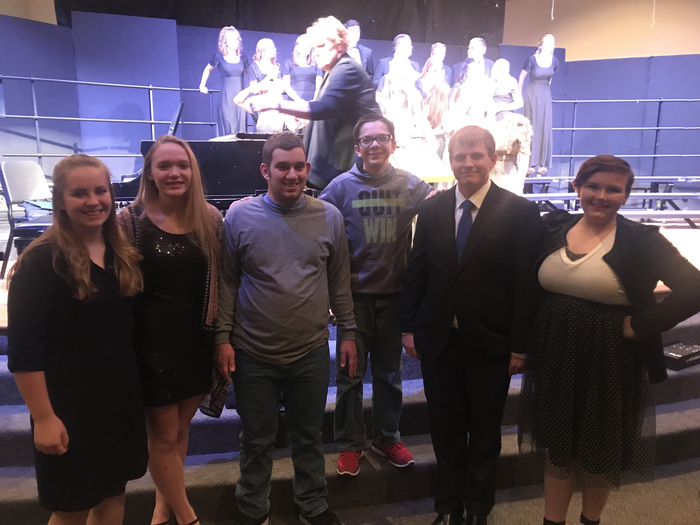 Finalists pictured below: front row (L to R) Carl McGuire, Mason Groth, and Liam Groth; back row (L to R) Syvannah McGuire, Bibiana Rocha, Vashti Winter, Caleb Poss, and Haylee Roseberry. 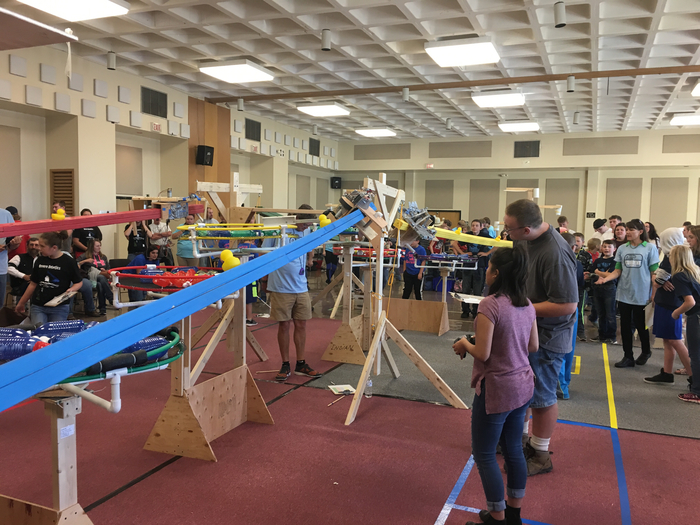 Congratulations to everyone who participated and best wishes to those advancing to regionals. 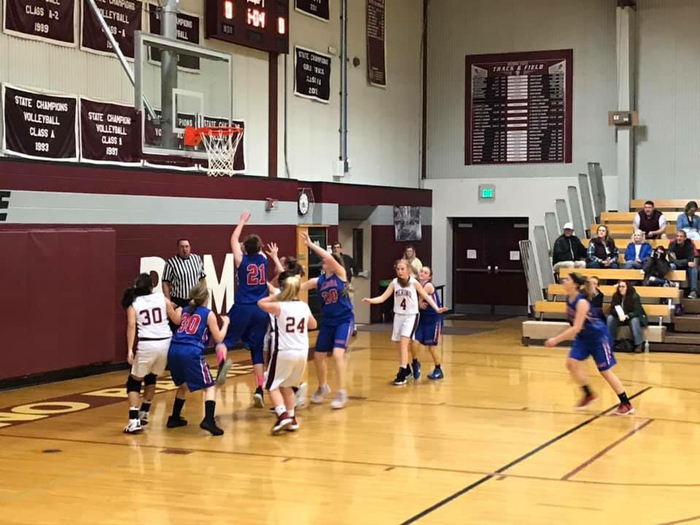 The Akron JH girls basketball teams played at Merino last night. The B squad lost and the A squad won 34-18. Go Rams! 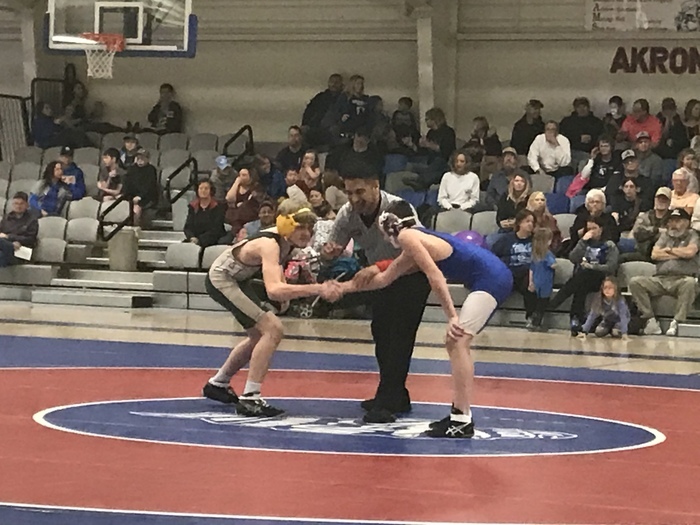 The Akron JH and HS wrestling teams hosted the Burlington Cougars last night. 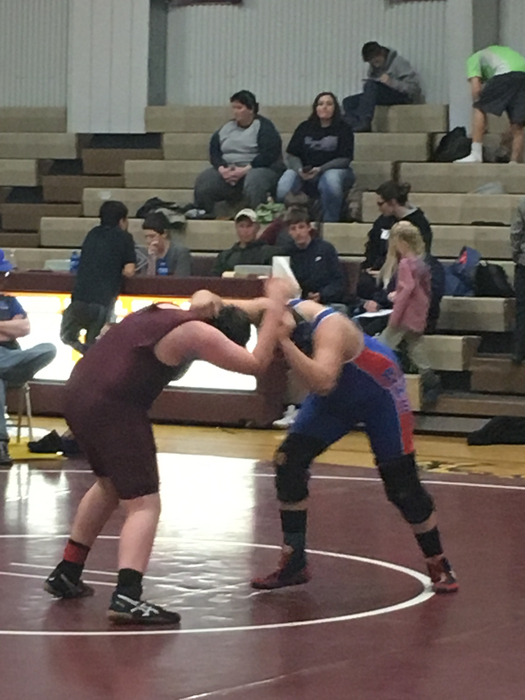 The JH wrestlers were matched up as close as possible in weight with their opponents and no team score was kept. The Akron HS team won the dual against Burlington 30-15. Good job Rams! 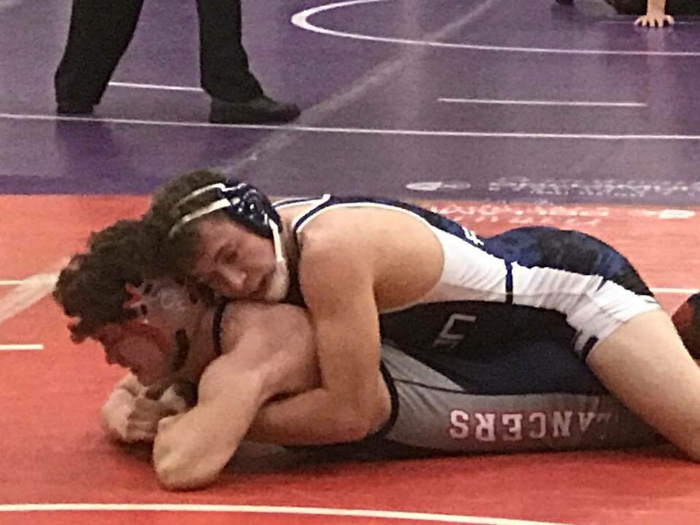 The Akron Ram wrestling team had a solid day at the Pirate Invite in Englewood. The Rams finished 2nd as a team with 114.5 points. Individual Placers: Seth Dorrenbacher 1st, Justin Traxler 2nd, Gavin Brown 2nd, Derrick Poss 3rd, and Carson Reese 4th. 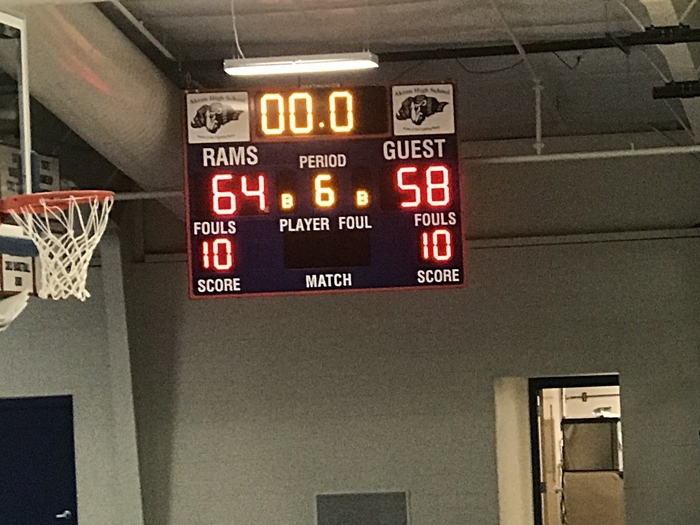 Also scoring points for the Rams were Laden Sampson, Cameron Collins, and Xavier Livesay. Good job Rams! 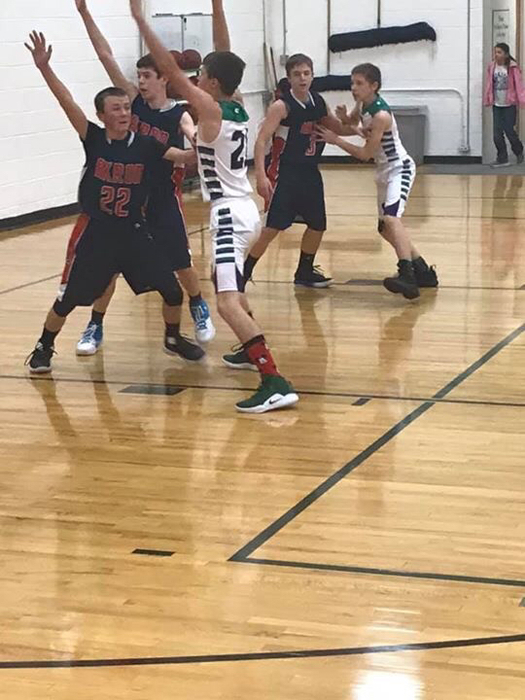 The Akron Ram basketball teams played well last night and picked up a couple wins at Caliche. The girls won 43-10 and the boys won 78-45. Great job Rams! The Akron H.S. 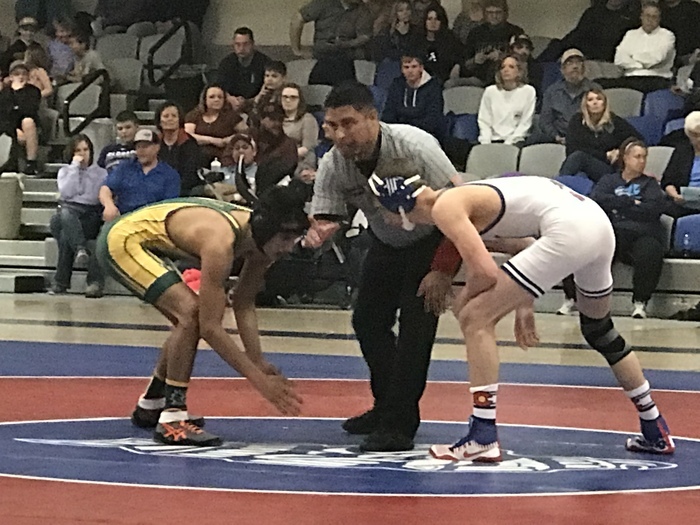 wrestling team defeated the Yuma Indians Thursday night by tie-breaker in a 34-34 dual match. The Rams won 6 of 8 matches but gave up 24 points on forfeits at empty weight classes making the dual close. The Rams also won 4 of 5 JV matches. Nice job Rams! The Akron J.H. 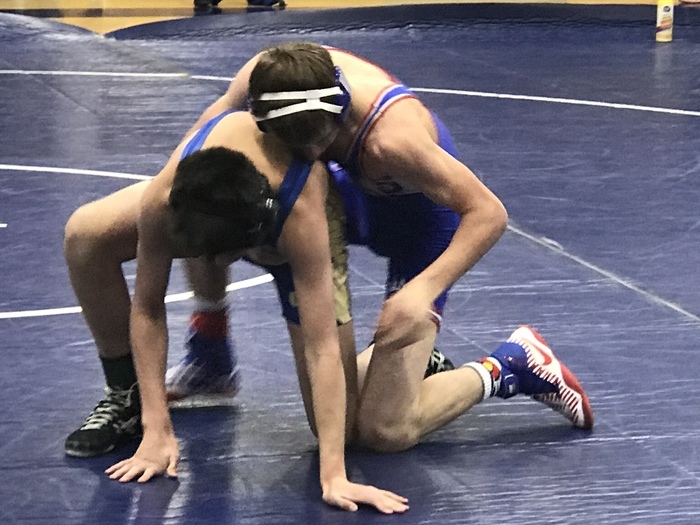 wrestlers had a good first night of wrestling at Yuma on Thursday night. Rams 41 Indians 24. Go Rams! 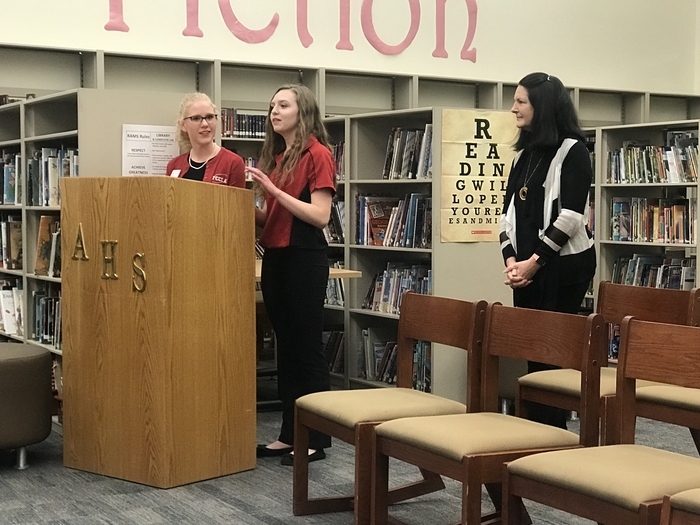 The Akron School Board was treated to a presentation Tuesday night at the regular board meeting by members of the Akron FCCLA chapter. 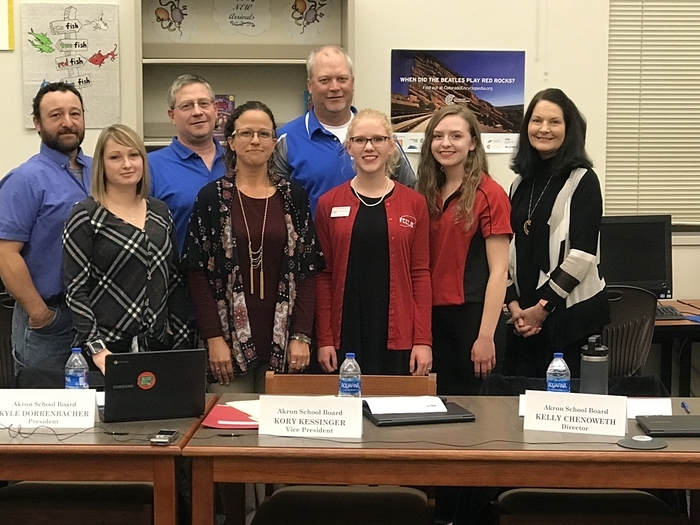 FCCLA advisor Mrs. Peggy Hall joined two of her officers, Cheyenne McGuire and Tayler Clarkson, as they presented their program activities to the board. 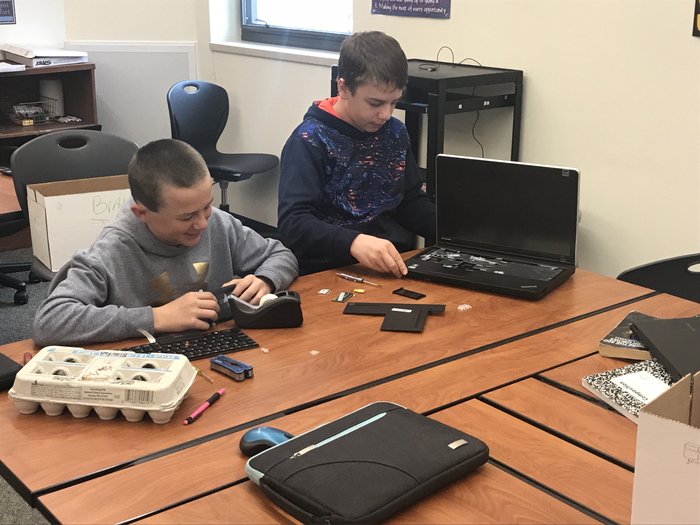 STUDENT CENTERED ACCOUNTABILITY PROGRAM This past year, the Akron School District joined S-CAP (Student Centered Accountability Program). 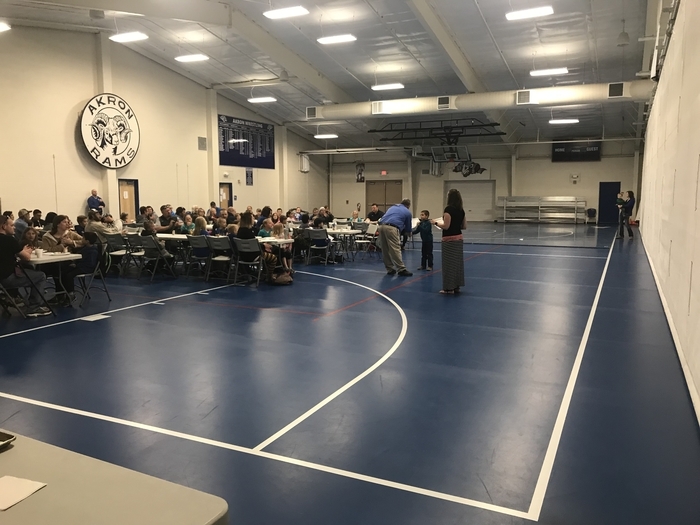 The program is composed of school districts that are working together to identify strengths and weaknesses of their schools, with the ultimate goal of improving each school as a whole. We have been compiling data, conducting surveys, and constructing narratives about our various programs. 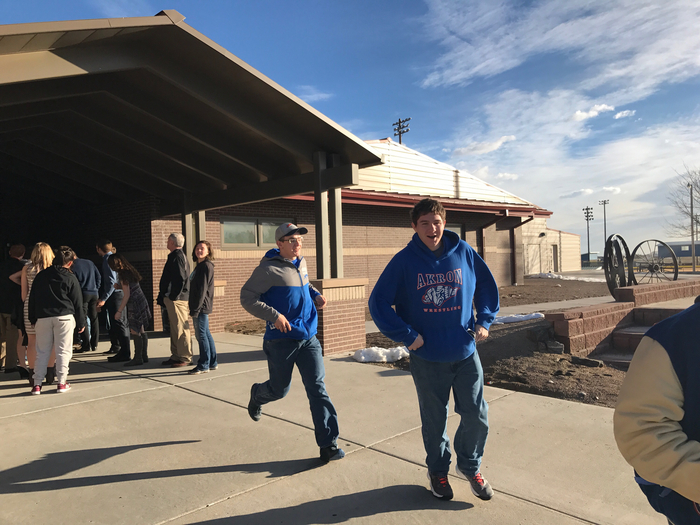 We will also be hosting teachers and administrators from other S-CAP Colorado schools on January 23rd as part of our site review. Parents should have received a survey link via text. If you have not completed the survey please do so as soon as possible. 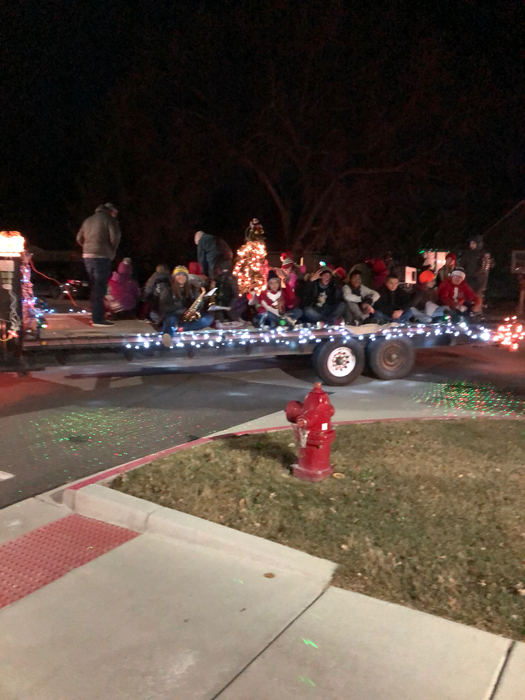 Thank you for your support of our school! 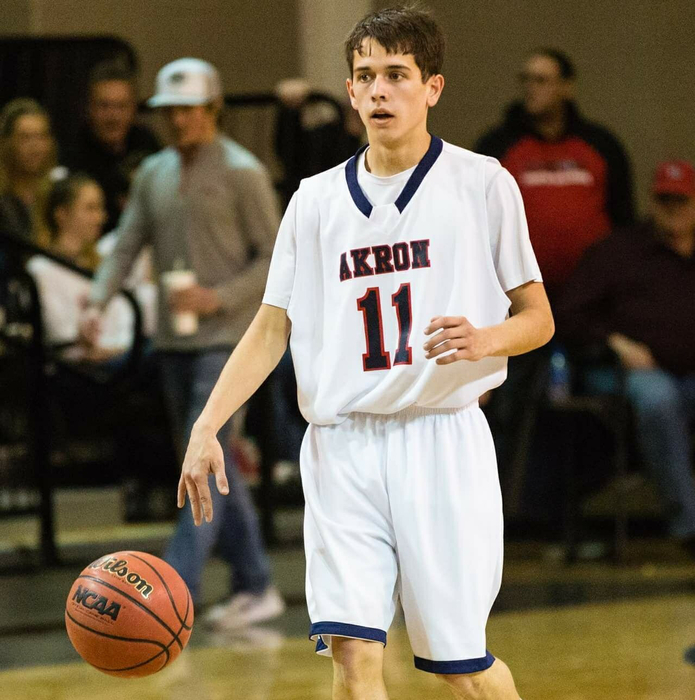 The Akron girl and boys basketball teams picked up wins at home last night against Otis. Good job Rams! 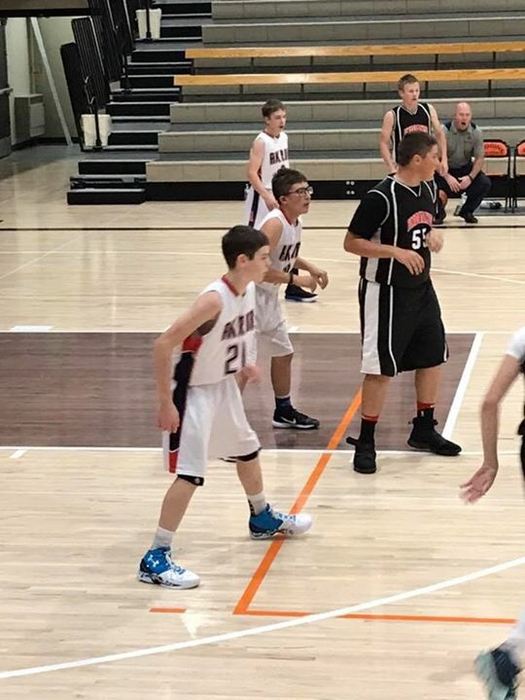 The Akron Ram girl and boys basketball teams lost their contests at Yuma Friday night. 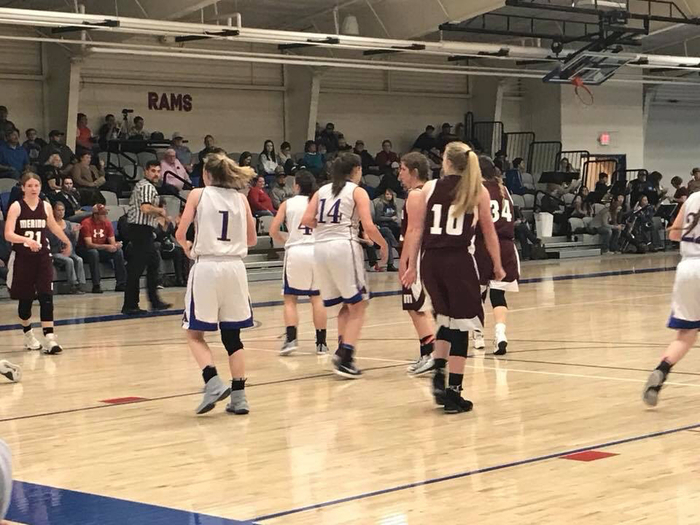 The Rams will be in action again Saturday at home against Otis starting at 4 p.m. Come out tonight and support the Rams! 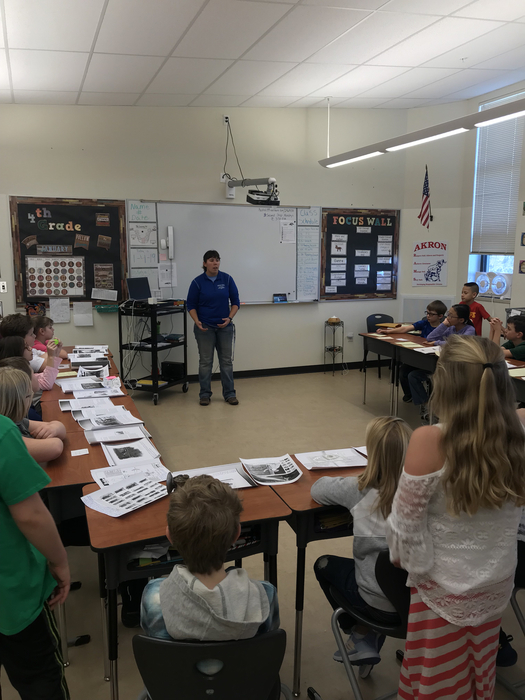 Ms. Hocheder, one of our high school social studies teachers, visited the 4th grade classroom and gave a mini lesson on mining in Colorado. 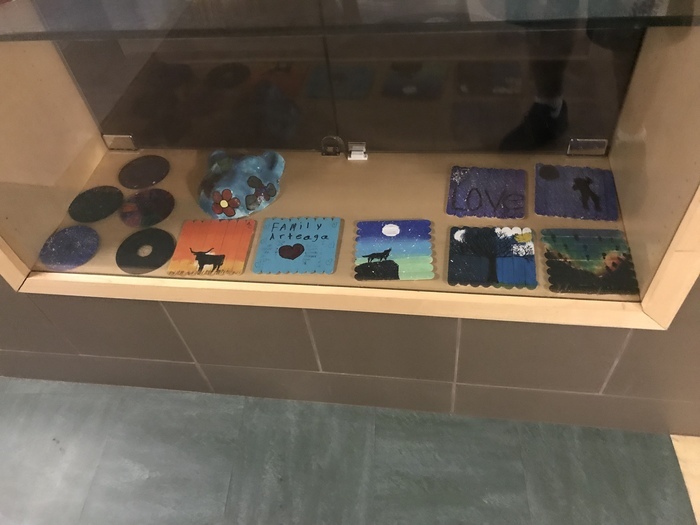 She set up a mini museum for the students to explore. Thank you Ms. H! 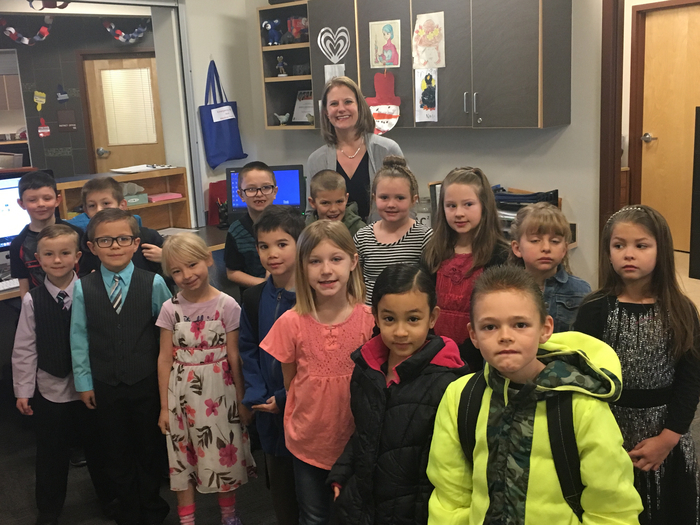 On Friday, Mrs. Bowin’s 1st graders led the school in the pledge and fight song to start the day. Go Rams! 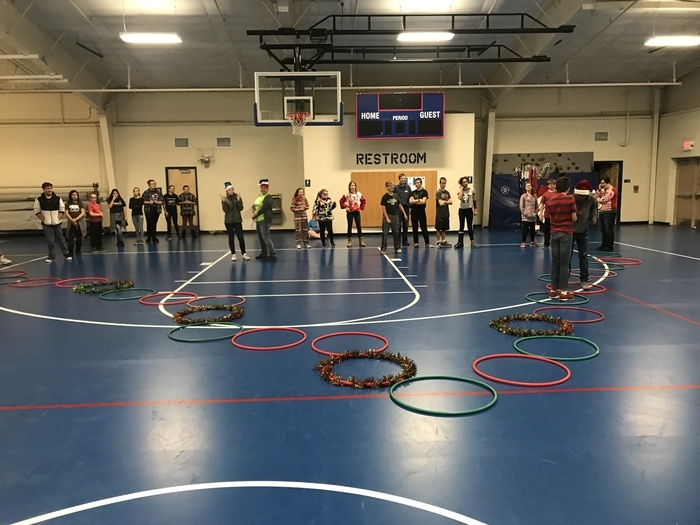 Our Student Wellness Team, with some help from our staff, organized Reindeer Game activities to finish the last day of school before Christmas break. Great job! 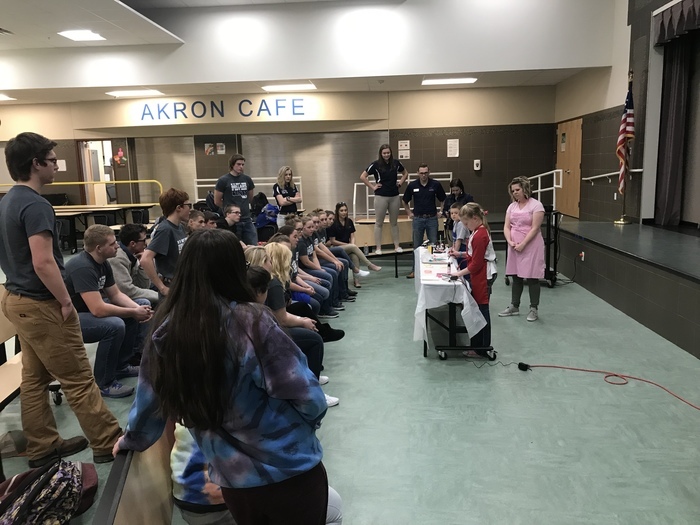 AKRON SCHOOL COMMUNITY PRIDE Prior to Christmas break, our high school staff and students participated in their second community pride project this school year. 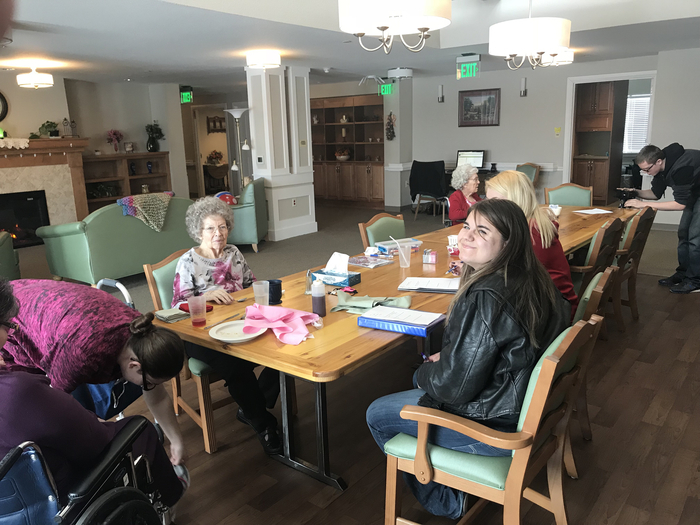 Students read and interacted with children at ABC Preschool and Akron Head Start, delivered meals with the Meals on Wheels program, and put together a soup lunch and bingo for the seniors and elders of our community. 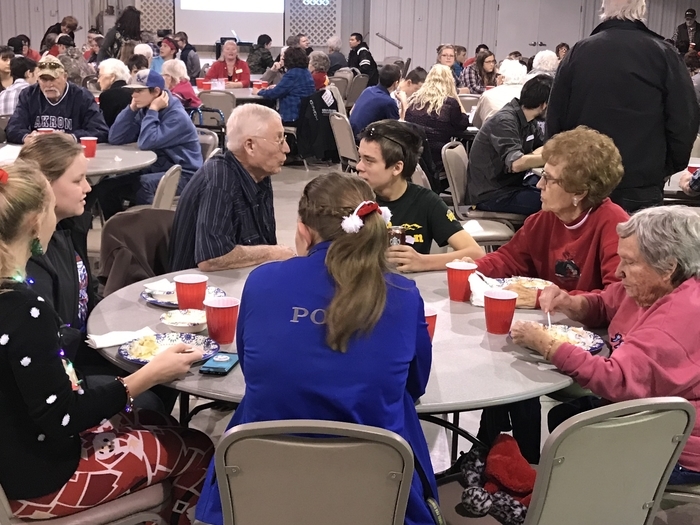 It was great to see our students interacting with the young children and elders of our community. 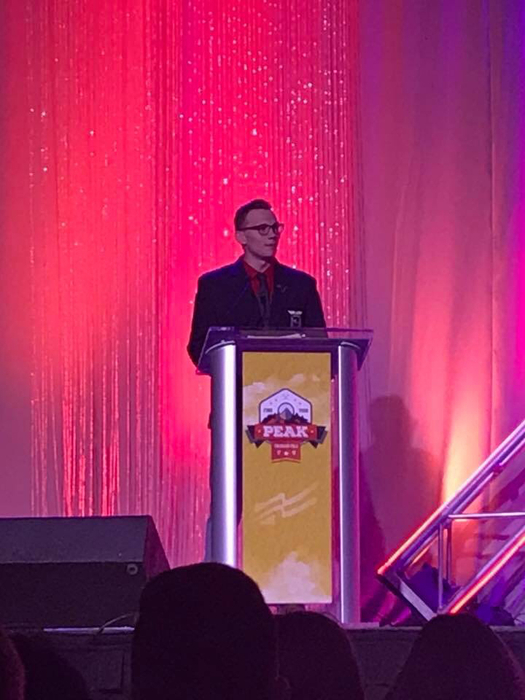 We give a special thank you to our Dean of Students, Mr. Shawn Randel who put a great deal of work and effort into organizing this event. It truly was a wonderful day and we want to send out a big thank you to everyone who helped today! Santa’s traditional visit on the last day of school still exists!!! 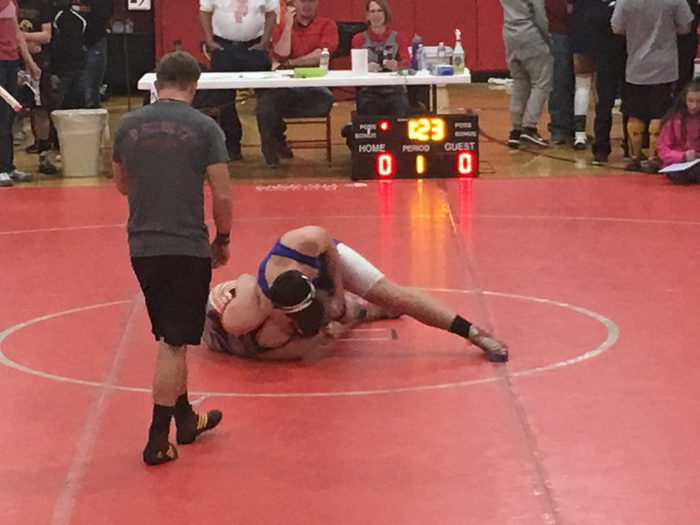 The Akron Ram wrestling team competed in the Bob Smith Invitational in Wray today. Individual results: Justin Traxler 2nd, Derrick Poss 2nd, Laden Sampson 4th, Seth Dorrenbacher 4th, and Carson Reese 4th. 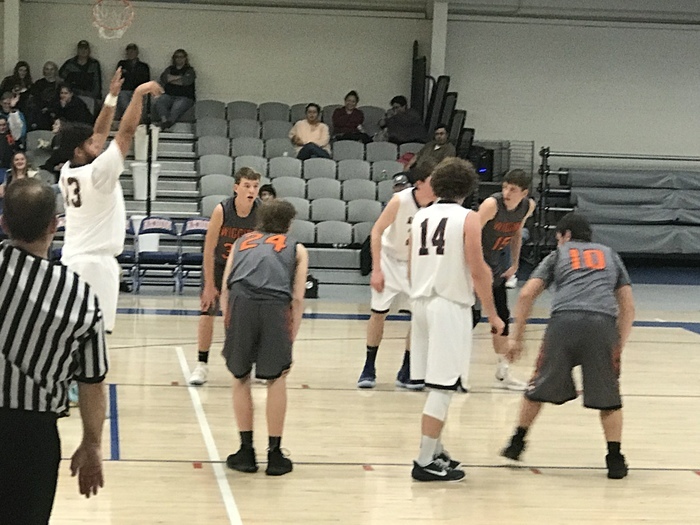 The Akron Ram boys’ basketball team finished 2nd at the Akron Holiday Tournament losing a close contest to Dayspring 52-47. 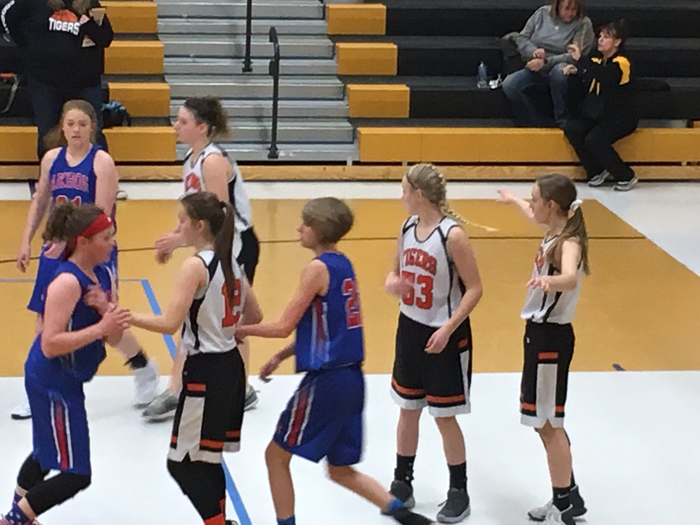 The Akron Lady Rams finished 4th losing in the consolation game to Stratton/Liberty 37-47. Both teams will be in action again on Tuesday at home against Union Colony. Go Rams! AKRON RAM WRESTLING Results from last nights double dual against Merino and Wiggins held at Wiggins H.S. Team results: Akron 36 Merino 18 Akron 34. Wiggins. 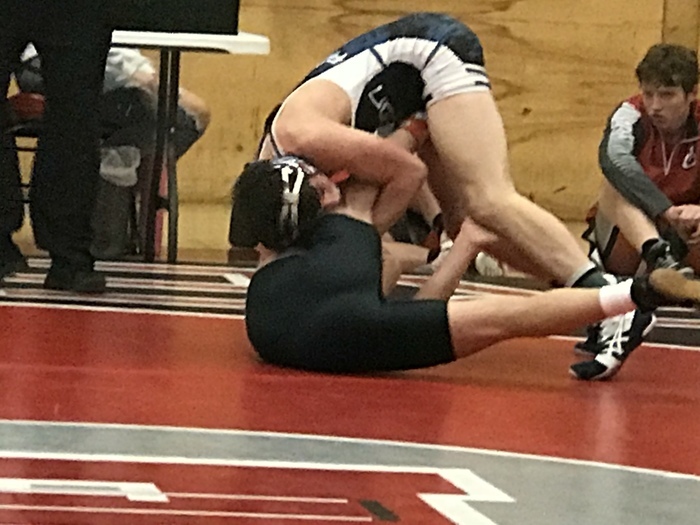 24 Individual Akron Results: Against Merino: Laden Sampson won by forfeit, Cameron Collins won by forfeit, Seth Dorrenbacher pinned Mathew Frank in 1:32, Justin Traxler won by forfeit, Carson Reese lost by pin to Trent Elliott in 1:58, Derrick Poss pinned Joseph Muniz in 3:46, Xavier Livesay won by forfeit. 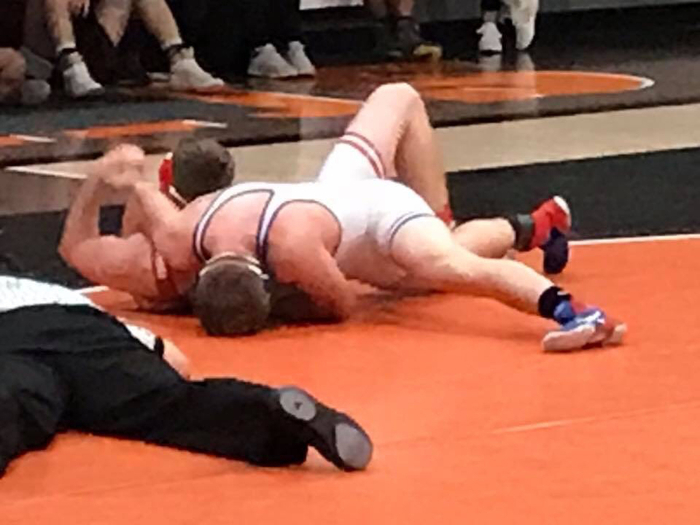 Against Wiggins Laden Sampson pinned Shaelon Barnum in :22, Cameron Collins won by forfeit, Seth Dorrenbacher pinned Alex Hishinuma, Justin Traxler beat Brynden Wilson 8-0, Carson Reese pinned Josh Bates in :39, Derrick Poss pinned Caiden Lee in 2:35, Xavier Livesay was pinned by Devin Harshman in 2:18. 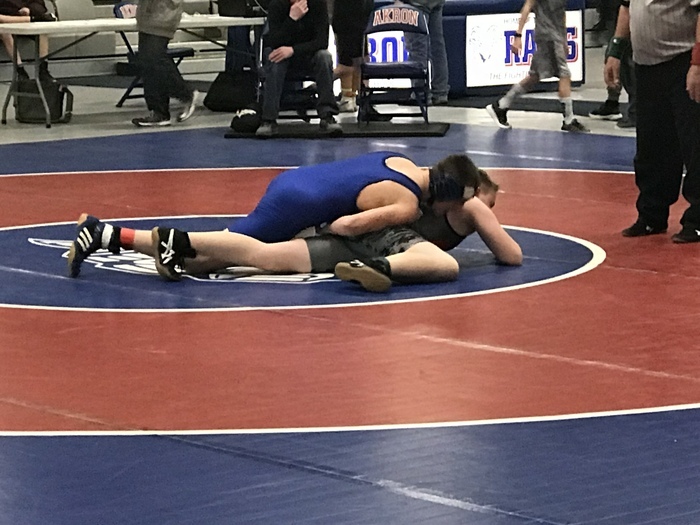 Great job Ram wrestlers! 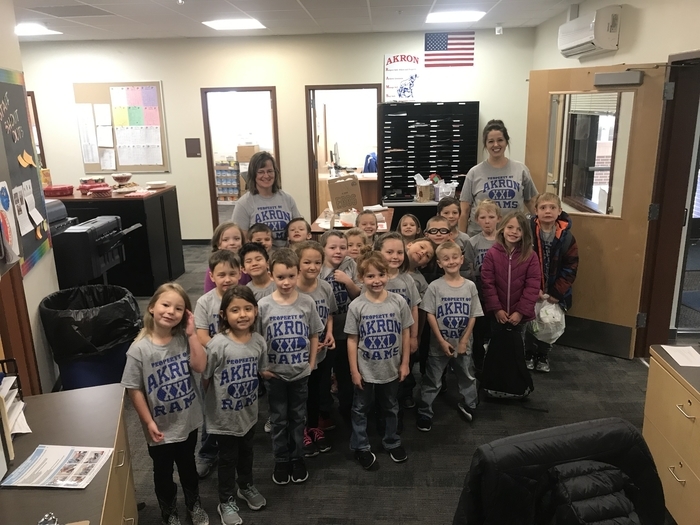 Mrs. Poss and Mrs. Davisson’s kindergarten classes led the school in the Akron Ram Fight Song Thursday morning. Go Blue! Congratulations to the following Akron Ram football players for their selection to the 2018, 8-man all-state teams: Derrick Poss 1st team, Justin Traxler-2nd team, and Jaden Hottinger -Honorable Mention. 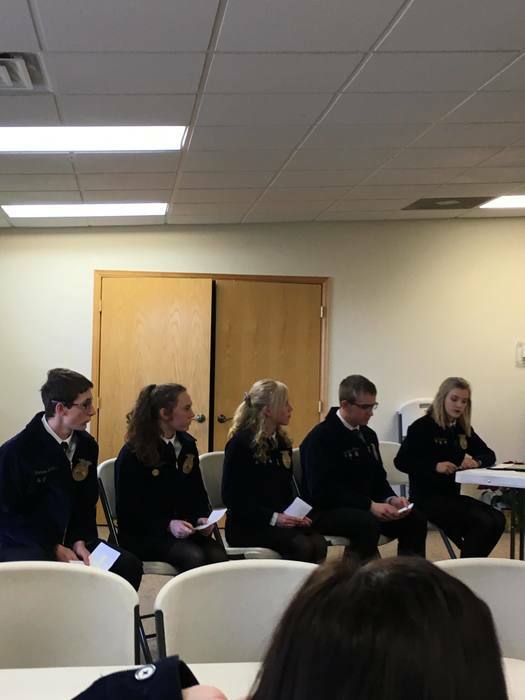 Akron FFA District Speaking results: Creed Speaking - Janessa Shook 2nd , Shay Benish 4th Extemporaneous Speaking - Kacyn Kessinger - Silver, Grayson Pachner - Bronze Prepared Speaking - Mariah DeMers - Silver, Nadalyn Poss - Bronze Nice job Rams! 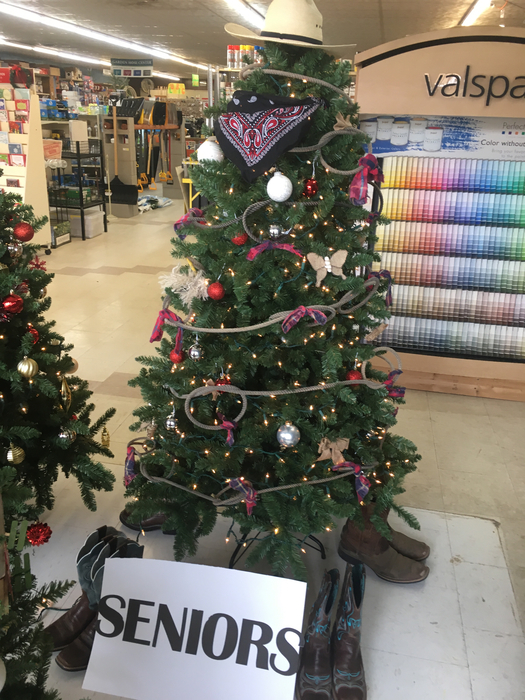 Akron Hardware Tree Decorating Contest Our high school classes did a wonderful job of decorating their trees this year. 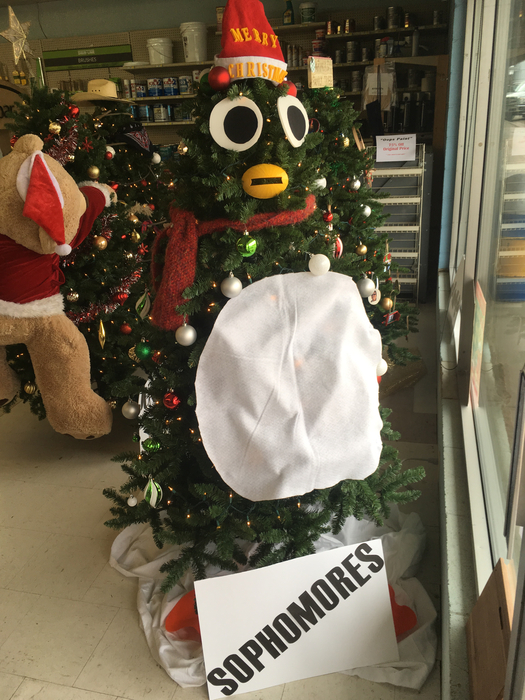 Make sure you stop in at Akron Hardware and vote for the best tree. 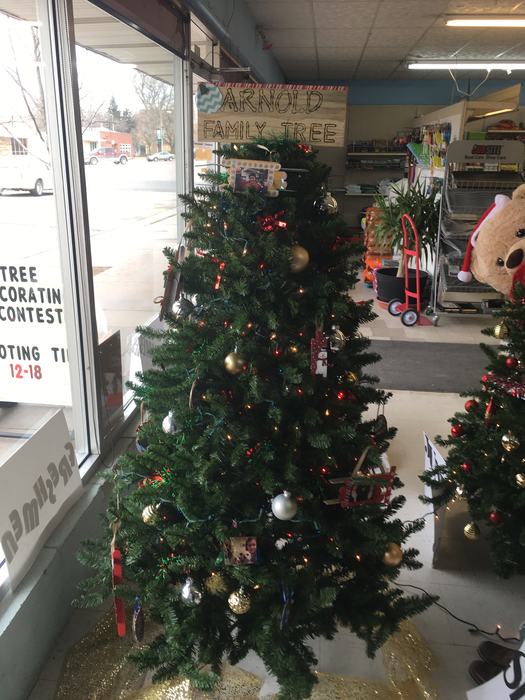 Thank you Akron Hardware for sponsoring this annual event! 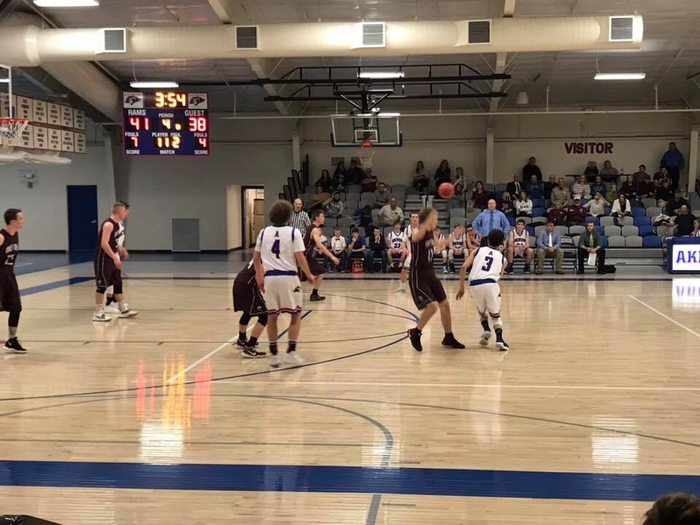 Congratulations to the JH boy’s basketball teams. 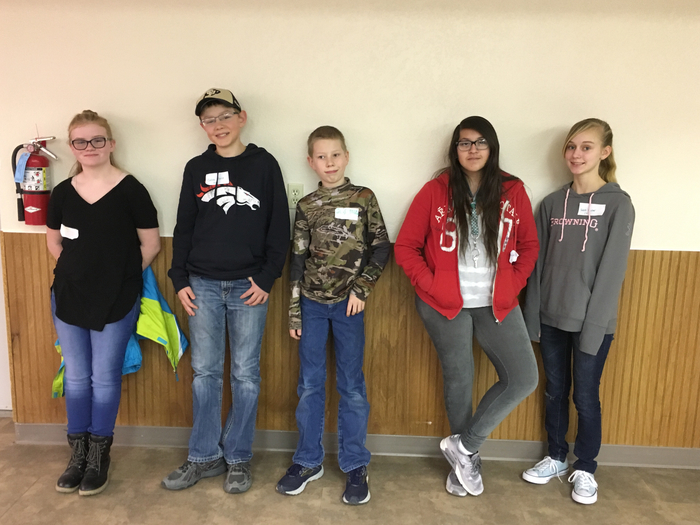 They competed in the league tournament last Saturday, December 8th in Wiggins. 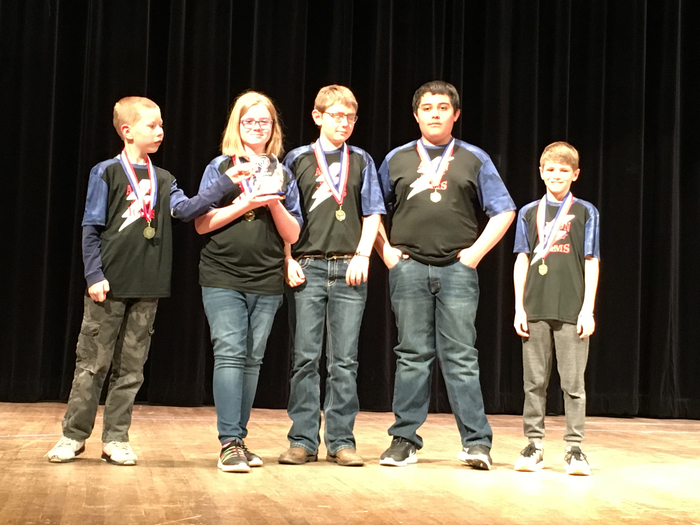 The B team placed 3rd and the A team placed 2nd. Great job boys and congratulations on a successful season! A big thank you to coaches Randel and Clarkson. Go Blue! 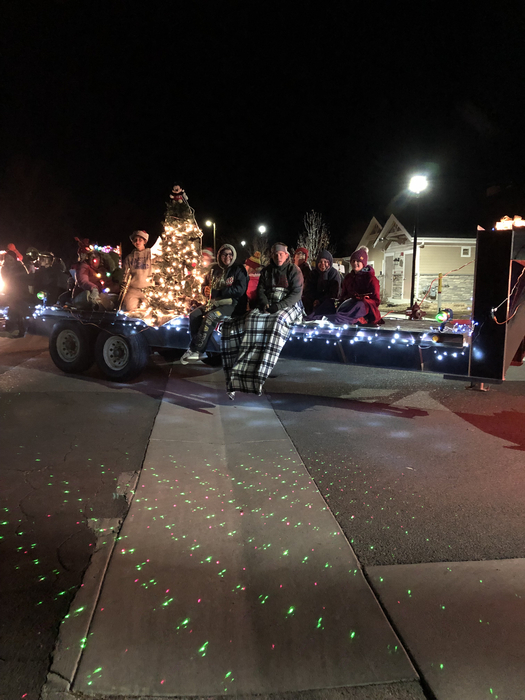 Pictures of our Akron Ram Band at the Parade of Lights on Dec. 6th. 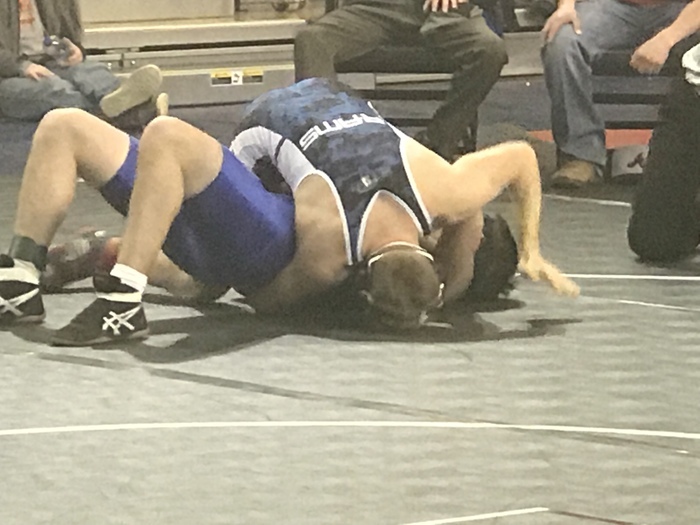 The Akron Ram wrestlers competed against Sedgwick County and Merino on Dec. 6th in a double-dual at Merino. 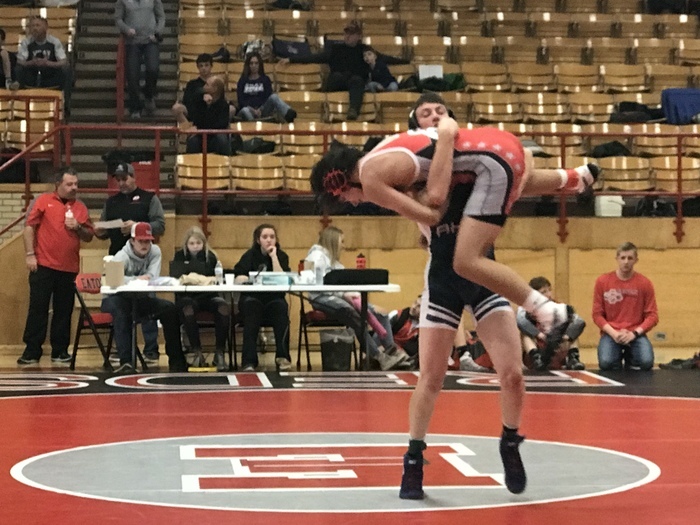 Results: Akron 24 Sedgwick 39 Akron 24 Merino 11 Go Rams! 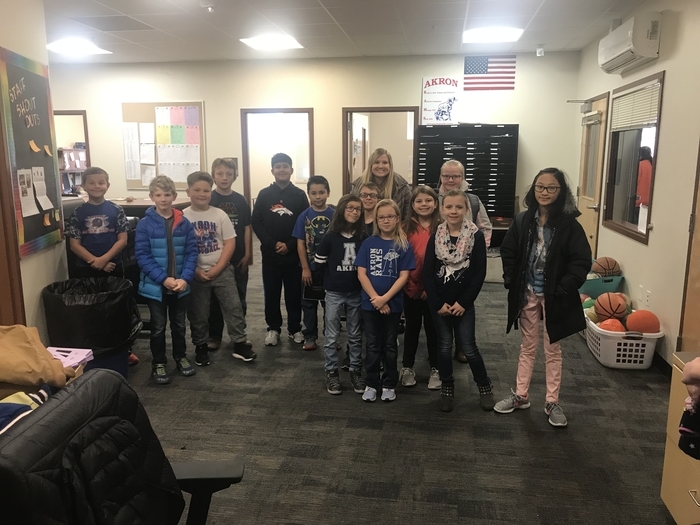 Ms. Kuntz and her 4th grade students led the school in singing the fight song this morning. Go Rams! 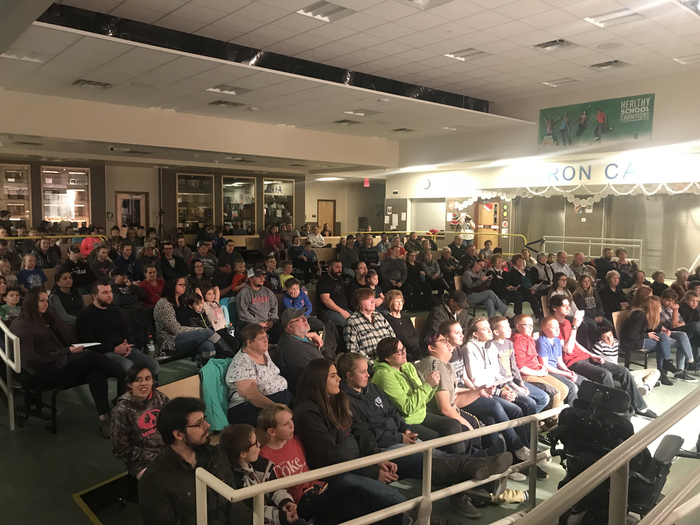 We a had a great turnout for the play last night. 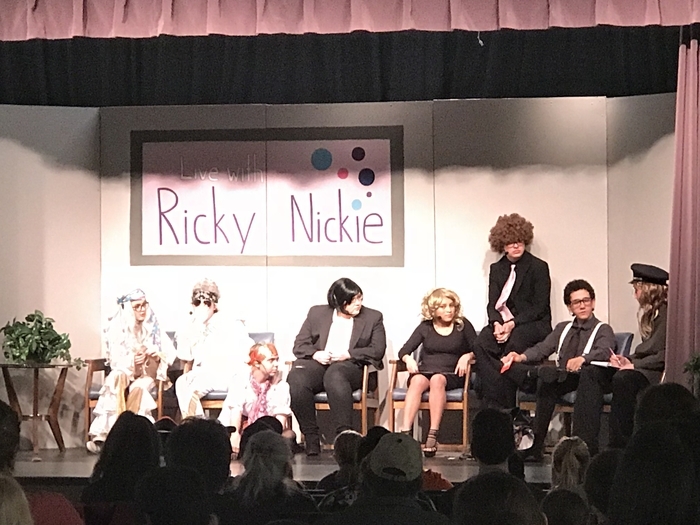 Thank you to everyone who came out to support our drama students. 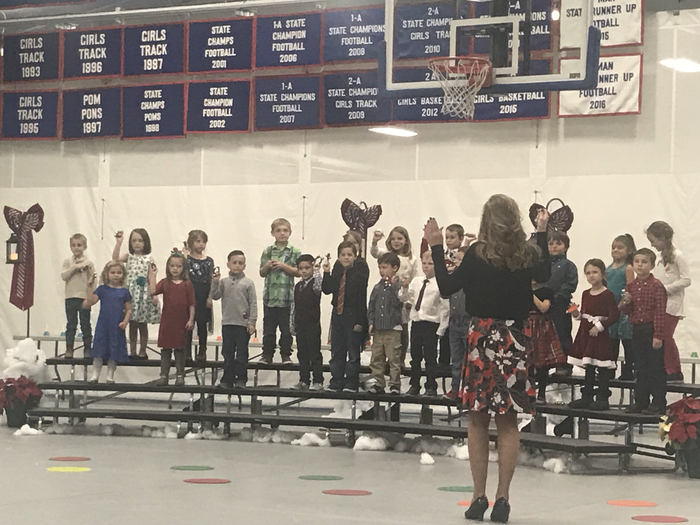 PK-4th Grade Music Concert Congratulations to Mrs. Sue Hellyer and her music students on a wonderful performance Monday night. 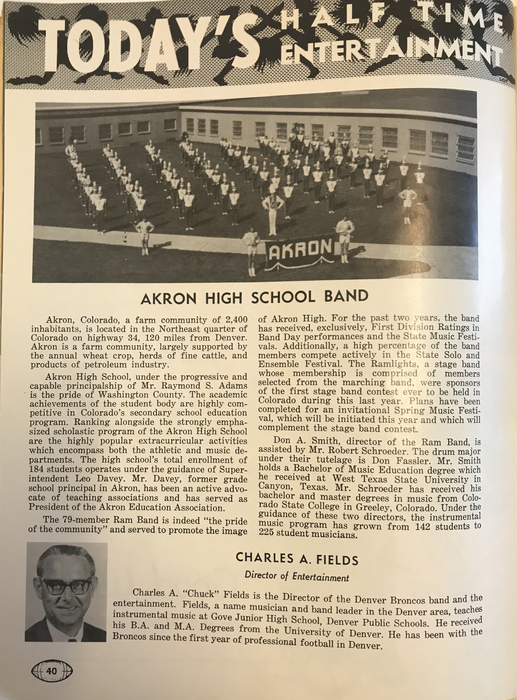 Back in 1965 the Akron H.S. Ram Band was featured at halftime of the Denver Broncos game against the Houston Oilers. 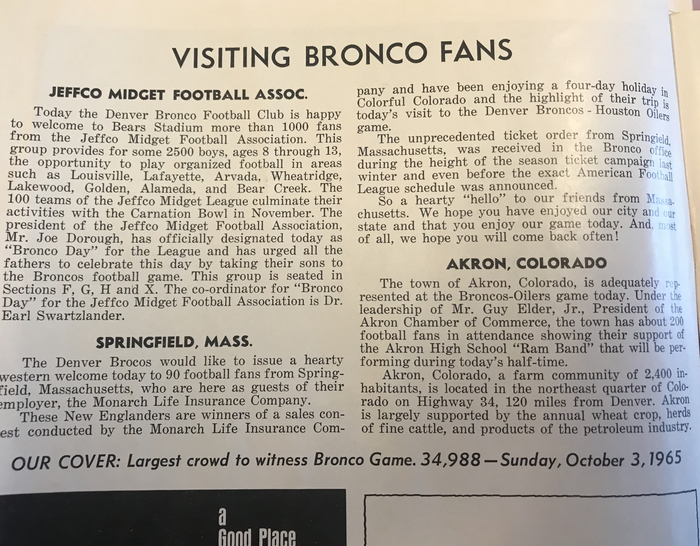 The pictures are from the 1965 Broncos program. 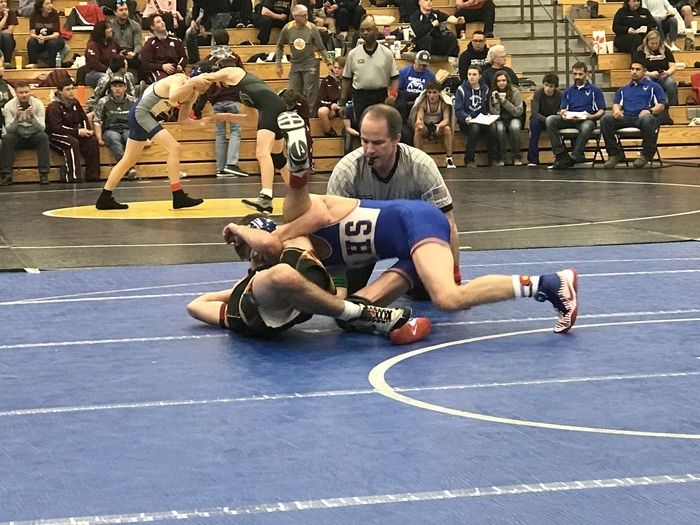 We had a great day of wrestling at the Chuck Annand Invitational in Akron on Saturday. 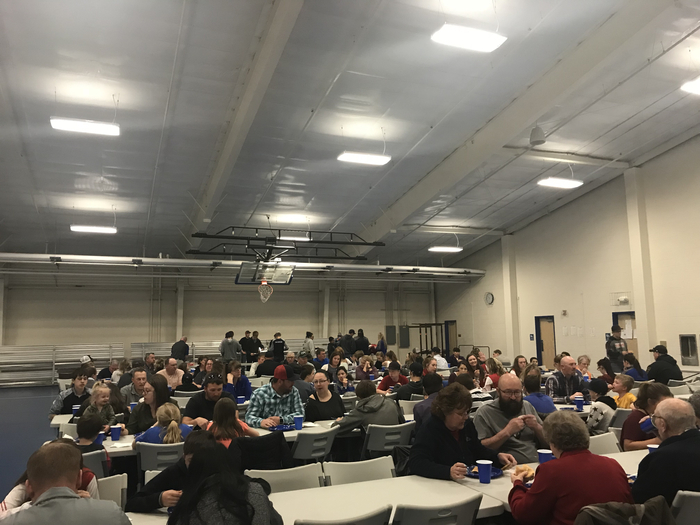 Thank you to everyone who helped make our tournament a success! Akron Ram results: Derrick Poss -1st, Justin Traxler 2nd, and Alex Hallock 3rd. Akron finished 8th out of a field of 17 teams with 69.5 points Go Rams! Akron H.S. 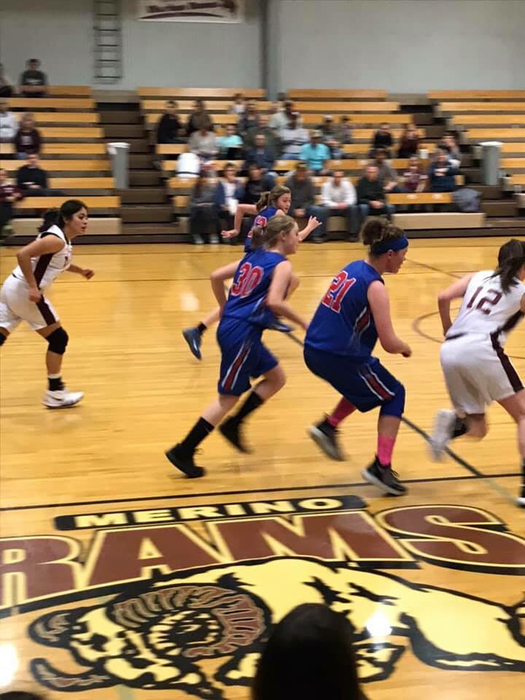 Basketball Results (11/30/18): Girls - Akron 26 Merino 37 Boys - Akron 44 Merino 37 Go Akron Rams! 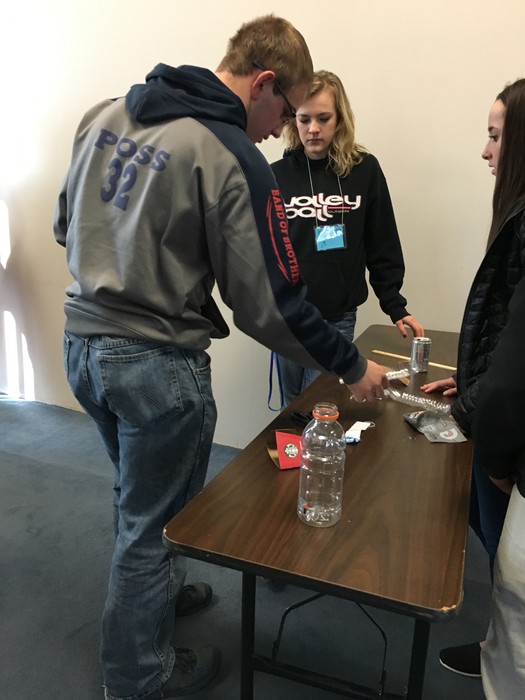 Our students had a great time at the RAFT Science Day held last Friday. 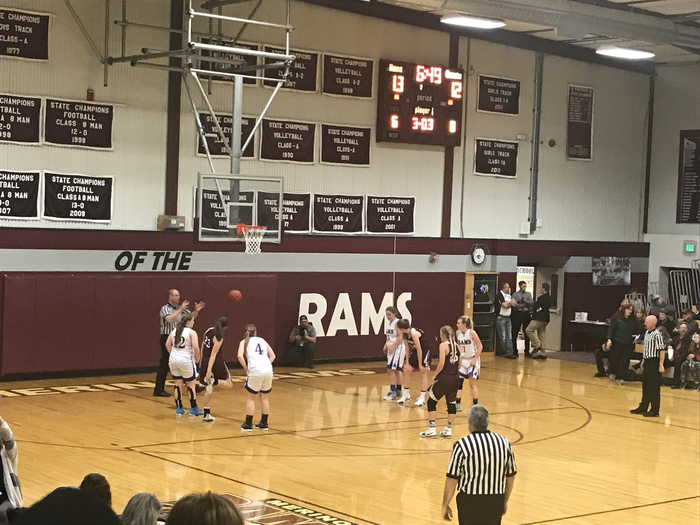 Akron Ram basketball results vs. Brush Thursday night: Lady Rams 31 Lady Beetdiggers 48 Rams 41 Beetdiggers 58 The Akron Ram basketball teams will be in action again tonight at Merino games start at 4 pm. Go Rams! 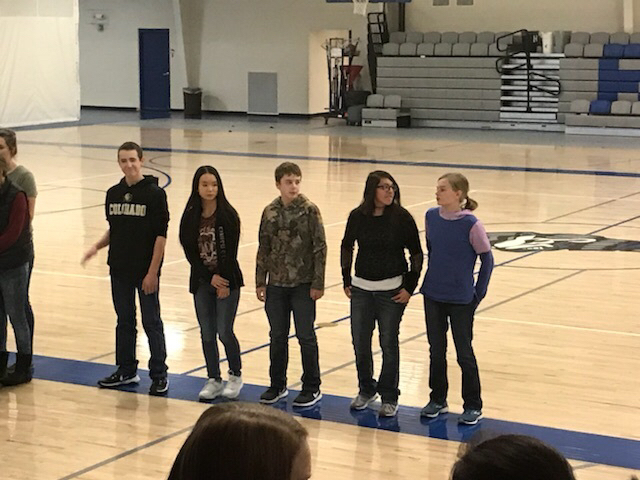 Our 7th & 8th grade students led the school in the fight song Thursday morning. Go Rams! 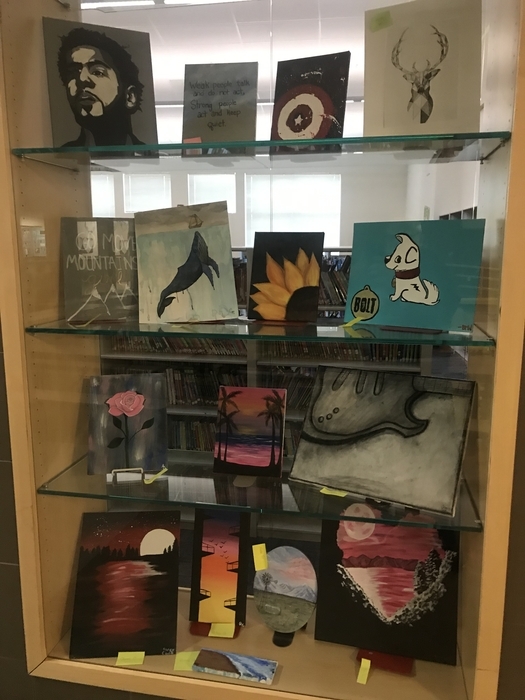 Akron student art projects on display in our cafetorium. Congratulations to Kate Pachner for her selection to the State Volleyball All-Conference Honorable Mention Team. Congratulations to our All-Conference football players! 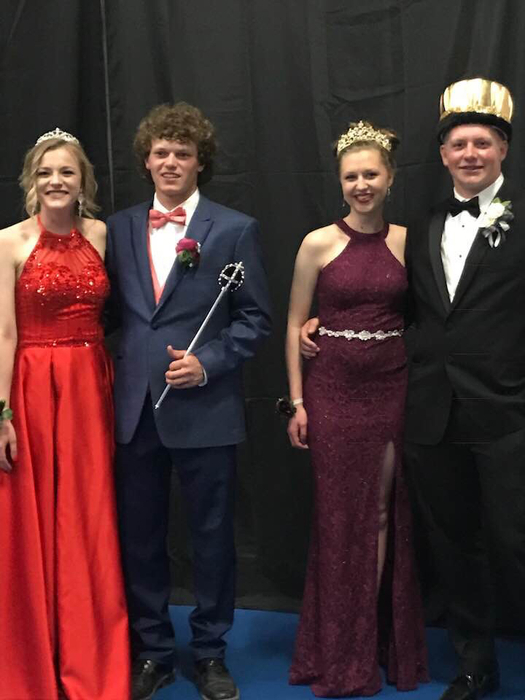 Jaden Hottinger, Justin Traxler, Gabe Chapin, Derrick Poss, and Seth Dorrenbacher. COME JOIN US!! 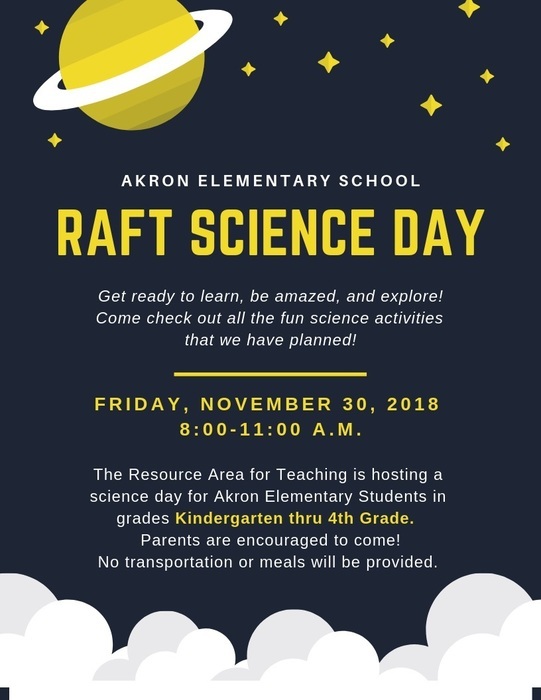 The RAFT Science Day for all students K-4th grade will be held this Friday, November 30th, from 8-11 a.m. in the fieldhouse. Parents are encouraged to come! Hope to see you there! 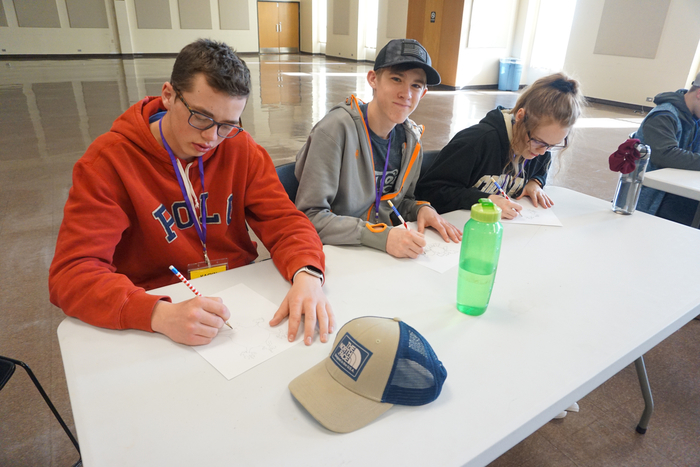 We are proud to announce that we have 3 students who have been named semifinalists for the 2019 Boettcher Scholarship. 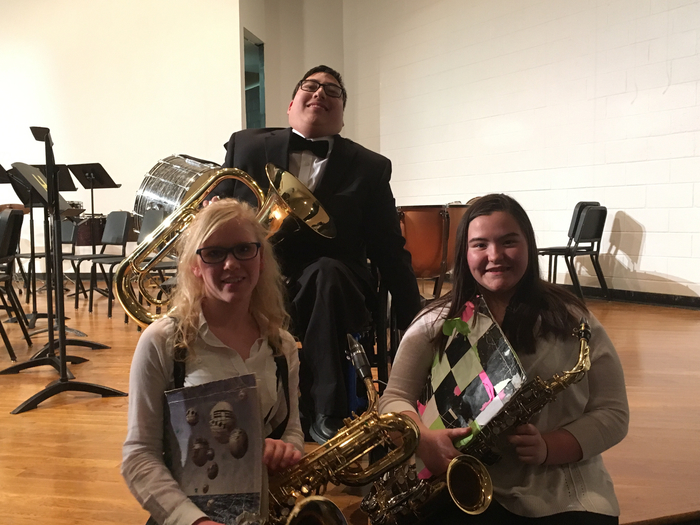 They are Cheyenne McGuire, Kate Pachner, and Derrick Poss. 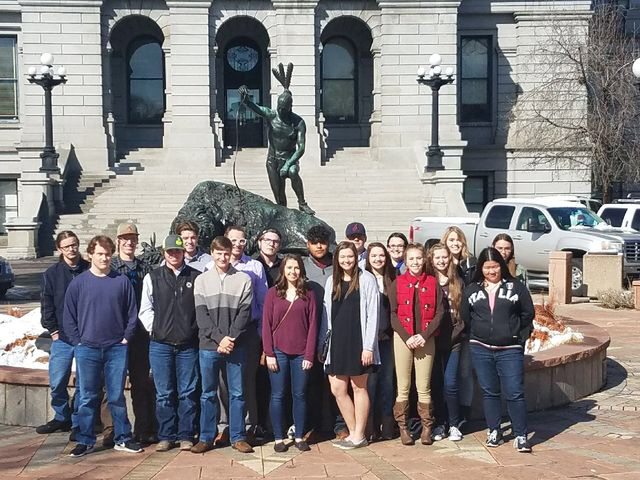 They are each one of 300 chosen semifinalists in Colorado. 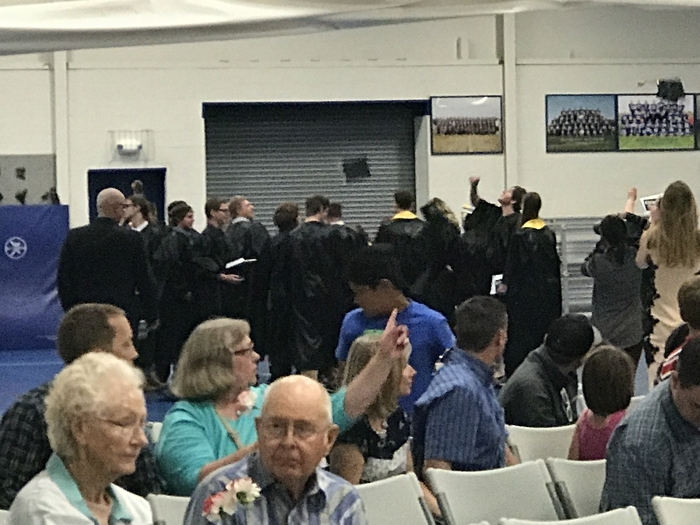 Best wishes to each of you as you continue through the process. 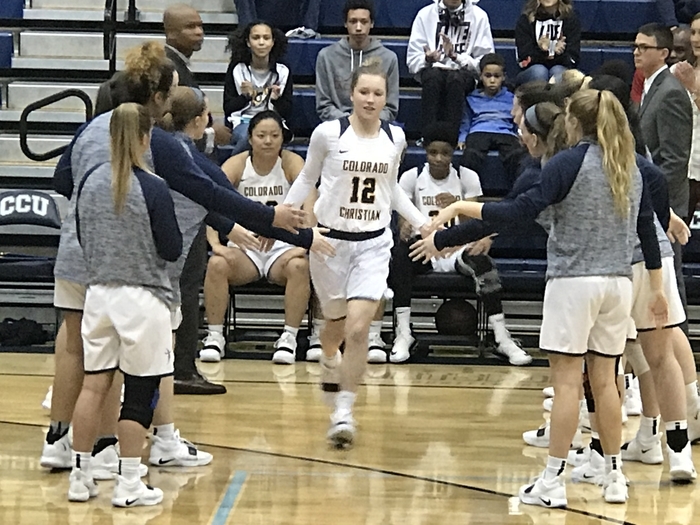 Akron’s Jordan Baer is off to a great start playing her senior season at Colorado Christian University. She is currently averaging over 20 points a game. We are proud of you Jordan! 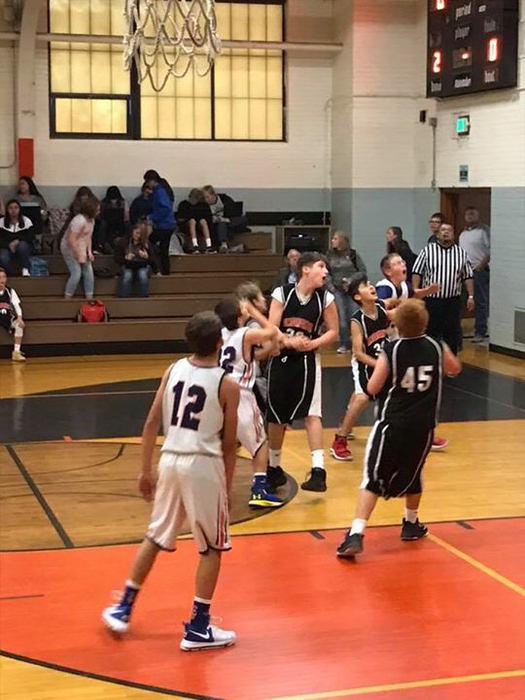 Akron JH boys against Arickaree Last Wednesday. Great job Rams!!! Congratulations to Akron Lady Ram Nadalynn Poss on her selection to the 2018 All-Conference Honorable Mention softball team. Go Rams! Congratulations to Akron H.S. student Sara Wylie. 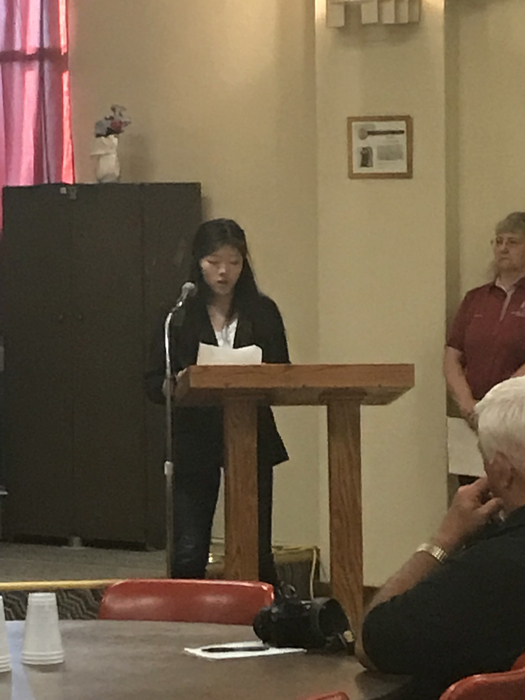 Sara’s entry in the Veterans of Foreign Wars Voice of Democracy audio-essay competition has been selected to move on to the District-wide competition representing Post 8064. 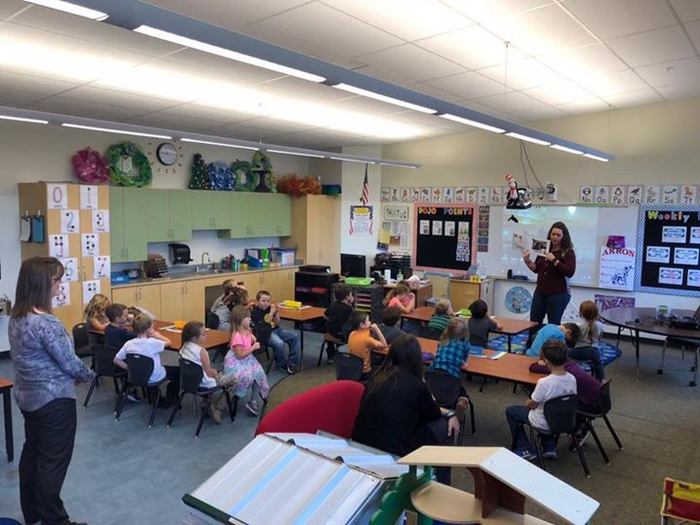 Last week Akron Principal Ed Lundquist took a group of students to the Head Start School to participate in Community Readers. 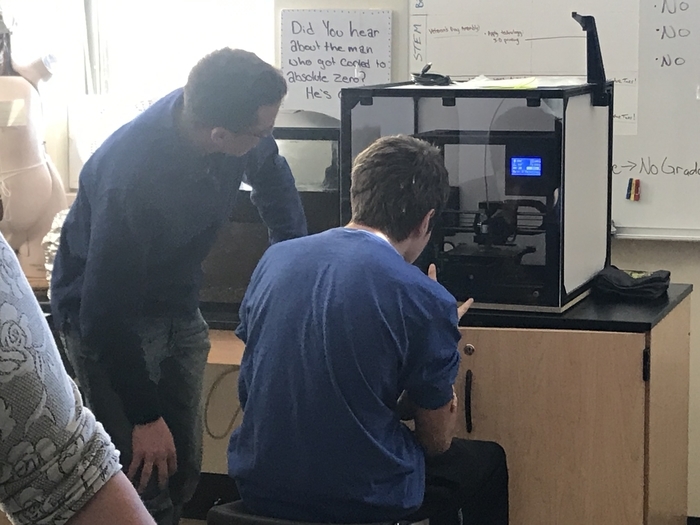 We have a new 3-D Printer! 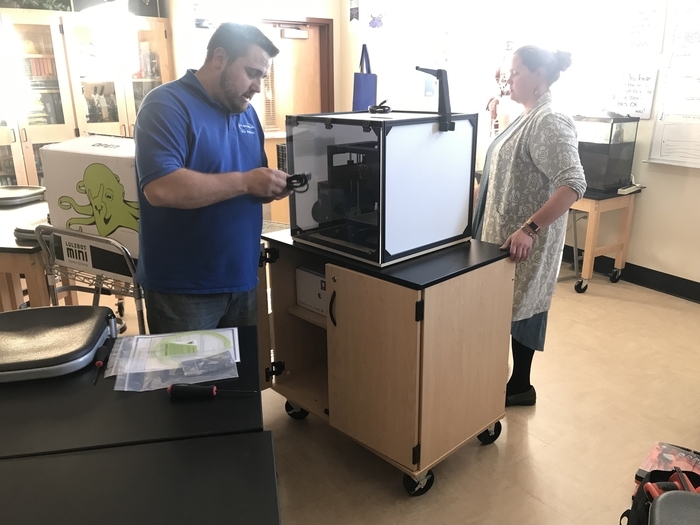 We are grateful to Mike Sullivan from Sedgwick County Economic Development for providing our school with a new 3-D printer. 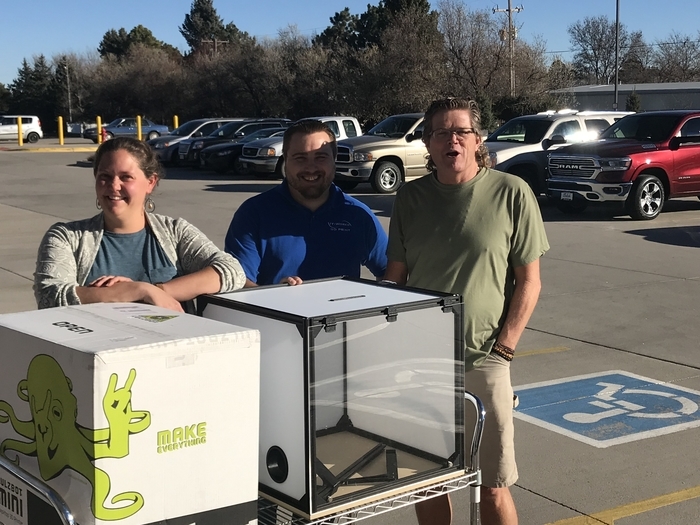 Mike was joined by Zach Ruder from IT Works 3-D printing in Julesburg. Zach helped put the unit together. 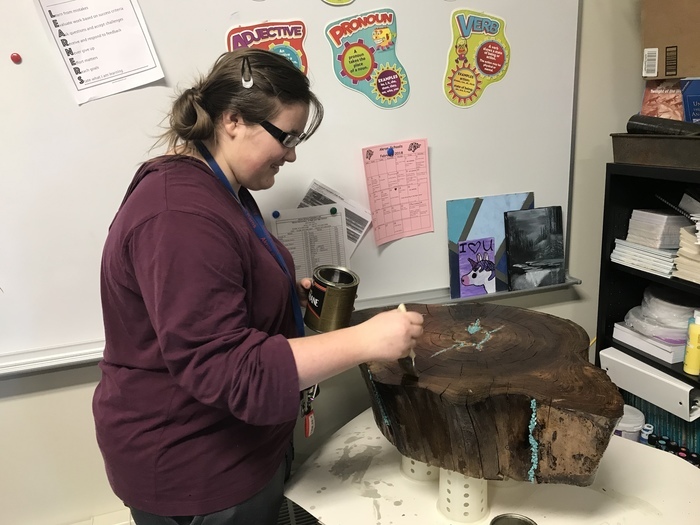 Thank you Ms. Thompson for taking on this project for our school. 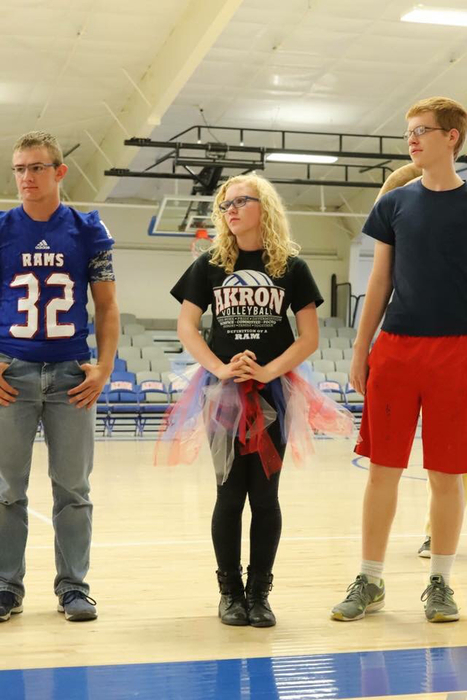 Akron Lady Ram Volleyball Players Receive Honors Congratulations to Kate Pachner, Quincy Basler, and Sara Wylie for their selection to the LPAA All-conference team. Go Rams! 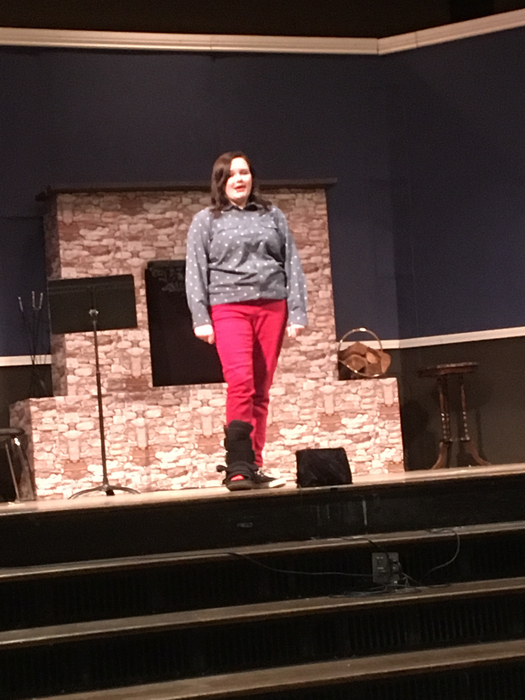 Pictures of our students from League Choir held Tuesday in Holyoke. 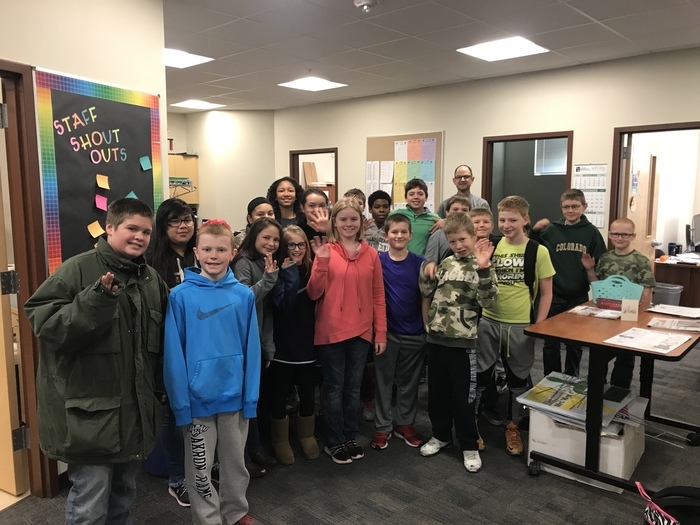 The students were sponsored by Ms. Lowry and Mr. Kraich. Great job Rams! 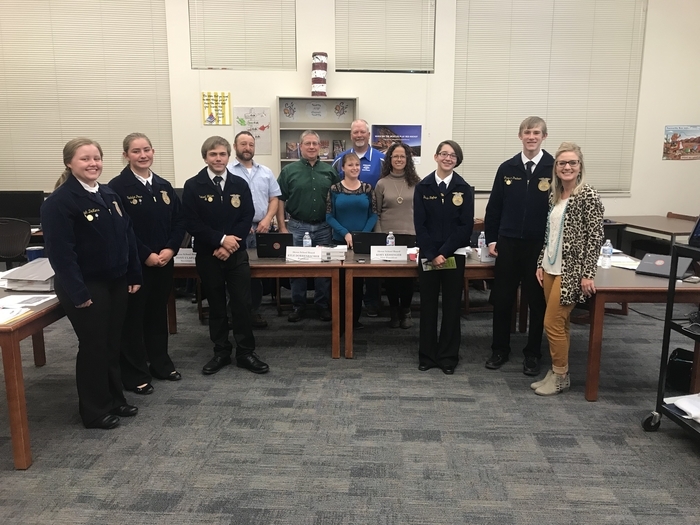 Akron FFA members and their advisor Mrs. Dreitz gave a presentation about their trip to National Convention at the school board Tuesday night. The Akron H.S. 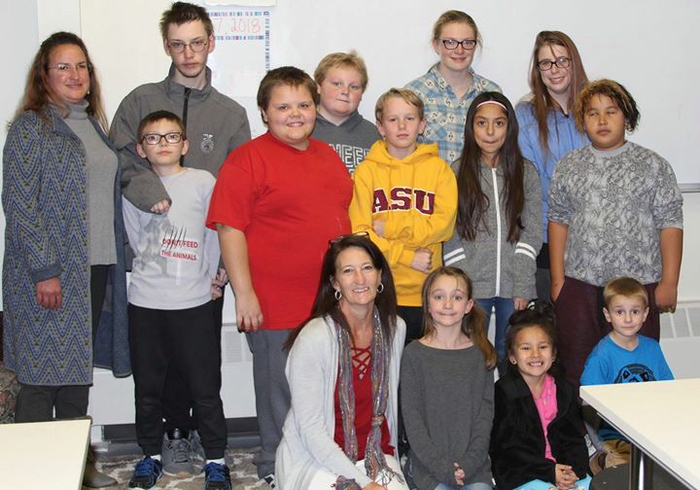 Yearbook class and their teacher Mrs. Houston gave a presentation at the school board meeting Tuesday night. 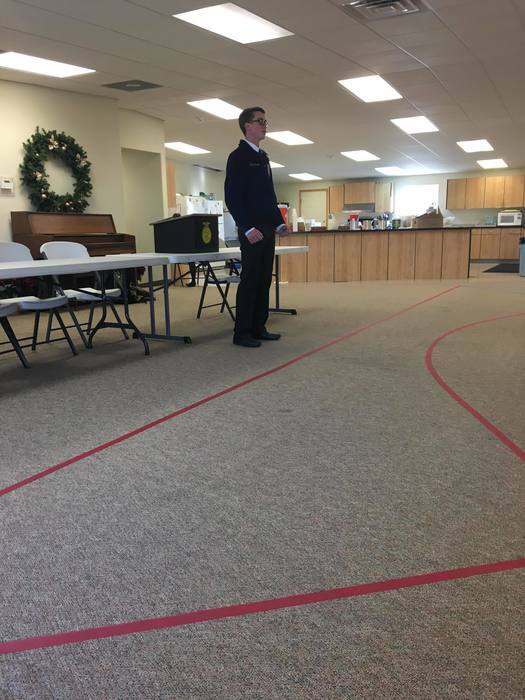 It was an honor and privilege to have 1999 Akron graduate Brodie Hoyer speak at our Veteran’s Day program today. Major Hoyer went on to graduate in the top of his class at United States Military Academy at West Point. 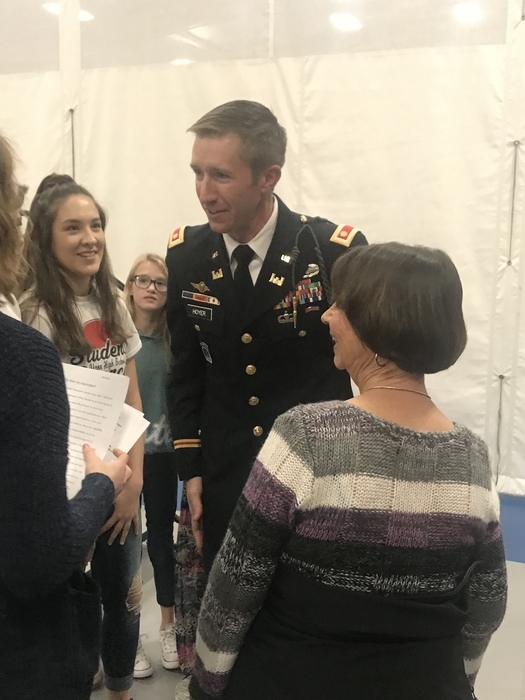 He continues to serve in the Army today and is seeking a doctorate in engineering. His message today was one of service to community and country. Thank you Major Hoyer! Veteran’s Day Program Thank you to everyone who helped make the Veteran’s Day lunch and program a success. We are grateful for our freedom and to the military veterans for their service to our country. Thank you! 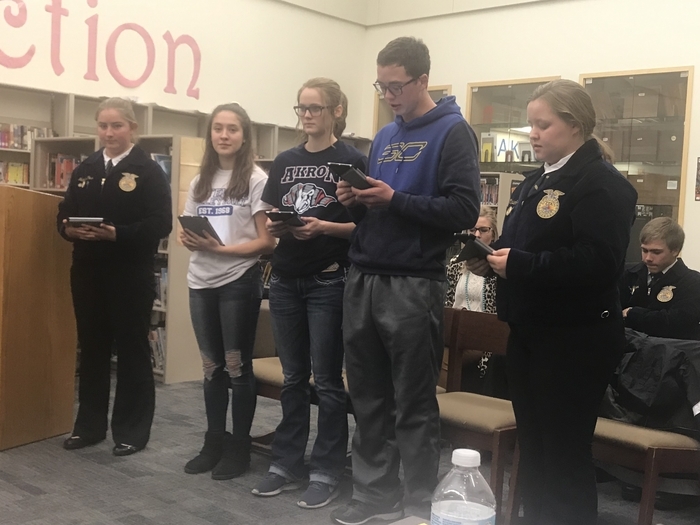 Akron FFA Creed Speaking Contest Congratulations to all of the new members who participated last night. Results: Janessa Shook 1st and Shay Benish 2nd. 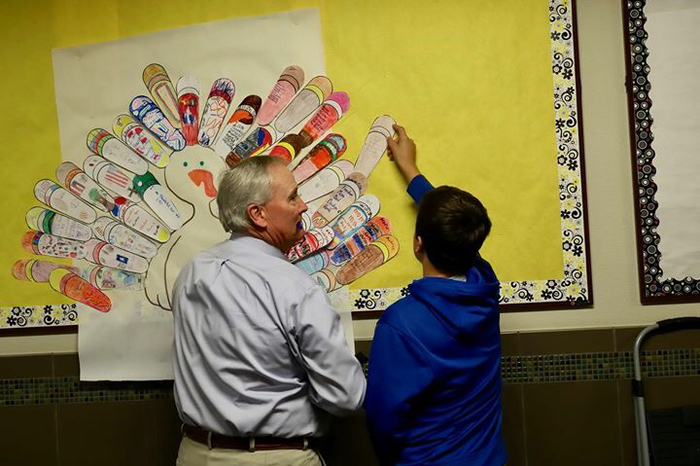 Big Buddy Little Buddy project for November was Thankful Turkey. 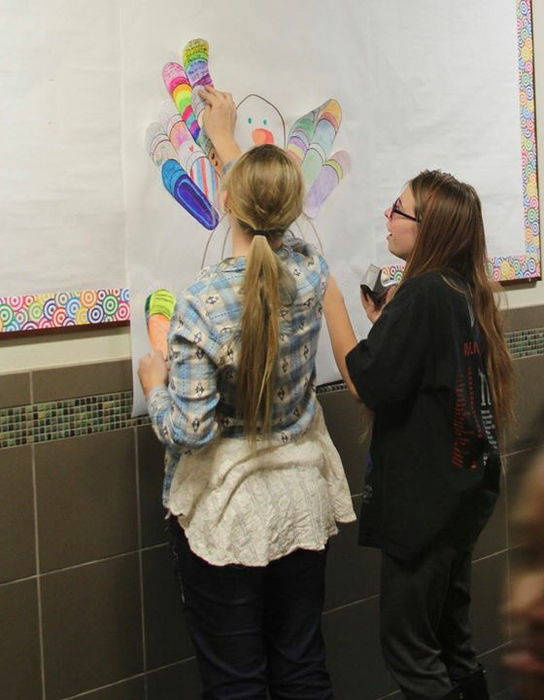 Students wrote what they they were thankful for one their turkey feather. The Akron J.H. 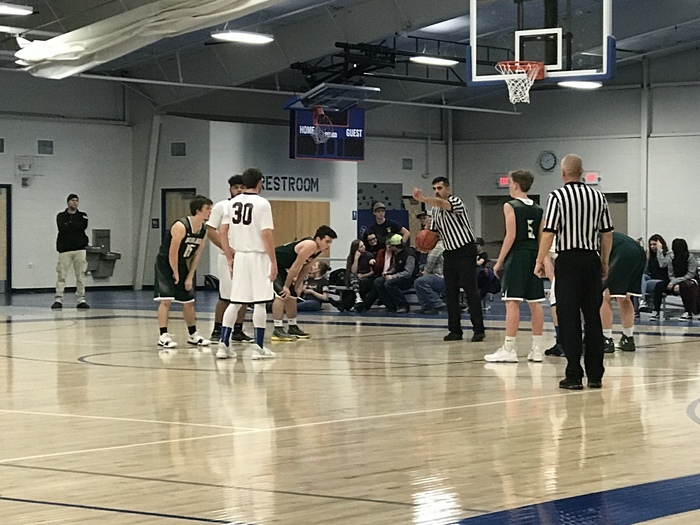 boys’ basketball teams have been busy recently with games at the Wiggins Tournament and home against Haxtun. 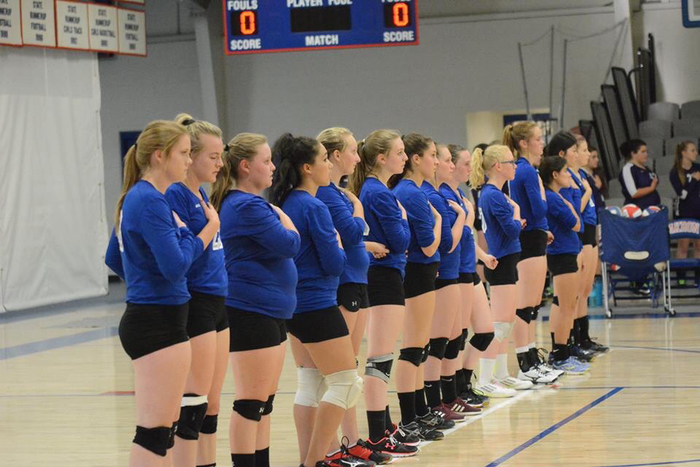 Our Akron Lady Ram volleyball team traveled to Rye for regionals last Saturday. The Rams defeated Dayspring Christian 3-0 but lost to Rye 3-0. Great season ladies! We are very proud of you! The 2018 Akron Ram football season came to an end on Saturday , November 3rd. 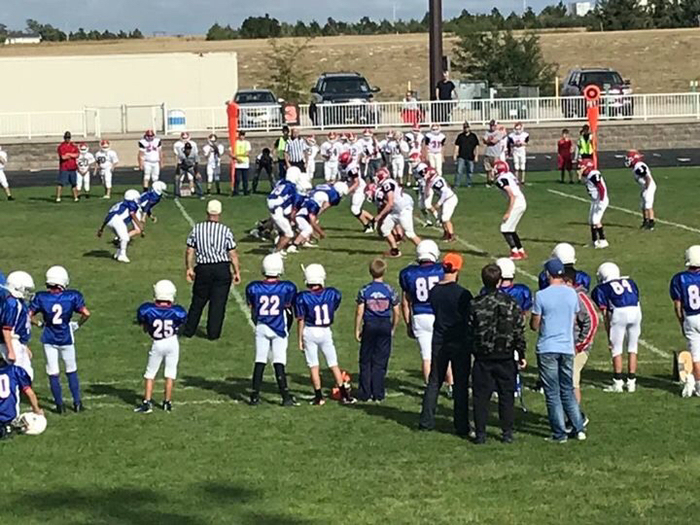 The Rams lost 14-6 to Rangely. 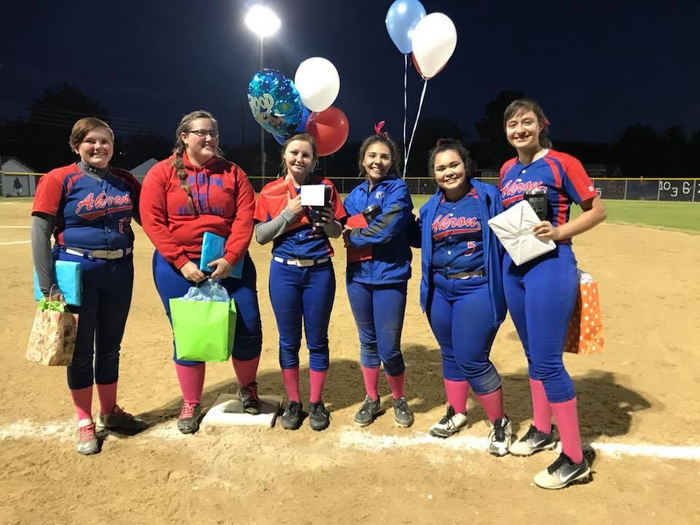 The team loses a great group of seniors this year. 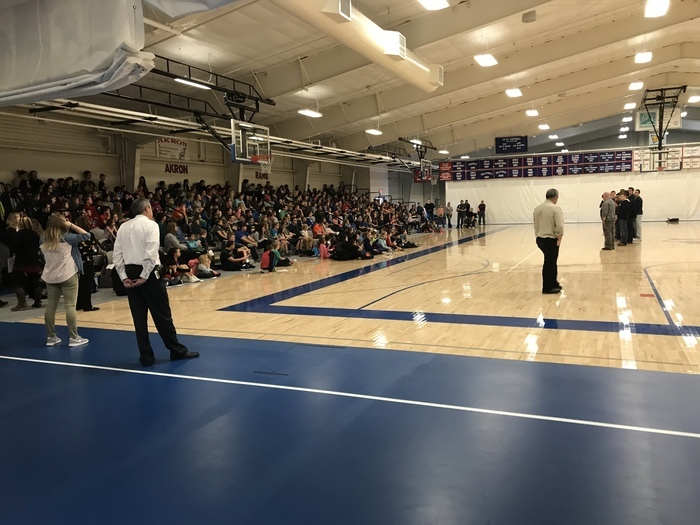 A pep rally was held for our playoff bound volleyball and football teams last Thursday, November 1st. 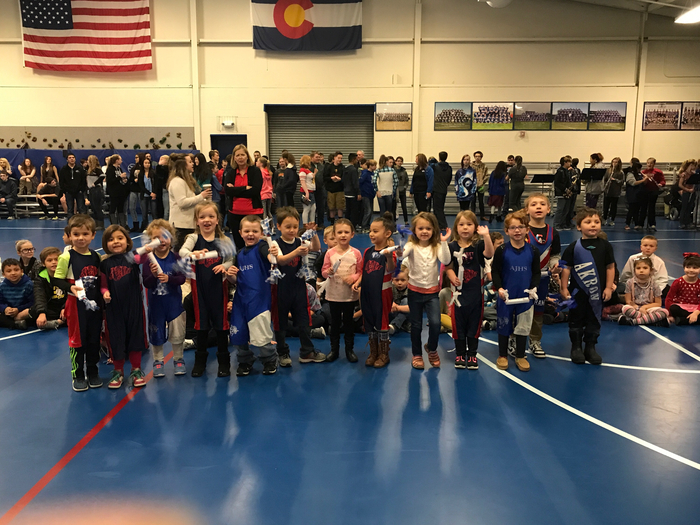 Ms. Krause and her 1st grade students led our school in the fight song last Thursday, November 1st. Go Rams! 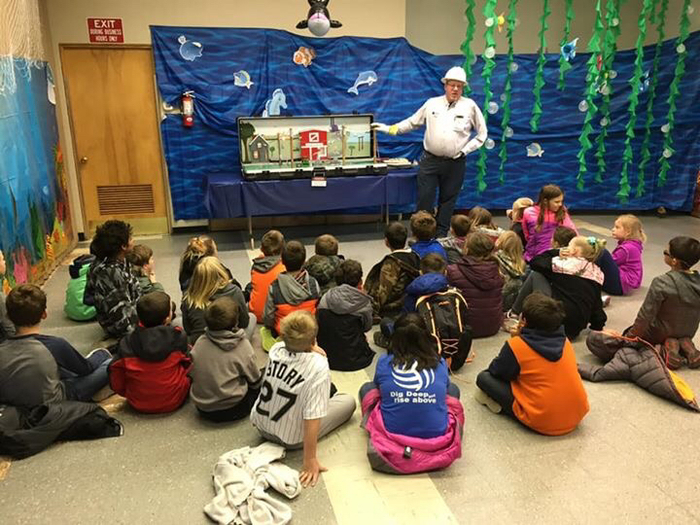 On October 31st, our Preschool-3rd grade students went to Y-W Electric to learn about electricity and how to be safe around electricity. 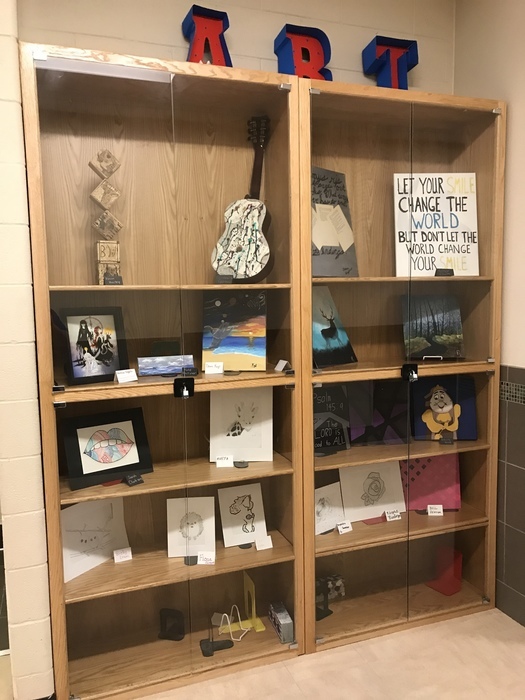 Each class also completed a project for Y-W's open house. 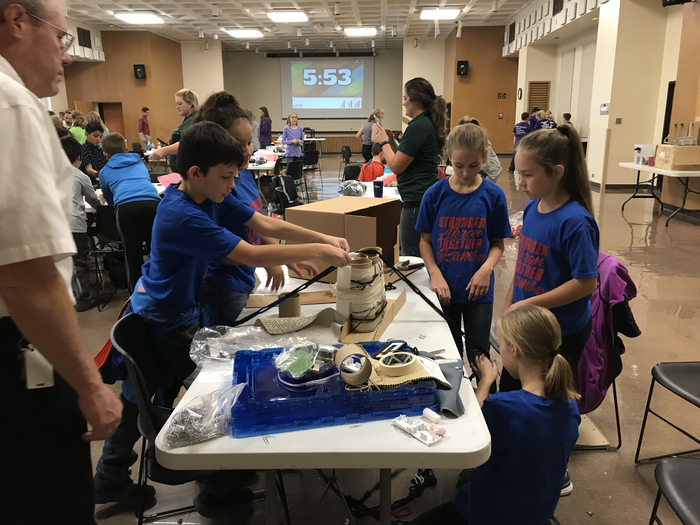 Our robotics team competed at the annual Golden Plains BEST (Boosting Engineering, Science, and Technology) Robotics Challenge held at NJC this past Saturday, October 28th. 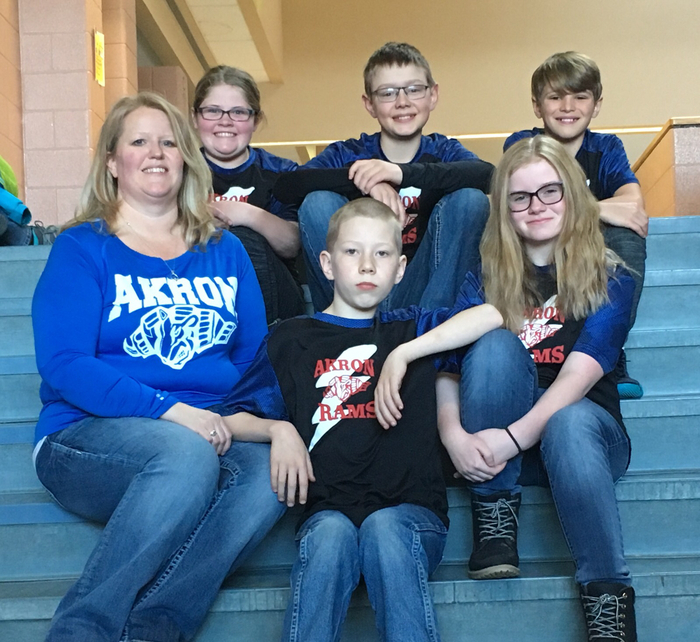 The Akron team made the wildcard round and missed advancing by 20 points. Go Rams! 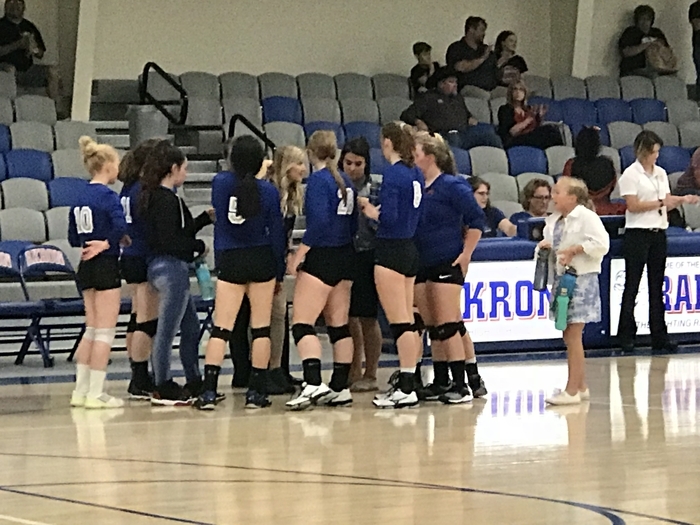 On October 27th, the Akron Lady Ram volleyball team won one and lost two at Byers today. 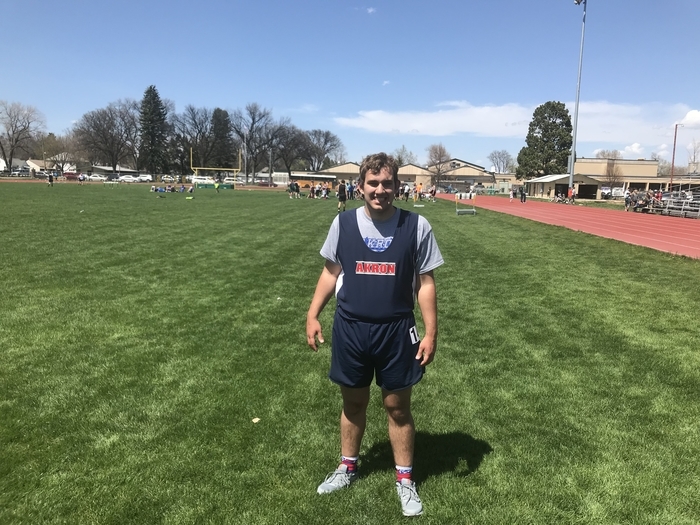 The Rams beat Limon but lost to Byers and Fowler. Go Rams! 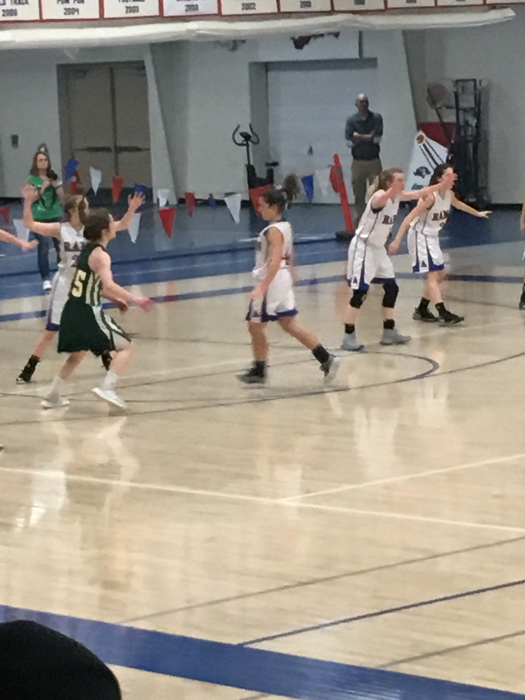 Rams fall to a good Dayspring squad 54-22. 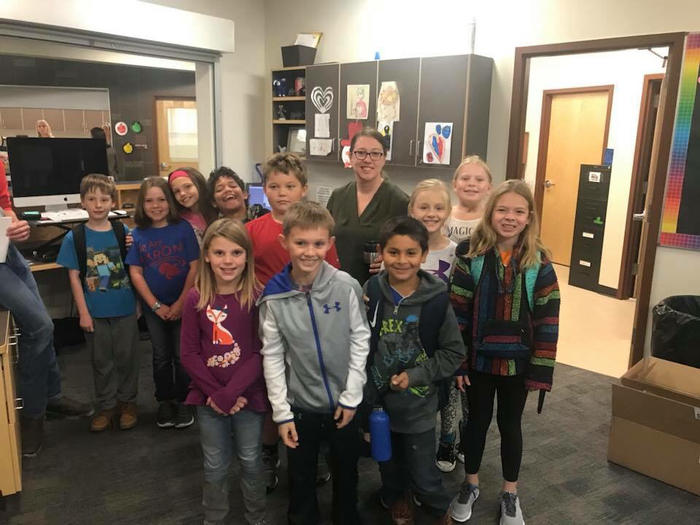 Mrs. Vogt and her 3rd graders led the school in the fight song on October 26th. Go Rams! 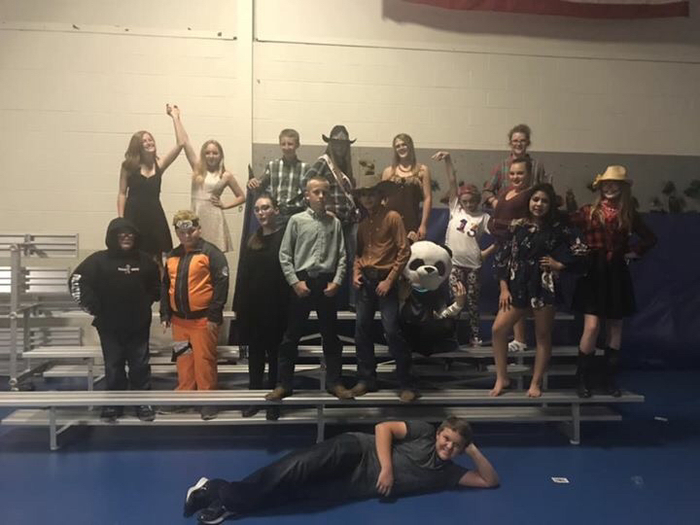 The Akron Junior High had their Fall Festival in October 25th . 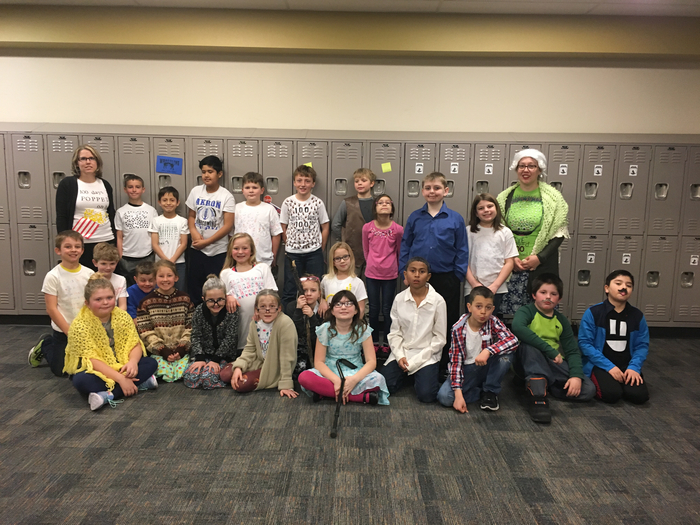 The students did a wonderful job dressing up, dancing, and playing games. 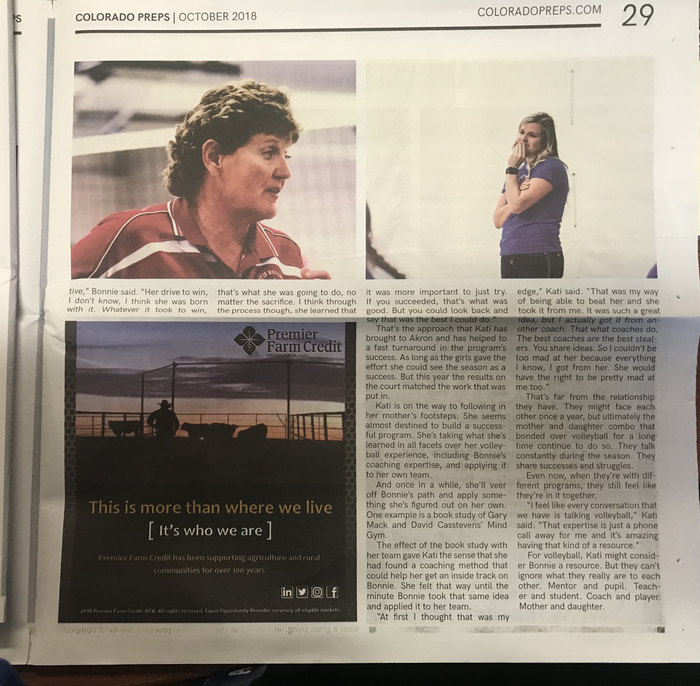 Colorado Preps Magazine has a nice article on coaching families. 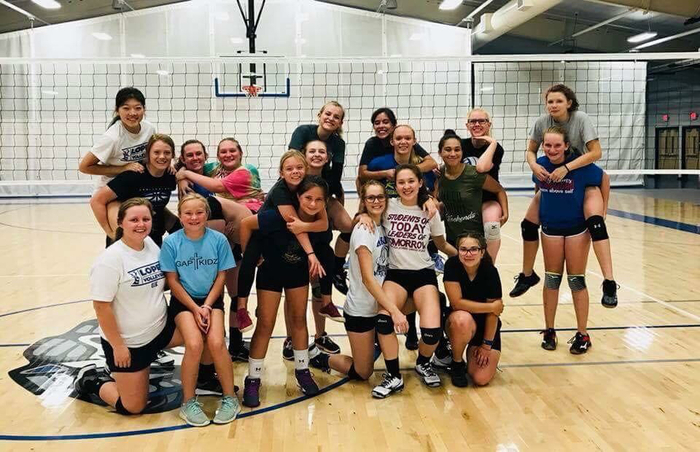 The article features Akron’s Head Volleyball Coach Kati Kuntz and her mom Otis Head Volleyball Coach Bonnie Wallin-Kuntz. Two wonderful ladies that are making a great impact on our youth. You can grab a copy of Colorado Preps Magazine at the Akron School, Bank of Colorado, or JD’s Quickstop. 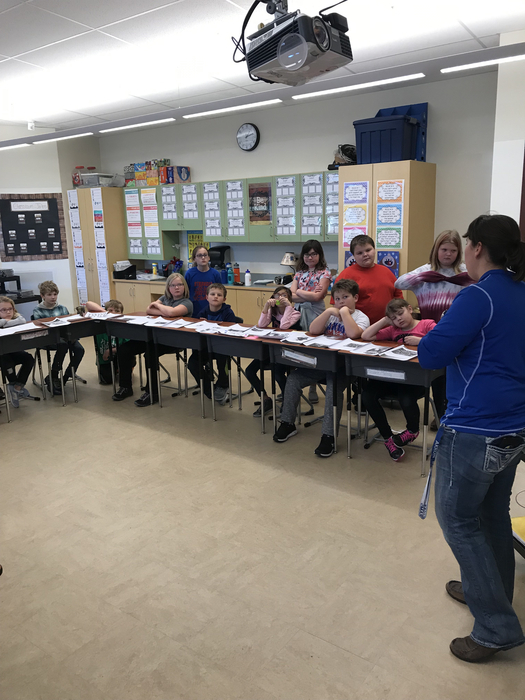 Weathers Farms came to our school on Thursday to visit PS-3rd grade. 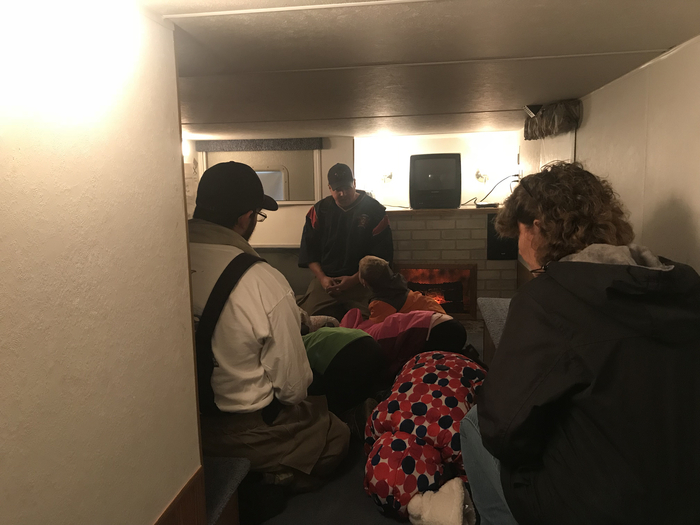 They read a book, showed a video of a hog farm, talked about their own hog farm and growing pumpkins. Each student was able to taken home a miniature pumpkin as well. It was a great day! 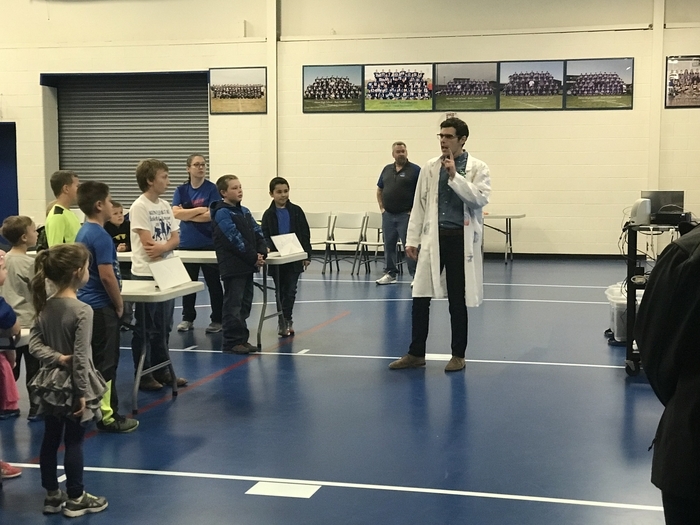 Akron Gifted and Talented students at Survivor STEM held at NJC in Sterling on Wednesday. 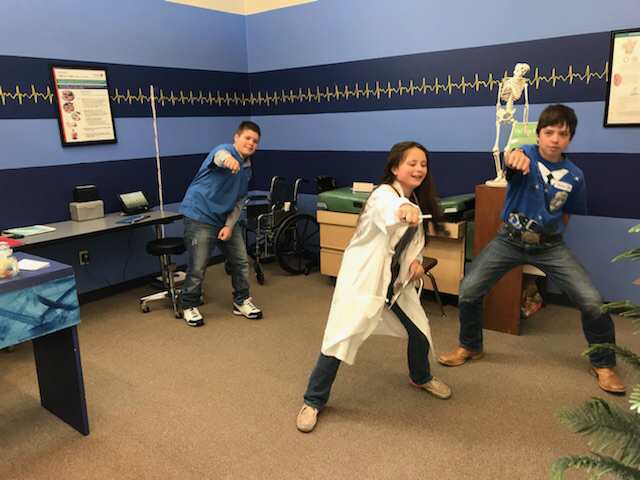 Students were divided into teams and worked on a variety of projects to help save civilization from the Zombie Apocalypse. 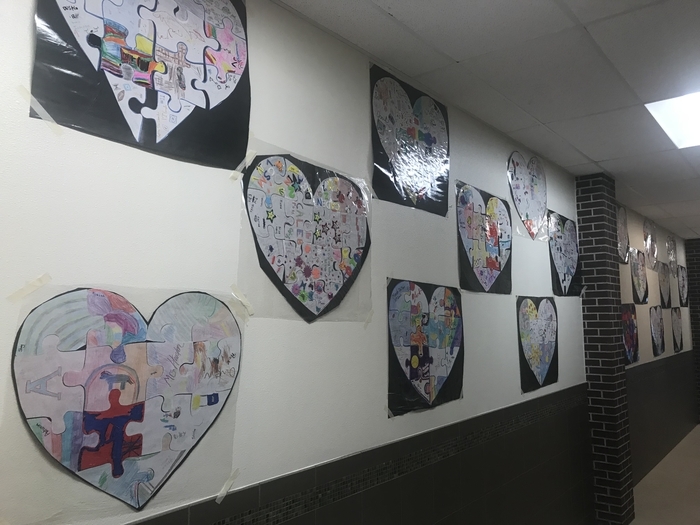 Big Buddy Little Buddy Project These hearts were put together with puzzle pieces created by our individual students. 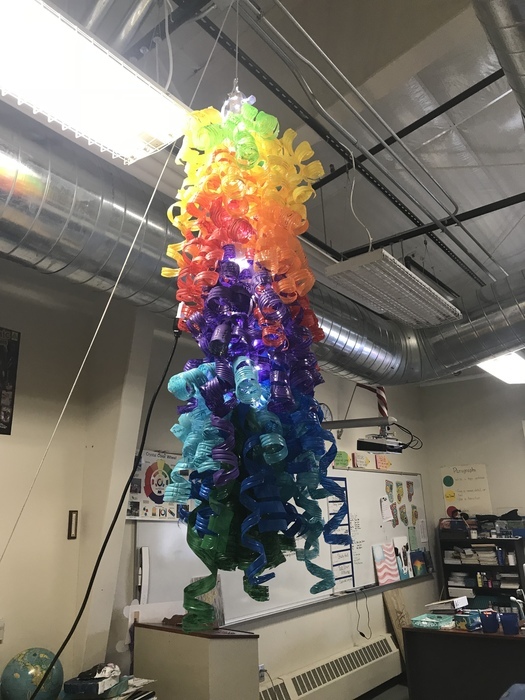 The goal of this project was for students to know we all bring in our own unique qualities but together we make up the heart of a strong Ram. 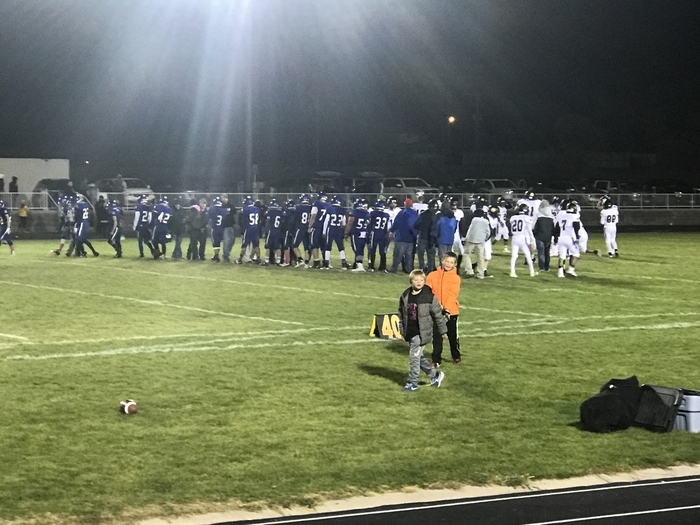 The Ram football team played their last J.V. football game on Monday vs Dayspring and Byers. These boys have improved this year. Great season Rams! 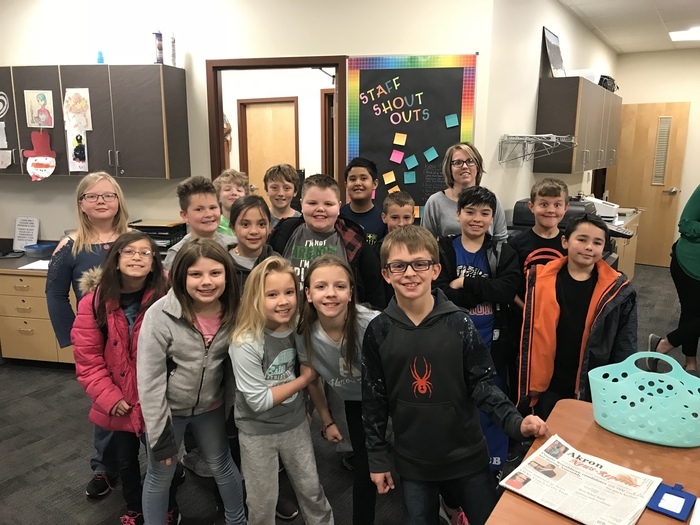 We were fortunate to have 9News Meteorologist Kylie Bearse visit our school and have it featured on 9News Sunday Morning. 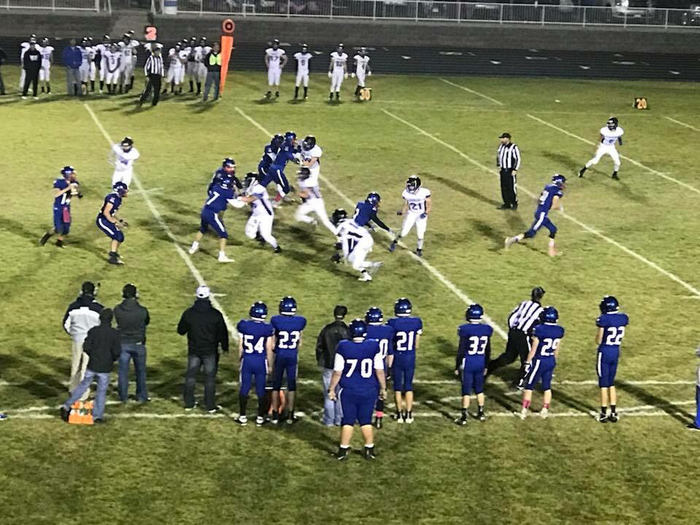 The Akron Ram football team improved to 5-3 on the season with a 32-17 win at Haxtun last Friday. Go Rams! 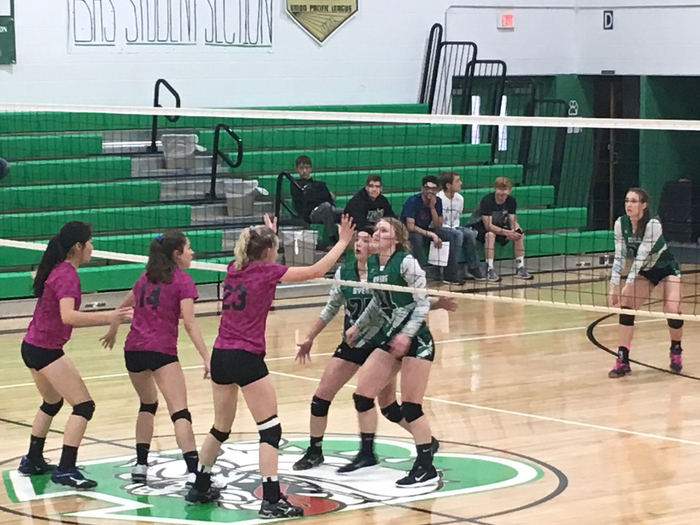 The Akron Lady Ram volleyball team dropped their contest with Haxtun on Friday night losing 3-1 to the Bulldogs. 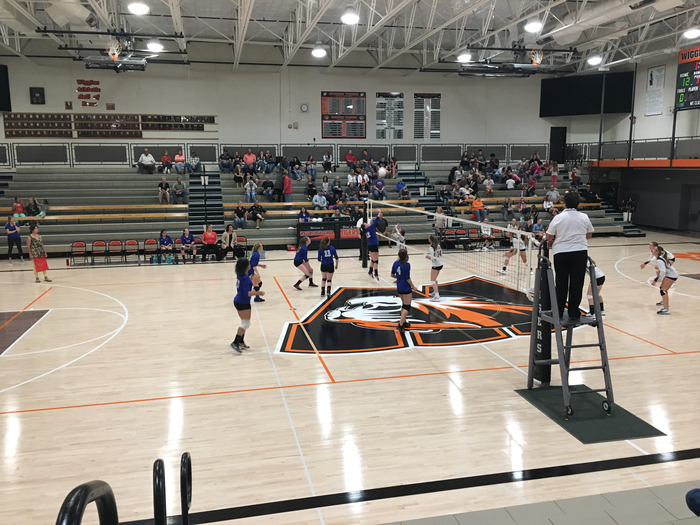 The Akron Lady Ram volleyball team beat the Brush Lady Beetdiggers 3-0 on Oct. 18th. Great job Ladies! 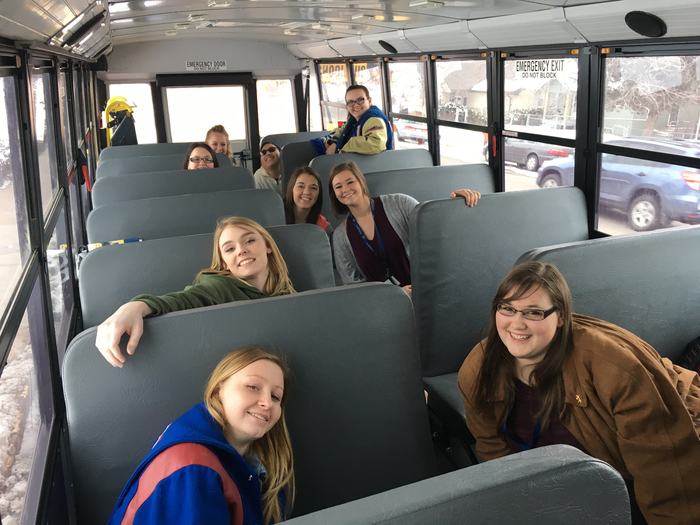 Akron FCCLA at Fall Conference in Holyoke. 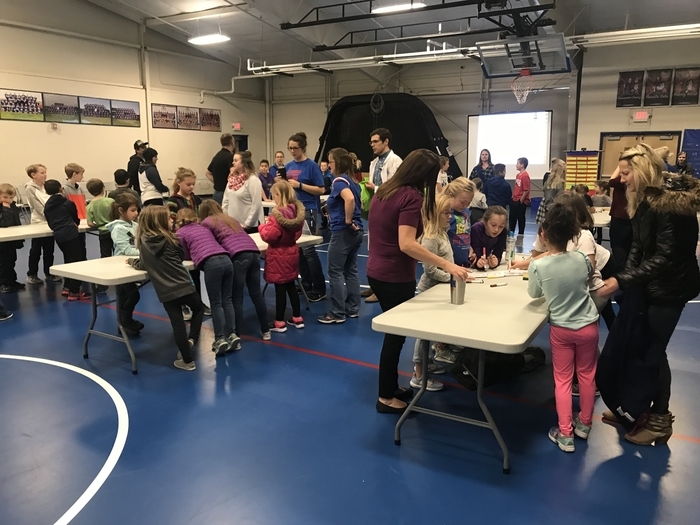 Students prepared and packed food boxes for the food bank on Oct. 17th. Astronomy Night Ms. Thompson and a group of her students went out on Oct. 15th and viewed the night sky. 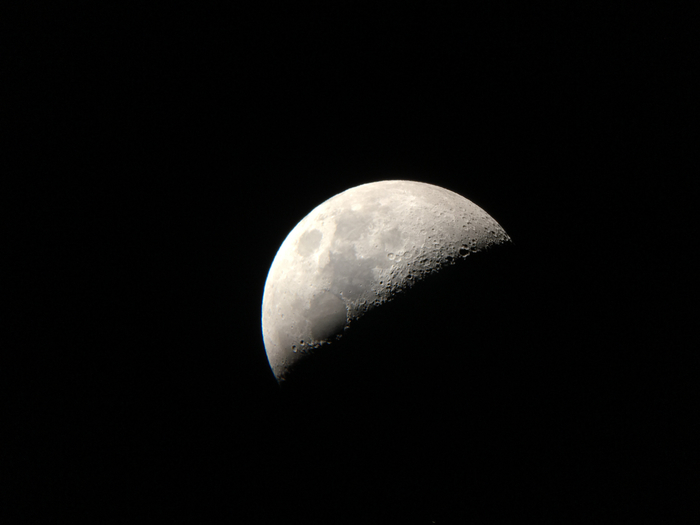 They were able to get some very neat pictures of the moon and view Saturn’s rings. 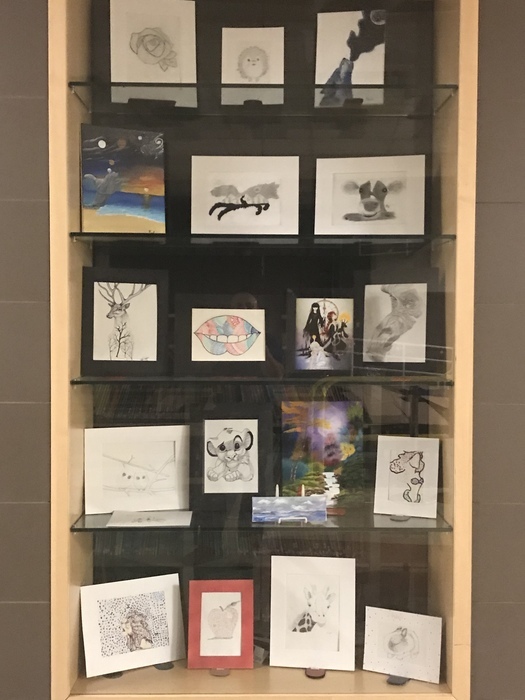 Akron Ram Art We have some great student work on display in the cafeteria. 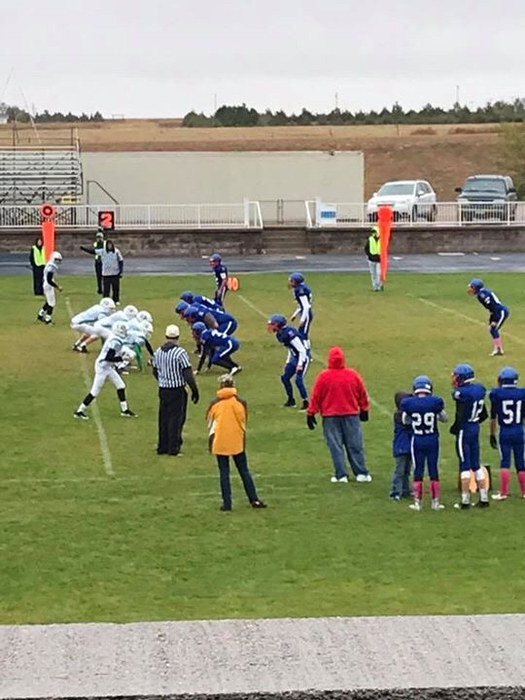 The Akron Ram football team lost a hard fought contest against Caliche last night 6-0. Go Rams! 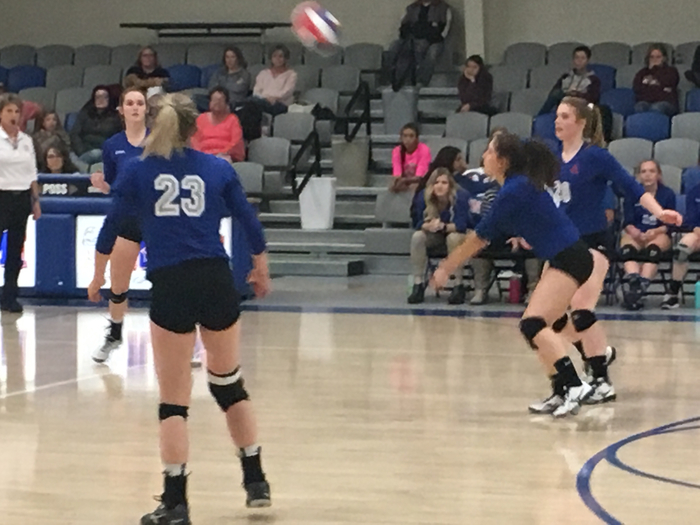 The Akron Ram volleyball team defeated the Caliche Buffaloes last night 3-0. Go Rams! 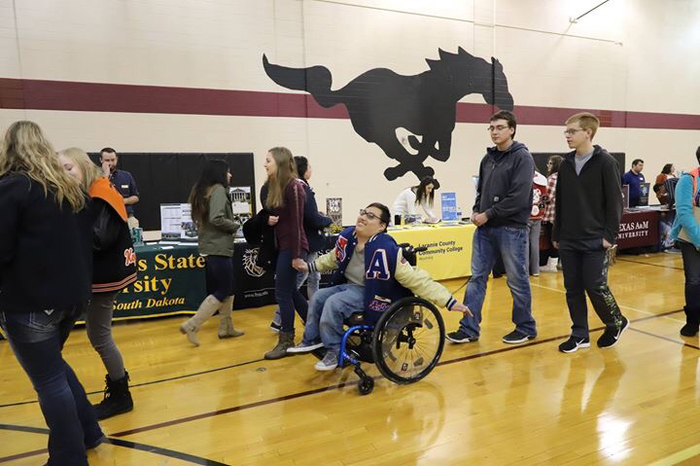 Akron senior students visited a college fair in Ft. Morgan on Wednesday morning. 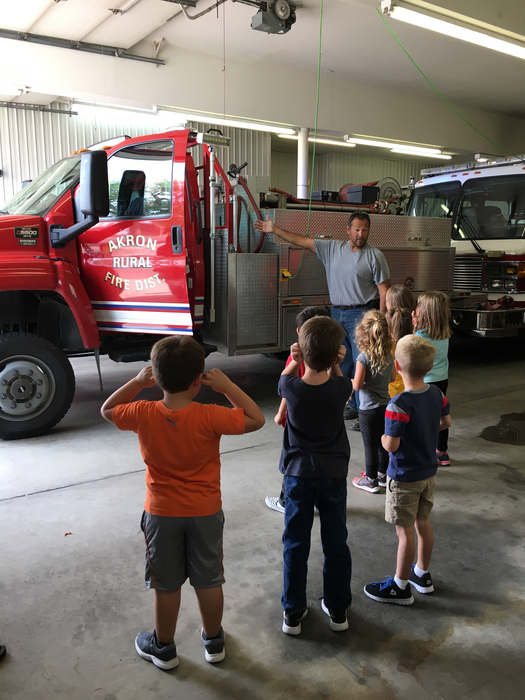 Safety and Fire Prevention Program PK-4th Grades Special thanks to AVFD for the smoke/weather safety trailer and Akron Sheriffs Office for going over street crossing and parking lot safety. Also to Latte Da for the generous donation of coffee for our firemen and police officers. 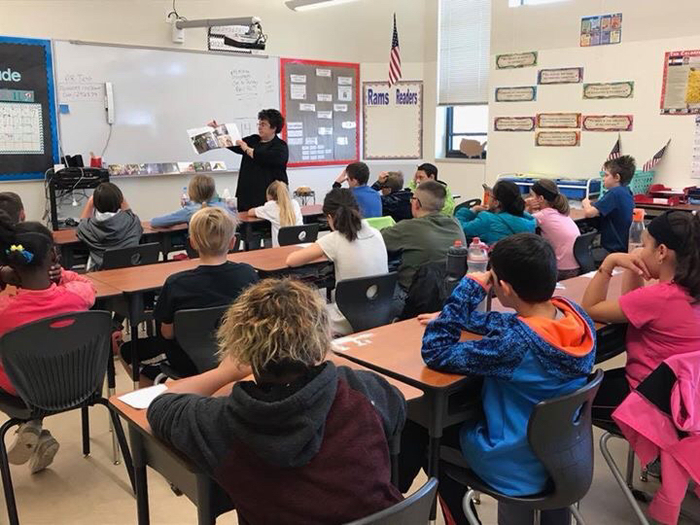 9 News Meteorologist visits Akron Elementary. 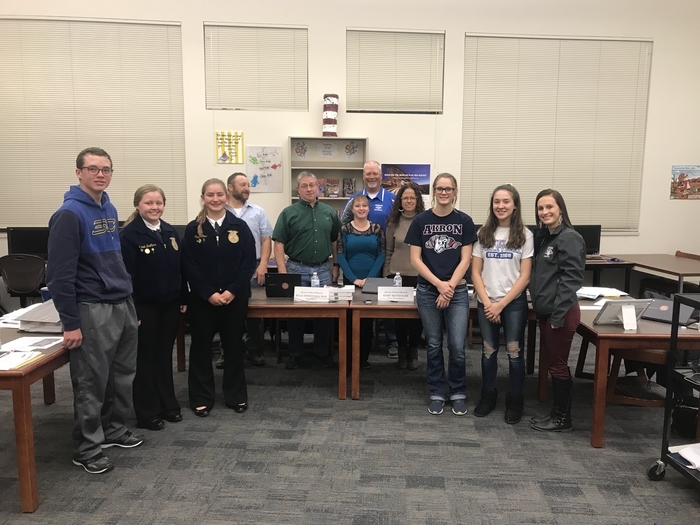 Mrs. Dreitz and her Akron FFA students did a great job presenting their program at the school board meeting on Tuesday night. 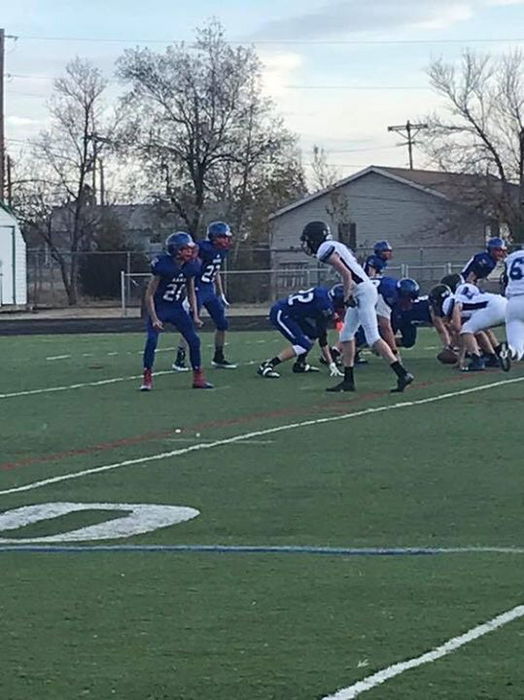 The Akron JV team picked up a win on Monday against Byers. Great job Rams!! 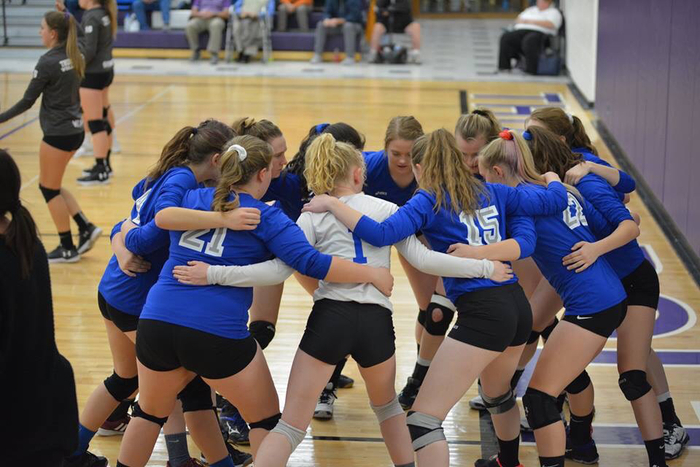 The Akron Lady Ram JH volleyball team played at the LPAA league tournament in Holyoke last Saturday, Oct. 6th. 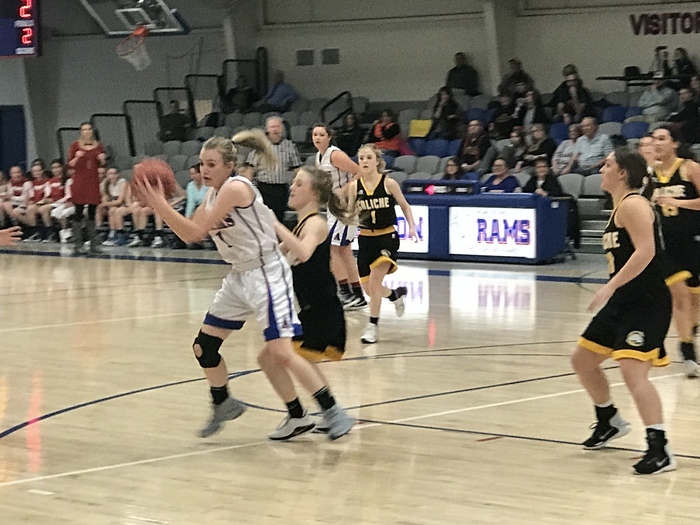 The Rams beat Haxtun and lost close contests to Sedgwick County and Merino. Good job ladies! 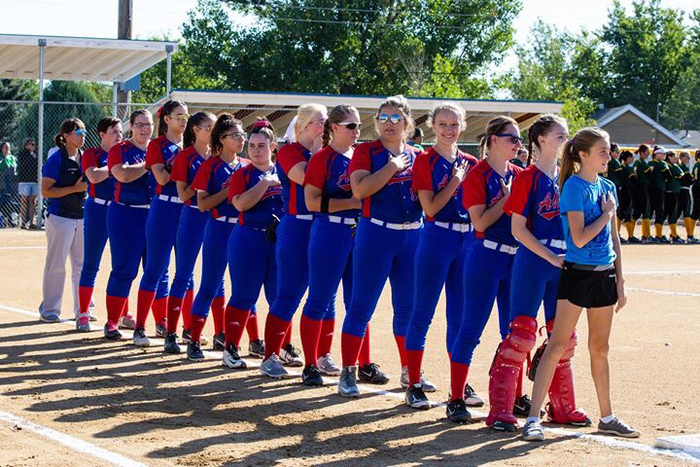 The Akron Lady Ram softball team played at Burlington against the Cougars last Saturday, Oct. 6th. Burlington won both games of the doubleheader despite a good effort from the Rams. Go Blue! 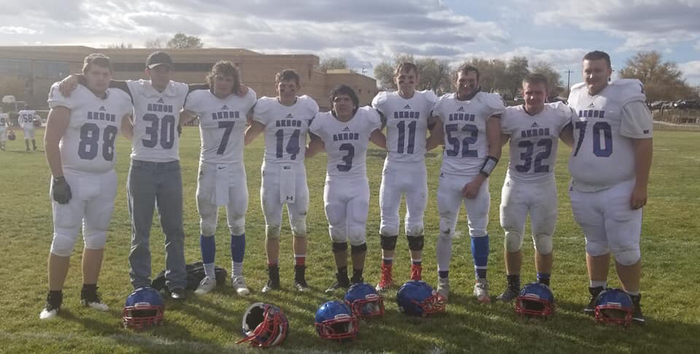 The Akron Ram football team defeated the Byers Bulldogs on October 5th 58-16. Go Rams! 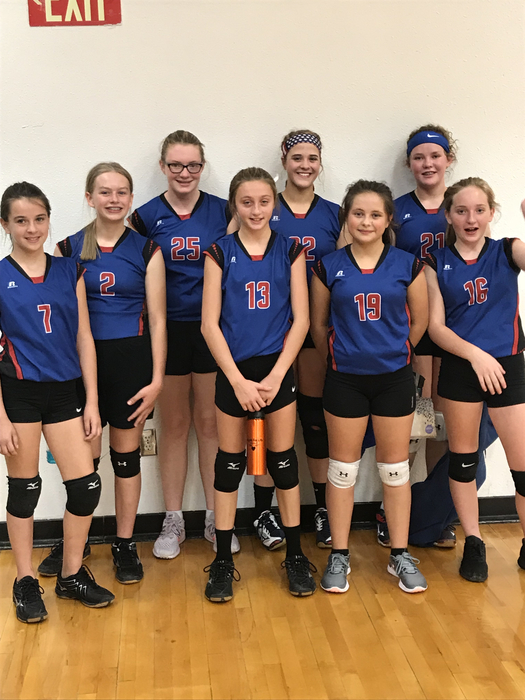 The Akron JH and HS volleyball teams picked up wins at Arickaree in October 4th against Arickaree-Woodlin. Go Rams! 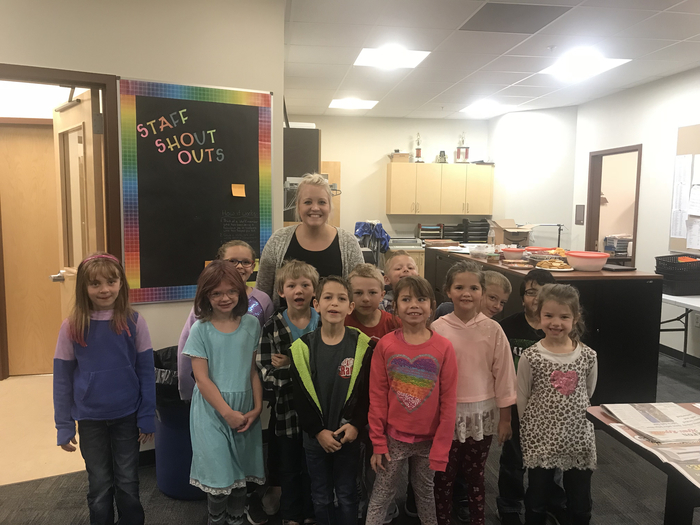 We love our Big Buddy Little Buddy Program. 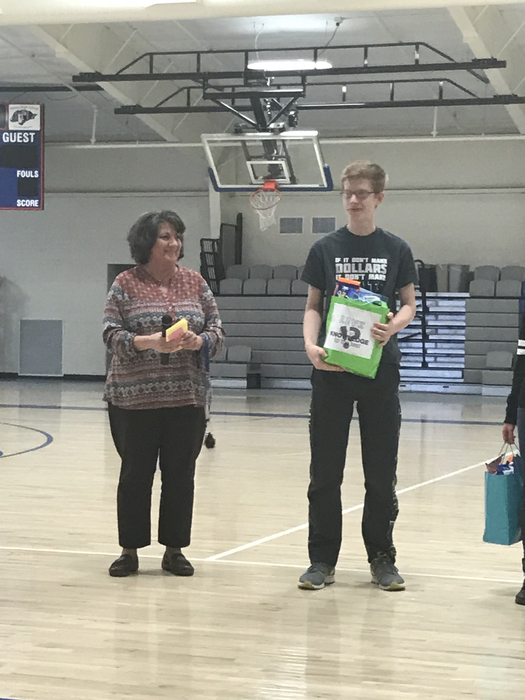 Congratulations to Derrick Poss, Cheyenne McGuire and Levi Kipp on receiving letters of commendation for their performance on the preliminary SAT/National Merit Scholarship Qualifying test. 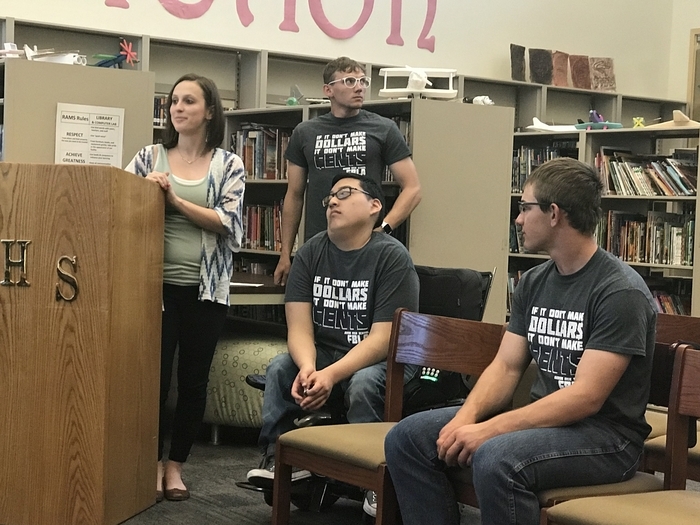 These students finished in the top 1% in the nation of more than 1.6 million students who took the test. We are proud of you! 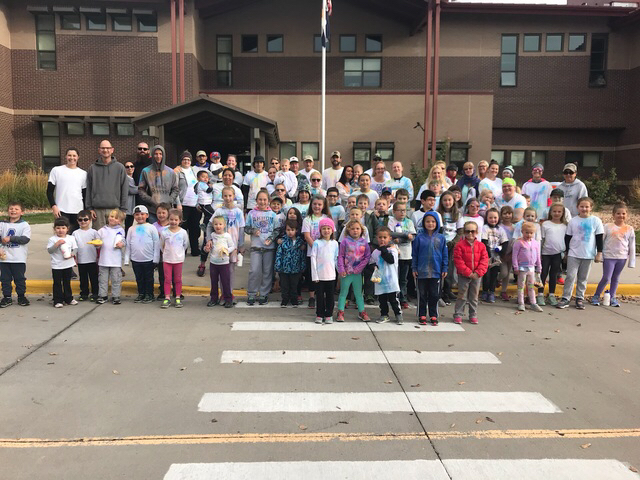 Thank you to everyone who came out and supported our color run! 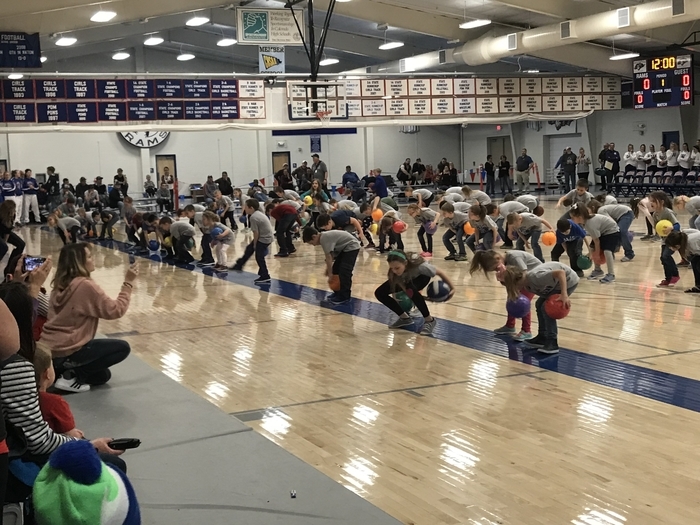 It is a great event for our school and community. Go Akron! 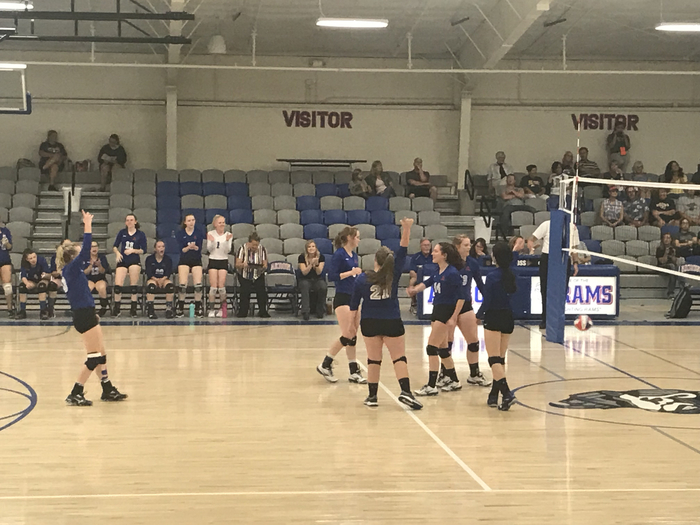 Our Akron Lady Ram volleyball team jumped out early on the visiting Merino Lady Rams before falling 3-1 in some very competitive matches in their homecoming game. Go Rams! 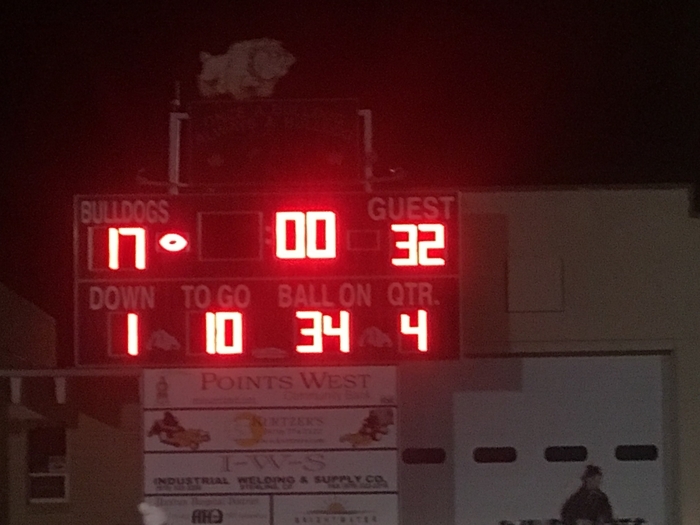 Our Akron Ram football team picked up a big win at homecoming against a good Merino squad. Akron scored late in the fourth quarter to win 26-21. Nice job Rams! 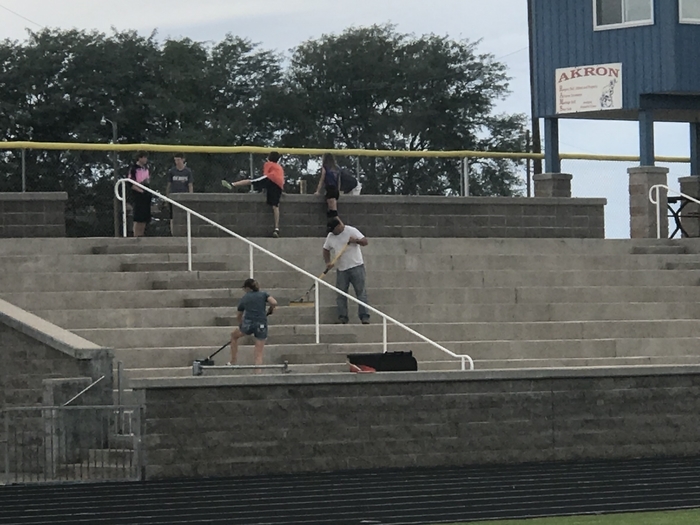 Akron High School students took part in a school and community clean up during homecoming week for community service. Great job Rams! 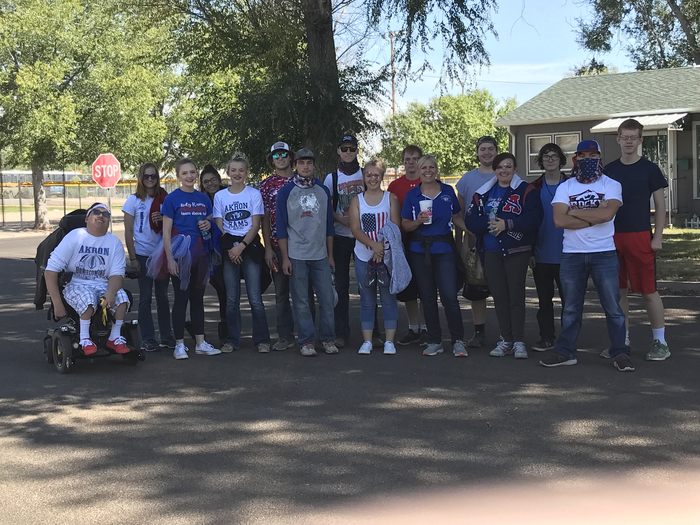 ATTENTION RAM FANS: North Colorado Med Evac is delivering the game ball for the Homecoming football game against Merino Friday night at 7:25. Pregame activities will be 10 minutes earlier than normal starting with the National Anthem being played at 7:10. GO BIG BLUE! Parent/Teacher Conferences will be Thursday, October 4th from 4:00 – 8:00 PM and Friday, October 5th from 7:30 – 11:30 AM. Please call to schedule conferences PS-6th 345-2266 and 7th – 12th 345-2268. 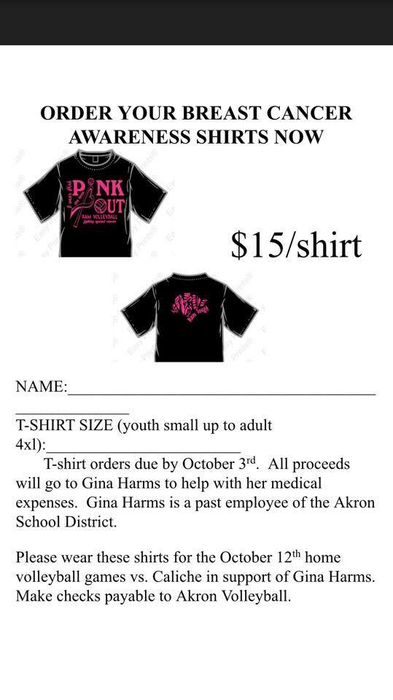 The Akron Volleyball Team is selling Pink Out shirts for the game against Caliche on October 12. Contact a volleyball player or coach if you would like a T-Shirt. All proceeds will be going to Gina Harms. Orders due Oct. 3rd. 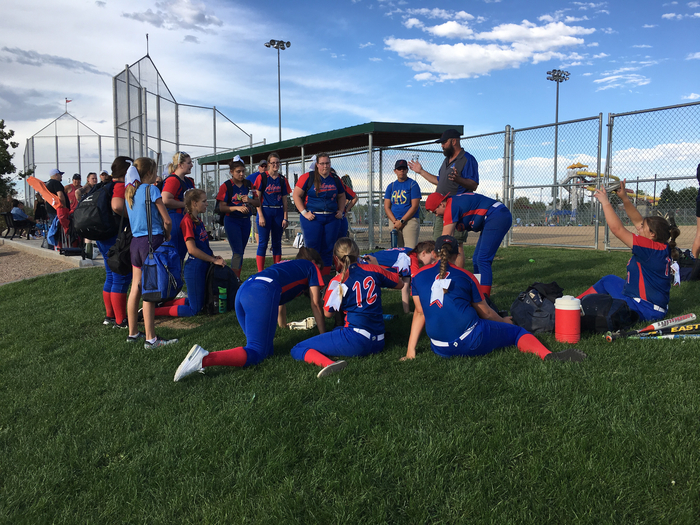 Our Akron Lady Ram softball team played at home last night against the Yuma Lady Indians. The Rams came from behind to get a 31-24 win in the first game. The second game went just 3 innings and the Indians came out on top 20-5. Last night was also senior appreciation. Go Rams! 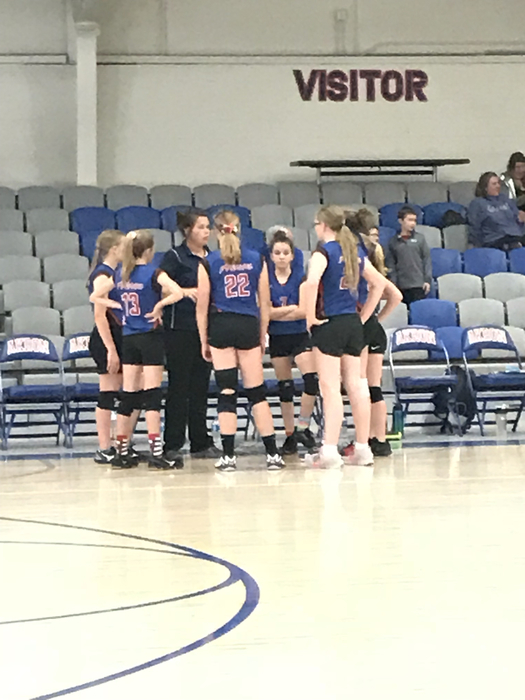 Our Akron JH volleyball teams played well last night at home against Caliche. All three teams picked up wins last night. Go Rams! 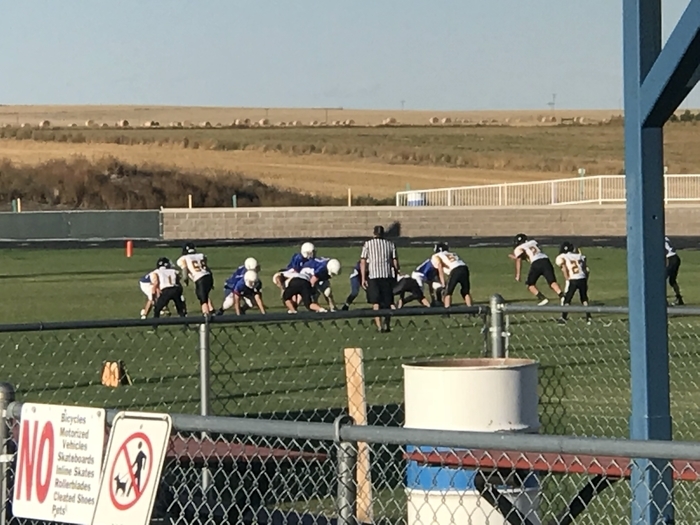 Our Akron JH football team took on the Caliche Buffaloes last night at home. The Rams played tough but Caliche got the win 26-8. The FBLA car wash scheduled for this Friday has been cancelled and removed from our activity list. 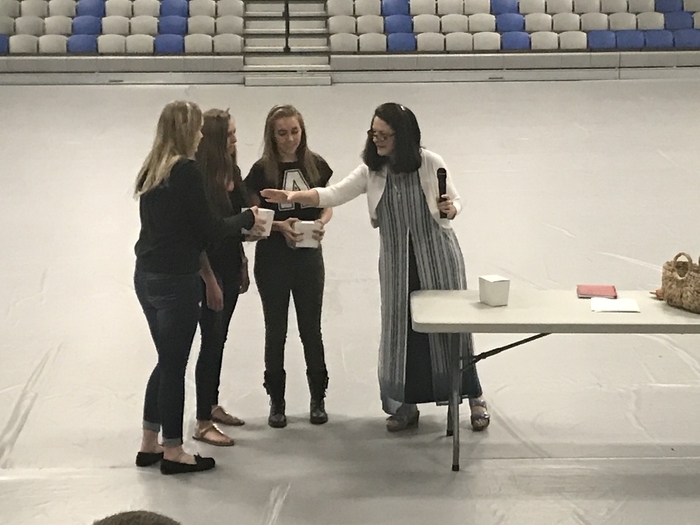 The FBLA breakfast on Friday morning (7-9 a.m.) at the field house is still scheduled to take place. 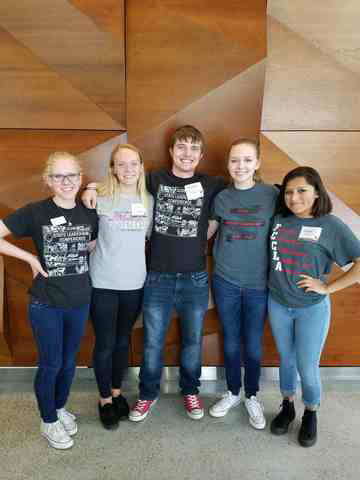 Akron FCCLA students were at the Colorado CTSO Kickoff held at CSU in Ft. Collins on Monday. 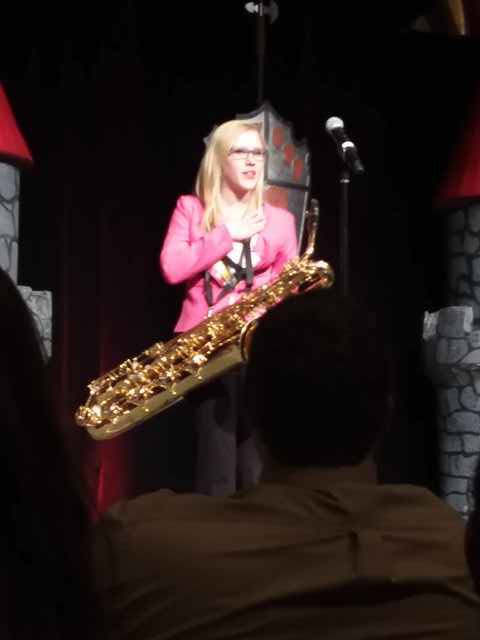 The second picture is of Cheyenne McGuire FCCLA State 1st Vice President. The Akron Lady Ram volleyball team finished 2nd at the Akron Volleyball Invite last Saturday. Go Rams! 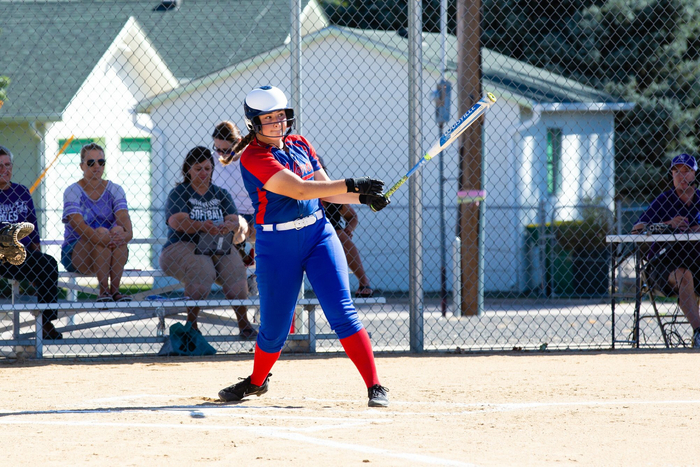 The Akron Lady Ram softball team played the Holyoke Lady Dragons last Saturday. The Dragons picked up wins in both games of the doubleheader despite a good effort from the Rams! 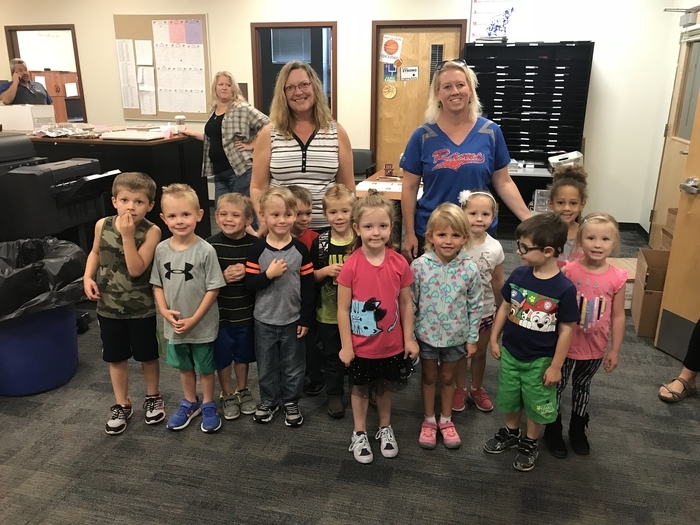 Mrs. Blake and Mrs. Couch brought their preschool students down to the office to lead the school in the Akron Ram fight song last Thursday. Go Rams! 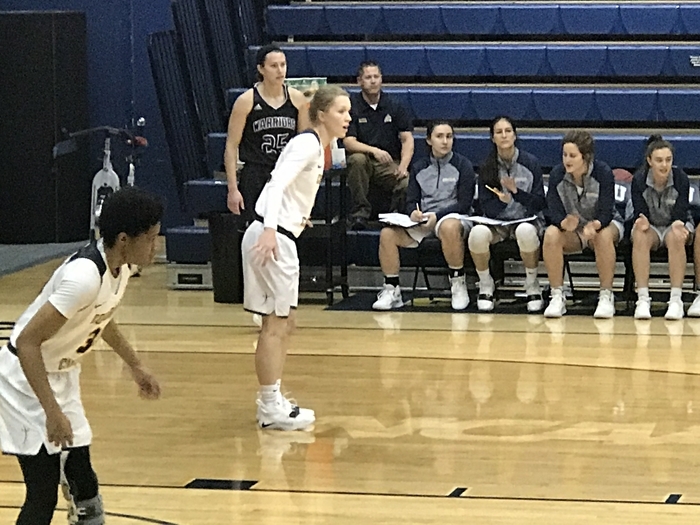 Colorado Preps Magazine has a nice article on Akron’s Shawn and Kilee Randel. 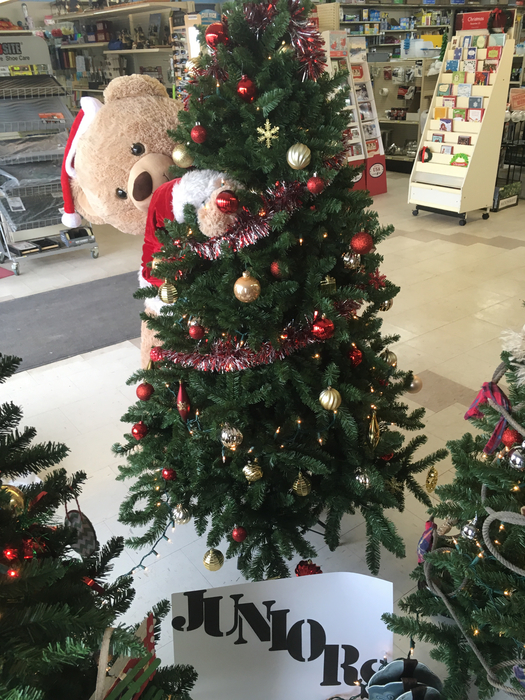 You can find the magazine at JD’s Quick Stop, Bank of Colorado, and the Akron School. Go Rams! 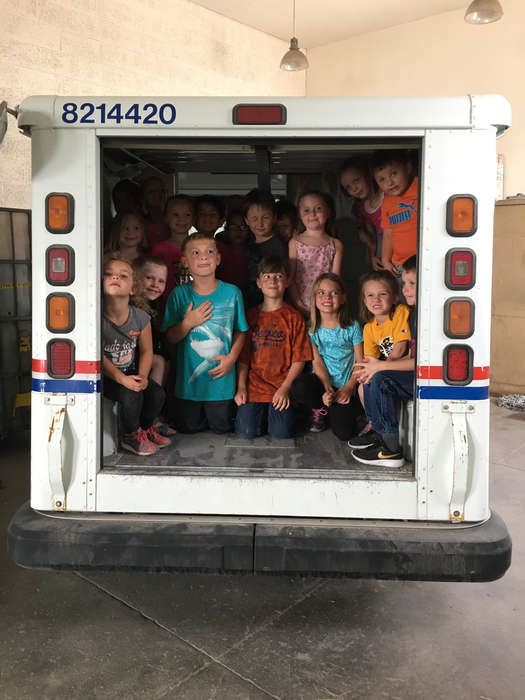 Kindergarten students from Mrs. Poss and Mrs. Davisson’s classes went on a walking field trip in Akron on Wednesday. 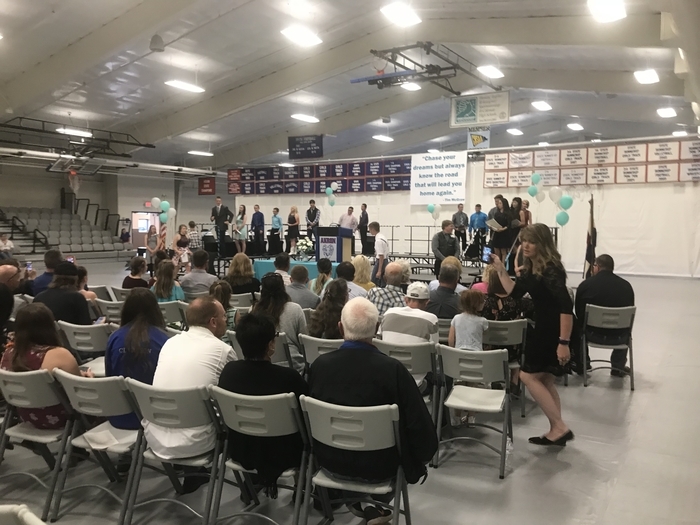 Thank you to everyone who made this a special day for our students. 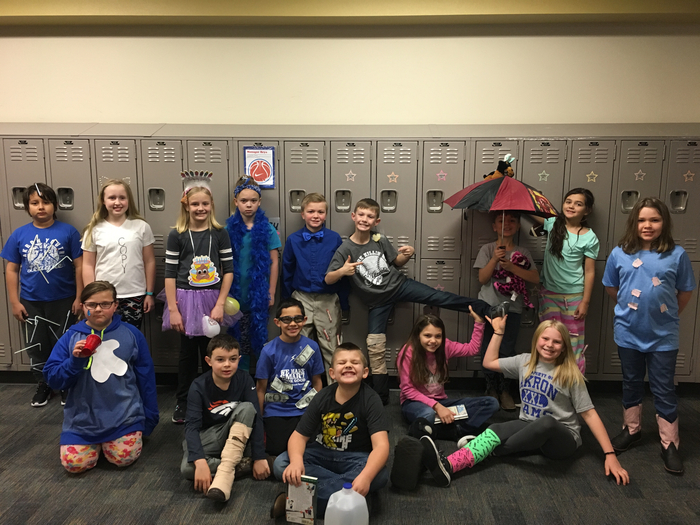 See the NEWS section for Homecoming activities and elementary dress up days! 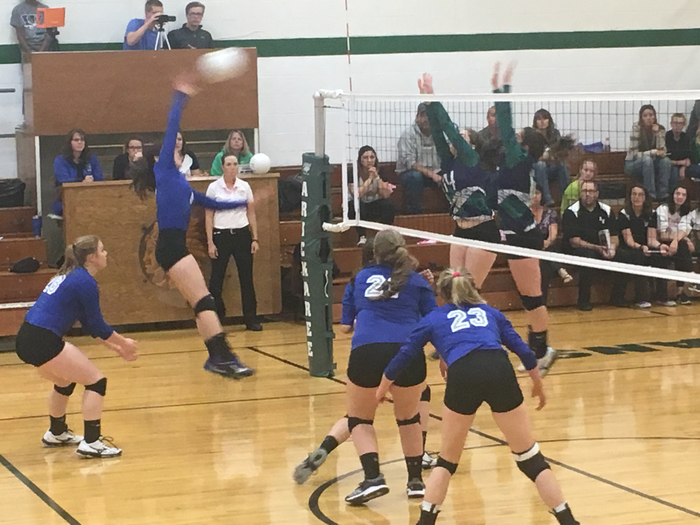 The Akron Lady Ram volleyball team lost a close contest tonight against Holyoke 3-2. Keep improving Rams! 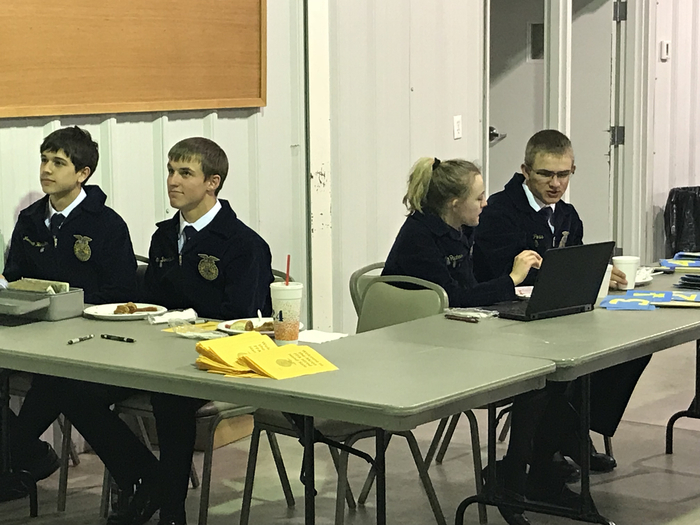 FFA Northeastern Regional Range Judging Out of 10 teams Akron placed 3rd overall. Individual awards went to Kacyn Kessinger and Nadalyn Poss in the Silver category. 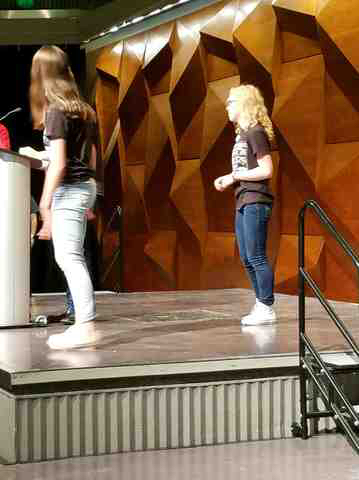 Mariah DeMers and Grayson Pachner in the Gold category. State Range will be October 3rd in Sterling. 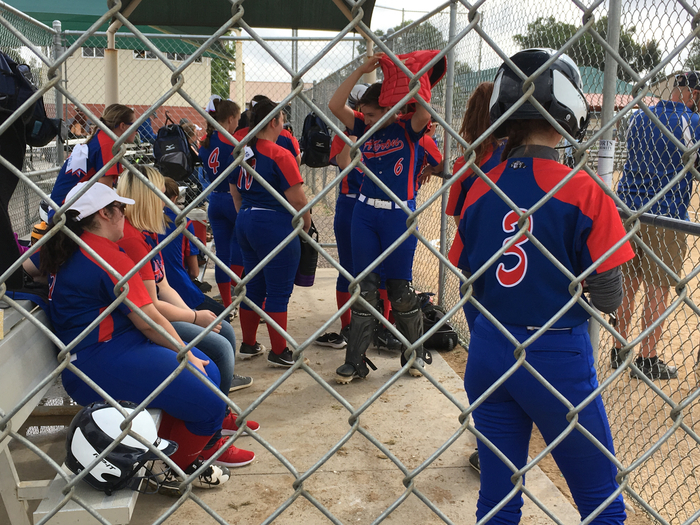 The Akron Lady Ram softball team played well on Saturday but lost both games of their doubleheader against Wray. Go Rams! 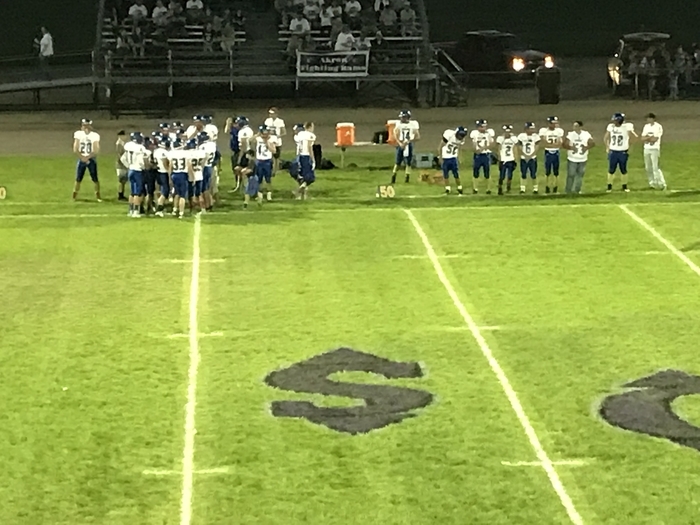 The Akron Ram football team played tough against the top ranked Sedgwick County early before losing 42-6. Keep working to get better every day Rams! 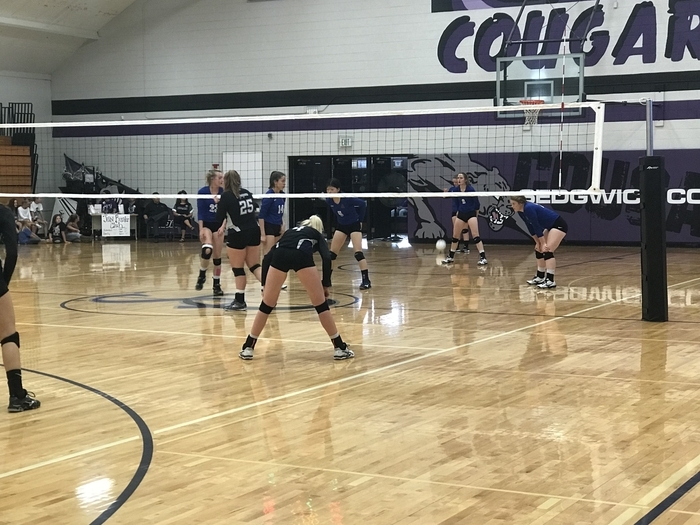 The Akron Lady Ram volleyball team beat the Sedgwick County Lady Cougars 3-2 Friday night. The Akron Lady Ram volleyball team lost to top ranked Yuma in three Thursday but played very well. Results: 21-25, 18-25, and 17-25. Good job Rams! The Akron Ram J.H. 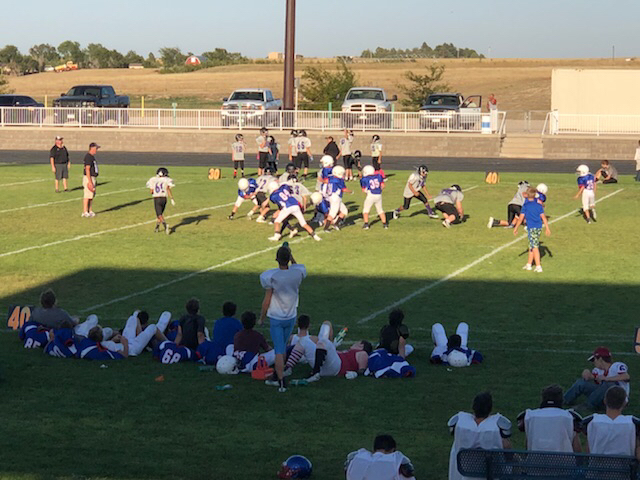 football team played the Sedgwick County Cougars last Thursday. 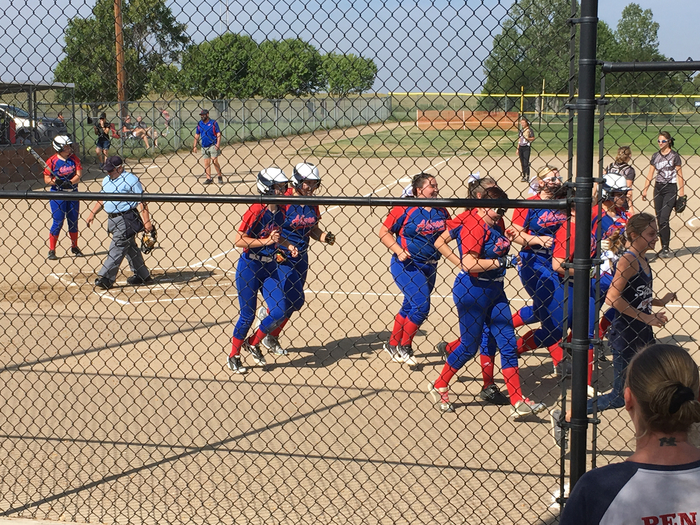 Sedgwick won 14-0. Good game Rams! 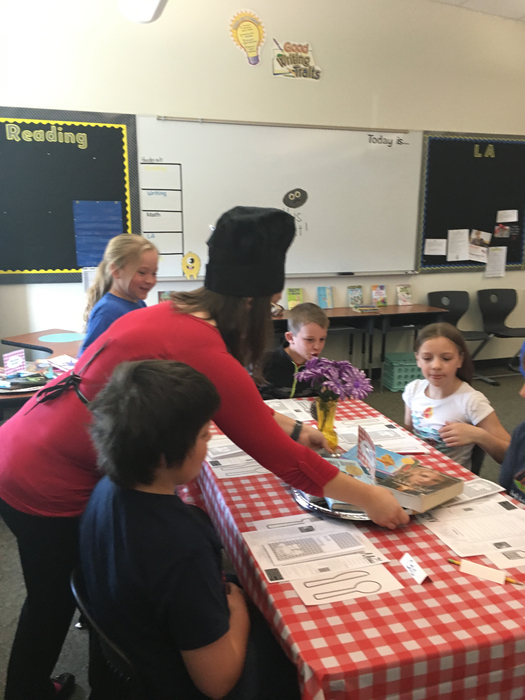 Mrs. Weis and Mrs. Vogt put on a book tasting for their third grade classes last Thursday. 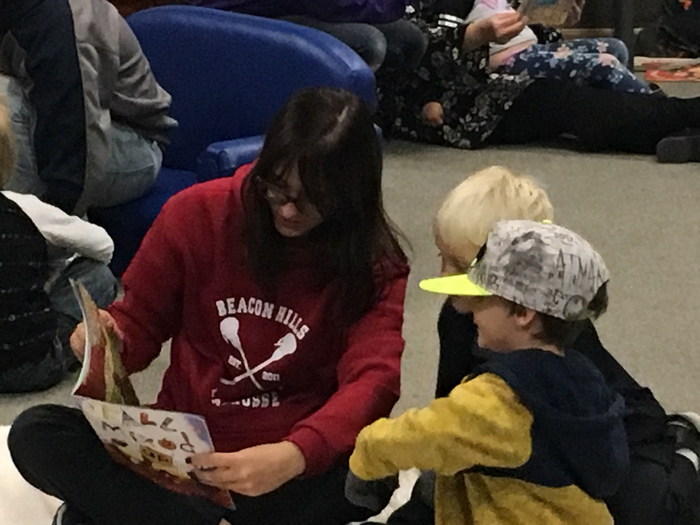 The kids enjoyed sampling the different books. The Akron J.H. 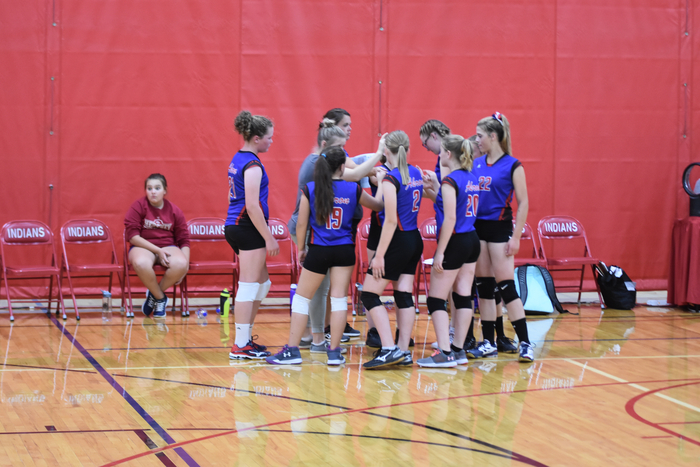 volleyball team played at Yuma on Tuesday. 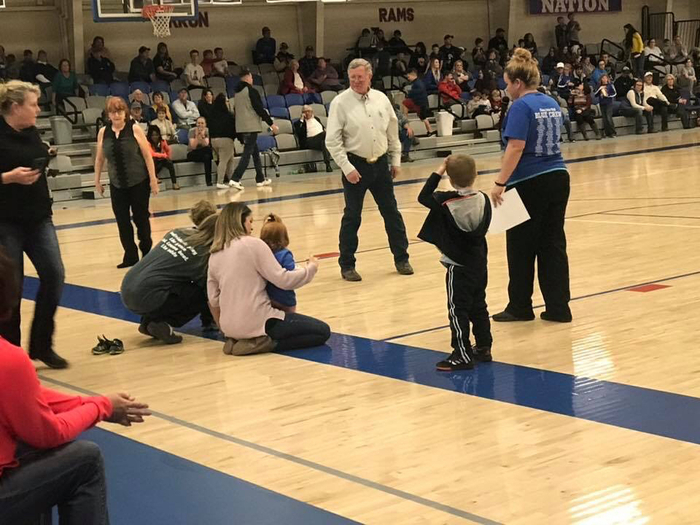 The Rams won the “A” game contest. 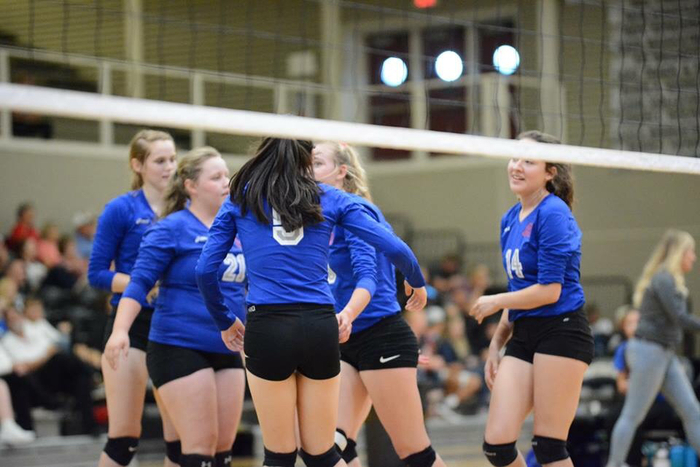 Our Akron Lady Ram volleyball team had a very good day at the NJC Tournament. 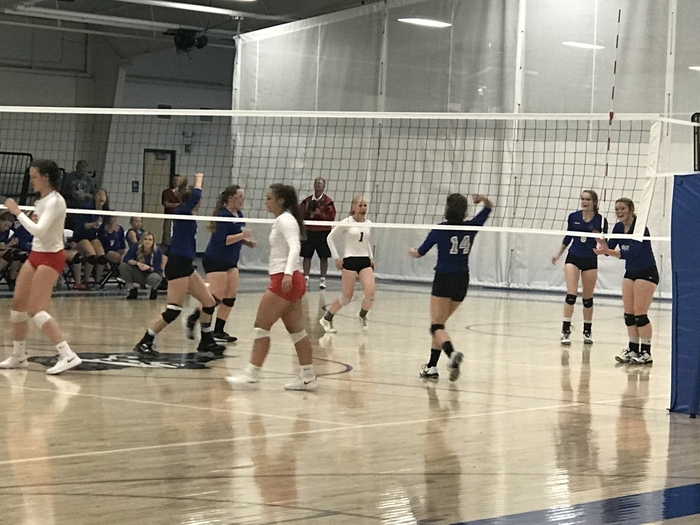 Akron over Holyoke in three: 26-24, 25-19, 25-21 Akron over Dayspring in three: 25-21, 25-18, 25-23 Akron over Heritage Christian in four: 25-23, 26-24, 16-25, 25-21. Otis over Akron in the championship in three: 18-25, 13-25, 21-25 Great job players and coaches! Go Rams! 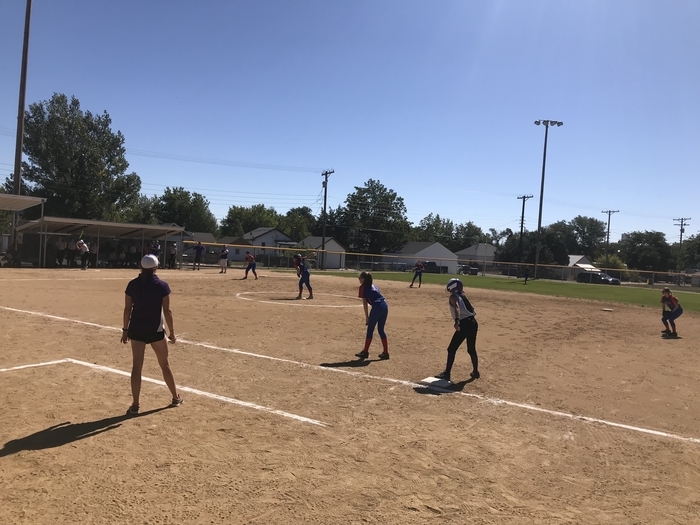 The Lady Ram softball team competed in the Brush Tournament on Friday and Saturday. 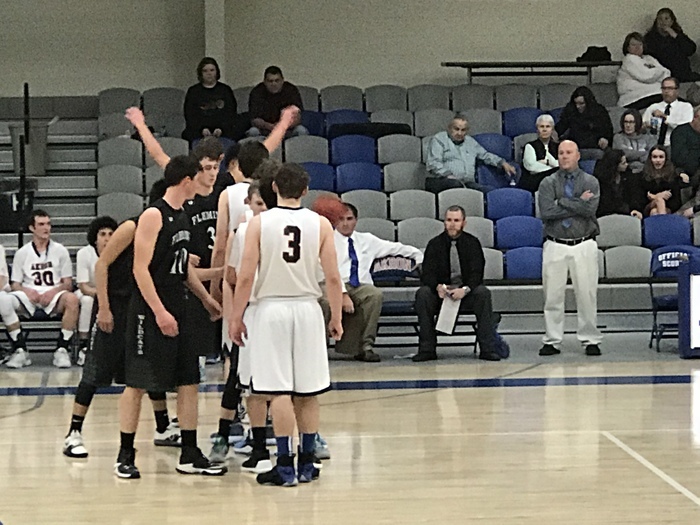 The Rams didn’t pick up a win but put forth a good effort in each contest. Go Rams! 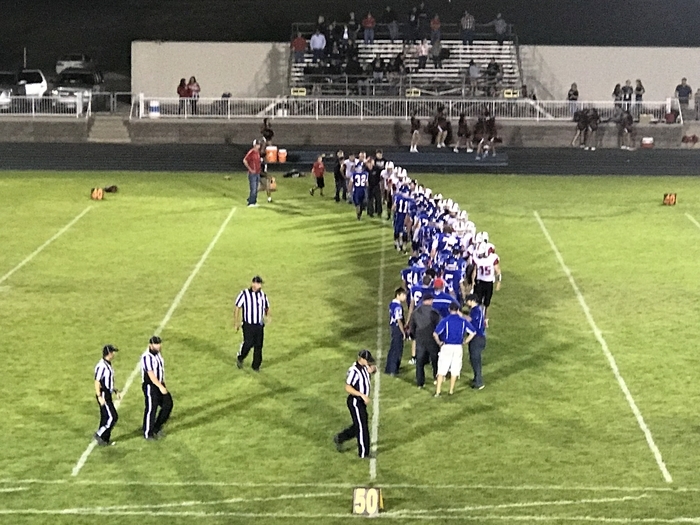 The Akron Ram football team lost a tough game on the road at Fowler Friday night 28-20. J.H. 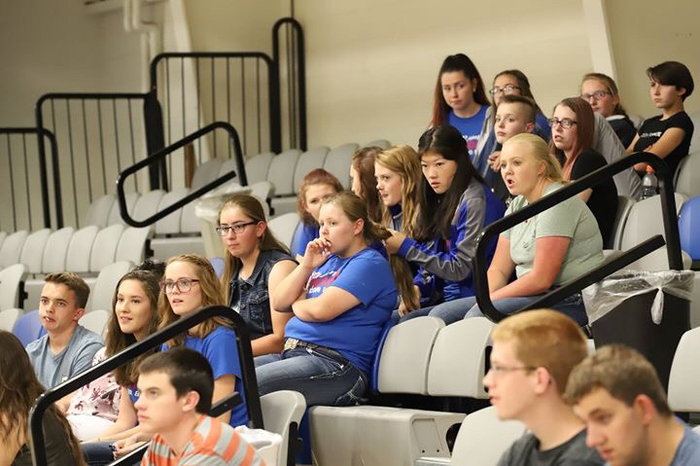 volleyball and football had their first contests against Haxtun on Thursday. 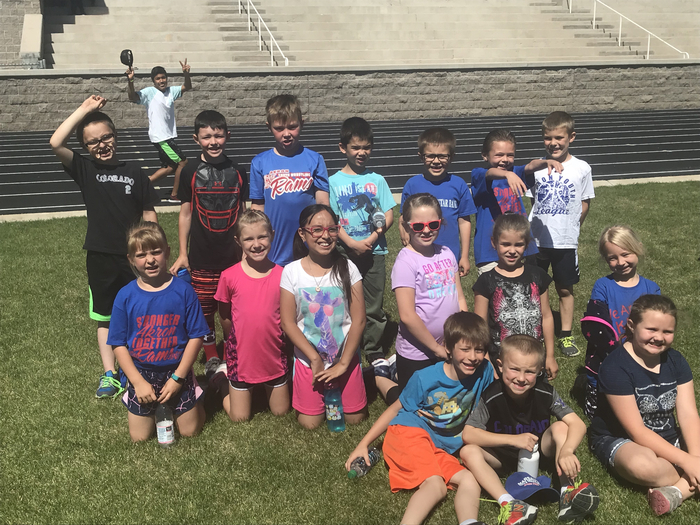 First Big Buddy Little Buddy activity held this week. Akron H.S. 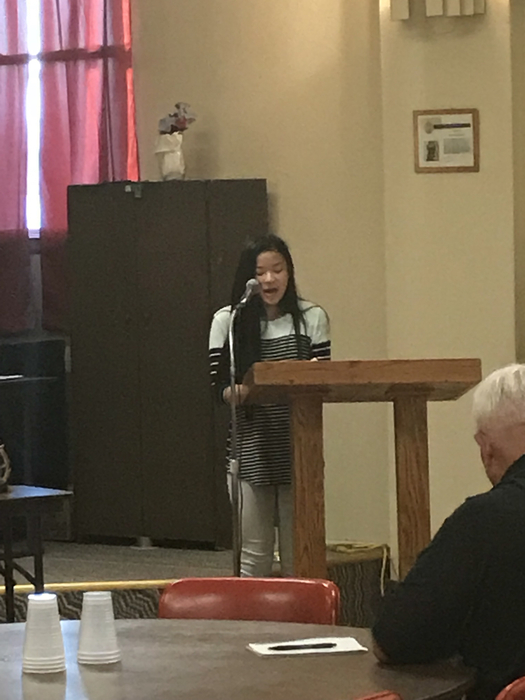 Student Council speeches and elections were held last week. 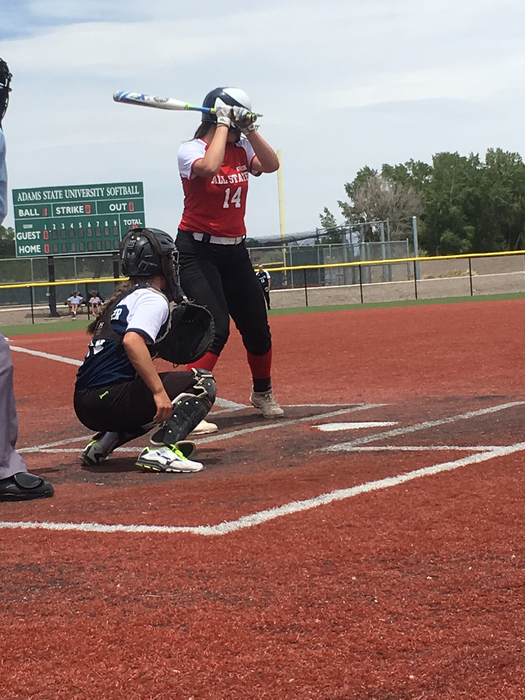 The Akron Lady Ram softball team won three out of four games last weekend at the Sheridan Tournament in Denver. Congratulations to our players and coaches. Go Rams! The Akron Ram football team won a close contest against Holly on Friday night by a score of 8-6. Go Rams! The Akron Lady Ram volleyball team defeated Holly on Friday night 3-1. Go Rams! 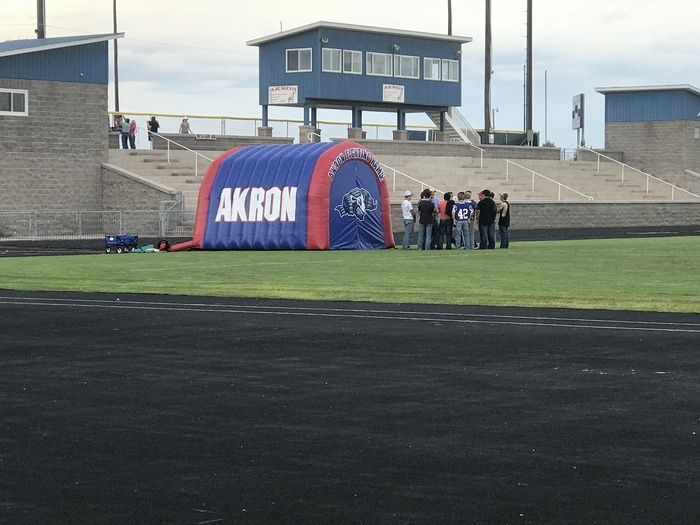 The Akron Booster Club organized a “Spruce up the Field” night last week. 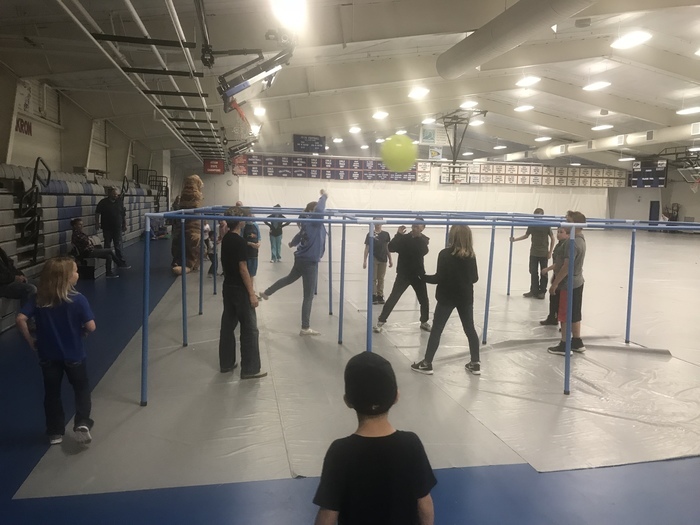 Thank you to everyone who helped with this event! The Akron Lady Ram volleyball team started strong but came up short tonight against a good Wiggins team 3-1. Go Rams! 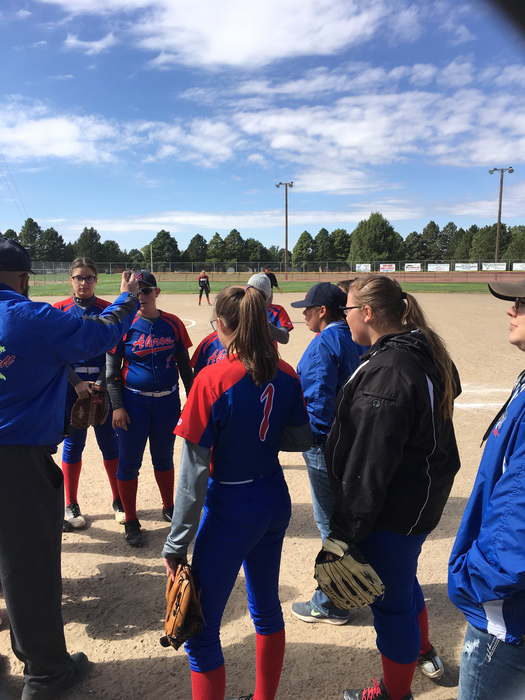 The Akron Lady Ram softball team traveled to Limon for a doubleheader against the Lady Badgers. The Rams lost both games but had several bright spots in each contest. Go Rams! The Akron Ram football team traveled to Springfield on Friday and came away with a 34-8 victory to start their season. 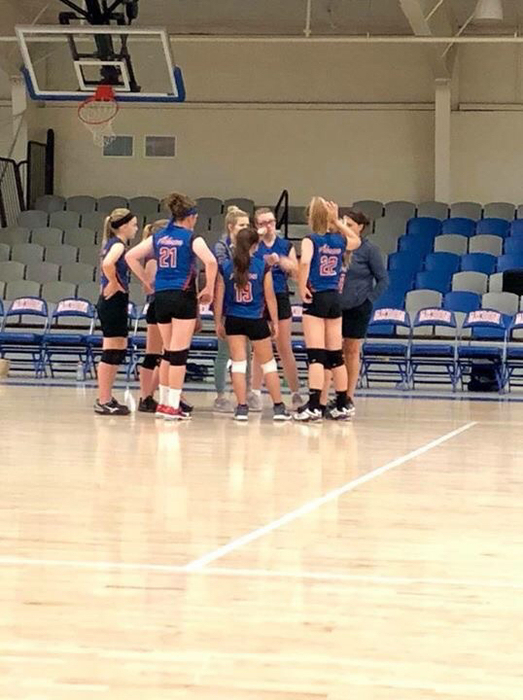 The Akron Lady Ram volleyball team started their season by defeated the Wray Lady Eagles 3-1 last Thursday night. Reminder: The first day of school for 6th - 12th grade is tomorrow Wednesday, August 15th. Preschool - 5th grade will start on Monday, August 20th. 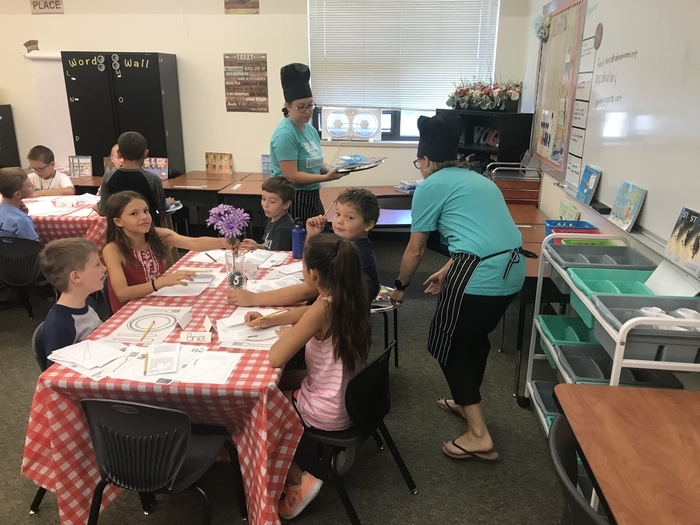 Breakfast is served starting at 7:20am, and classes begin at 7:50am. 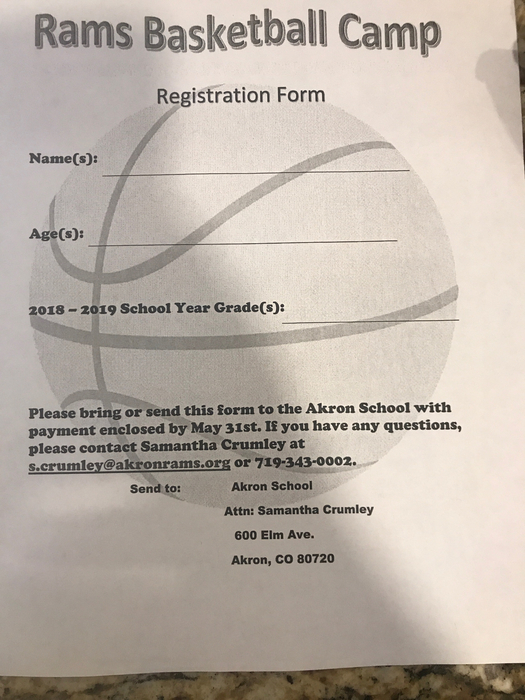 Akron School will host our registration Thursday 8/9/18 from 8:30 am - 12:30 pm for all grades. 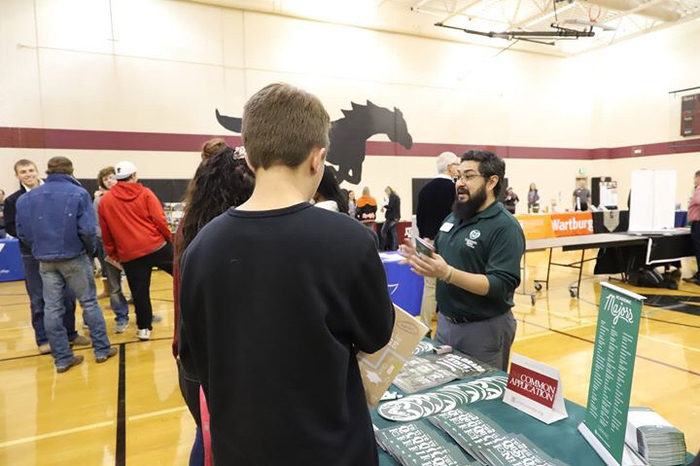 Please come pick up your registration packet from the main entryway (from 8:00am - 4:00pm) prior to registration so updates can be made and the registration process will be smooth. 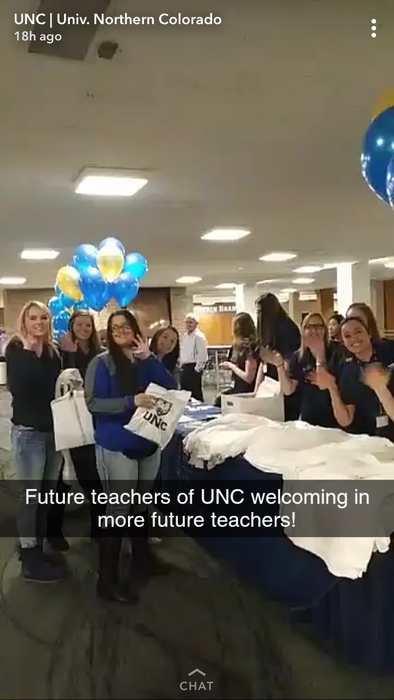 The 2018-19 school year is almost here! Registration packets will be available starting Wednesday, August 1st just outside the school office past the entryway. Registration will be Thursday, August 9th from 8:30 a.m. - 12:30 p.m. for all grades. *The first day of school for grades 6th thru 12th will be August 15th. *The first day of school for grades pre-school thru 5th will be August 20th. Student handbooks will be sent electronically. Printed copies will also be available upon request. We look forward to seeing you. Go Rams! 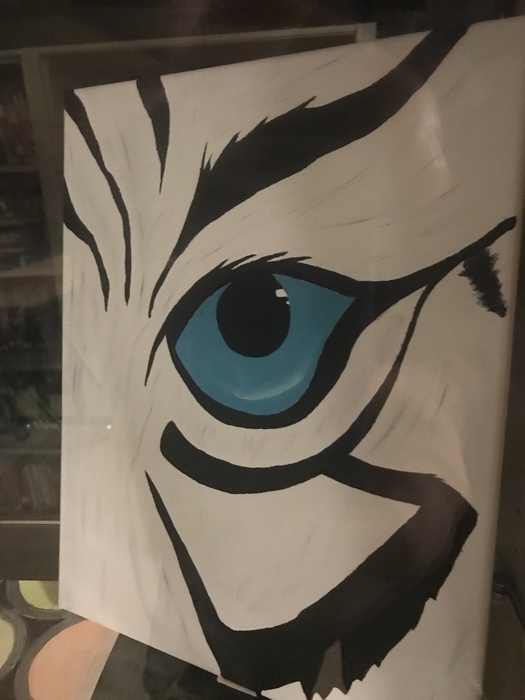 The 2018-19 school year is almost here! Registration packets will be available starting Wednesday, August 1st just outside the school office past the entryway. Registration will be Thursday, August 9th from 8:30 a.m. - 12:30 p.m. for all grades. Student handbooks will be sent electronically. Printed copies will also be available upon request. We look forward to seeing you. Go Rams! 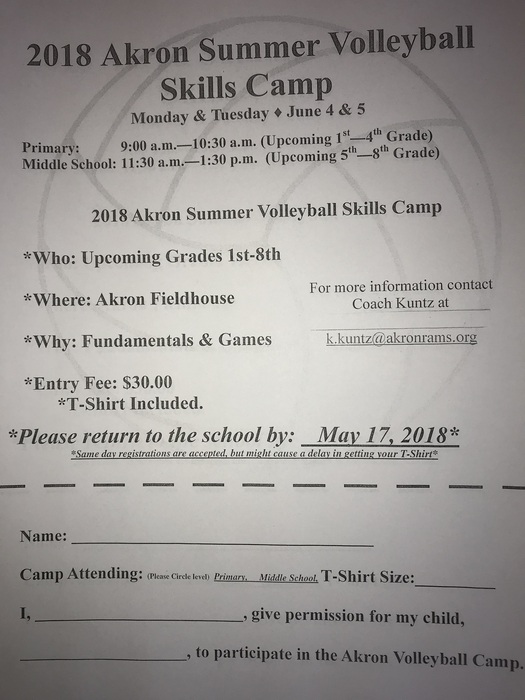 Attention Akron H.S. Volleyball Athletes Practice will start on Monday, August 6th. Practice times for August 6-8 will be 6:30 a.m. - 9:30 a.m. Practice times will change to the afternoon on August 9th moving to 4:30 p.m. -7 p.m. Looking forward to a great season Lady Rams!! 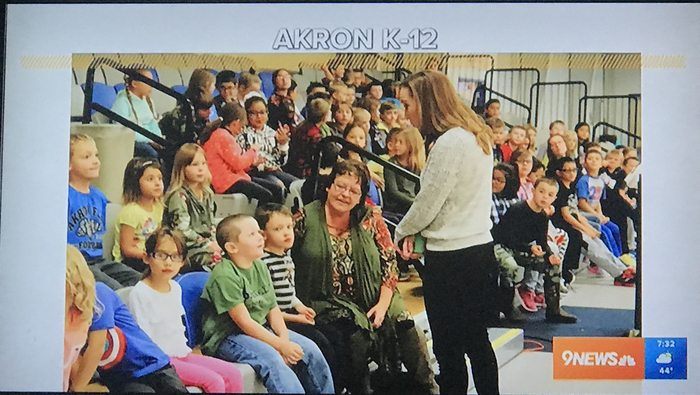 The Akron School District is a Healthy School Champions recipient again this year. 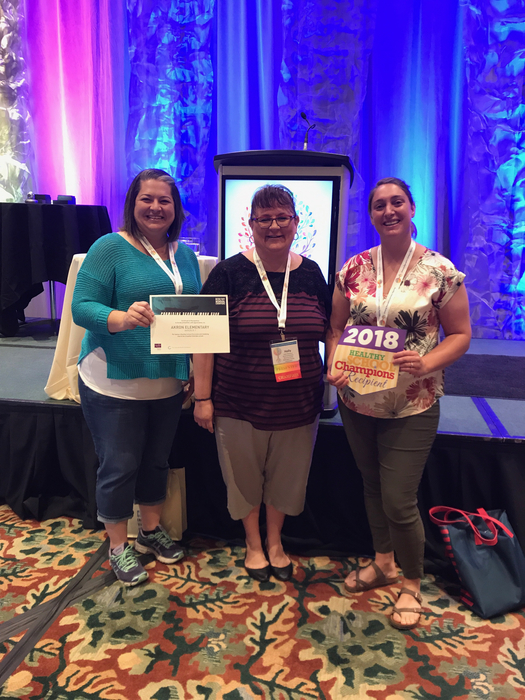 Pictured below are Amy Farmer (Akron PTSO), Holly Thompson (Washington County Connections), and Meghan Camacho (Akron School District). Thank you to everyone who works together to make this possible! 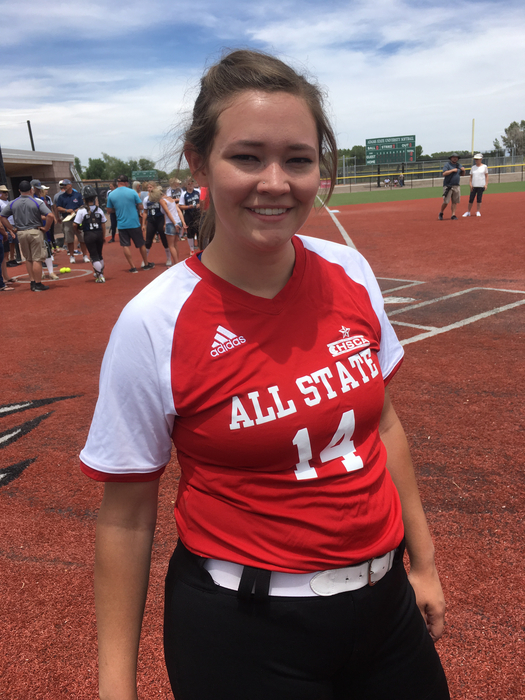 Akron Ram Katie Arnold played her final high school softball game at the CHSCA All-State games in Alamosa, CO yesterday. 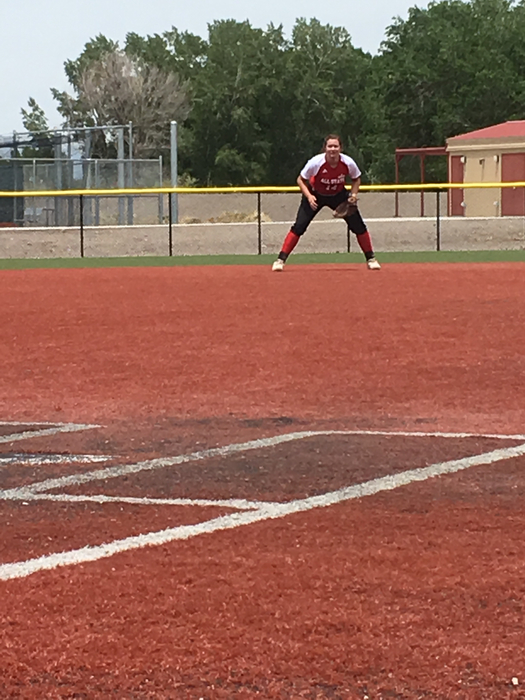 Katie played catcher, left field, short stop, and third base on defense. At the plate she got on base two out of three times, scored once, and drove in a run. Her team won 10-5. Congratulations Katie! 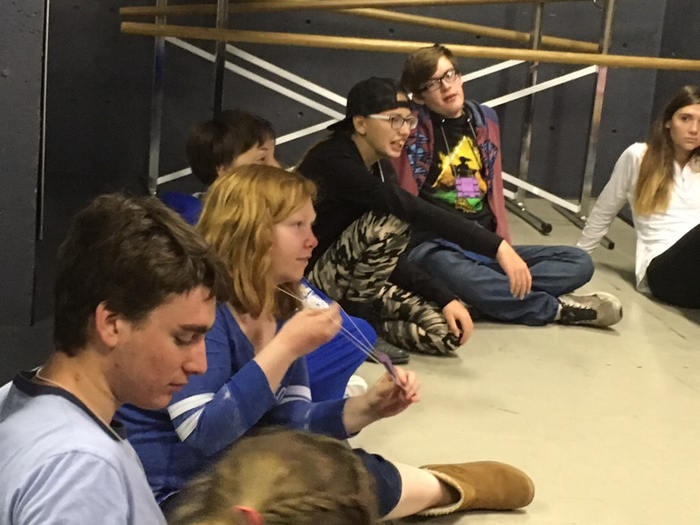 Pictures from the Gifted and Talented Ultimate Scavenger Hunt. 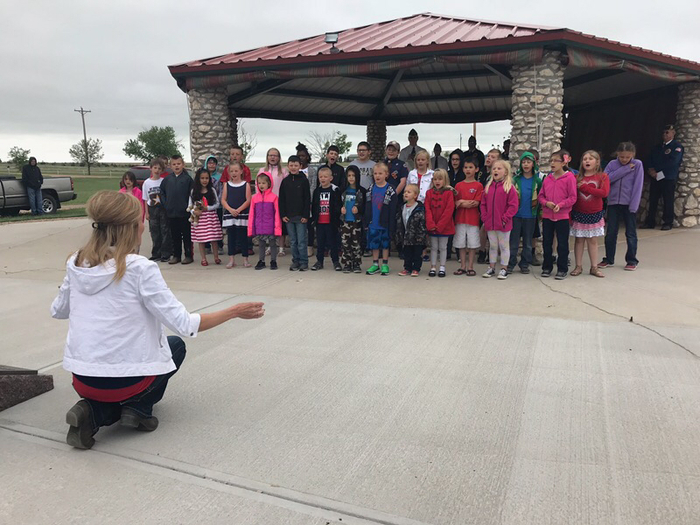 Ms. Sue Hellyer led a group of Akron PK-4th grade students as they sang today at the Memorial Day service held at the Akron Cemetery. 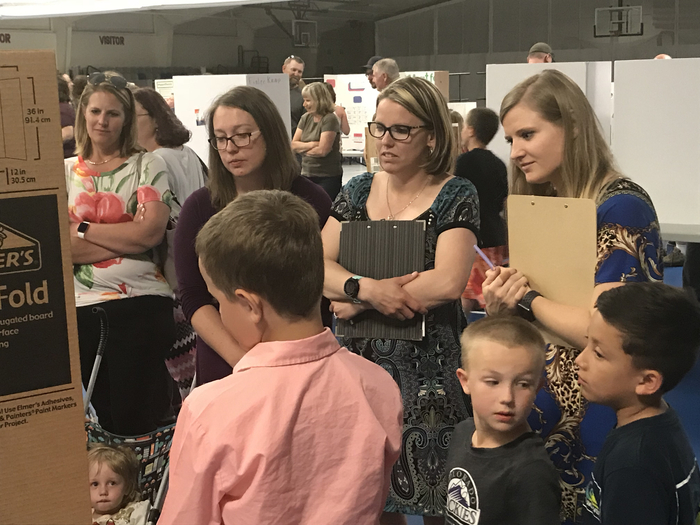 Thank you students, staff, and parents for a wonderful 2017-18 school year. Have a great summer! 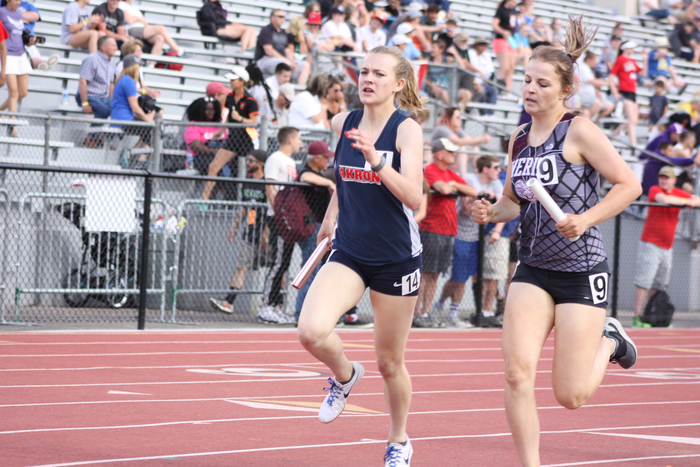 Pictures and results from the first day of State Track. 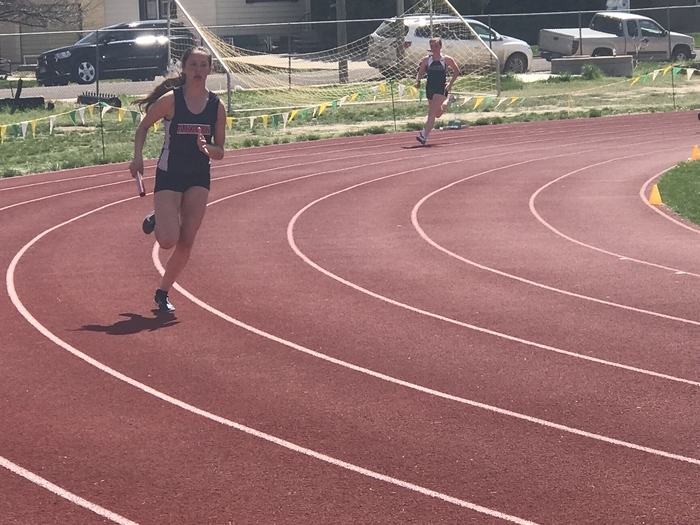 Sara Wylie placed 3rd in the high jump with a season best 5’ jump, Tyler Wylie qualified for the finals on Saturday in the 100, 200, and 400, and the Akron girls 4x800 team finished 14th. Good job Rams and best of luck tomorrow in your events! 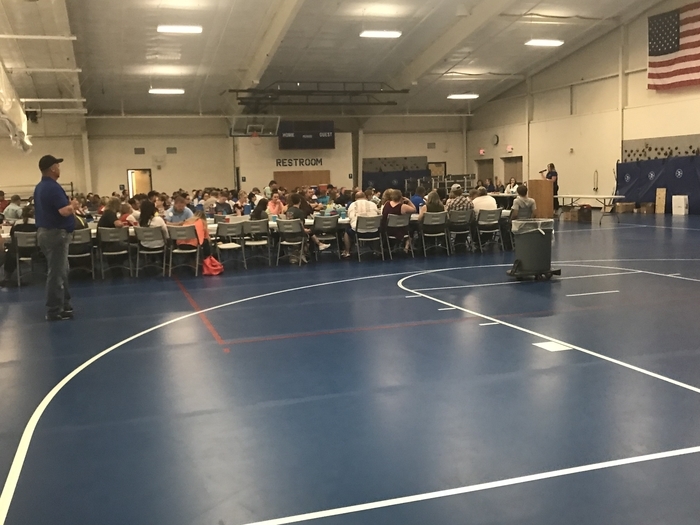 The Akron Booster Club Athletic Awards Night was held last night in the fieldhouse. 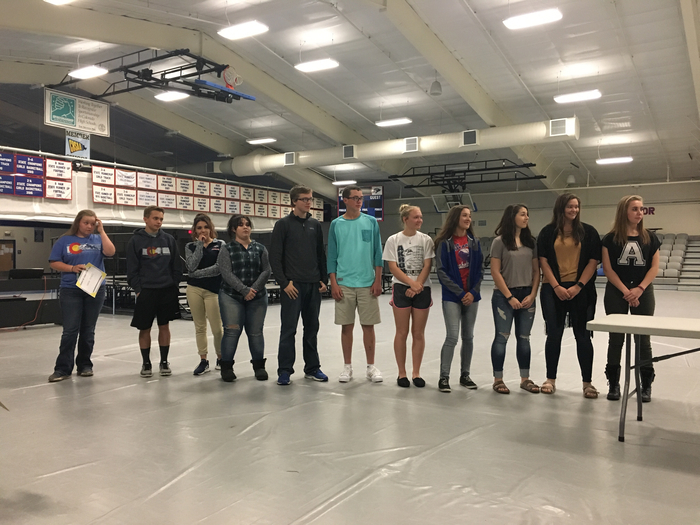 All sports were recognized and athletes were recognized for playing multiple sports and being scholar athletes. Tyler Wylie was selected for the Megan Hicks Award. Congratulations student athletes and coaches! 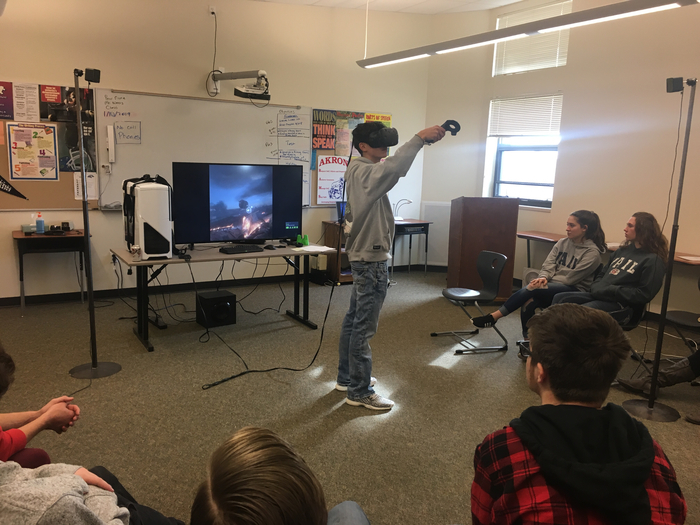 Pictures from 8th Continuation and J.H. Awards held Tuesday night in the field house. Congratulations! 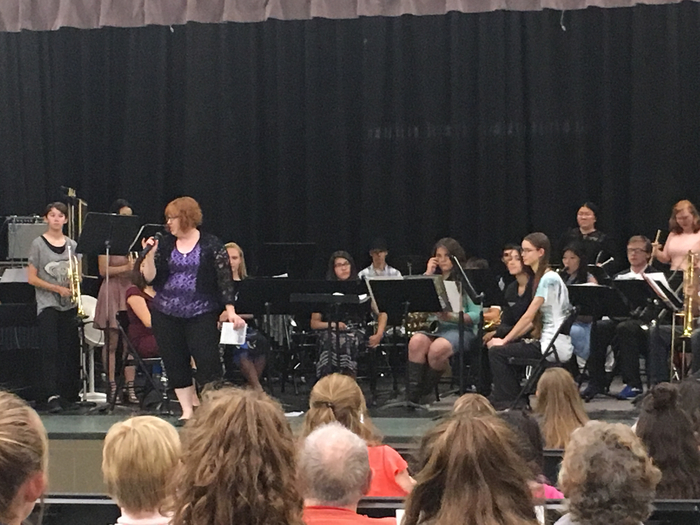 Congratulations to Ms. Lowry and her 7th-12th grade band students on a wonderful spring concert performance. Great job! Akron senior Sarah Clarkson was awarded the Akron Alumni Scholarship at the alumni banquet this past weekend. Congratulations Sarah! 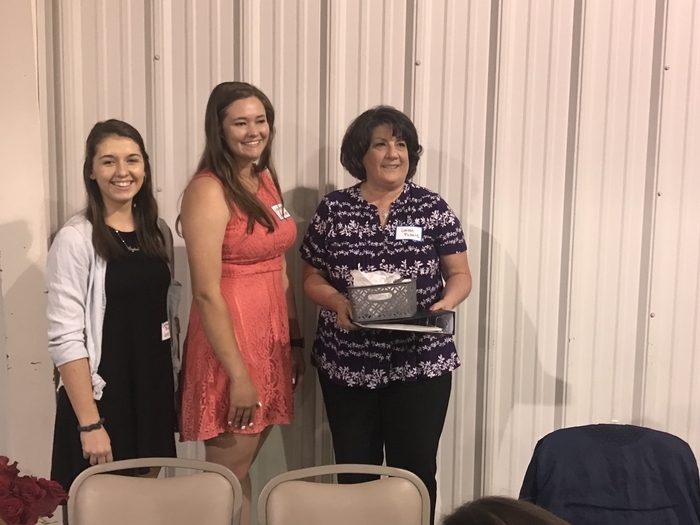 Akron High School Teacher Denise Pickens was selected by the Akron High School Class of 2018 as their Honorary Alumni member. Thank you for for your dedication and commitment to the students of the Akron school system. Congratulations! 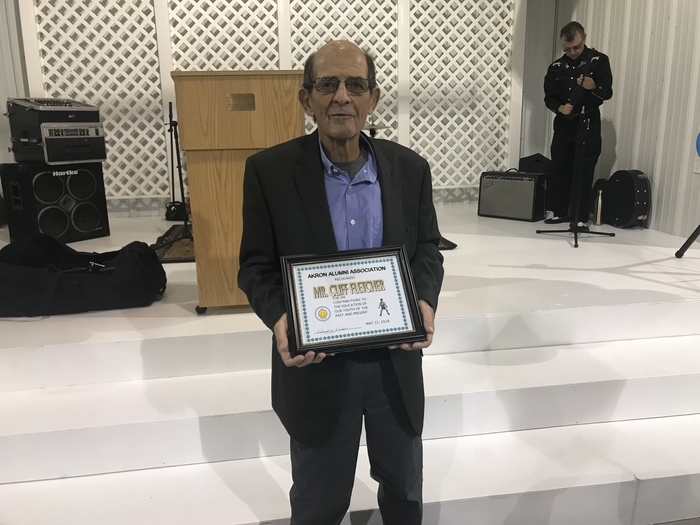 Mr. Cliff Fletcher received the 2018 Akron Alumni Retired School Employee Award. 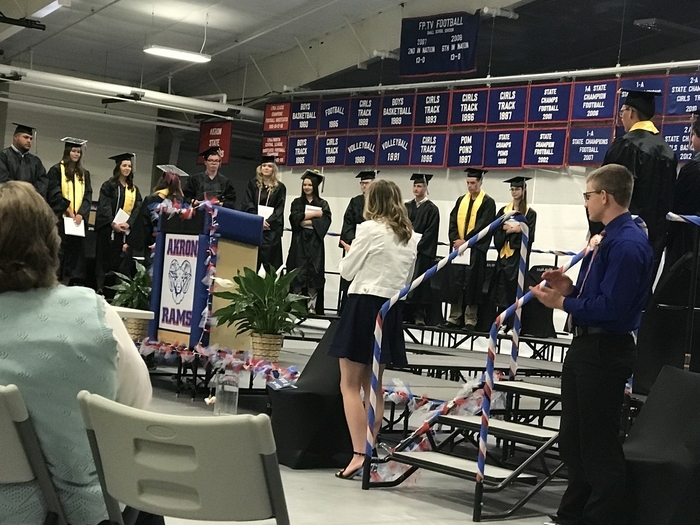 Cliff received a standing ovation from those in attendance for his many years of service to the school system and the youth of our community. Congratulations Mr. Fletcher! 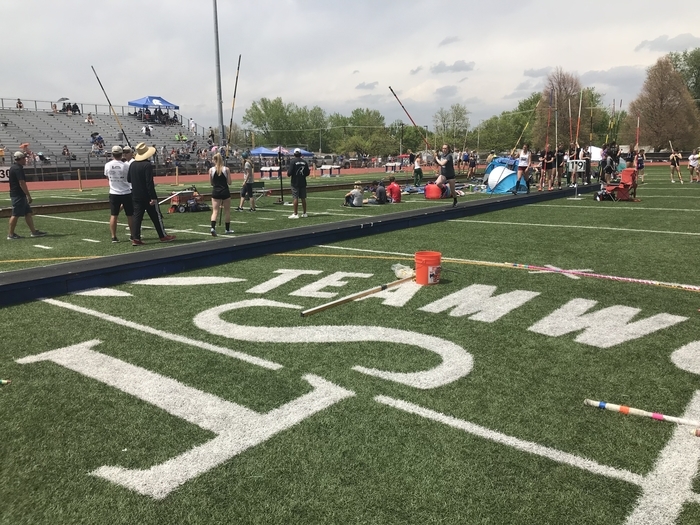 Akron Ram track athletes at the St. Vrain Invite in Longmont. 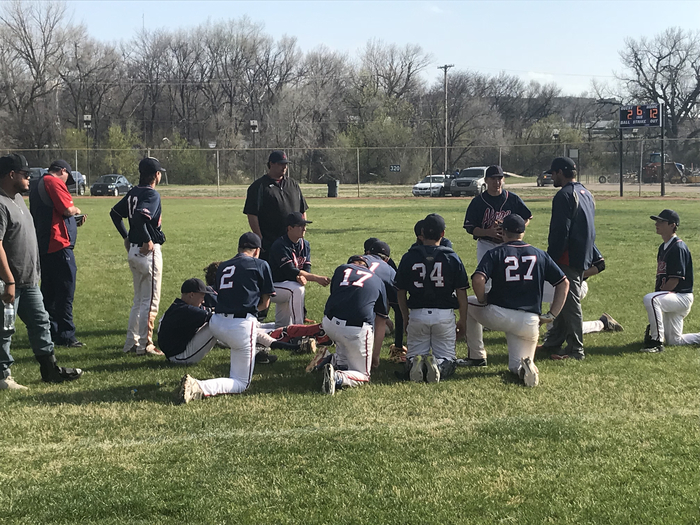 The Akron Ram baseball season ended on Friday in the first round of districts against top seeded Sedgwick County 20-6. The Rams lacked experience this season but battled in every game. Good job coaches and players! We are proud of you. Go Rams! 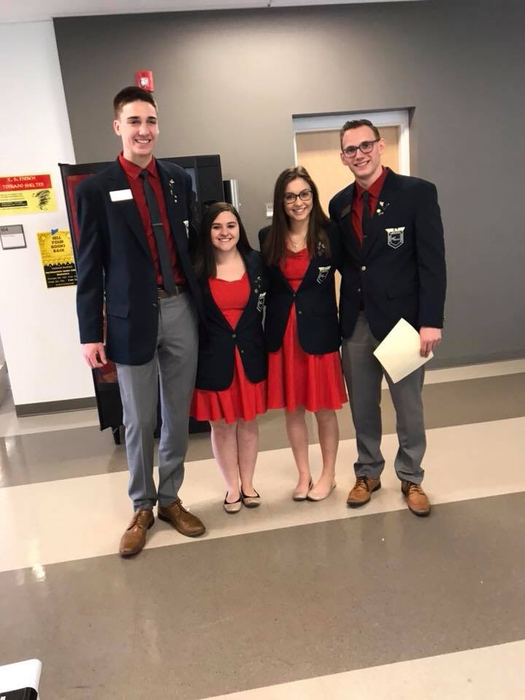 Akron FBLA Director Ali Houston and members of the organization that qualified for nationals spoke to the school board on Tuesday during the work session. 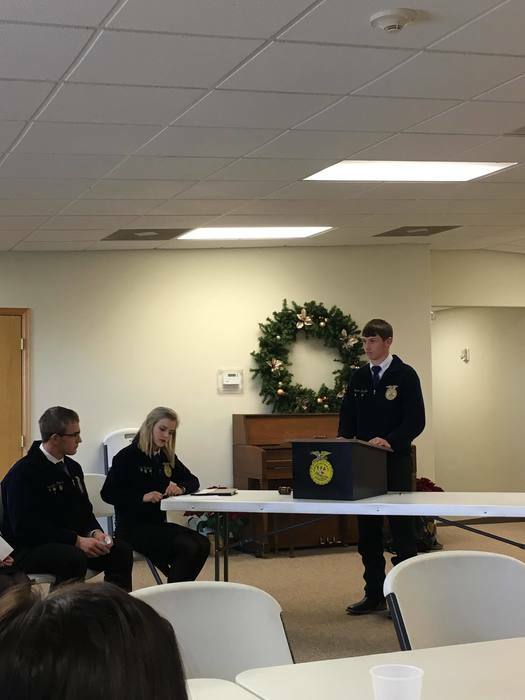 Tyler Wylie who served as FBLA State President this year spoke to the board about his experience this year. 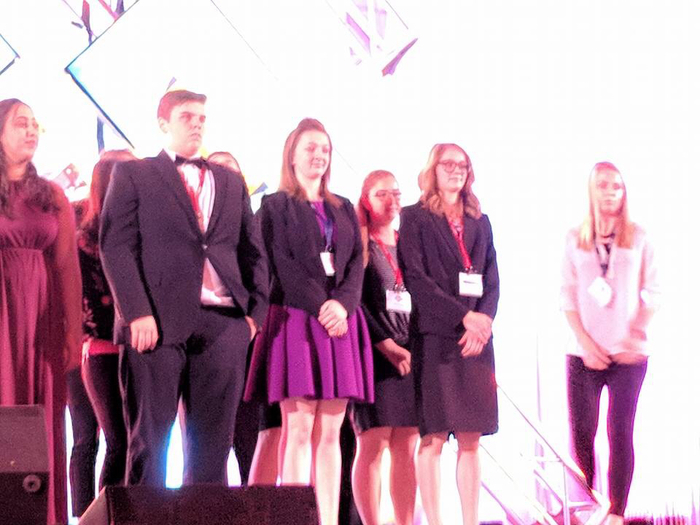 Akron FBLA is sending six qualifiers to National FBLA in Baltimore, Maryland. 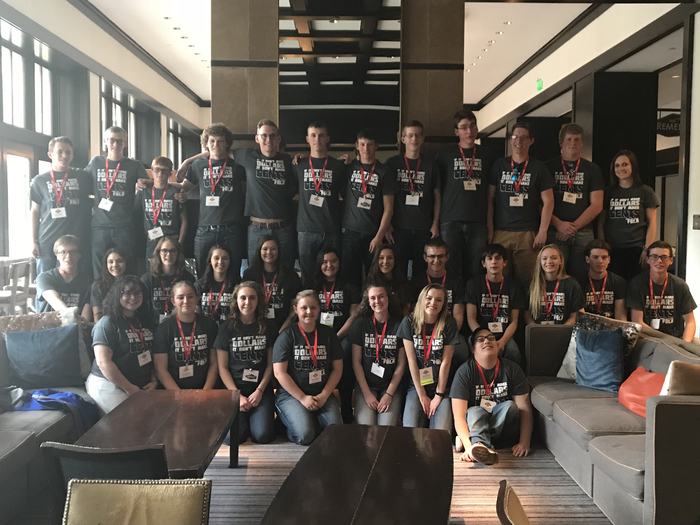 Thank you Akron FBLA and good luck at Nationals! 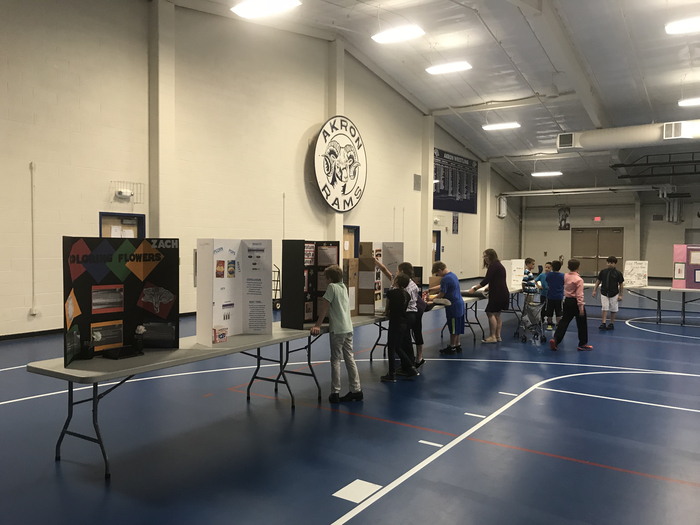 Akron 3rd and 4th grade Science Fair held tonight at the school. 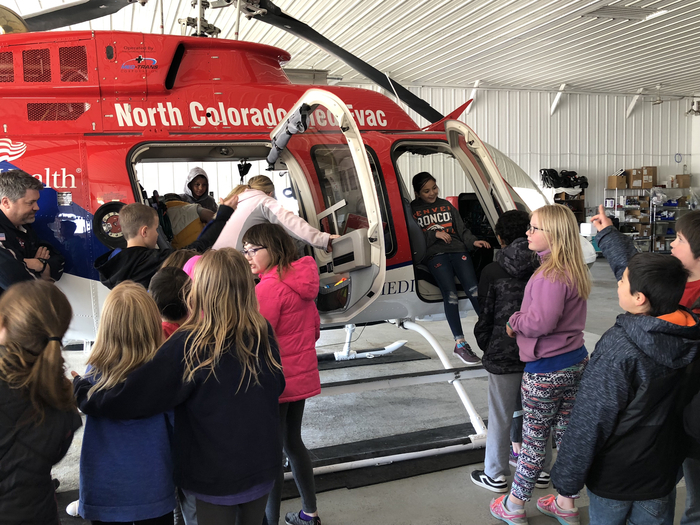 Akron Third grade students went on a field trip to I-Fly in Denver today. 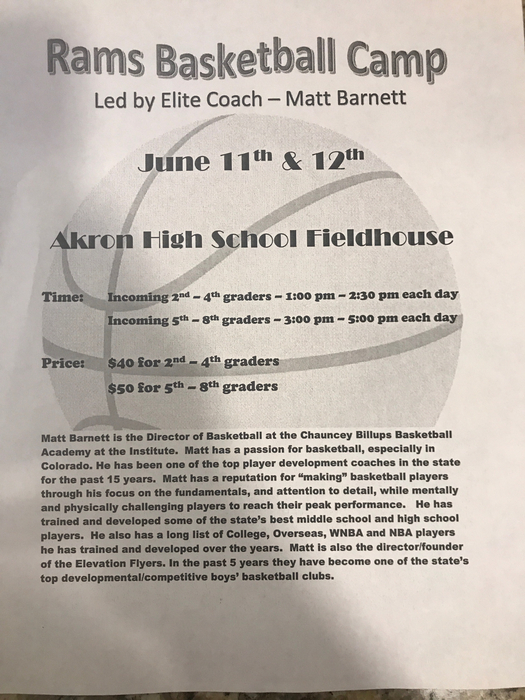 Attention Akron Track and Baseball Fans: On Friday, May 11th our H.S. baseball team will play at 9:30 a.m. vs. SedgCo (at Holyoke) and the H.S. 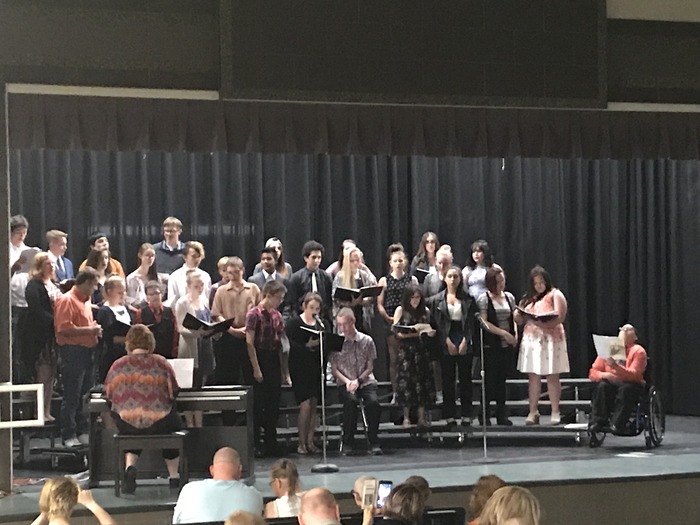 track team will be at Longmont also starting at 9:30 a.m.
Congratulations to Ms. Lowry and her 7th-12th Grade choir students on a very good performance tonight! 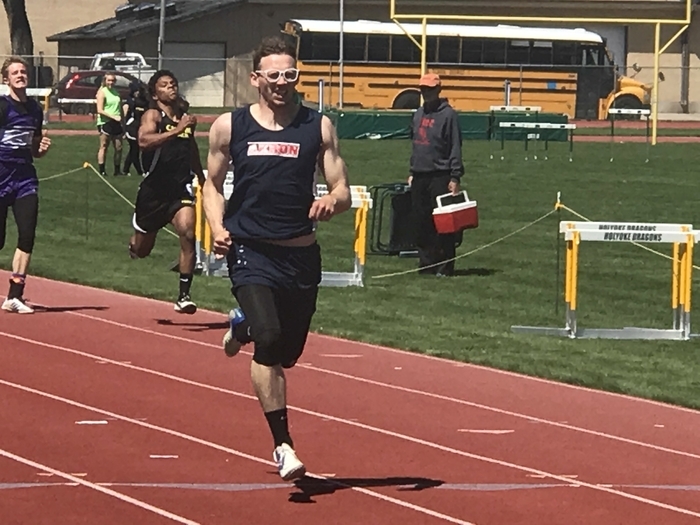 Akron senior Tyler Wylie is having another great track season. 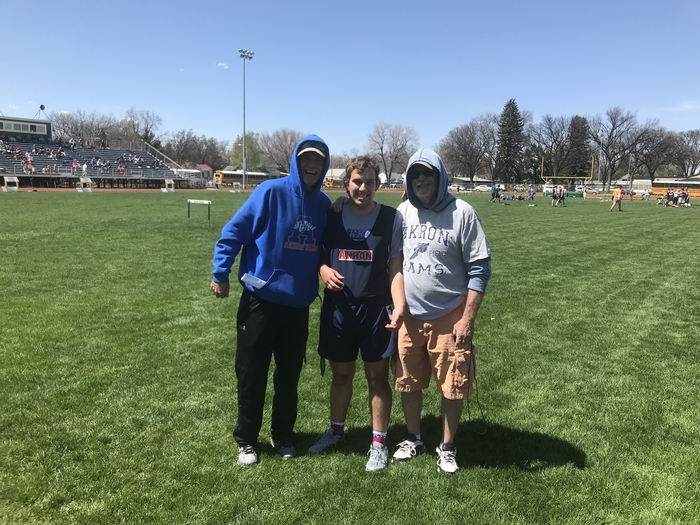 He took first place in the 100, 200, and 400 at Holyoke on Saturday. 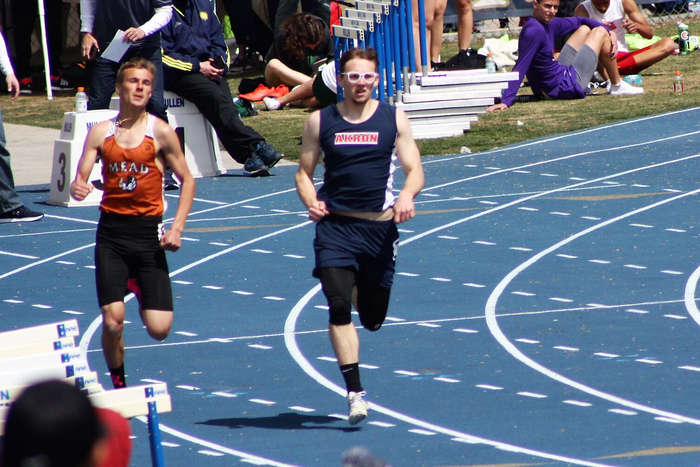 He currently has the third fastest time in the 400 and fourth fastest time in the 200 in 2A this year. Congratulations and best wishes down the final stretch Tyler! Go Rams! 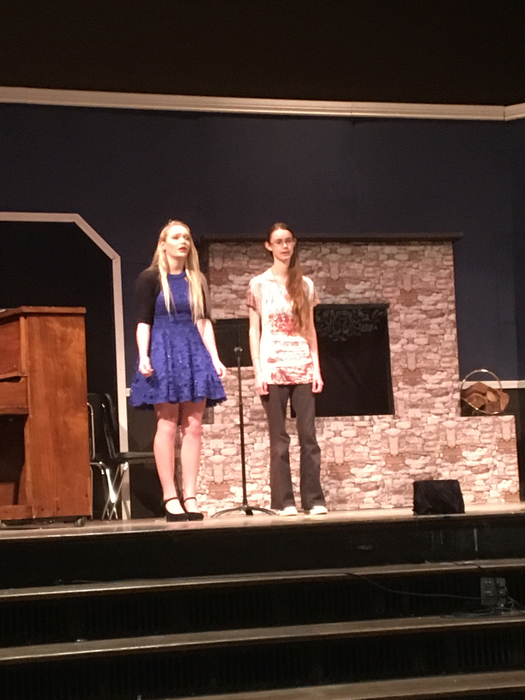 Pictures of our Akron H.S. track athletes at Holyoke today. 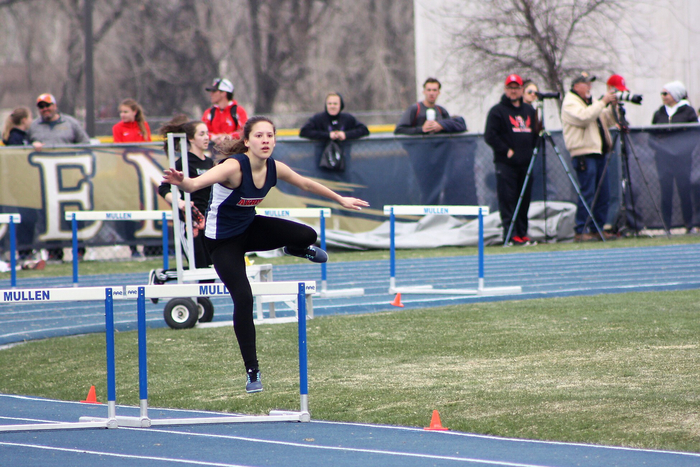 The Rams had several great performances and a number of top finishes. Go Rams! 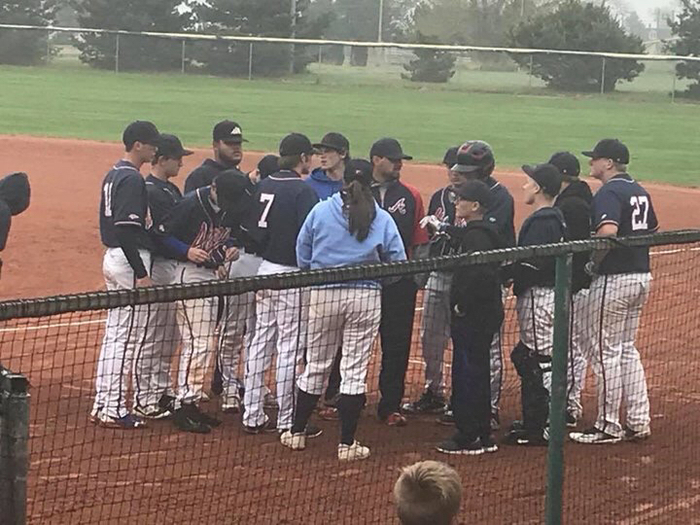 The Akron Ram baseball team dropped both games of their doubleheader today 13-1 and 10-0. 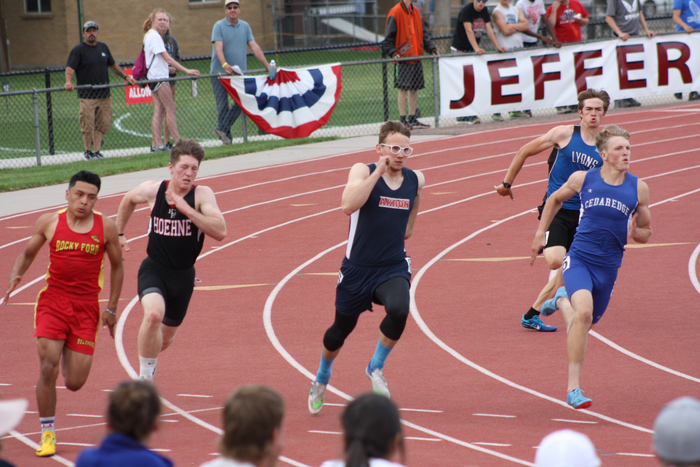 Akron’s Johnathan Schiefelbein ran in his last H.S. track meet today at Holyoke. Great job Johnathan! 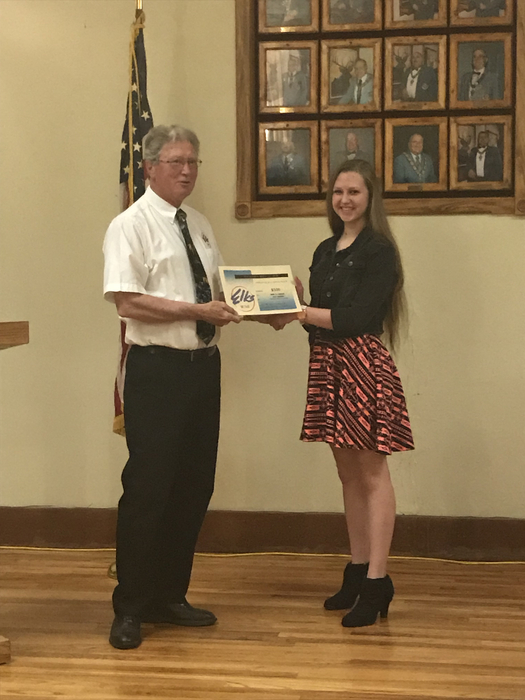 Elks Youth Award Dinner Elks Essay Winners. 7th & 8th grade division: Kyla Pachner 2nd and Janessa Shook 3rd. 5th & 6th grade division: Addison Kessinger 2nd and Fiona Quick 3rd. 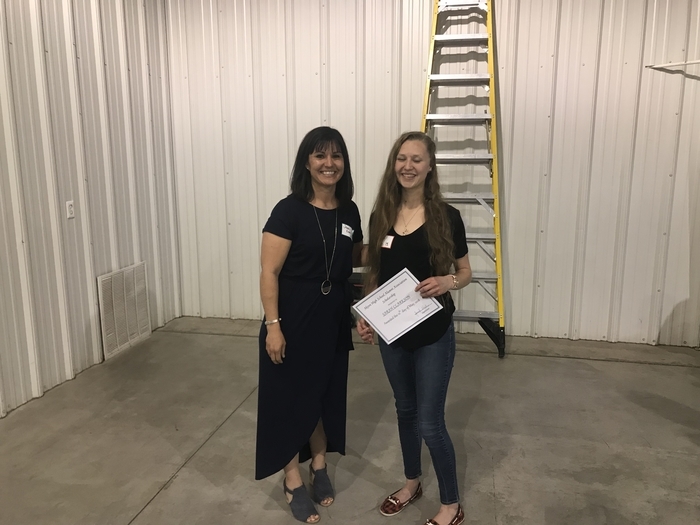 Sarah Clarkson won a $500 scholarship. 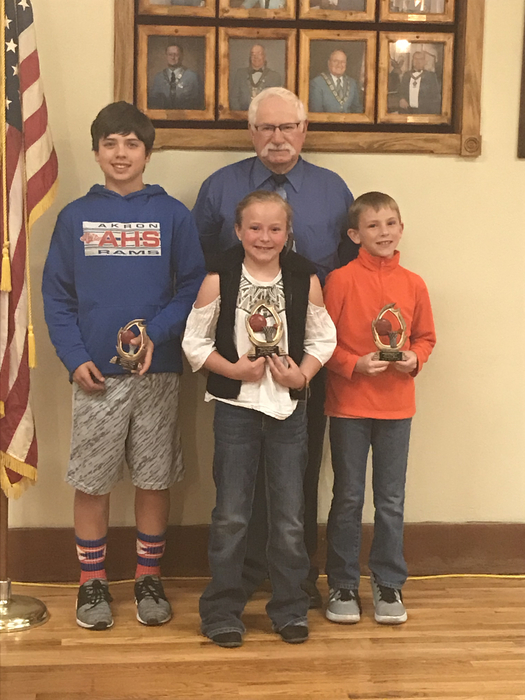 Anderson Filla and Kashlee Randel were recognized for placing in the Elks Hoop Shoot. Go Rams! 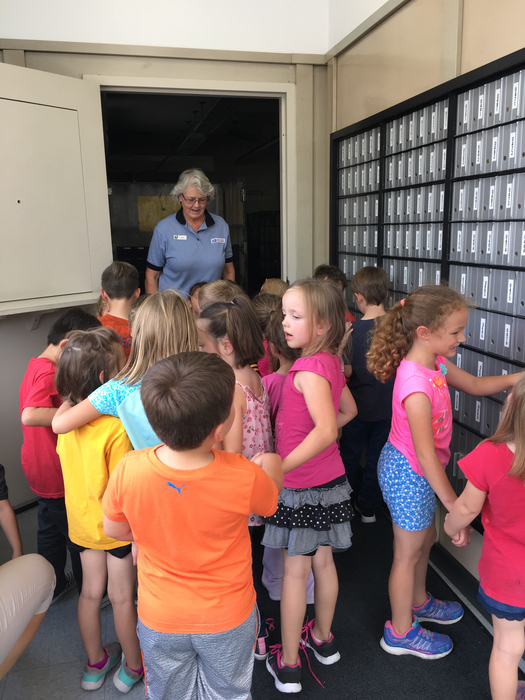 Pictures of the 1st grade field trip to Wray. 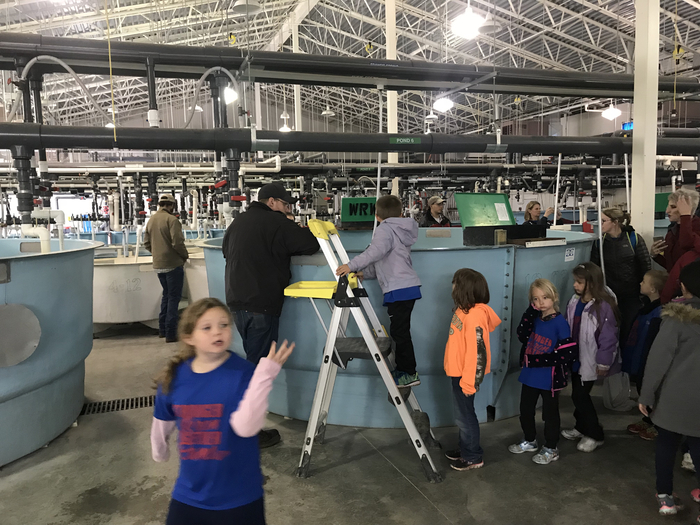 Students learned about artifacts and visited the fish hatchery. 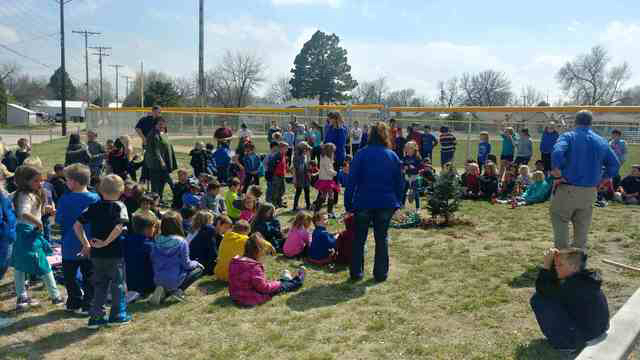 On Tuesday our elementary students planted a tree in celebration of Arbor Day. 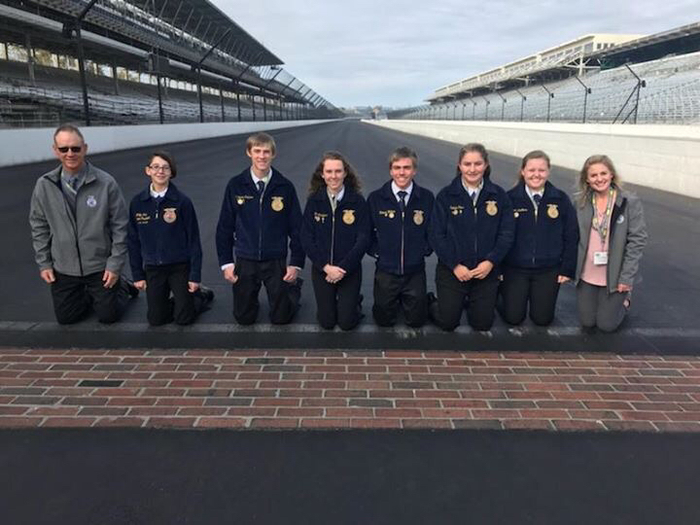 At FFA Career Development Events on Monday, the Farm Business Management team made up of Derrick Poss, Seth Dorrenbacher, and Kate Pachner finished in the Gold Category (Top Five) with Derrick placing first in the state. 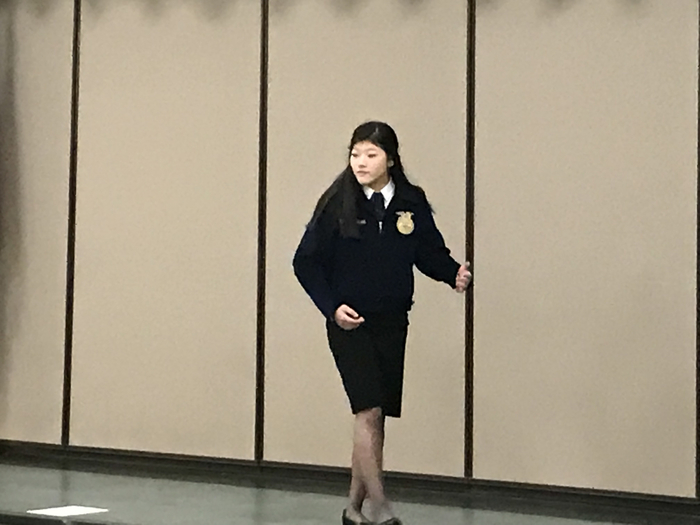 Cheyenne McGuire finished in the gold category in Floriculture. 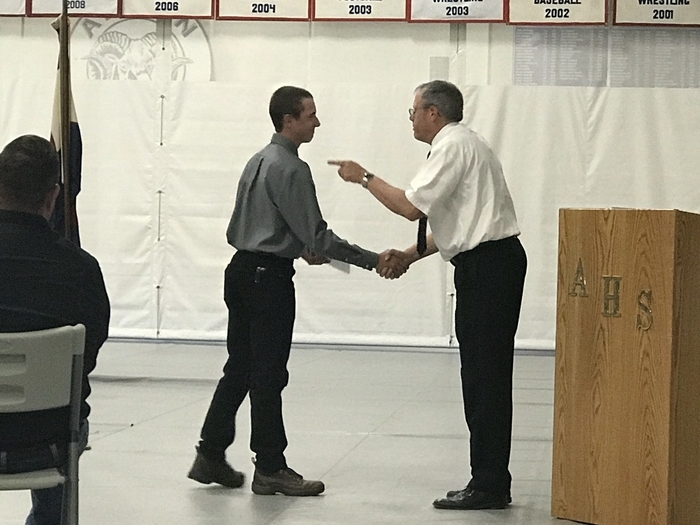 Ely Kipp placed in the gold category for Ag Mechanics. 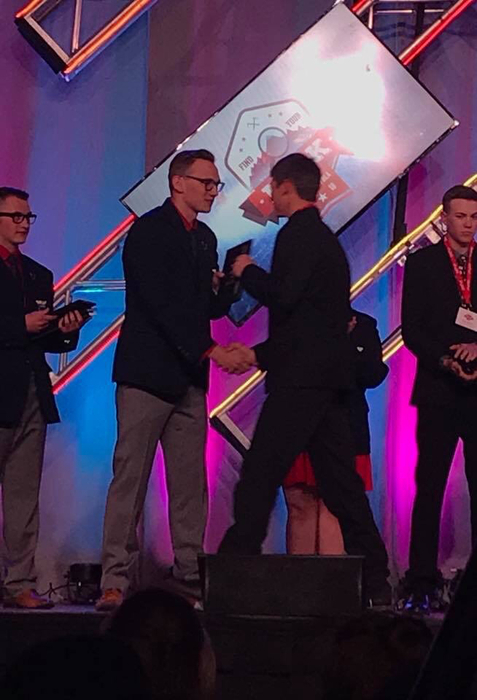 Grayson Pachner placed in the bronze category for livestock evaluation. Congratulations! The Akron Rams baseball team dropped both games of their doubleheader at Wray tonight. 12-2 and 15-1. 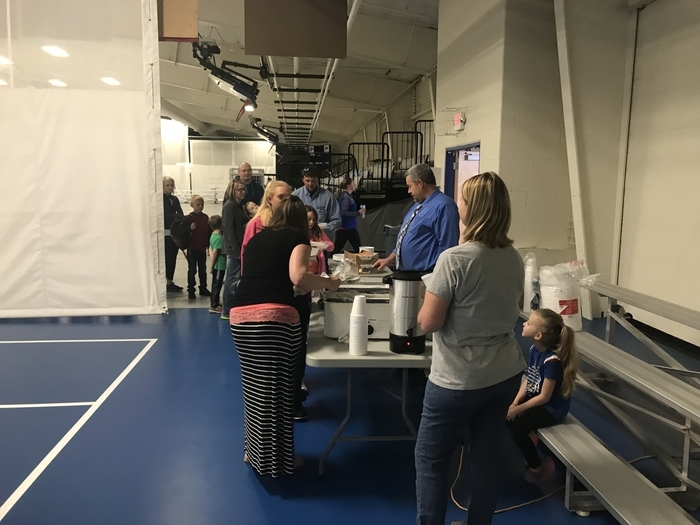 The Akron Elementary Academic Breakfast was held this morning in the field-house. The J.H. LPAA track meet scheduled for Thursday, May 3rd in Akron has been moved to Friday, May 4th due to the forecasted weather. 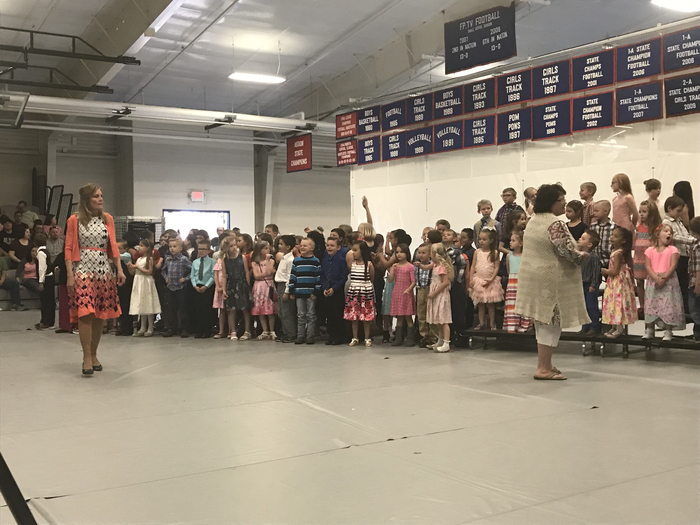 The meet will start at 11 a.m.
Pictures from the elementary spring music concert last night. 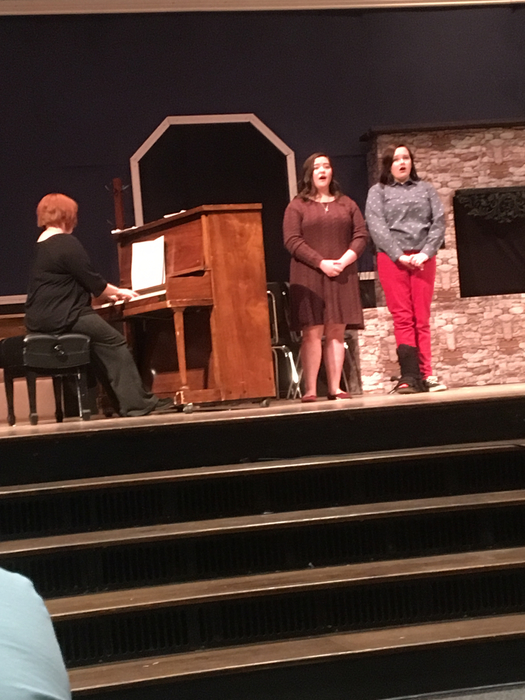 Congratulations to Ms. Sue Hellyer and her students on another great performance! Battle of the Rams The Akron Ram baseball team hosted the Merino Rams in a doubleheader yesterday. Both games were very competitive. 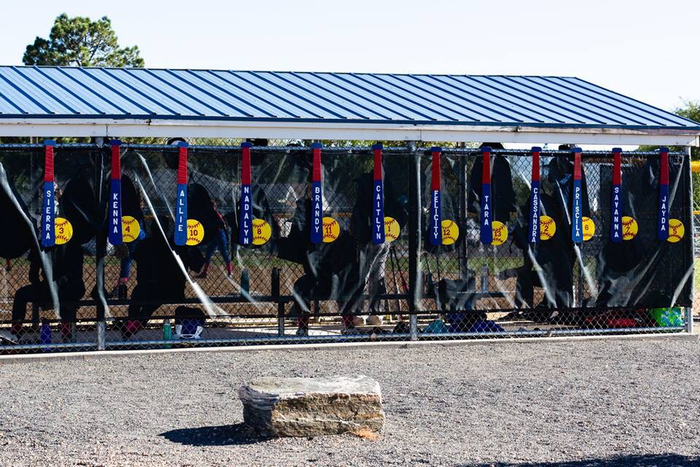 Merino took both contests 15-8 and 16-14. 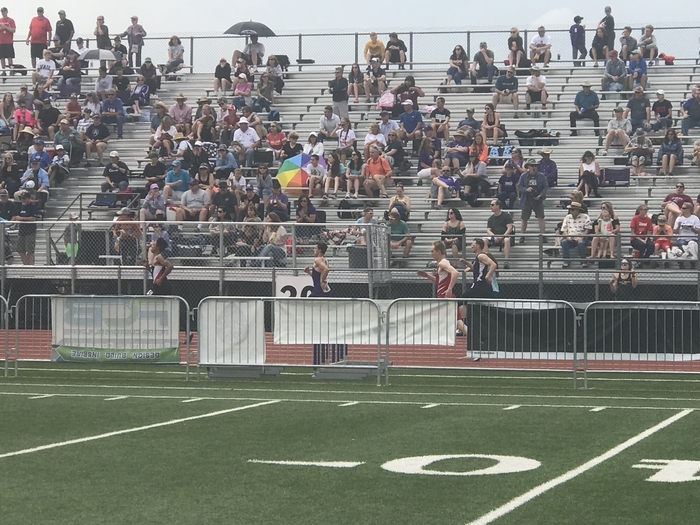 The Akron Invitational Track Meet was held yesterday. Thank you to everyone who helped with the meet. Congratulations to the Akron Ram coaches and athletes on your performances in this meet. Go Rams! 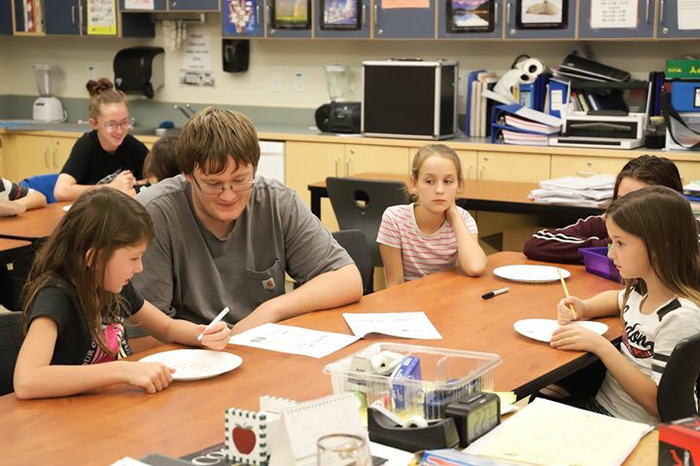 On Thursday, our students enjoyed lunch together with their big buddies and little buddies. 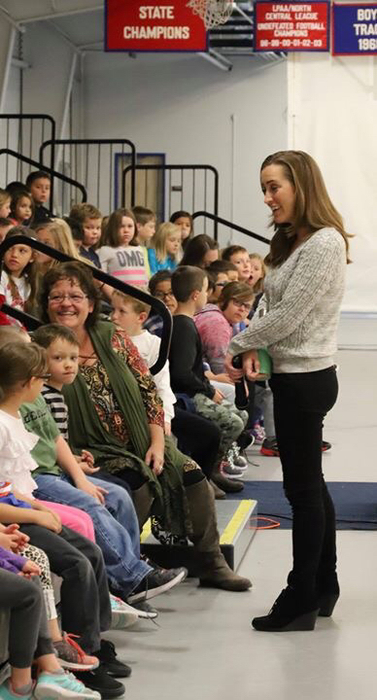 Jamie Axtell from the Colorado Cattlewomen came to read books about life on a dairy farm to our Preschool through 4th grade students. 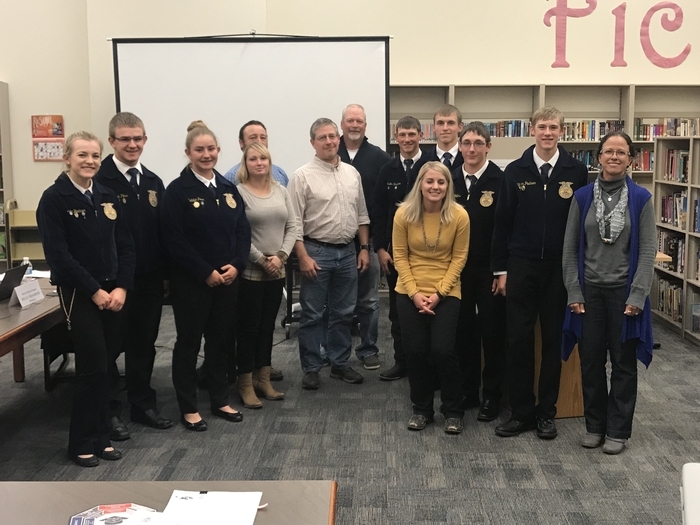 This project was sponsored by the Colorado Literacy Project, the Dairy Farmers of Colorado, and the Colorado Cattlewomen. 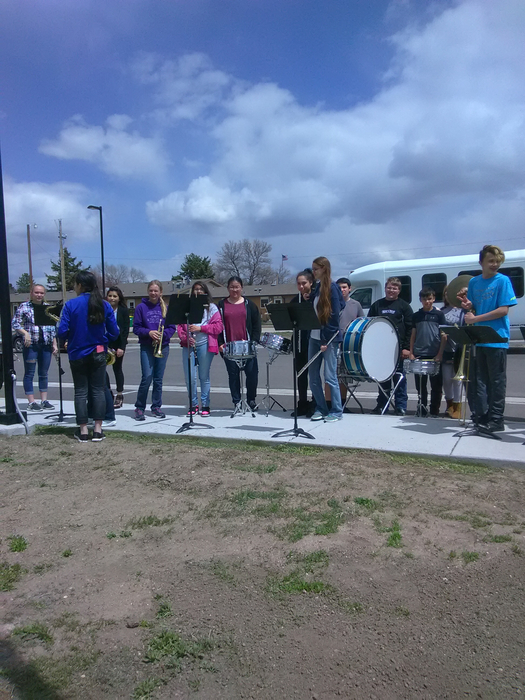 Ms. Lowry and her Akron Ram band students helped today with the dedication of the new flag pole at the Washington County Nursing Home. Go Rams! 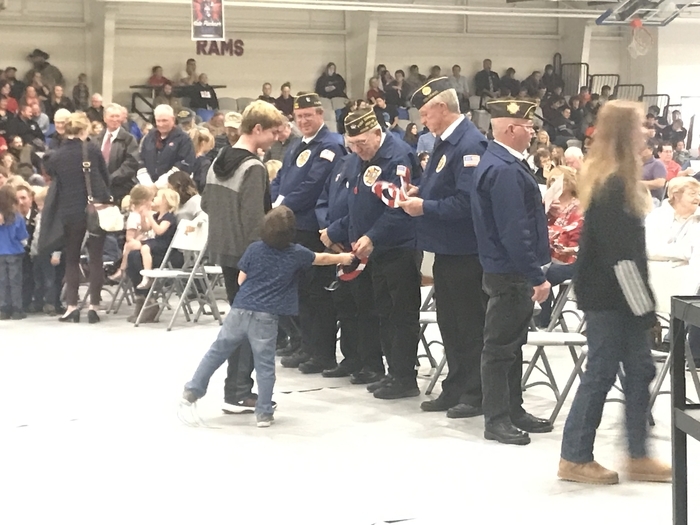 A few pictures from the Akron H.S. 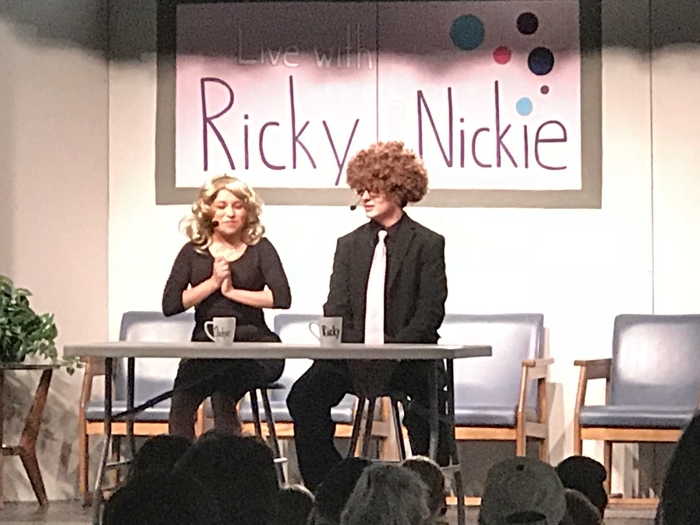 play held tonight at the school. This was the second and final show. 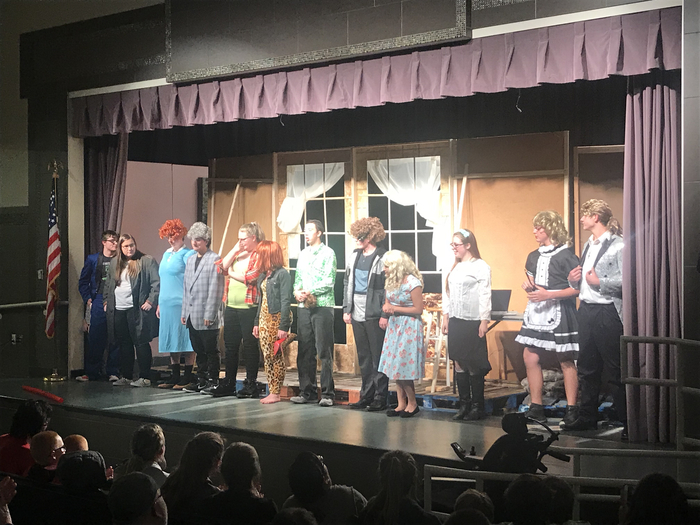 Congratulations to Ms. Campbell, Mr. Kraich, and their drama students for a wonderful production. 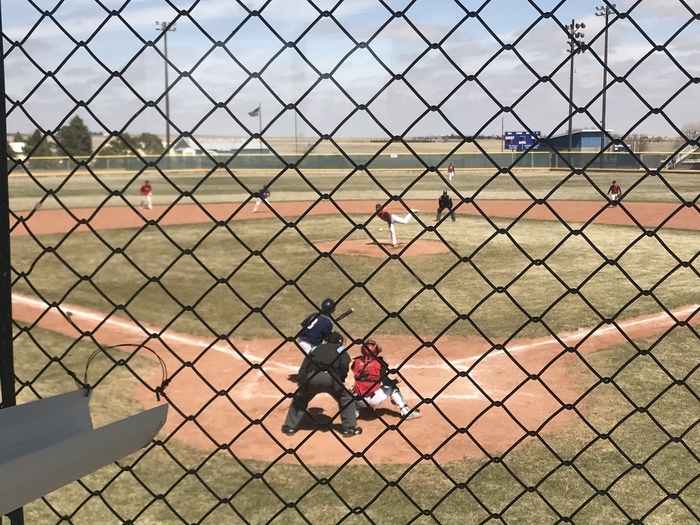 The Akron Ram baseball team dropped two games on the road at Caliche tonight 1-17 and 11-21. Keep working to improve Rams! 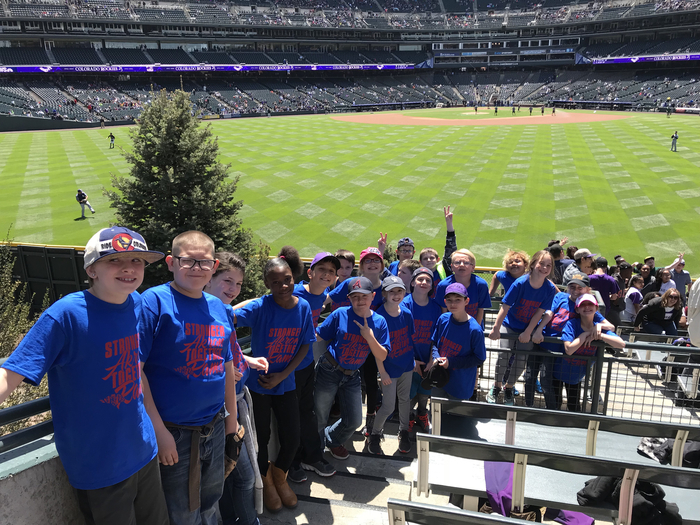 Akron 4th grade students attended the Weather and Science Day at the Rockies today. Mr. Clarkson took a group of our H.S. 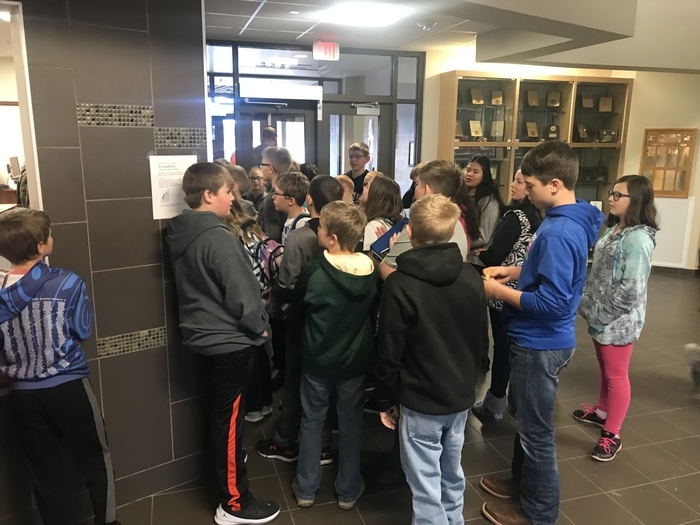 students to the NJC Math and Science Contest today. 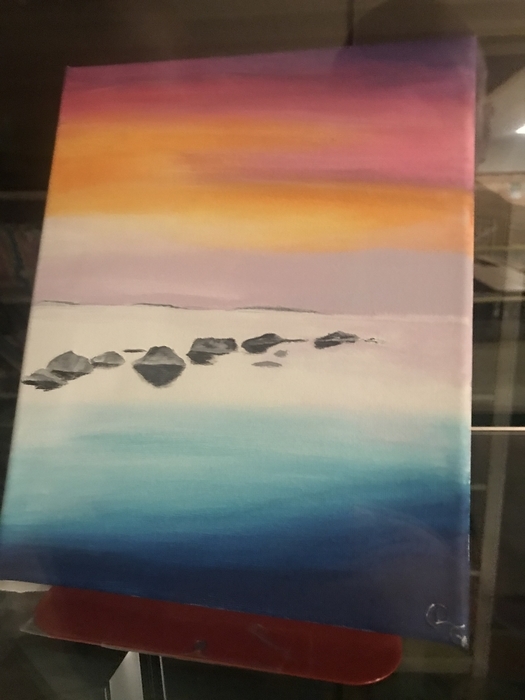 Our students did very well. Only top 3 reaults were given today. 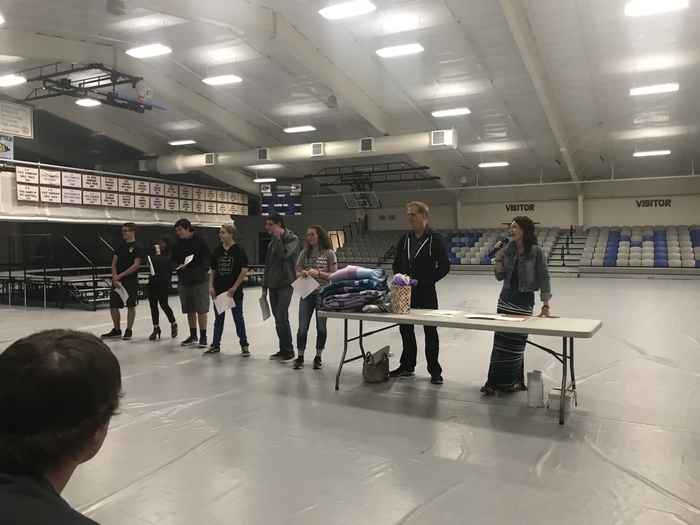 Top 3 placers: Chemistry: 1st-Cheyenne McGuire, 2nd-Dawson McMillion. 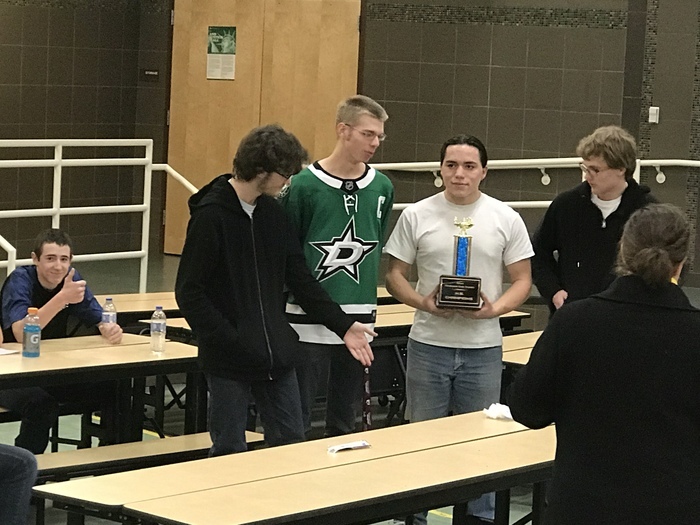 Calculus: 1st-Dawson McMillion Trigonometry: 3rd-Anthony Dreher Critical thinking 11th Grade: 1st-Levi Kipp Go Rams! The H.S. baseball games scheduled for today (April 24th) in Akron have been canceled. The H.S. track meet that was scheduled for today (April 24th) in Holyoke has also been canceled. Attention Ram Fans-The Akron track team will not be going to the Holyoke track meet tomorrow (April 24th). Attention Ram Fans- The H.S. 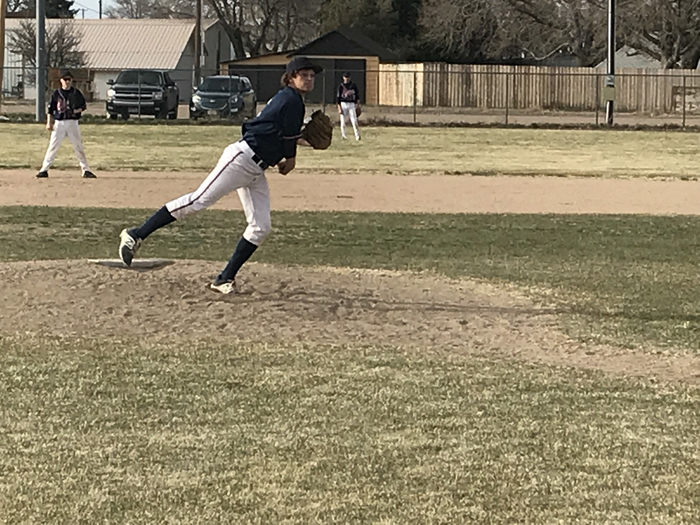 Baseball game at Caliche rescheduled for Monday has now been moved to Wednesday, April 25th at 2 p.m. The change is due to a lack of available officials. Attention Ram fans- The H.S. baseball game scheduled for today at Caliche has been moved to Monday at 2:00 pm. 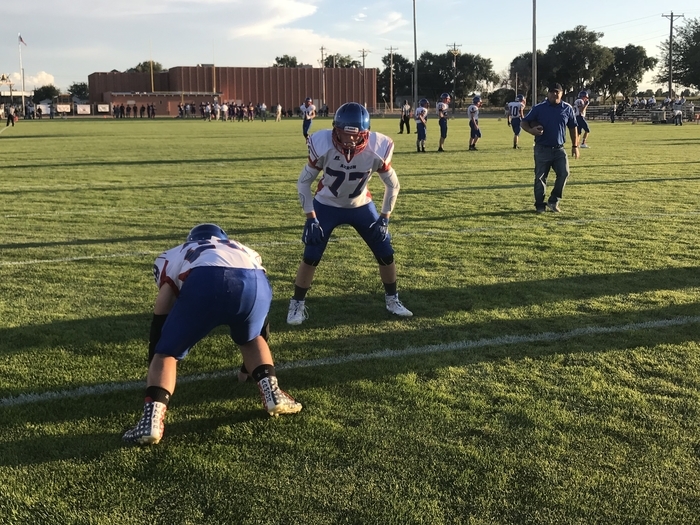 As a result, the JV game scheduled for Monday has been moved to Friday 4/27 at 3:00 in Caliche. 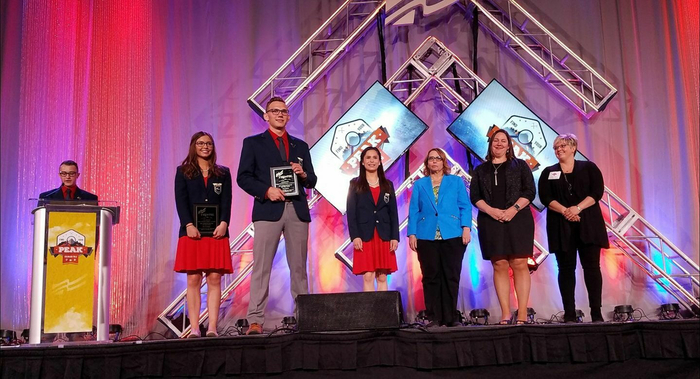 Akron FBLA swept the top three spots in Accounting II and is sending six students to nationals. 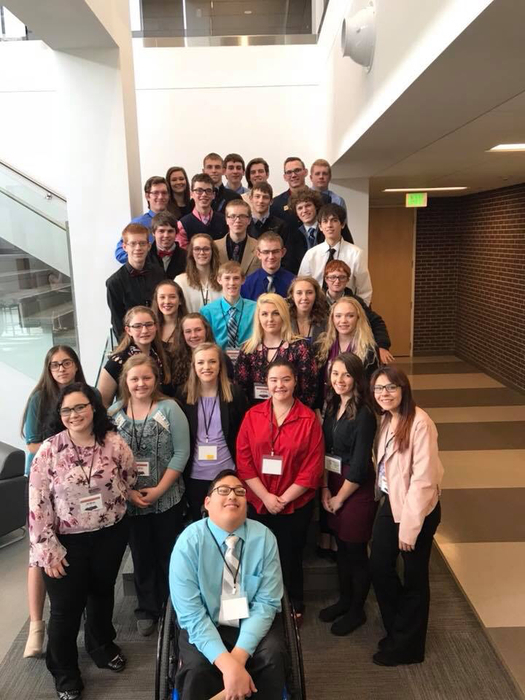 Akron State FBLA results: Accounting II Derrick Poss-1st Isaiah Herder-2nd Anthony Dreher- 3rd American Enterprise Sara Wylie, Nadalyn Poss, Mariah DeMers-5th Business Calculations Levi Kipp-1st Future Business Leader Tyler Wylie-2nd Intro to Business Procedures Grayson Pachner- 3rd Congratulations to FBLA Advisor Ms. Ali Houston and her students. Go Rams! The H.S. 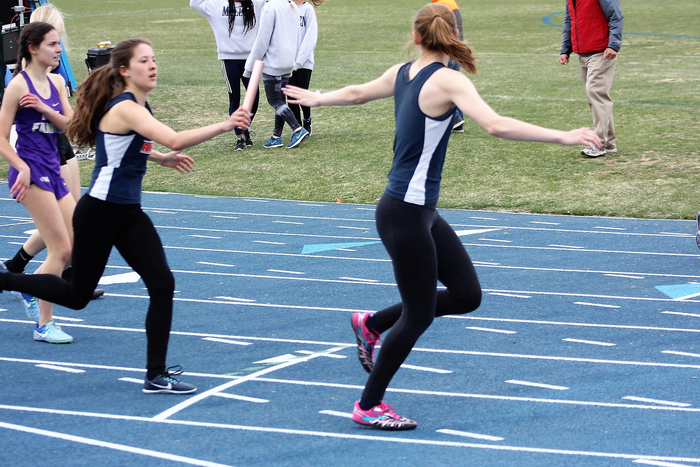 track meet scheduled for tomorrow in Kersey has been moved to Monday, April 23 at 1 p.m. The Akron H.S. 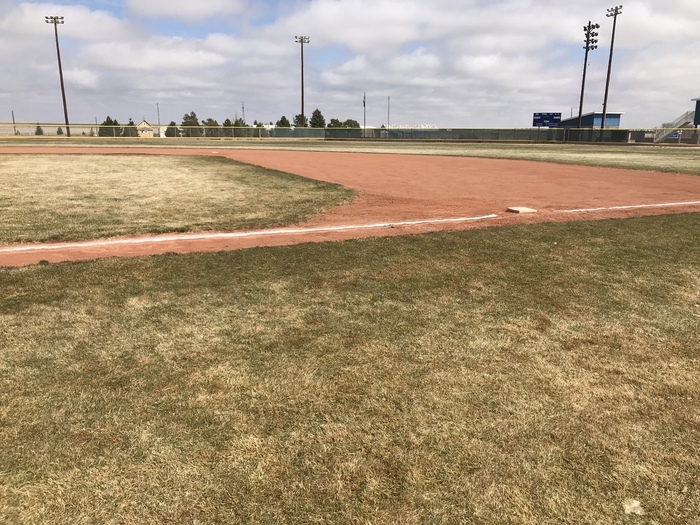 baseball game scheduled at Caliche tomorrow has been pushed back to a 12 (noon) start. 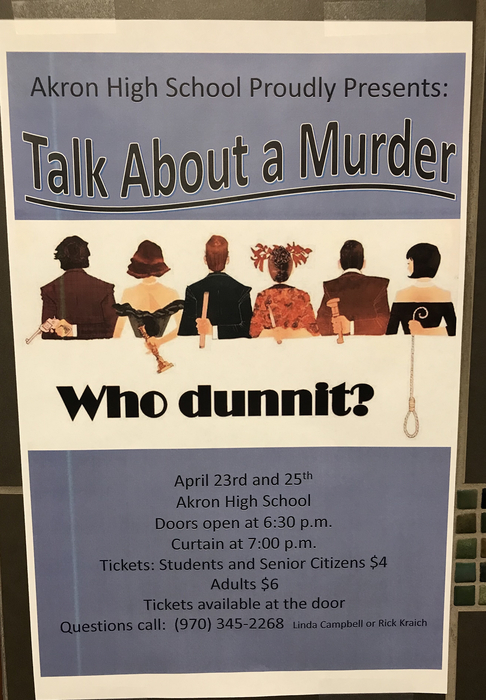 Opening night of "Talk about a Murder" this coming Monday April 23rd @ 7 pm @ Akron High School. Tickets at the door. Again on Wednesday April 25th Join us for a great evening of entertainment and laughs. 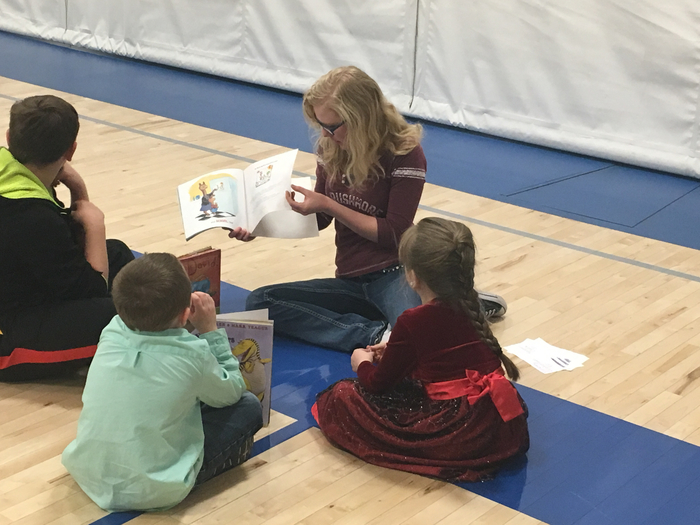 Akron FBLA at State FBLA in Vail, CO.
Ms. Weis and Ms. Vogt treated their 3rd grade students to a book tasting. 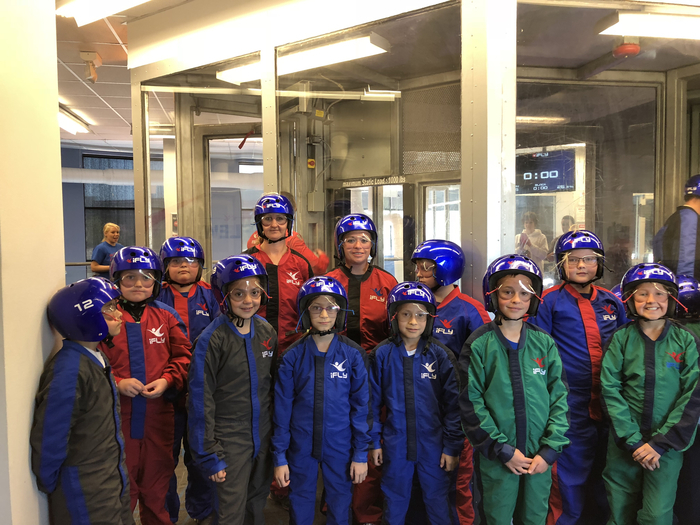 The students enjoyed the experience! Go Rams! 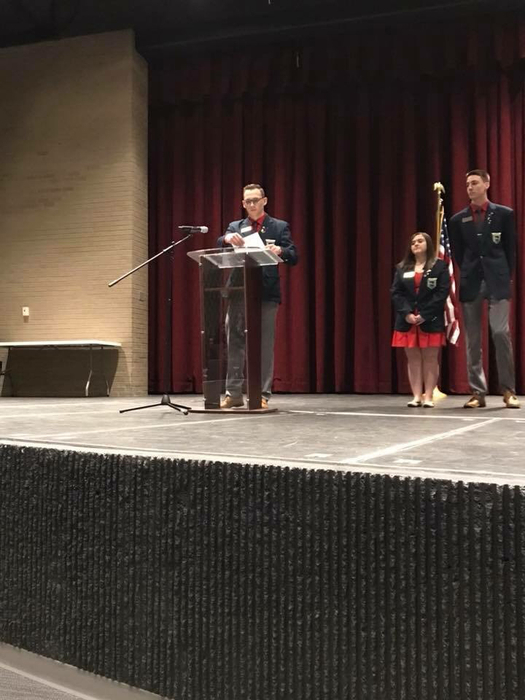 Pictures of Akron Ram and Colorado FBLA President Tyler Wylie speaking at the opening session of State FBLA in Vail, CO yesterday. Great job Tyler! Go Rams! 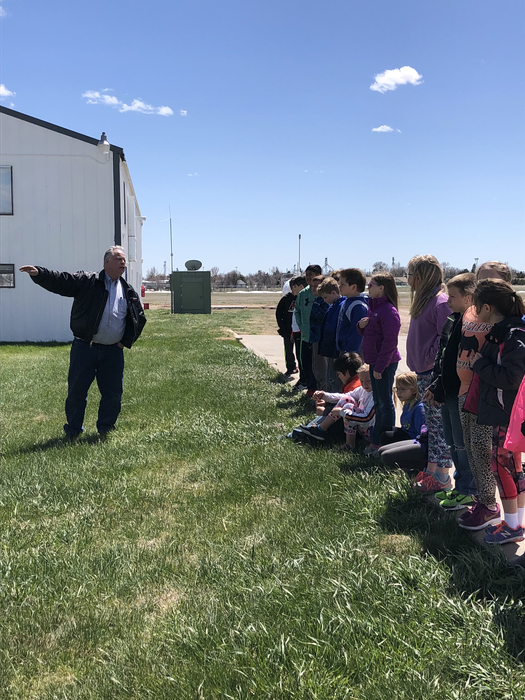 The Akron 3rd grade classes had a great time visiting the Akron Airport yesterday. 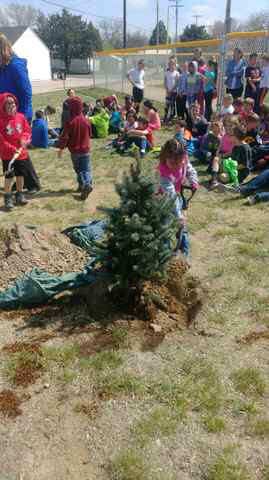 The Akron 5th graders visited Rural Ameritown yesterday in Wray. 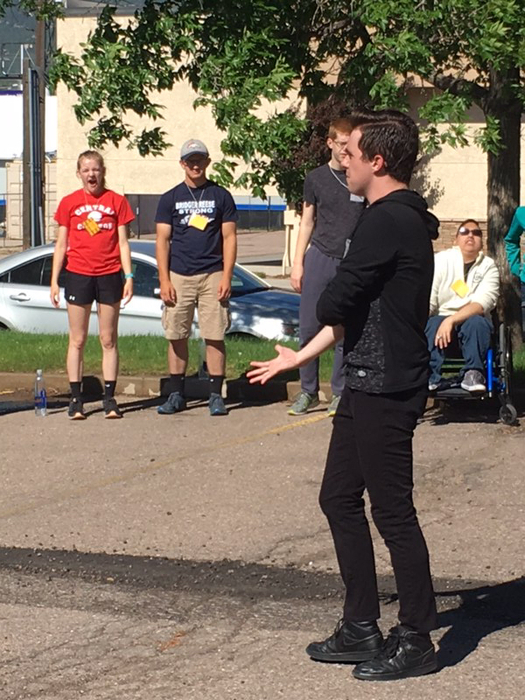 The students enjoyed playing different roles in the town. The Akron J.H. 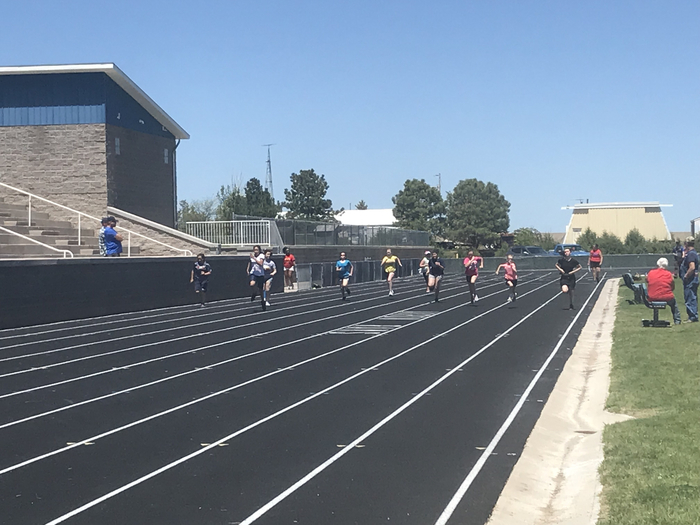 track relays scheduled for Friday, April 20th have been moved up to tomorrow, Thursday, April 19th due to Friday forecast. 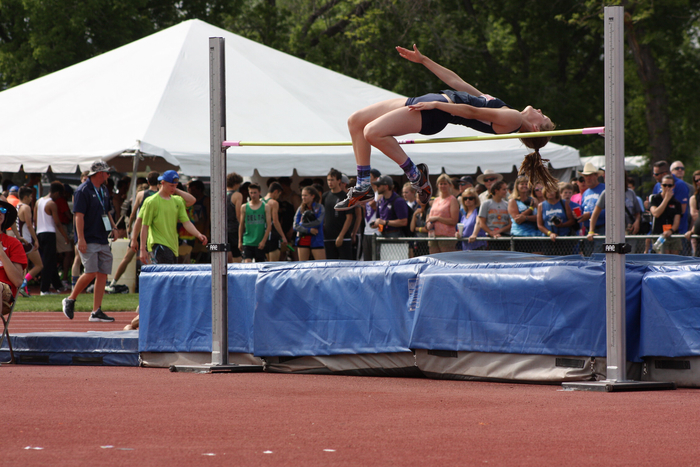 Field events will start at 12:30 p.m. with running events to follow at approx. 2 p.m.
Due to the high winds, reduced visibility, and other safety factors: Akron school district will not provide any bus service this afternoon. 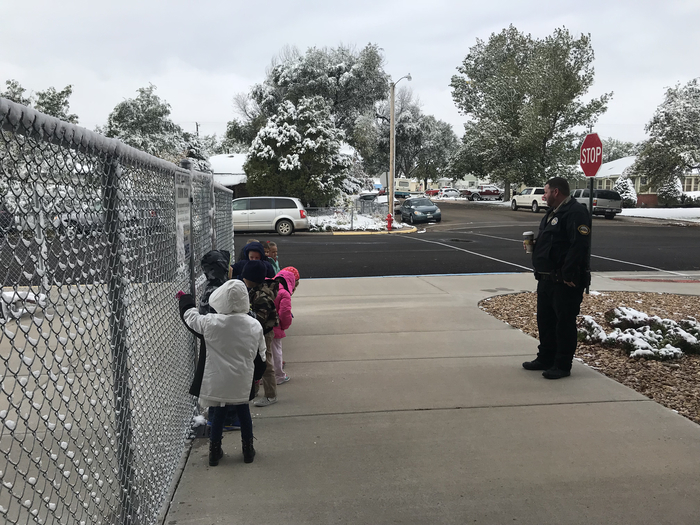 Parents of students that typically ride the bus home are asked to please pick your child up from the school. Regular bus service is planned to resume Wednesday morning. The H.S. 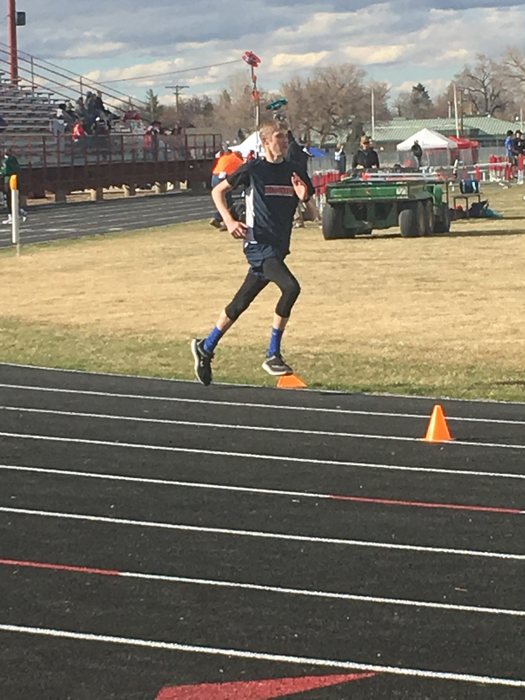 track meet scheduled for tomorrow in Byers has been cancelled. The H.S. 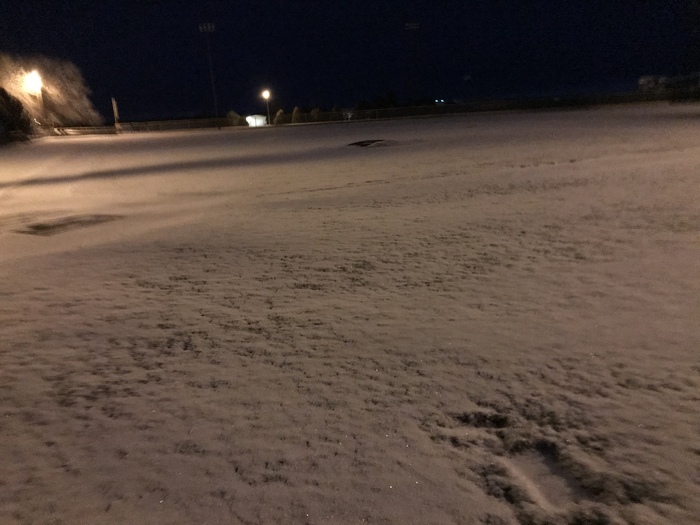 baseball game scheduled at Caliche tomorrow April 14th has been cancelled. H.S. baseball and track practices scheduled for today have also been cancelled. Stay safe! 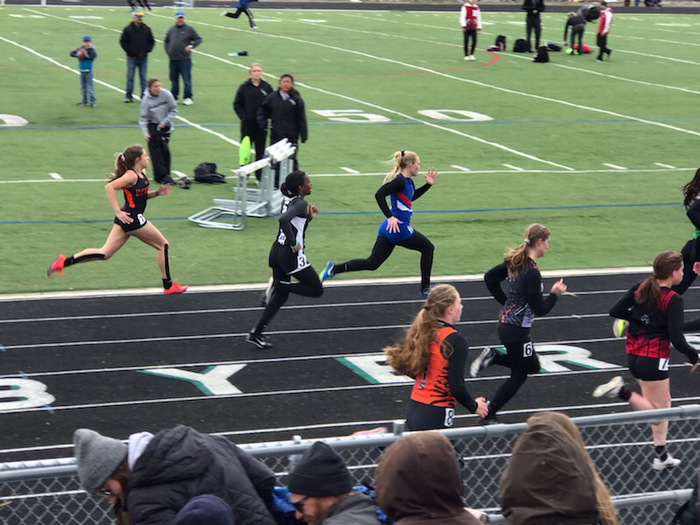 ATTN 8TH GRADE PARENTS: Since the JH track meet has been moved to tomorrow (Thursday), the 8th grade continuation meeting has been moved to Monday, 4/16, at 5:00 pm in Mrs. Randel's room. 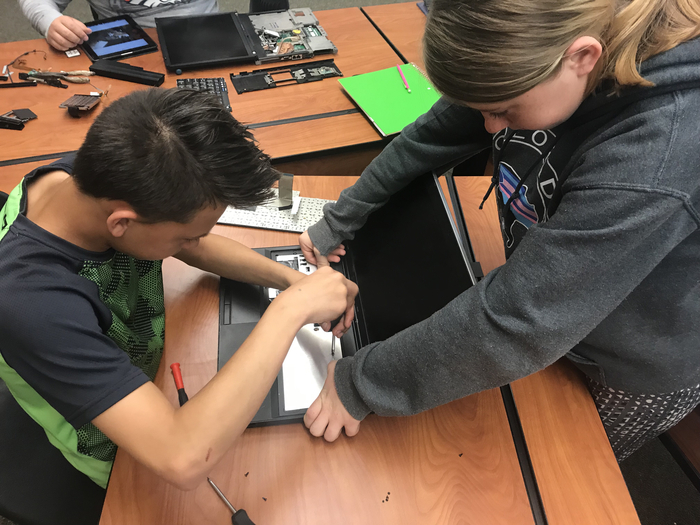 7th Grade Technology Class learning the ins and outs of what goes into the construction of lap tops. 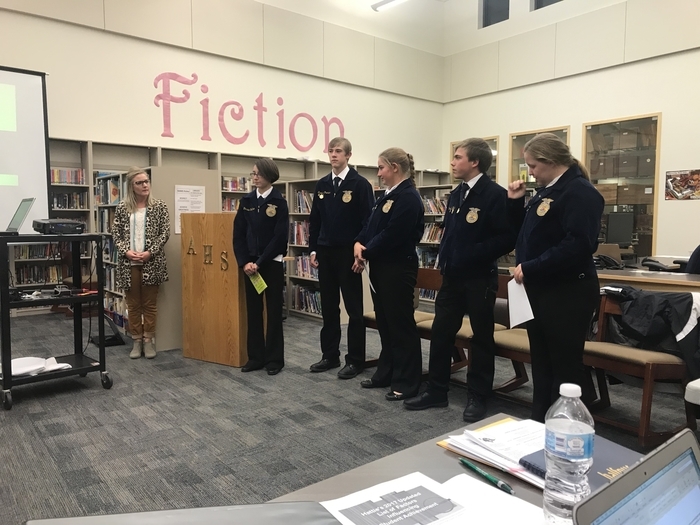 The Akron School Board was treated to a presentation about knowledge bowl tonight by Mrs. Denise Pickens and her knowledge bowl team. 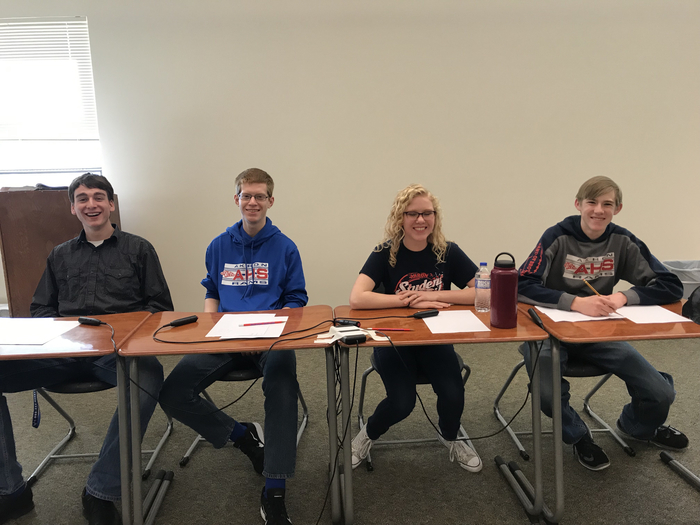 The Akron knowledge bowl team then challenged the board to a contest, which gave the board a feel for how the competition is conducted. 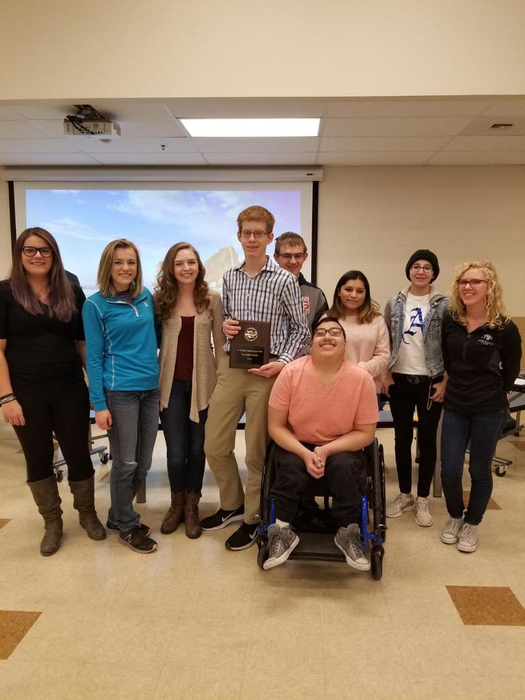 The Akron knowledge bowl team won regionals and finished 4th at State in 2A this year. Thank you students and Coach Pickens for representing our school and community! The Akron Ram baseball team picked up a win this afternoon over the Fleming Wildcats 9-6. Go Rams! 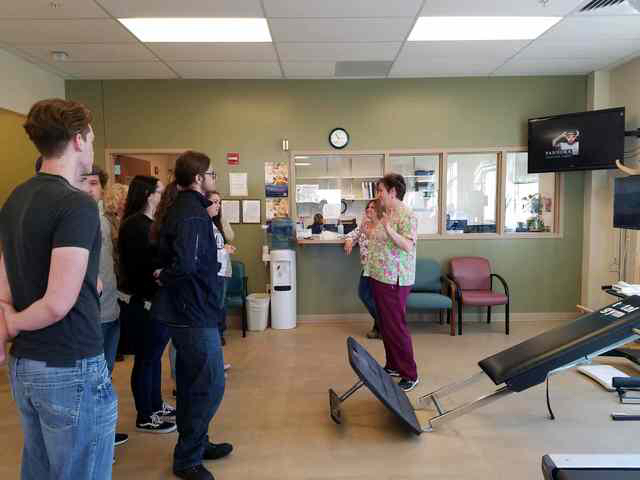 Career Exploration Akron seniors traveled to Yuma today and visited Agri-Inject and the Yuma hospital. 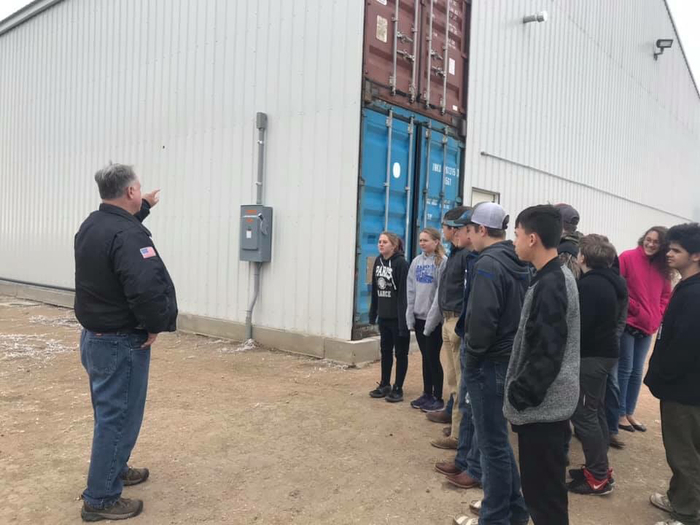 Students learned about agricultural chemical application and different aspects of the medical field. Our H.S. 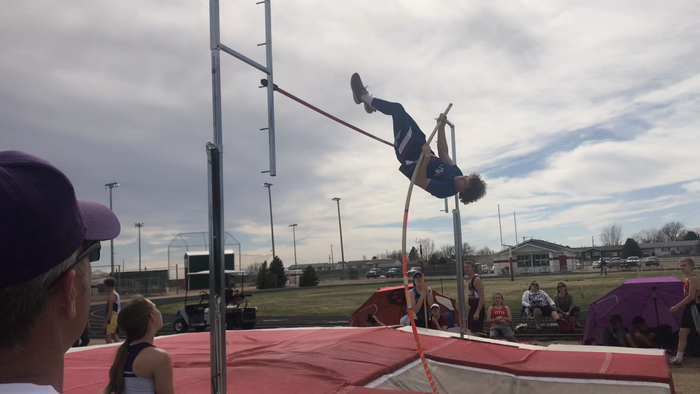 track team was at Yuma for a meet this afternoon. 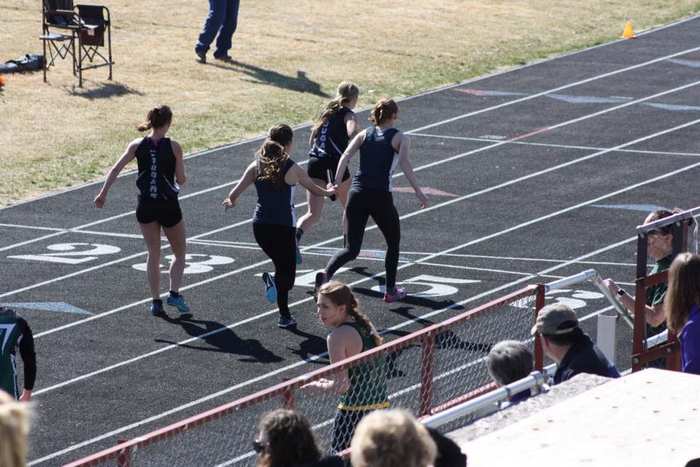 Pictures of our Akron track athletes at the Mullen Track Meet yesterday. The Rams had several good performances. 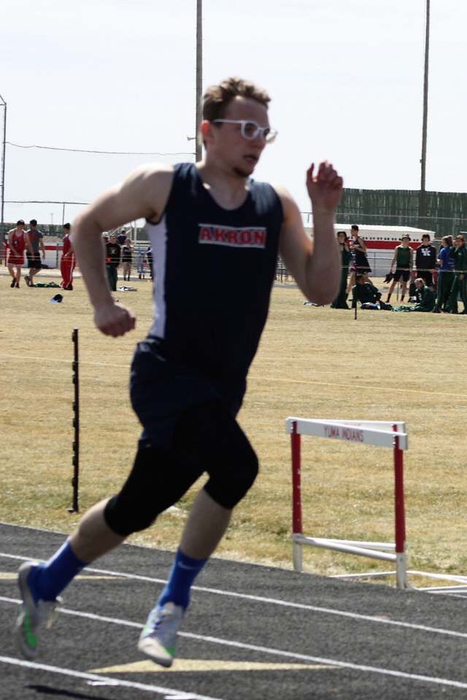 Tyler Wylie ran a season best 51.57 in the 400. Go Rams! 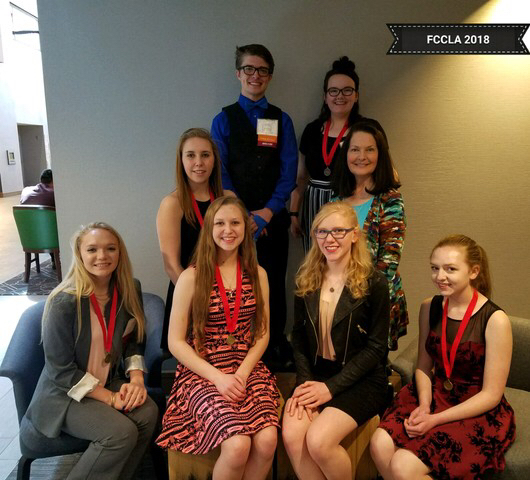 State FCCLA results: Cheyenne McGuire was installed as a state FCCLA officer, Sarah Clarkson and Abbie Scholes received a gold medal and placed third, Tayler Clarkson and Landrie Reese received a gold medal and placed third. 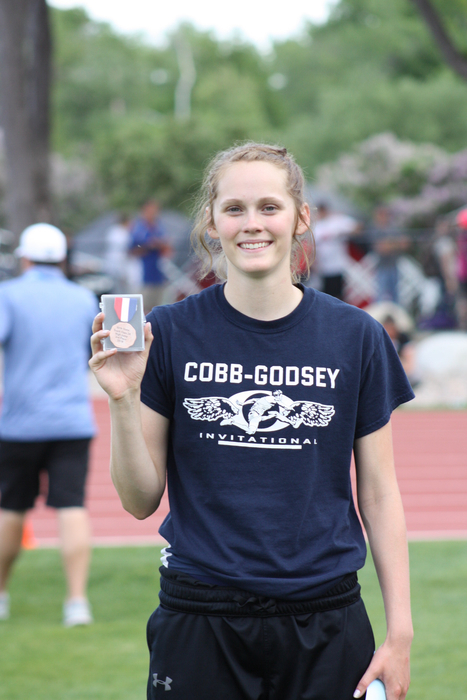 Tara Chadwick received a silver medal. 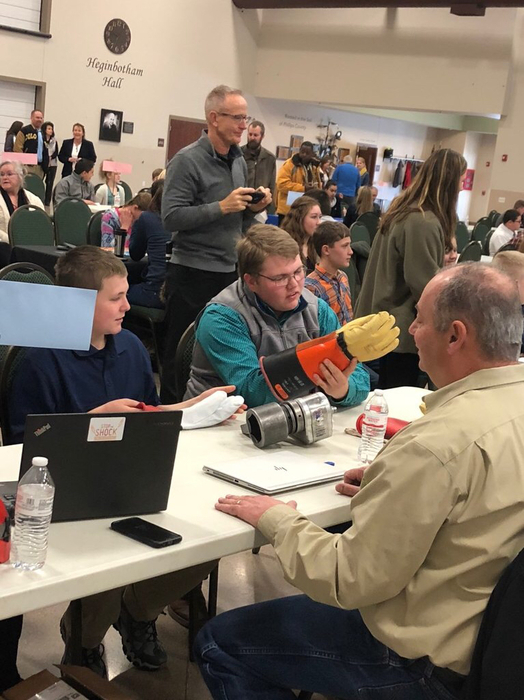 Orion Wagers was on the judging panel. 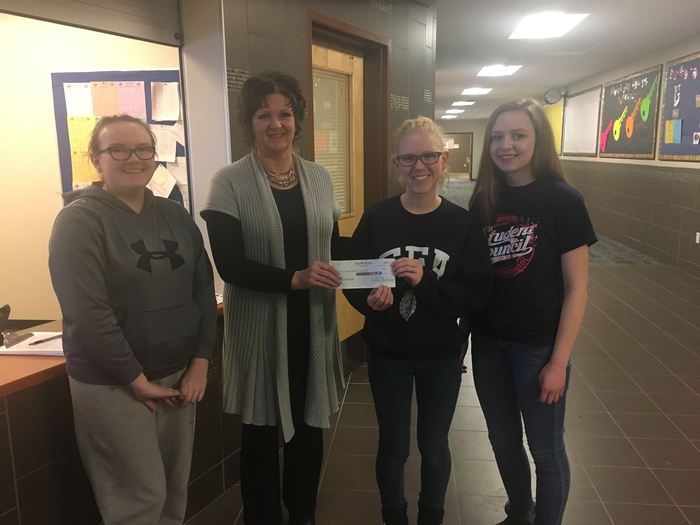 Congratulations advisor Peggy Hall and her Akron FCCLA students! 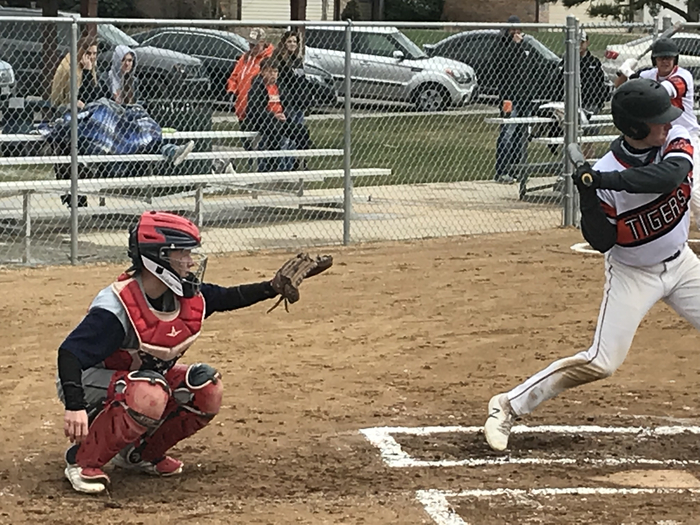 The Akron Ram baseball team dropped both games of their double-header with Haxtun today 12-1 & 23-7. The Rams will play at Fleming on Tuesday at 4 p.m. Go Rams! A lot can happen in a few hours with Colorado weather. ❄️☀️ We have a beautiful day for baseball and a beautiful field to match. Come out and support the Akron Ram baseball team as they take on the Haxtun Bulldogs. The first game starts at 1 p.m. Go Rams! The H.S. baseball game against Haxtun today has been moved to a 1 pm start to allow for improved field conditions. Go Rams! 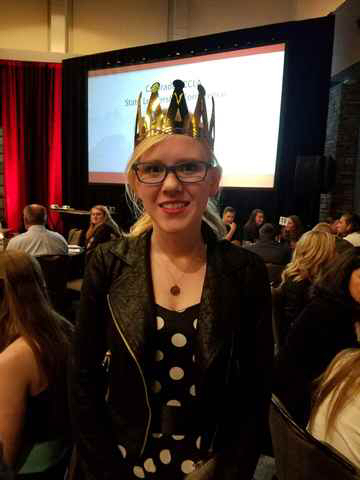 Congratulations to Akron’s Cheyenne McGuire Colorado FCCLA’s new 1st Vice President! 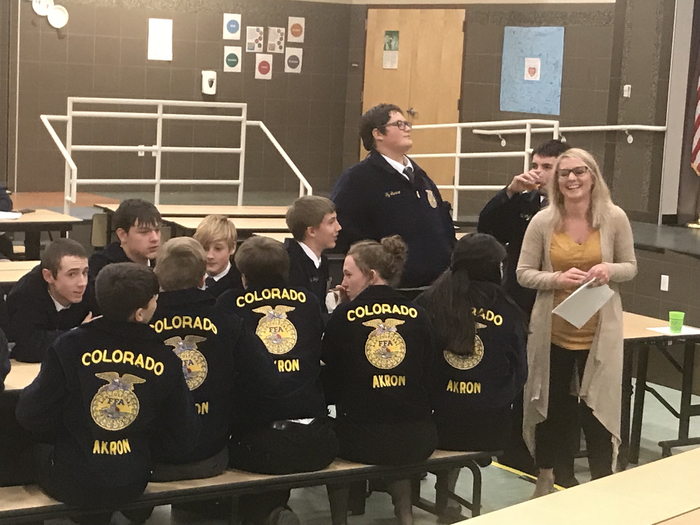 Akron FFA CDE Results Yesterday at NJC the Farm Business Management team of Derrick Poss, Kate Pachner, Isaiah Herder, and Seth Dorrenbacher placed 1st. Derrick finished 1st overall in Farm Business Management and Kate, Isaiah, and Seth all finished in the top ten. 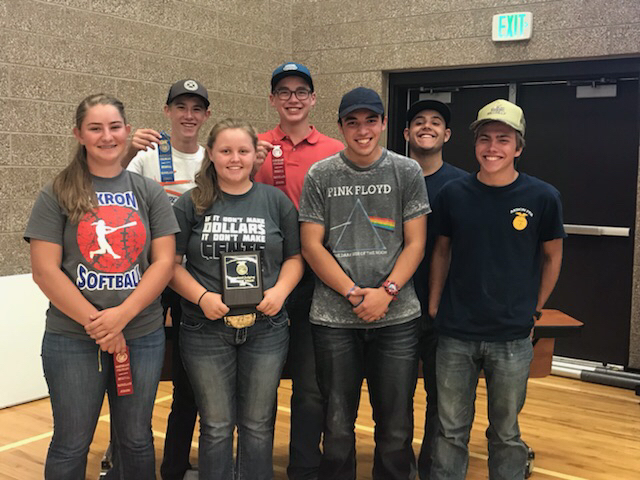 Ely Kipp finished second overall in Ag Mechanics. Cheyenne McGuire finished in the top ten in Floriculture. Congratulations!!! The Holyoke JH track meet scheduled for this Friday, April 6th has been postponed. The meet has been rescheduled for Tuesday, April 17th. 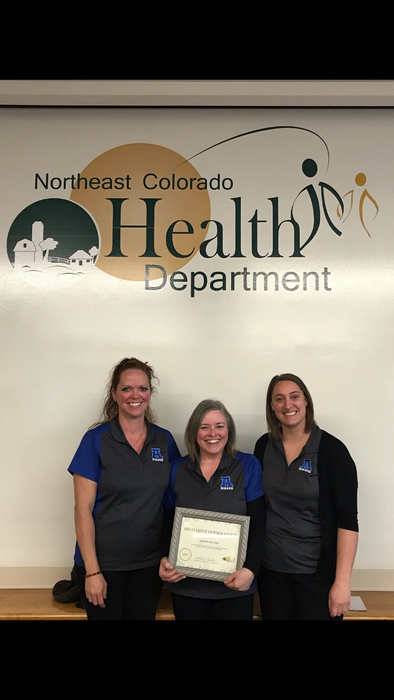 The Northeast Colorado Health Department granted 15 awards to food service establishments out of total of 472 in six counties. 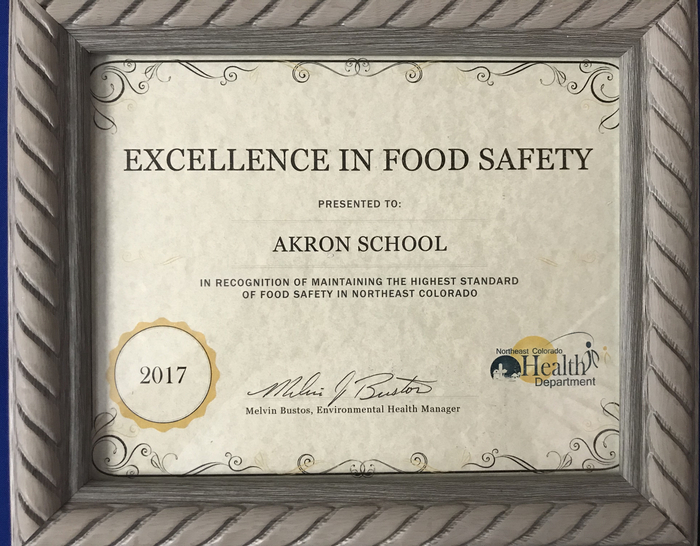 The Akron School Food Service Department earned one of those awards. Congratulations ladies!! 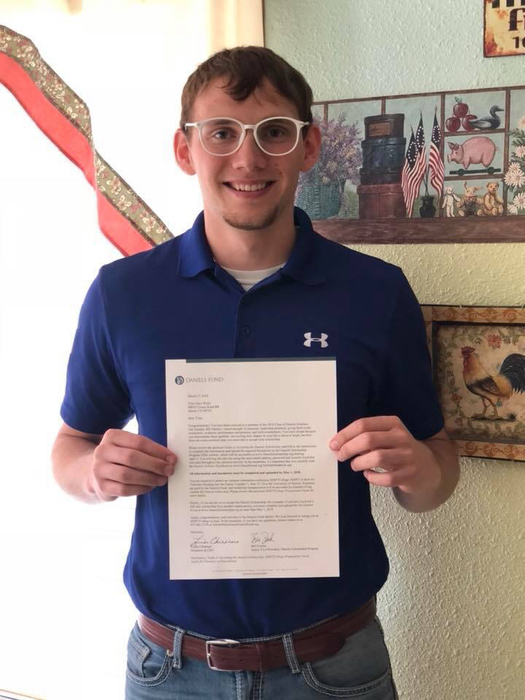 We are proud to announce that Akron senior Tyler Wylie has received Daniels Fund Scholarship. Congratulations Tyler!! 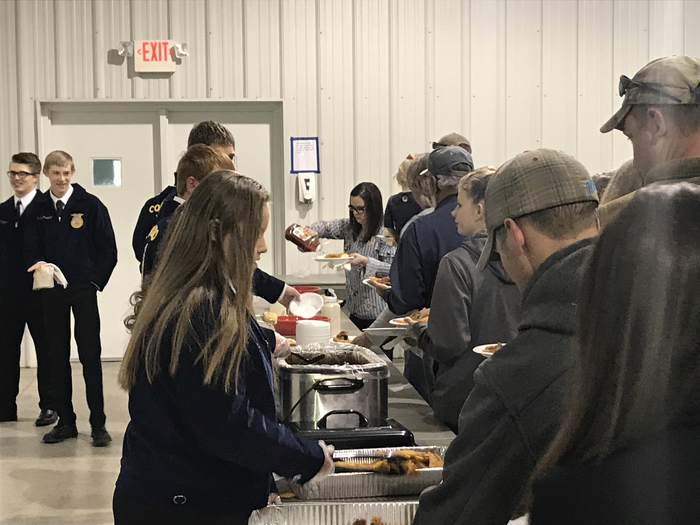 Akron FFA held their annual hired hand sale tonight. Thank you to everyone who came out to support our program and students! 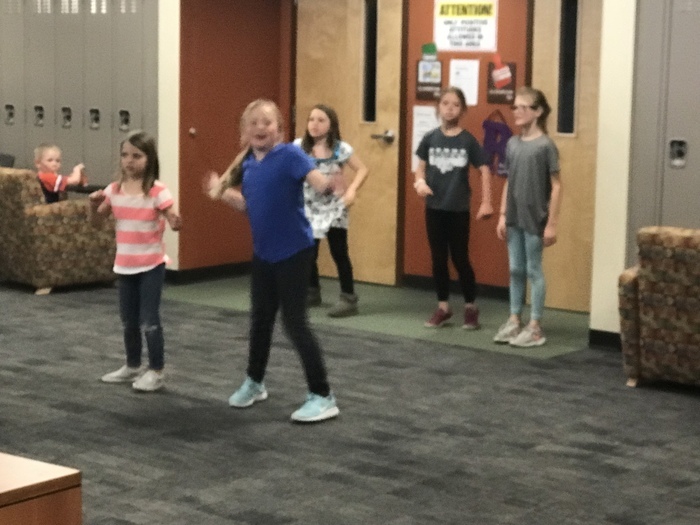 Mrs. Weis and her 3rd graders led the school in the fight song this morning. Go Rams! 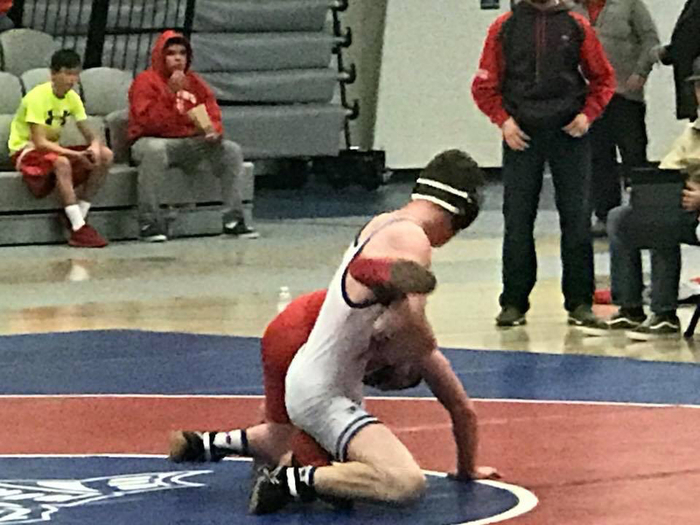 Akron Ram Justin Traxler was selected as an LPAA all-conference honorable mention wrestler. Congratulations Justin! The Akron H.S. 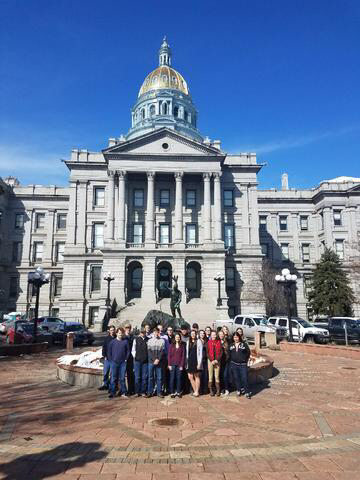 senior government class traveled to Denver yesterday and visited the Colorado State Capital building and the Ralph L. Carr Justice Center. 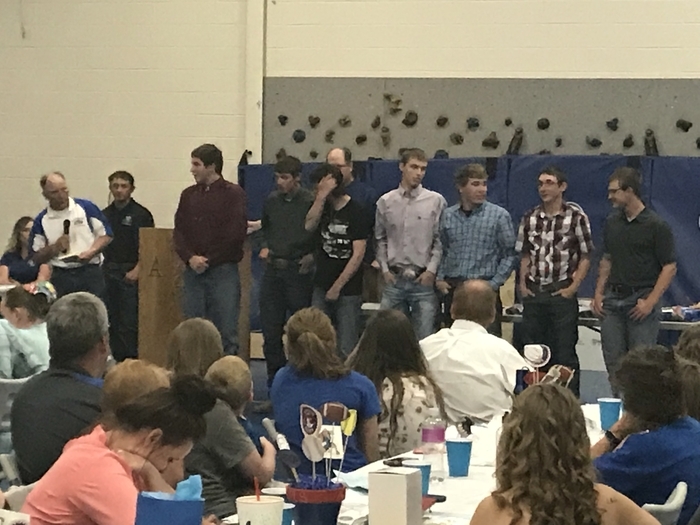 End of the Season Basketball Banquet honoring the basketball players and their seasons. Also, honoring the seniors and welcoming the incoming freshman. 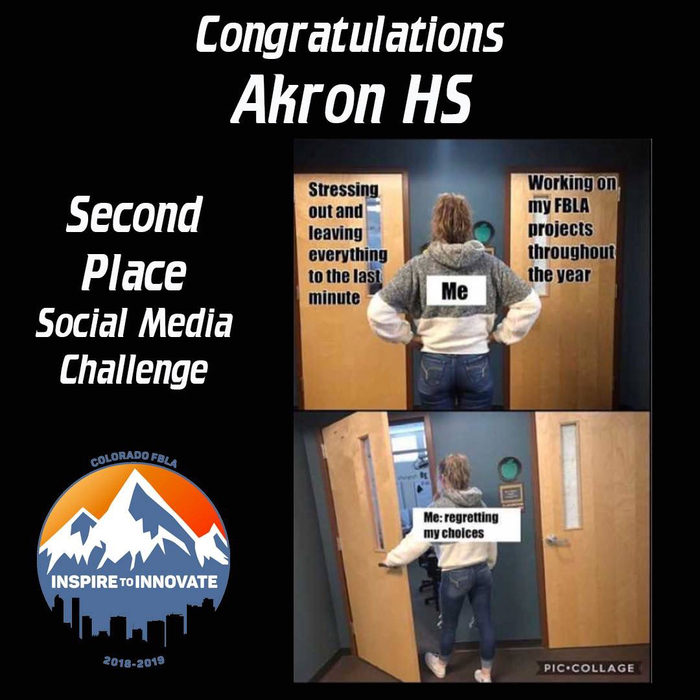 Congratulations to Akron H.S. basketball players Isaiah Herder and Katie Arnold. Isaiah was selected to the LPAA all-conference boys team and Katie was selected to the LPAA girls all-conference honorable mention team. Go Rams! 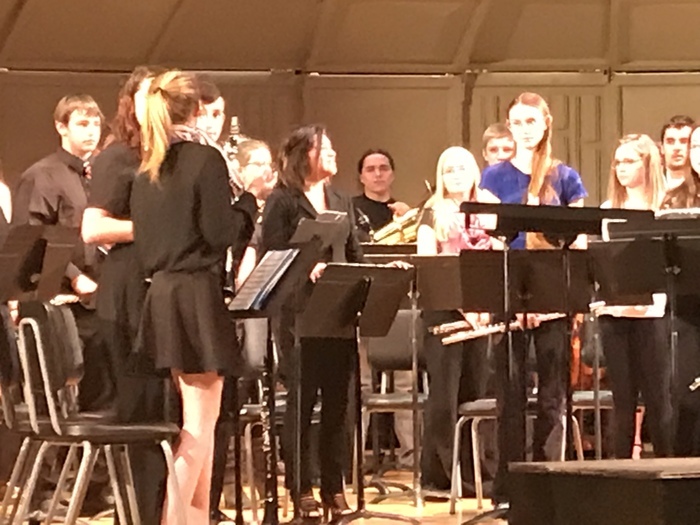 Pictures of our students at Honor Band in Holyoke. 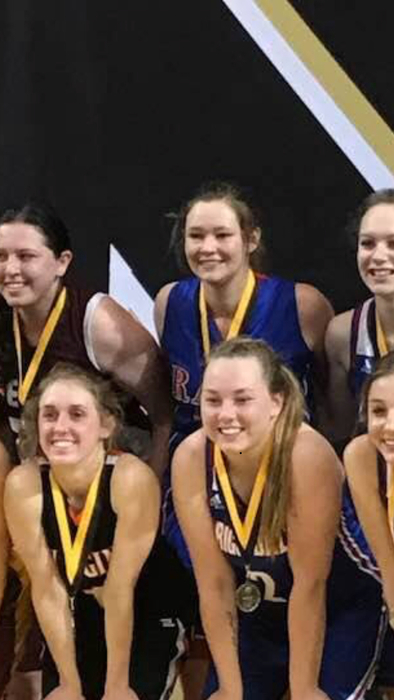 Akron seniors Katie Arnold and Raul Alvarez played in the NJC Basketball Senior Showcase today in Sterling. Congratulations Katie and Raul! We have enjoyed watching you represent the Akron Rams in basketball. Go Rams! 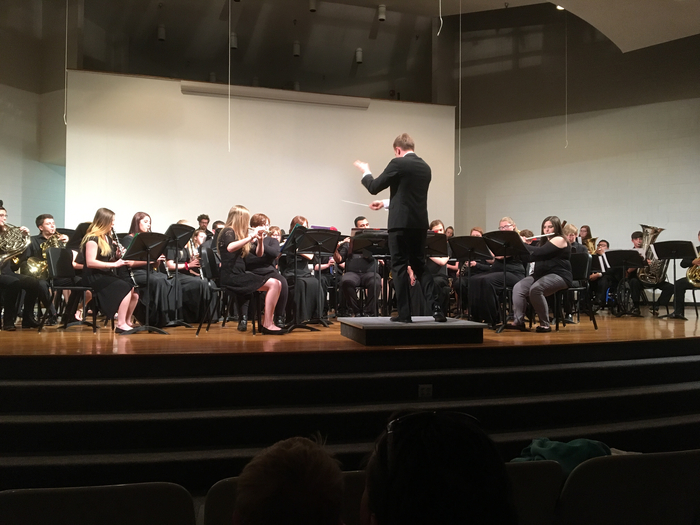 Akron Ram Activities March 26th –April 1st Word of the Week: Orderliness 3/26-​Honor Band @ Holyoke (all day) ​FFA Quiz Bowl/Officer Interview 6 p.m. ​BOCES Board Meeting 6:30 p.m. ​Honor Band Concert @ Holyoke 6:30 p.m. 3/27-​Senior Government State Capitol Trip (all day) ​H.S. 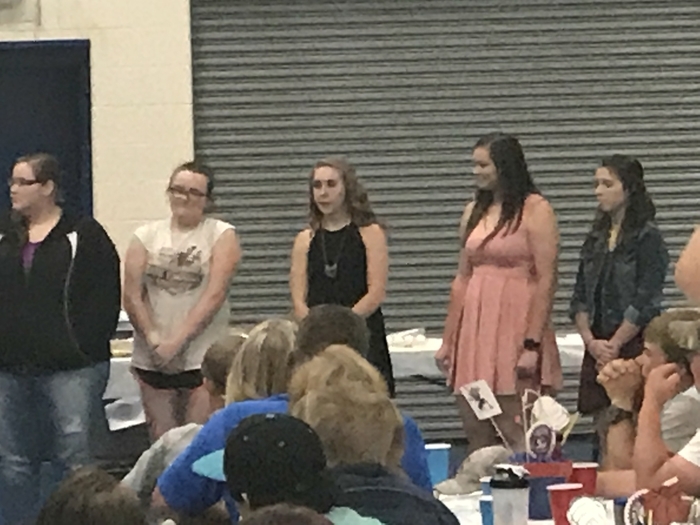 Basketball Teams End of Season Banquet 6:30 p.m. 3/28-​FBLA Meeting 7:25 a.m. ​FCCLA Meeting 3:30 p.m. 3/29-​H.S. 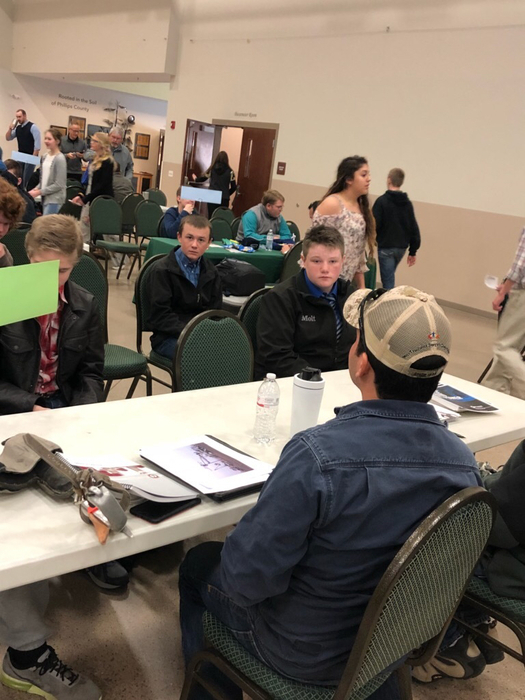 Track @ Holyoke 9 a.m. ​Washington D.C. Trip Meeting 5:30 p.m. ​FFA Hired Hand Sale @ Event Center 6 p.m. 3/30-​No School ​H.S. 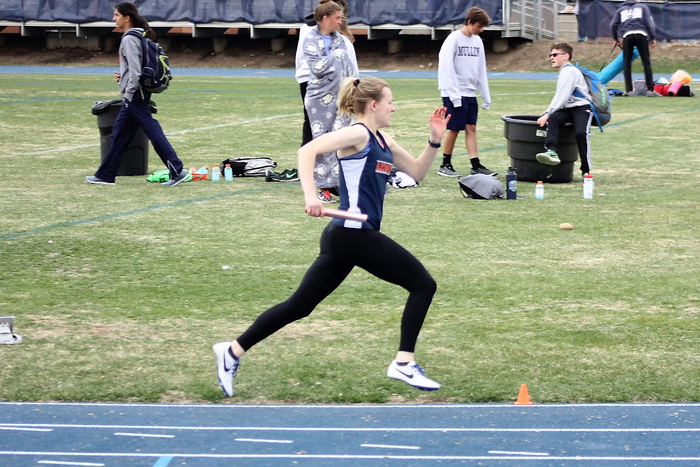 Track Pictures 9 a.m. 3/31-​H.S. 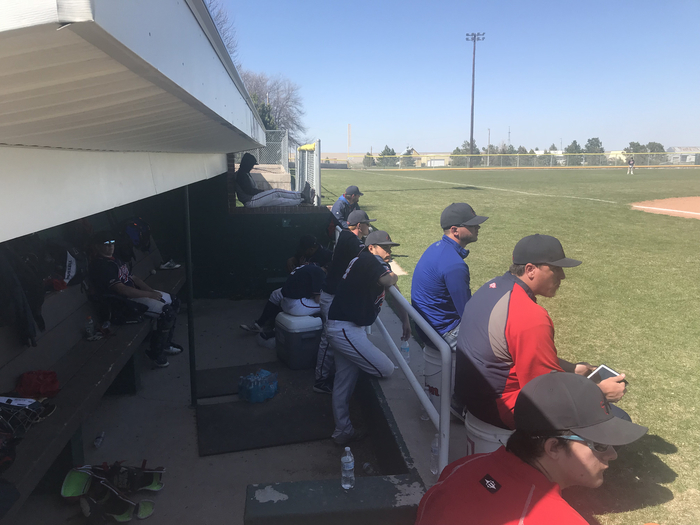 Baseball @ SedgCo (Ovid) 11 a.m. 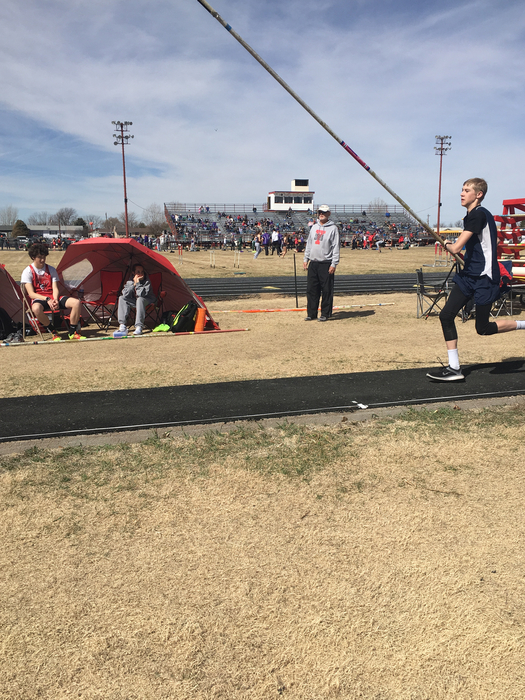 The Akron Ram track athletes were in action yesterday at Yuma. 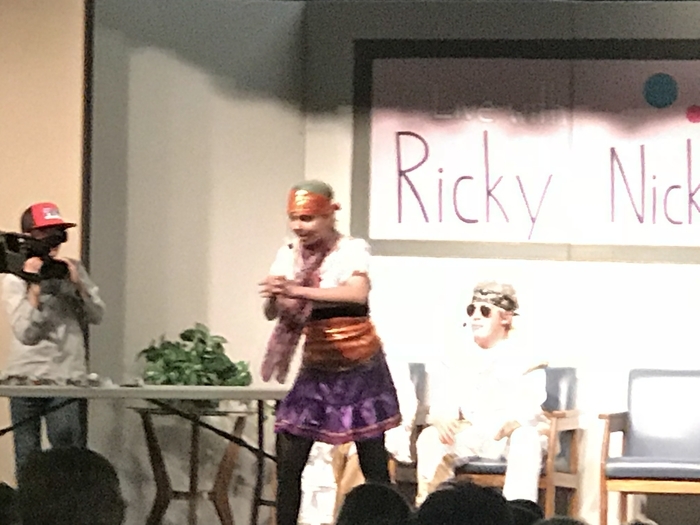 The Ram teams had several good performances. Go Blue! 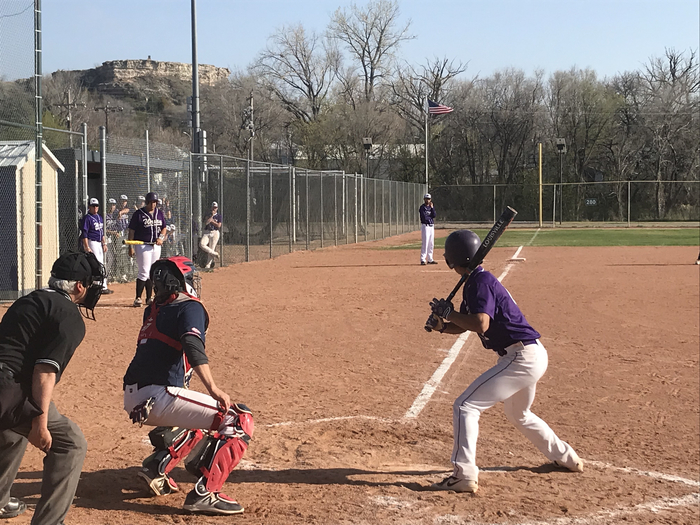 The Akron Ram baseball team played well yesterday but lost both games of their double-header to Holyoke 5-11 and 3-14. Keep working to improving Rams! Akron H.S. 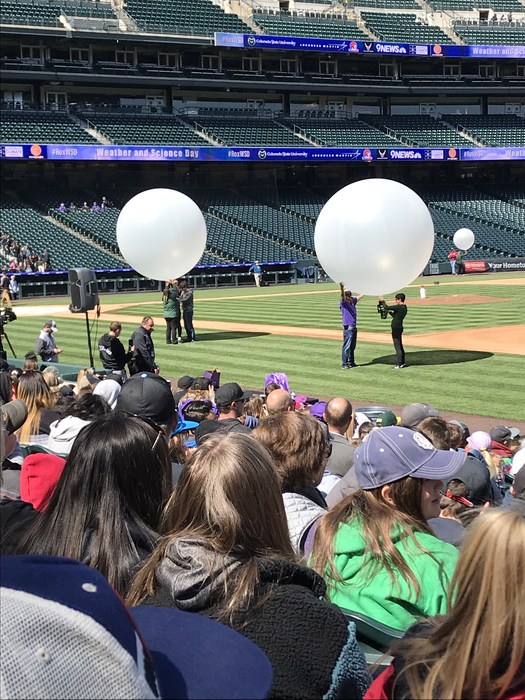 students attended “Beyond the Ice” yesterday in Denver. 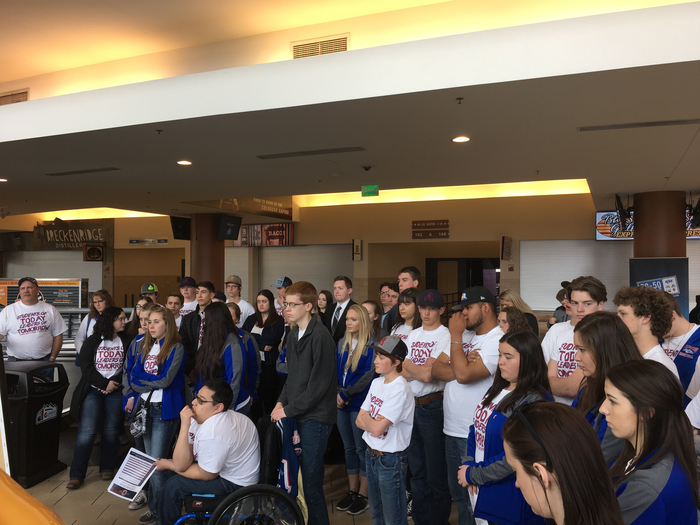 Students learned about the different stations and careers at the Pepsi Center and then attended a Denver Avalanche game last night. 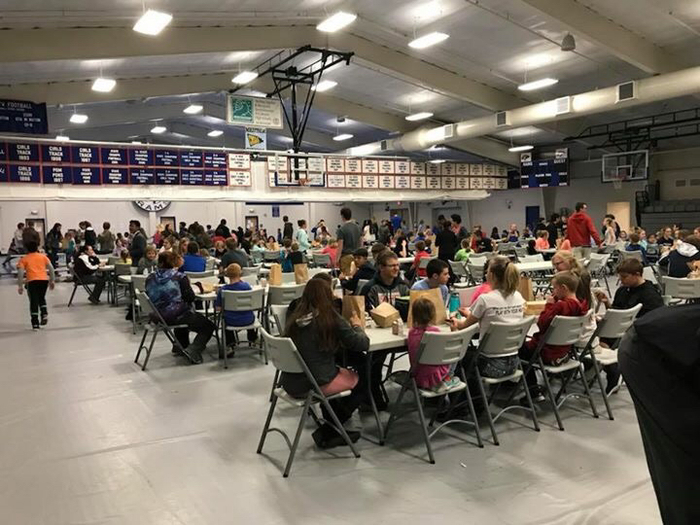 PTSO Family Night- Several parents and students made it to the dinner and activities put on at the school by Akron PTSO last night. Thank you to everyone who helped make this event a success. 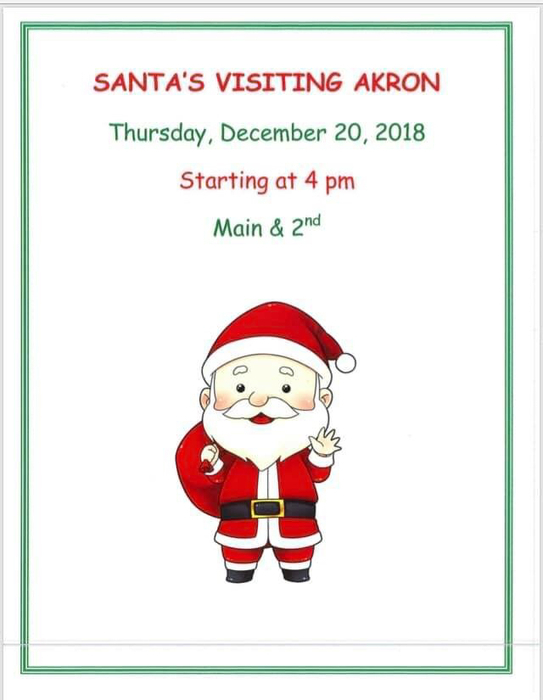 Check out this week's Akron School Newsletter: http://5il.co/30nv In this issue you will find some important dates to put in your calendar! The Akron H.S. 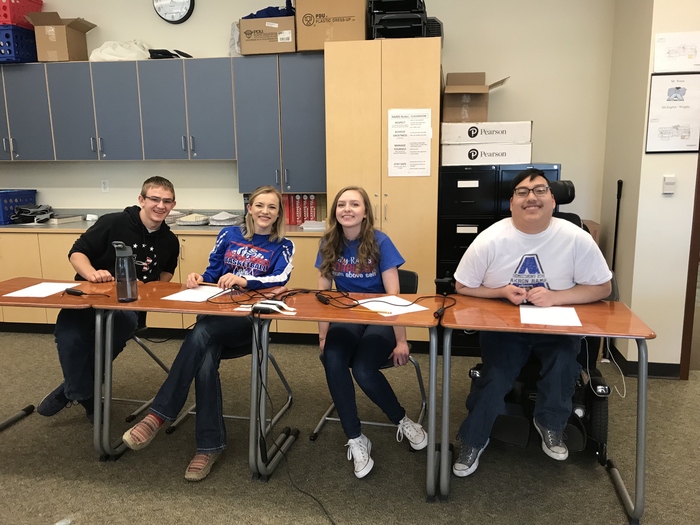 knowledge bowl team finished in 4th place at the state 2A competition. 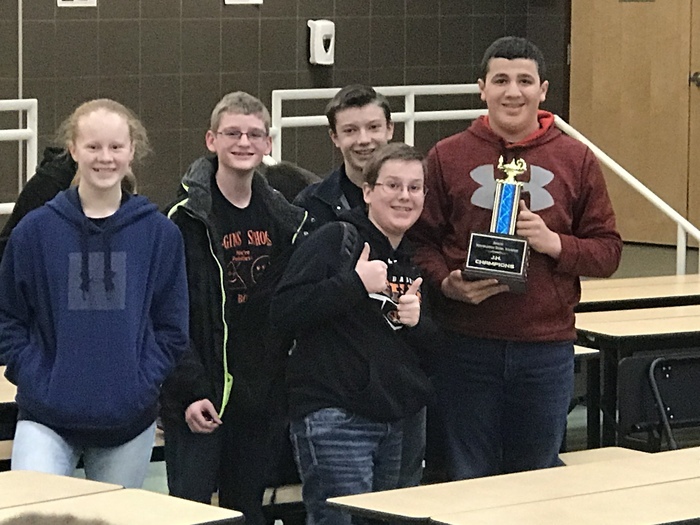 The team was just three points from making the championship round. Congratulations to our students and their coach Mrs. Denise Pickens. Go Rams! 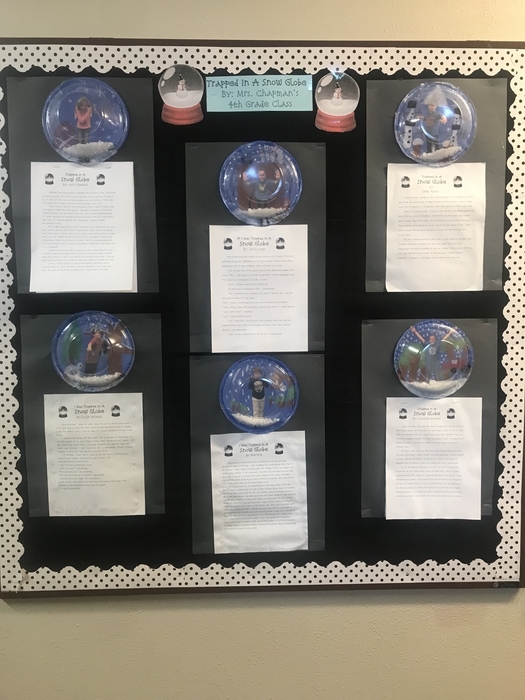 Our 2nd graders are learning about Amelia Earhart! 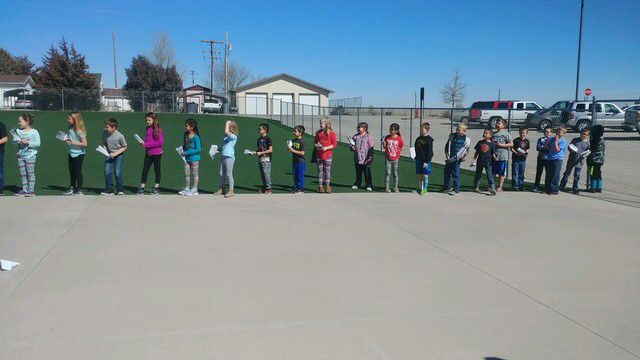 So we had a paper plane flying contest yesterday. 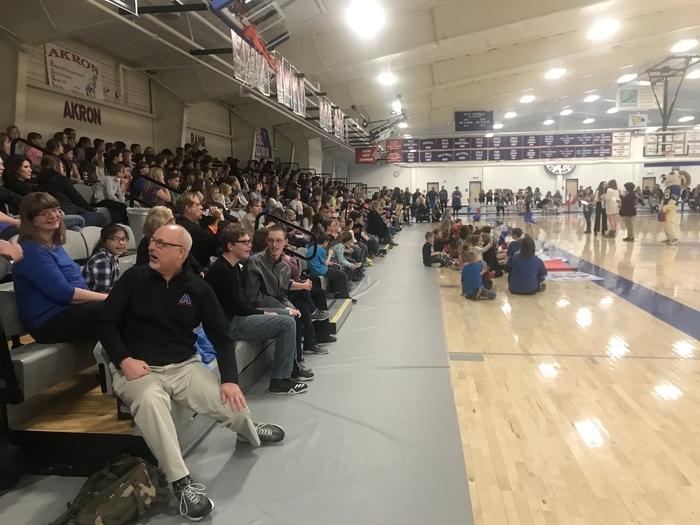 Knowledge Bowl Pep Rally We had a pep rally for our 2A Regional Champion Knowledge Bowl on Wednesday. 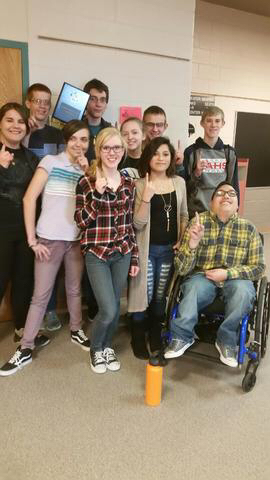 They will be competing at State next week. Go Rams! 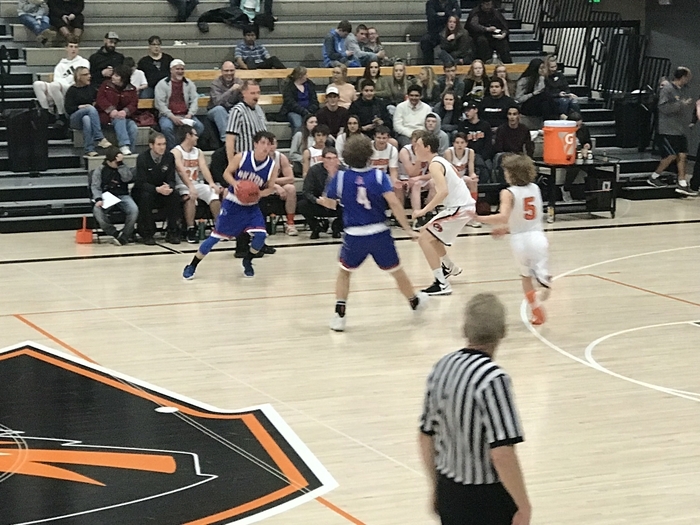 HS Regional Boys Basketball The Akron Rams played tough on Friday night but lost in overtime to Calhan 52-60. Good season Rams! 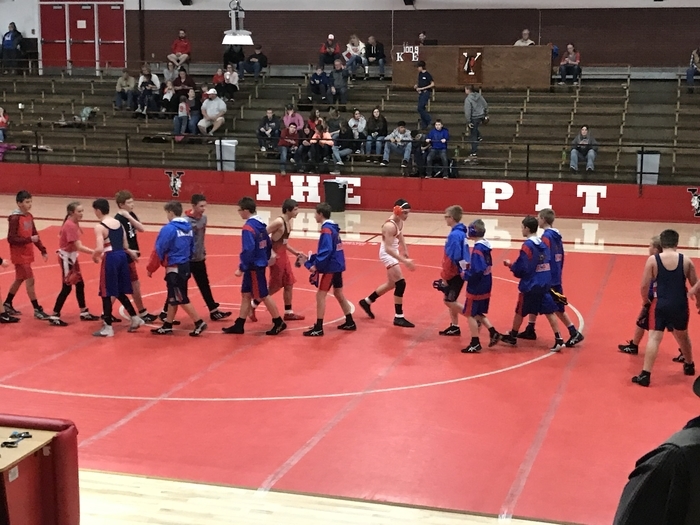 JH LPAA League Tournament The Akron Ram wrestlers had some very good individual performances and tied for 3rd place as a team at league. Go Rams! 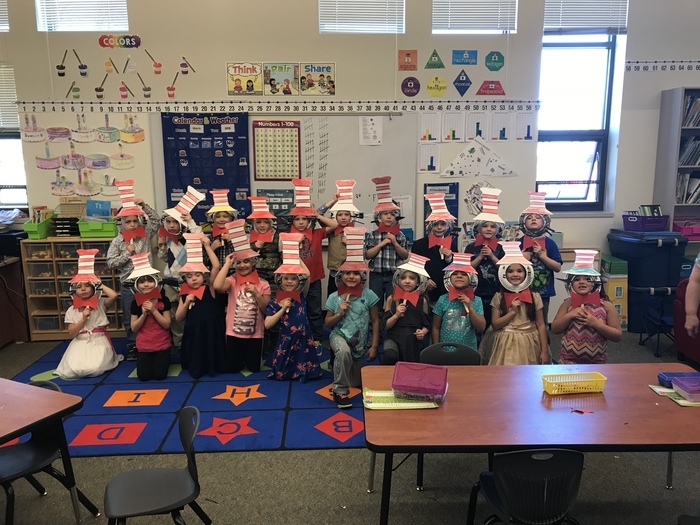 Our students had fun with Read Across America Week celebrating the birthday of Dr. Seuss. 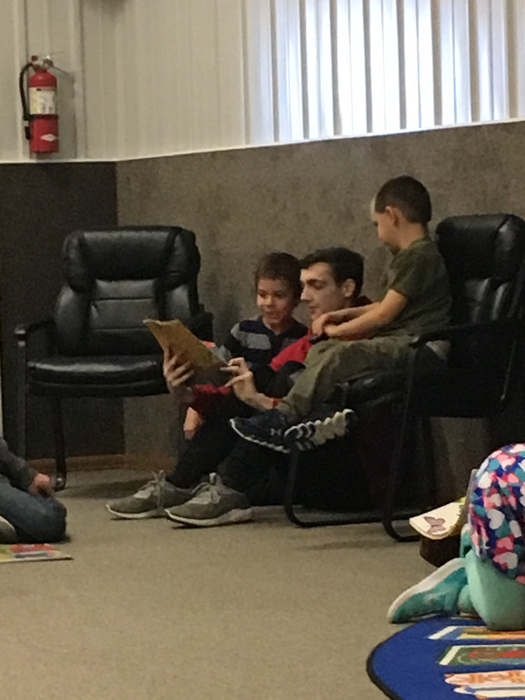 Big Buddy Program Our students read Dr. Seuss books to each other this morning. 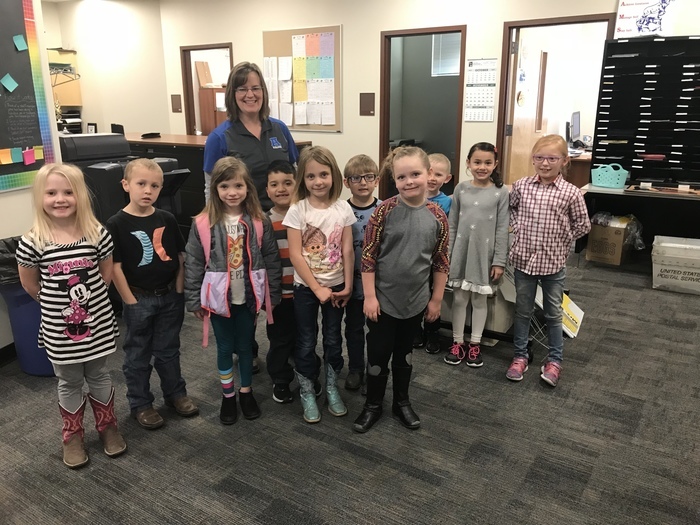 Mrs. Bowin and her first graders were in the office this morning and led the school in the fight song. Go Rams! 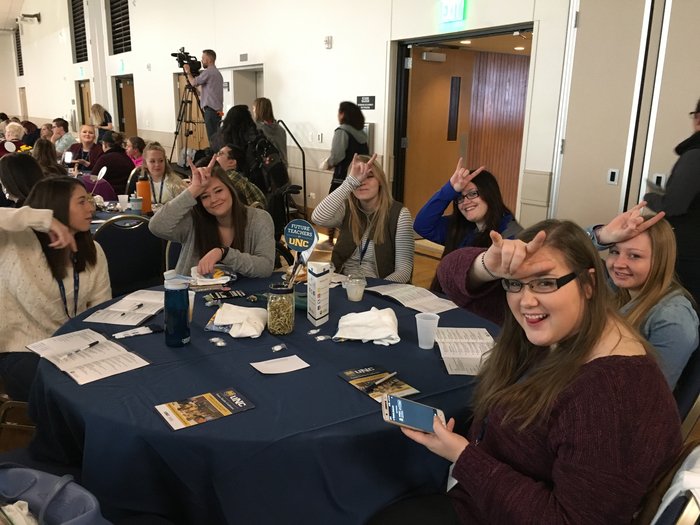 Akron Counselor, Britney Weers took a group of Akron students to the UNC Future Teachers Conference on Thursday and Friday. 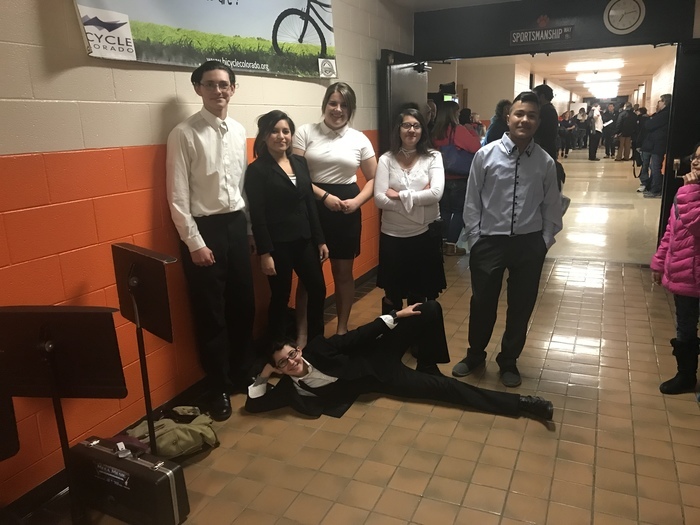 Akron students at the Solo Ensemble Contest held today in Ft. Morgan. 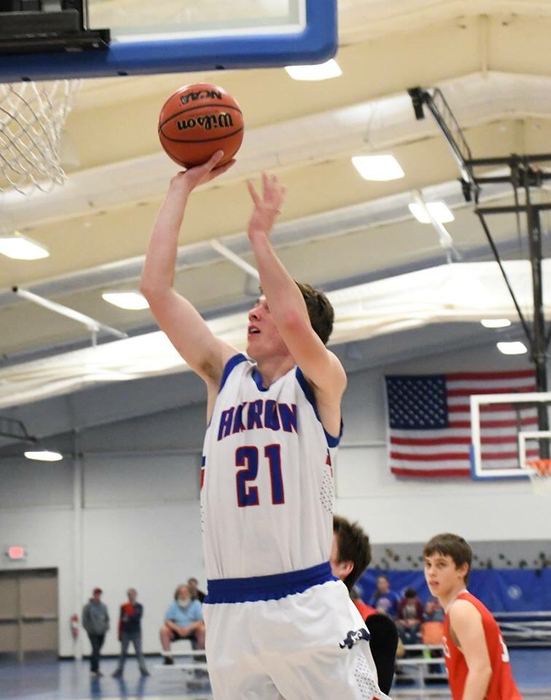 BOYS BASKETBALL The Akron Ram basketball team will play the Haxtun Bulldogs this evening at NJC. 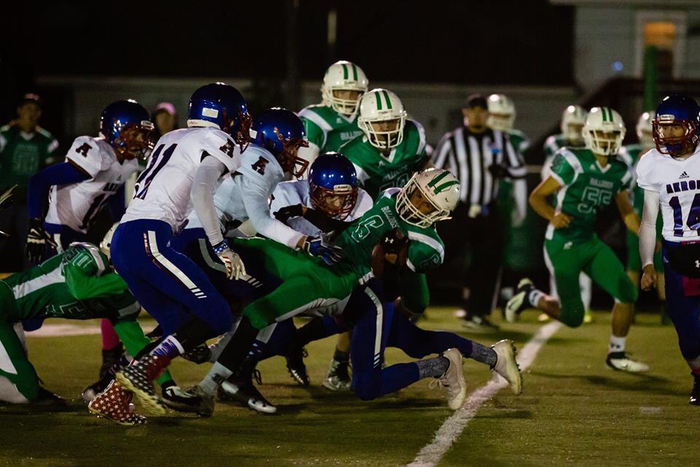 Game time is scheduled for 5:30 p.m. Make the trip to Sterling and support the Rams! 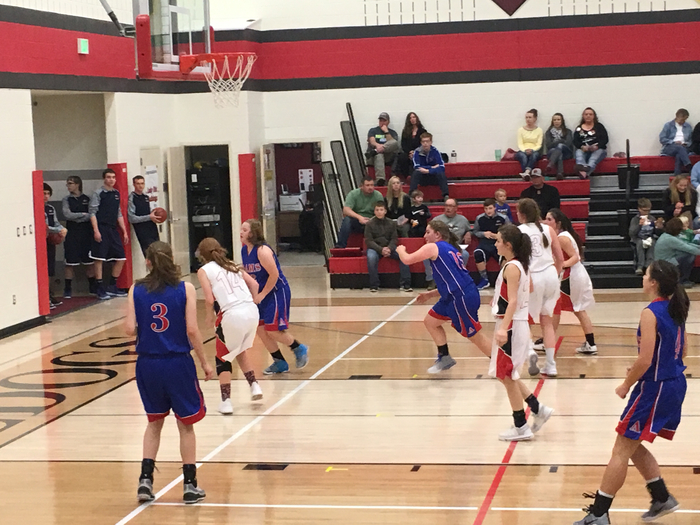 The Akron Ram basketball team played tough against top seed Yuma in the district semis but lost 65-43. The Rams will play in the 3rd place game tomorrow at NJC. 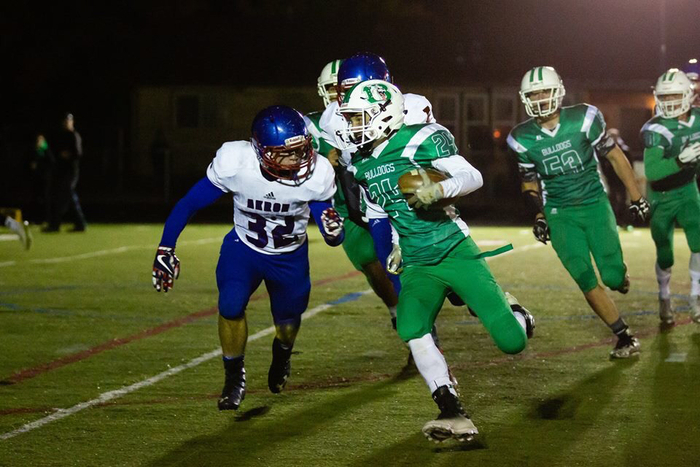 Game time is scheduled for 5:30 p.m. Go Rams! 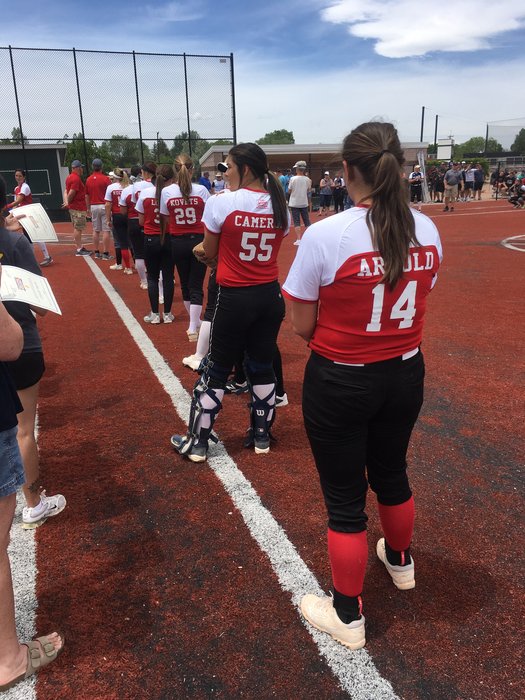 Tournament Cancelled The Akron J.H. wrestling tournament scheduled for tomorrow, February 24th has been cancelled. Unfortunately, we had some teams drop out and additional concerns with the overnight weather forecast. 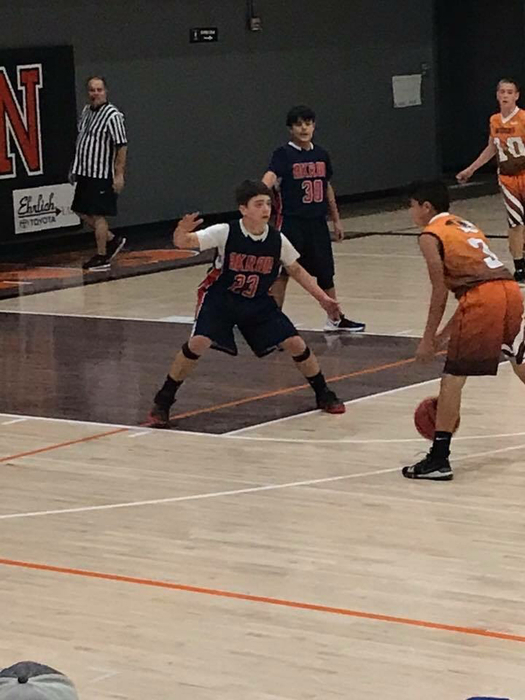 BOYS' DISTRICT BASKETBALL TONIGHT: Akron Rams vs. Yuma Indians @ NJC 4:30 p.m. Come show your support! Also, if you haven't yet - download the school app from the app store (akronrams). GO BLUE! 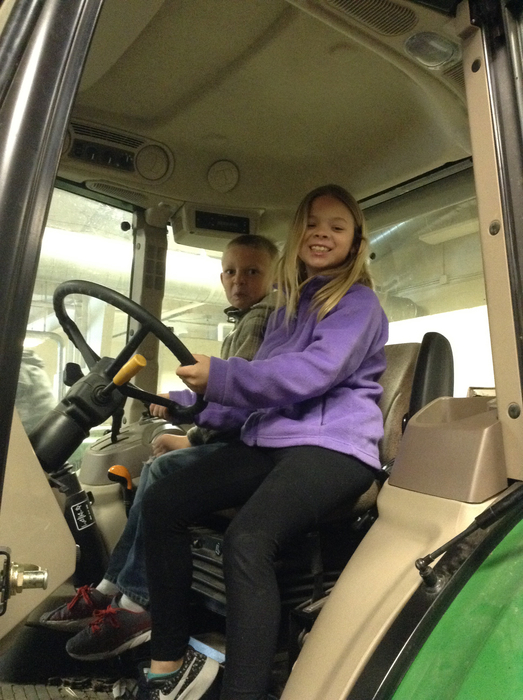 Some of our elementary students were able to experience Tractor Day as a part of FFA week. REMINDER: Parent/Teacher conferences will be held tonight from 4:00 pm - 8:00 pm and tomorrow morning from 7:30 am - 11:30 am. Please call today to schedule an appointment! 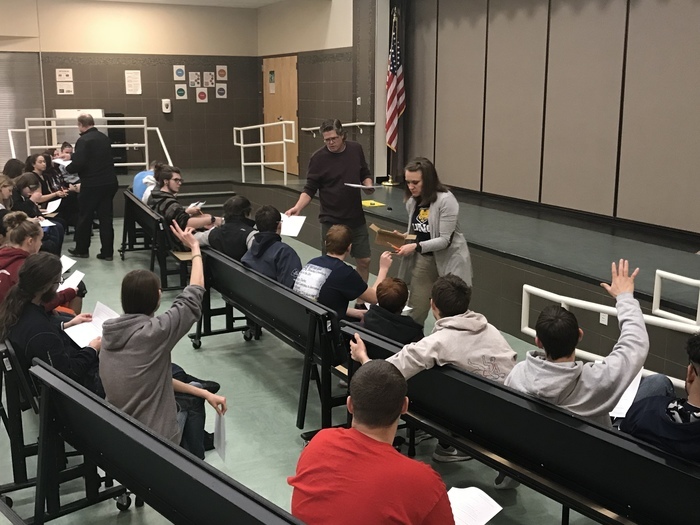 Akron high school students received some valuable information from a presentation today on apprenticeships and career opportunities. 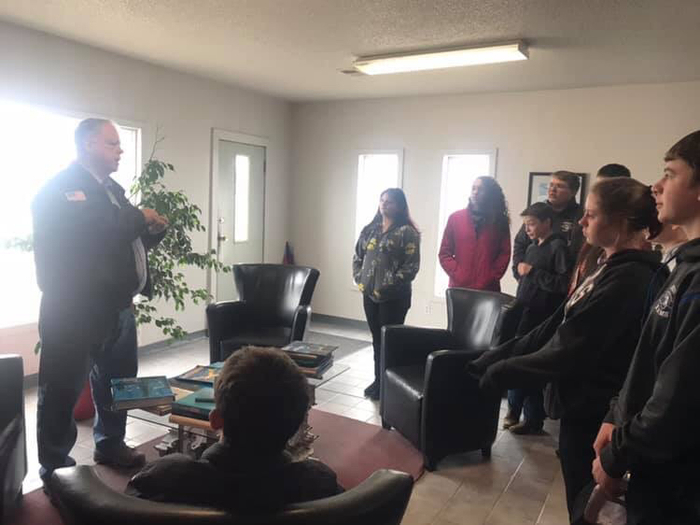 Mike Sullivan from Sedgwick County Economic Development was the main speaker. 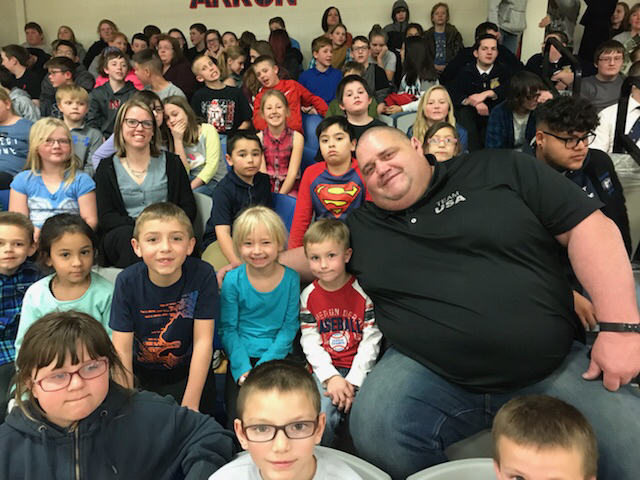 The Akron School wishes to thank those who helped donate and sponsor bringing Rulon Gardner to our school and community. Thank You! 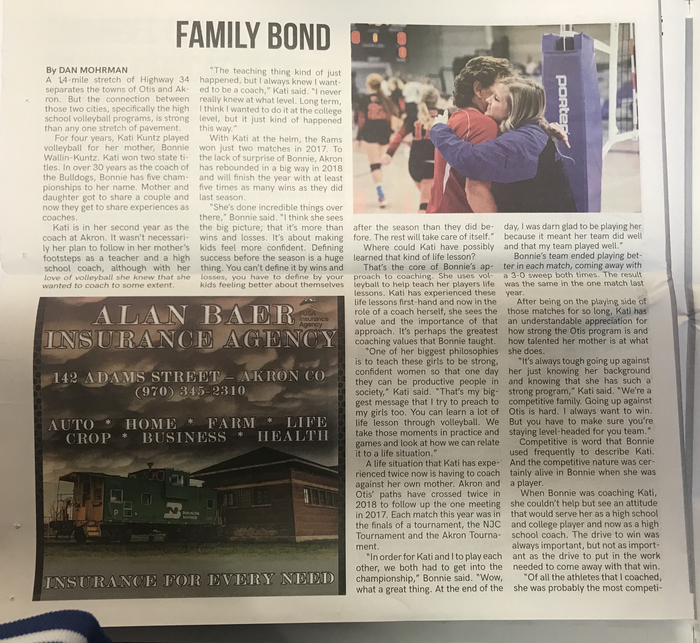 Bank of Colorado, Alan Baer Agency, Akron Wrestling Association, Glosson Construction, TBK Bank, Luke & Kristin Crumley Family, Layne and Samantha Crumley, and All-American Sports- Dave Vondy. 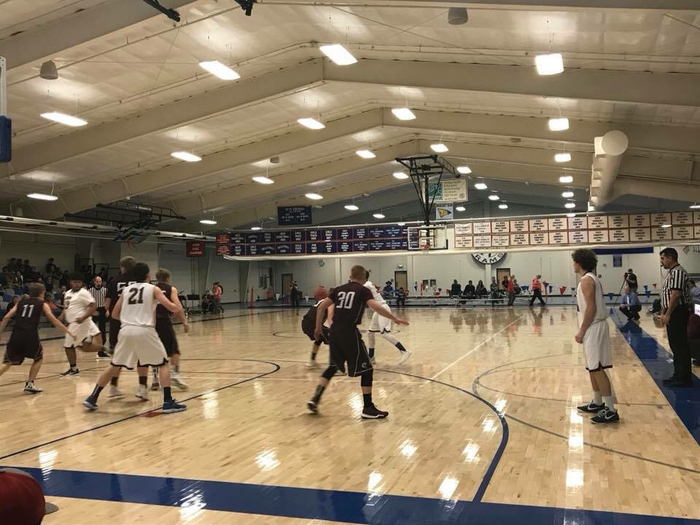 The Akron Ram boys basketball team won an overtime thriller against the Merino Rams 60-58. Akron will now move on to the district semi-finals on Friday. Go Rams! 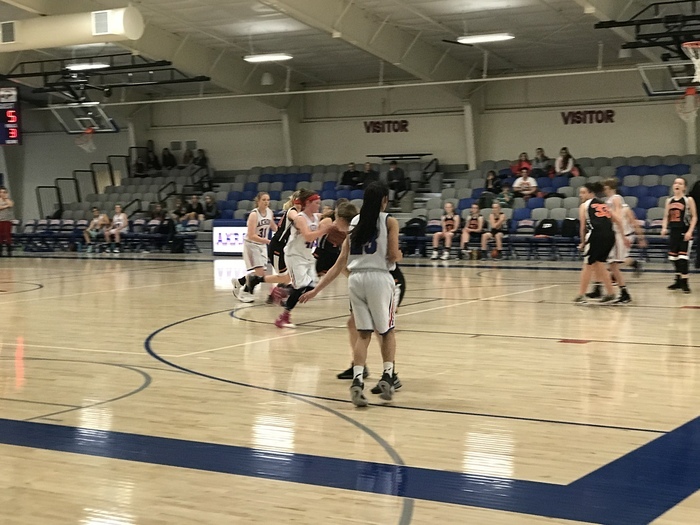 The Akron Lady Ram basketball team played hard against a very good Yuma Lady Indian team. The Rams lost 64-37 ending their season. Go Rams! 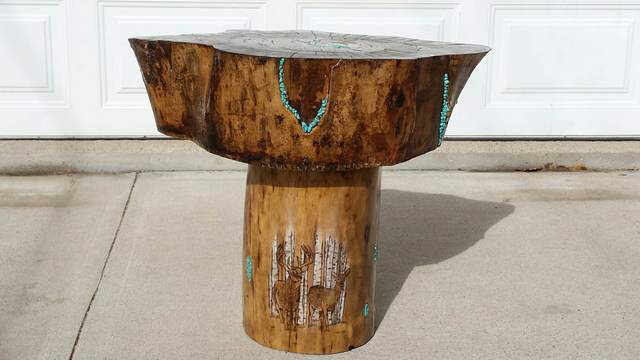 Akron art student, Cassandra Gomez, made this beautiful small table in Mrs. Campbell’s art class. 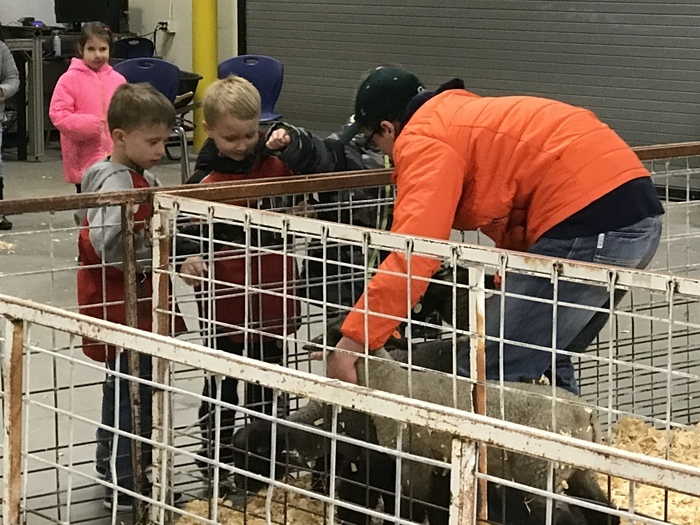 FFA Week Akron FFA students put together an animal barnyard for FFA week. 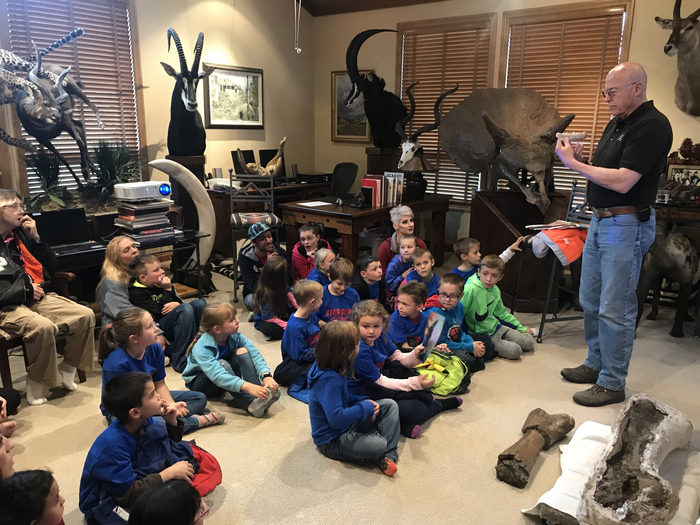 Our younger students enjoyed learning about the animals. 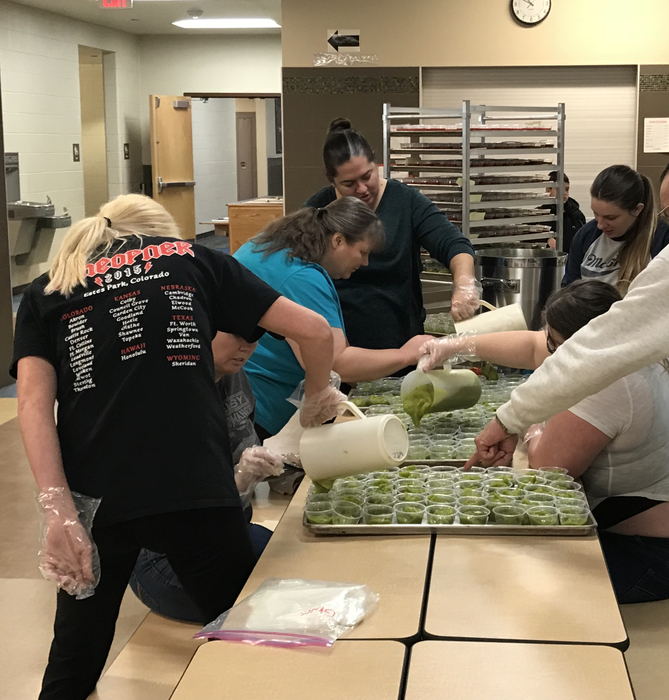 Rockin’ Rams Refuel parent volunteers making a healthy snack for our students. Thank you! DISTRICT BASKETBALL TONIGHT: Come out & support the Akron Rams! 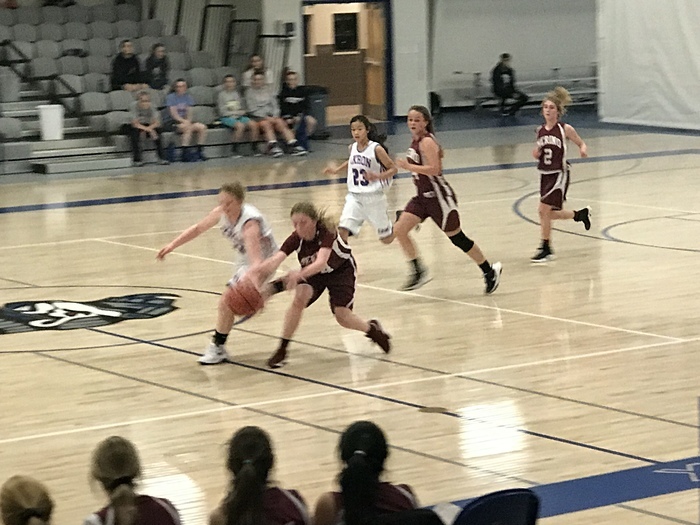 The girls play in Yuma @ 5:30 p.m and the boys play at home vs. Merino @ 6:30 p.m. GO BLUE! 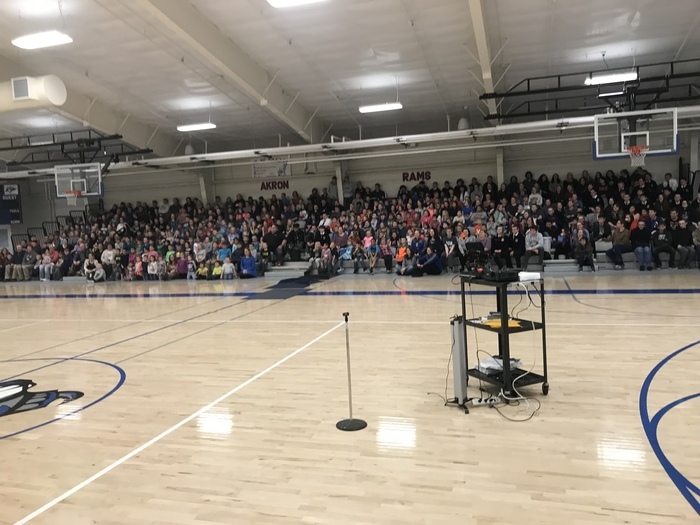 We were treated to an assembly today with Olympic Champion Rulon Gardner. 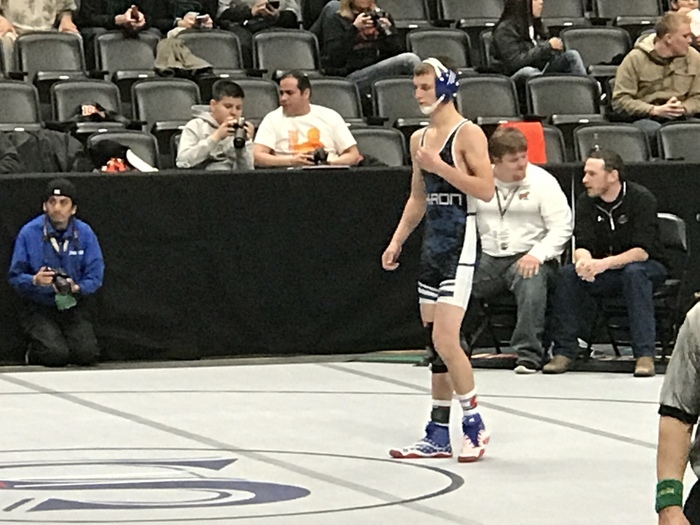 The Akron Ram wrestlers had a successful state tournament finishing with 37.5 points. 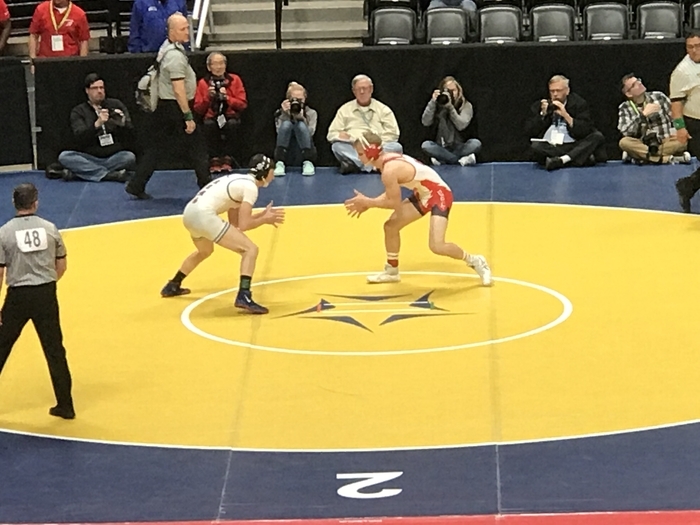 Senior Jeffrey Pieper made state in just his second year of wrestling. 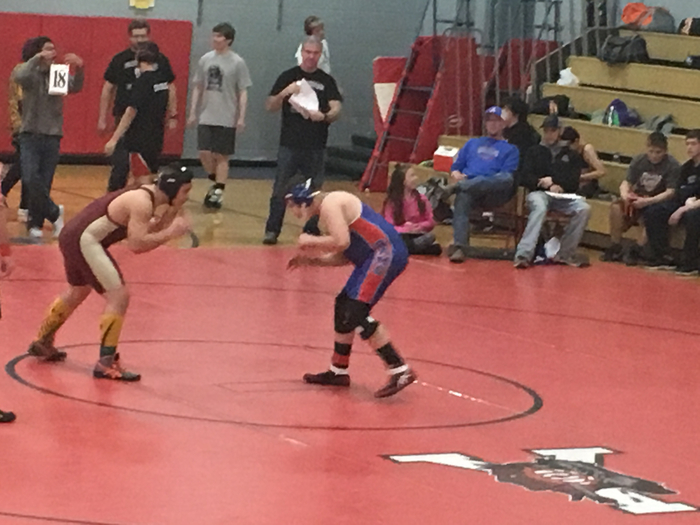 Juniors Seth Dorrenbacher and Derrick Poss finished just one match from placing. 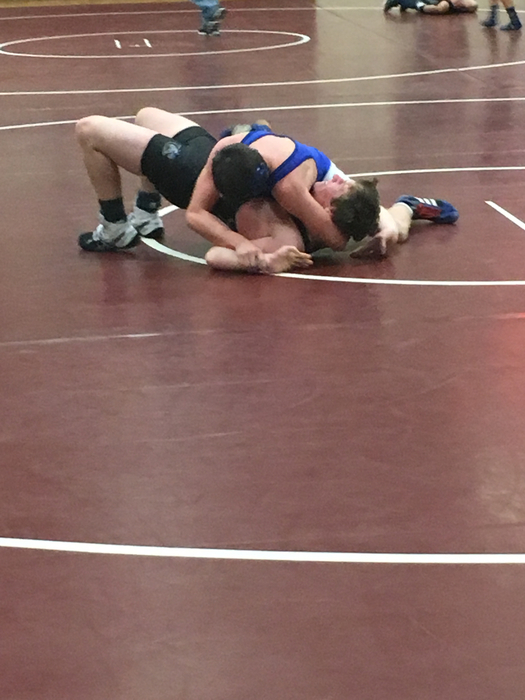 Juniors Justin Traxler and Carson Reese both finished the tournament with wins and 5th place finishes. The Rams will have these four wrestlers back as seniors next year to lead the squad. Thanks for giving us so much to cheer about gentleman! Go Rams! 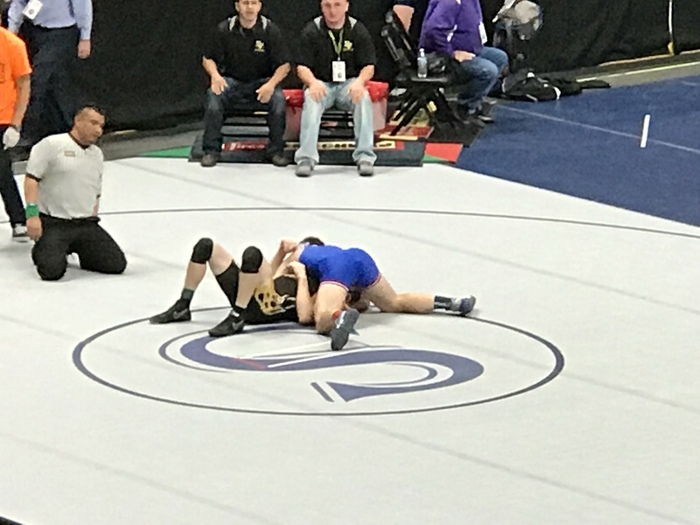 The Ram wrestlers finished the second day of the state wrestling tournament yesterday with 4 of 5 wrestlers still alive. 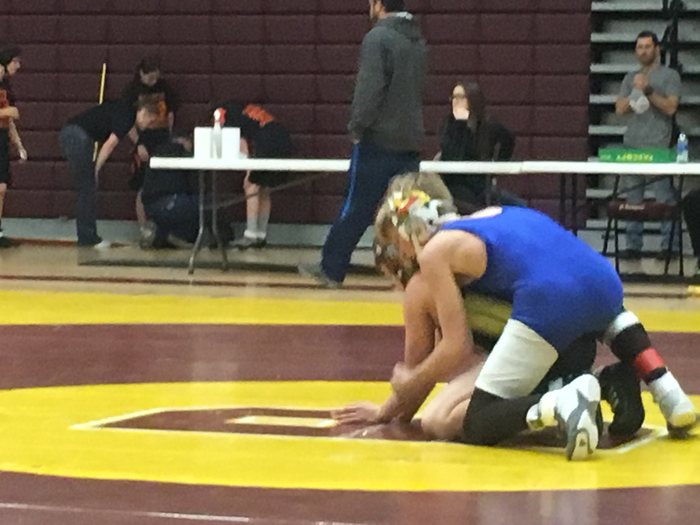 Seth Dorrenbacher won by fall, Carson Reese won by fall, Derrick Poss won by fall, and Justin Traxler lost by fall. 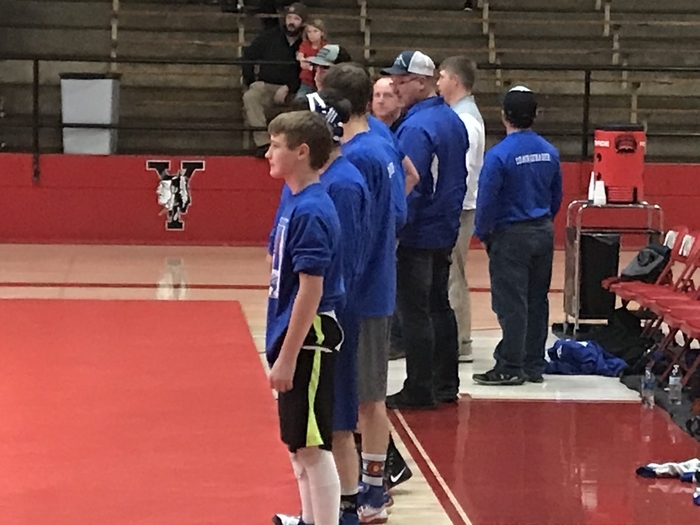 All four wrestlers will be in action this morning in pursuit of a state medal. Good luck Rams! 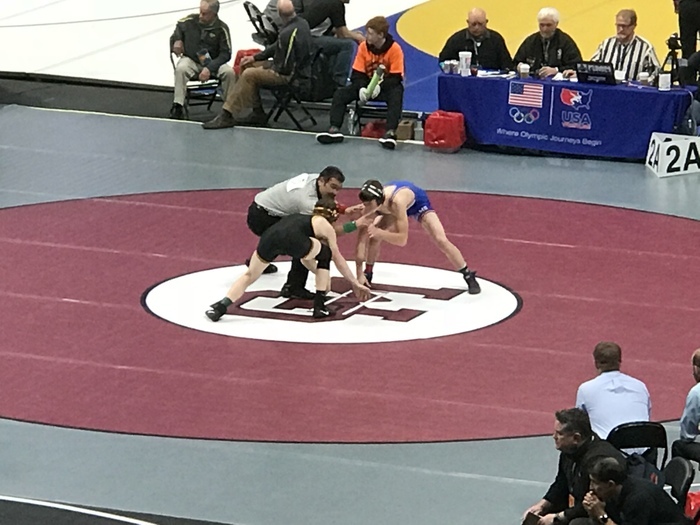 State Wrestling Update Justin Traxler advanced to tonight’s Semi-finals with a 15-0 tech. fall. 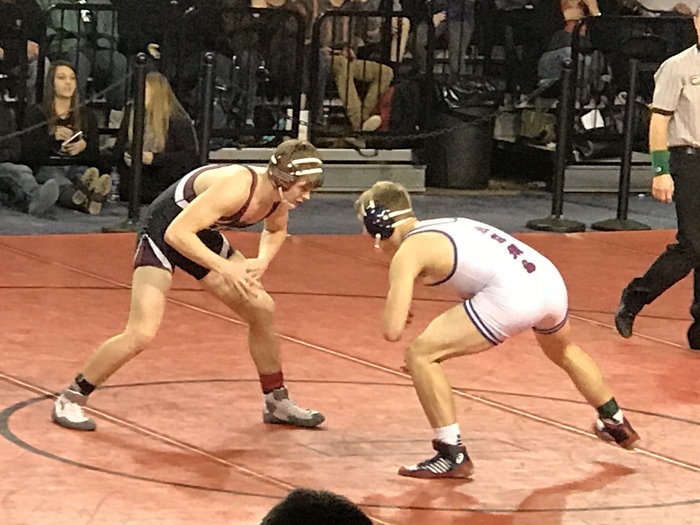 Seth Dorrenbacher, Carson Reese, and Derrick Poss will be battling in the consolation round tonight at 5:30 pm Go Rams! 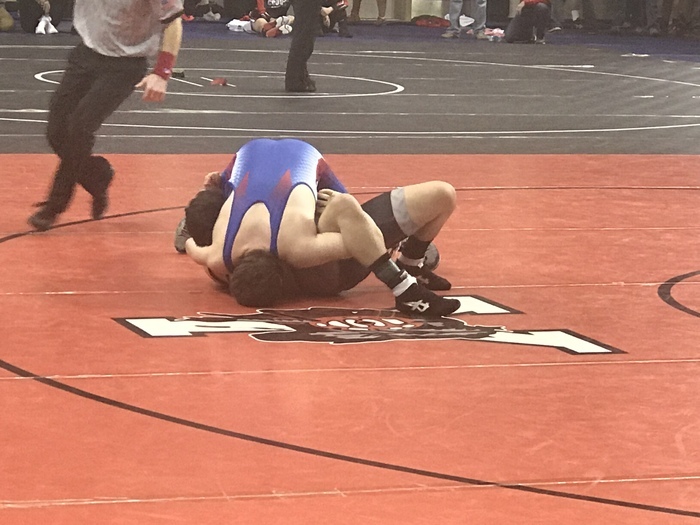 The Akron Ram wrestlers had a solid first round advancing 3 of 5 wrestlers into the quarterfinals. 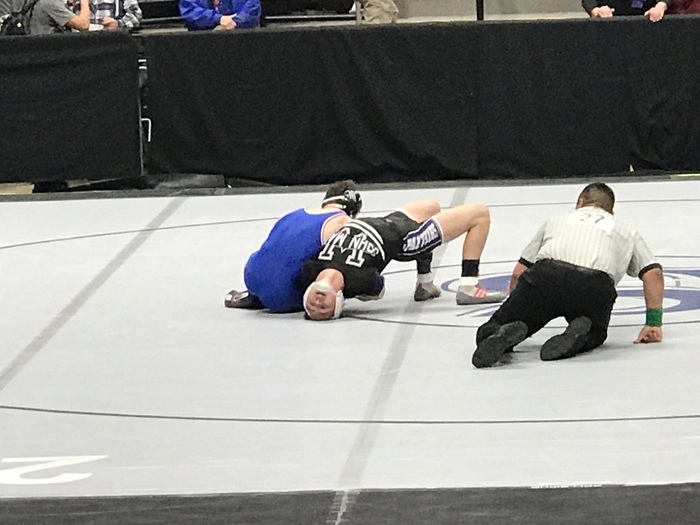 First Round Results: Seth Dorrenbacher won 7-5, Justin Traxler won 4-2, Carson Reese lost by fall, Derrick Poss won by fall, and Jeffrey Pieper lost by fall. Go Rams! 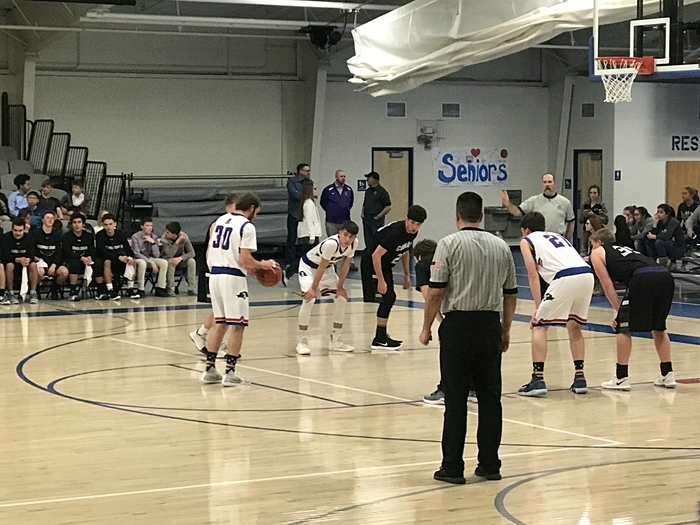 The Akron Ram basketball teams played at Yuma last night in their final league contests. 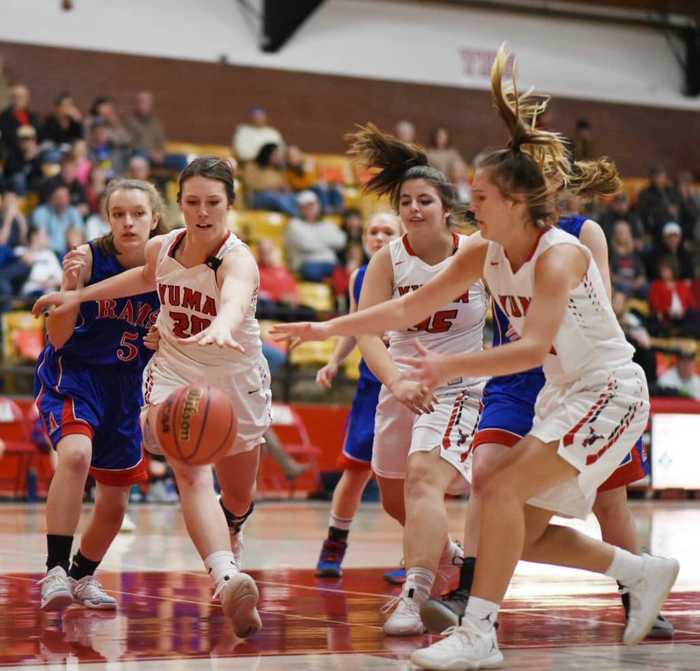 Yuma took both contests winning 67-20 in the girls game and 65-32 in the boys game. The Rams will start district play on Tuesday. Go Rams! 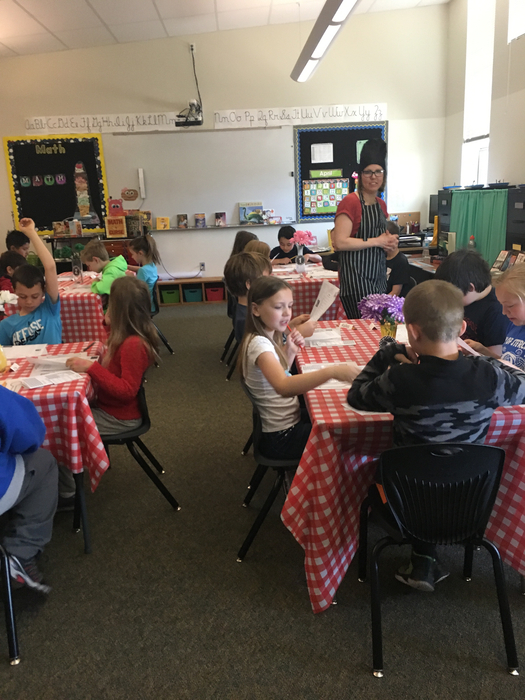 Today our elementary classes celebrated both 100’s Day and Valentine’s Day. Parent/Teacher Conferences are next Thursday the 22nd and Friday the 23rd. Please call the office to schedule your appointment! 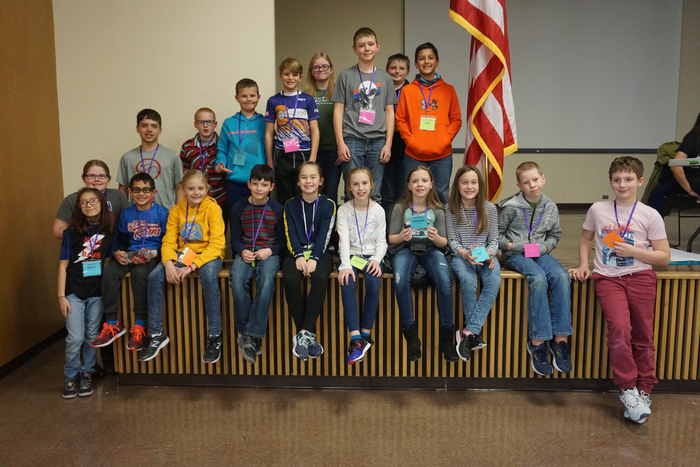 Mrs. Vogt took a group of our students to the Gifted and Talented Ultimate Summit held yesterday at NJC in Sterling. 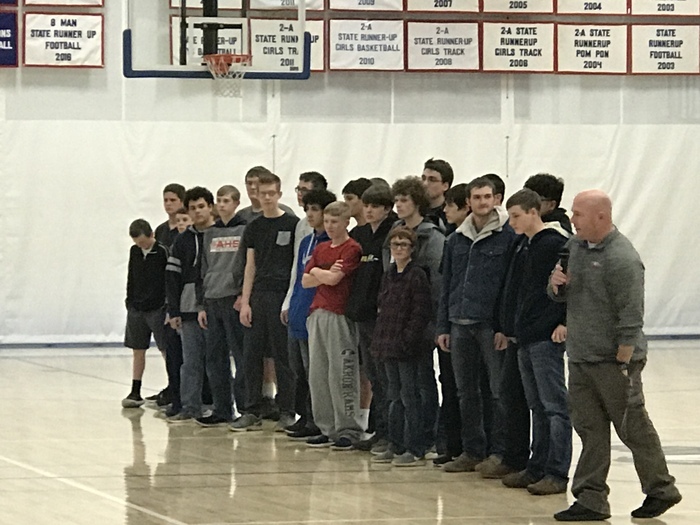 We will be giving our state qualifying wrestlers a send off this Thursday morning around 8 a.m. Please join us at the school or cheer them on while they head out of town. Go Rams! Ms. Lowry and some of her Akron J.H. and H.S. 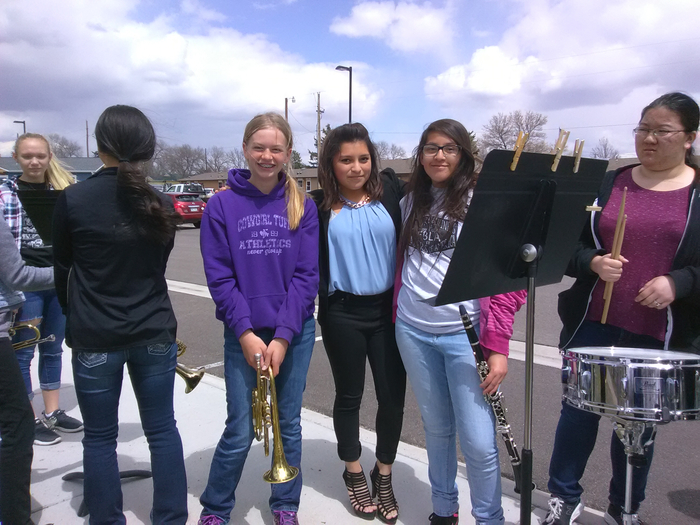 band students were at league band today in Sterling. 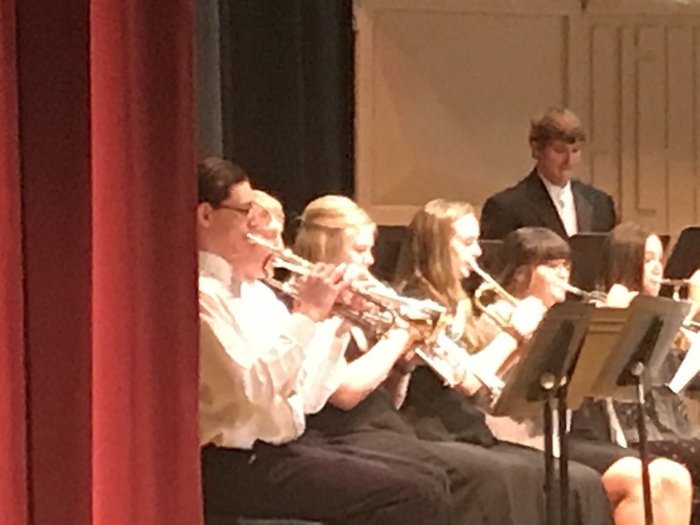 They joined other band students from NE Colorado to put on a concert tonight. Great job! Pictures of our J.H. wrestlers at their competition in Yuma this afternoon. Go Rams! 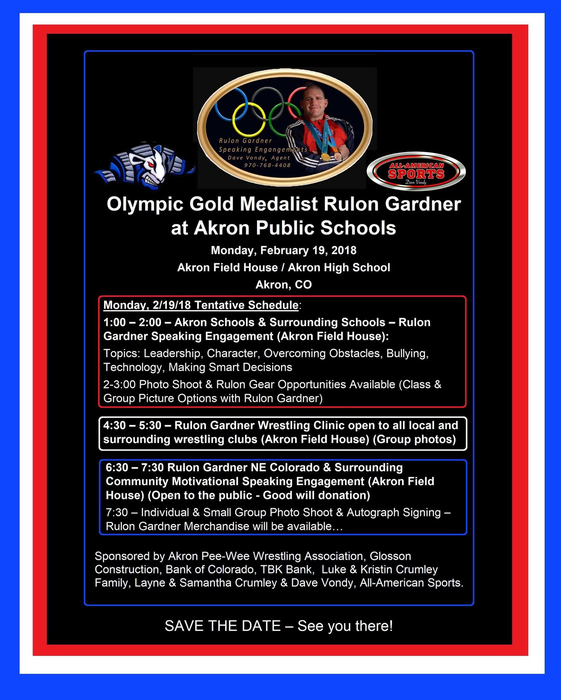 Join us on February 19th for an inspirational and motivational evening with Olympic Champion Rulon Gardner. 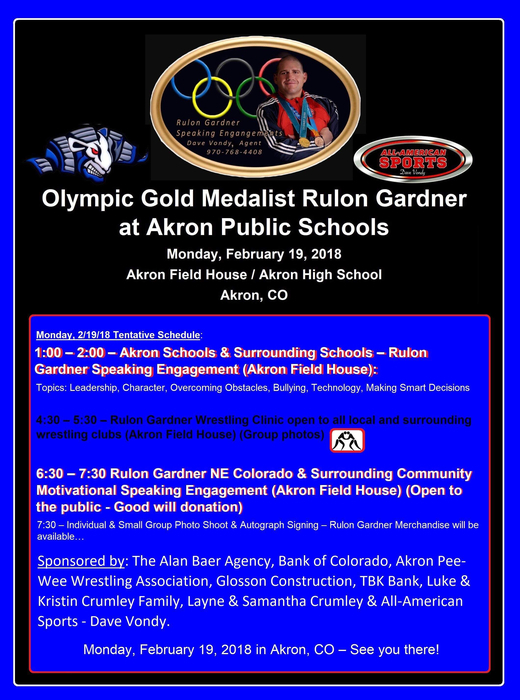 Rulon has a great story to share with people of all ages and backgrounds. See you on Feb. 19th at 6:30 p.m. 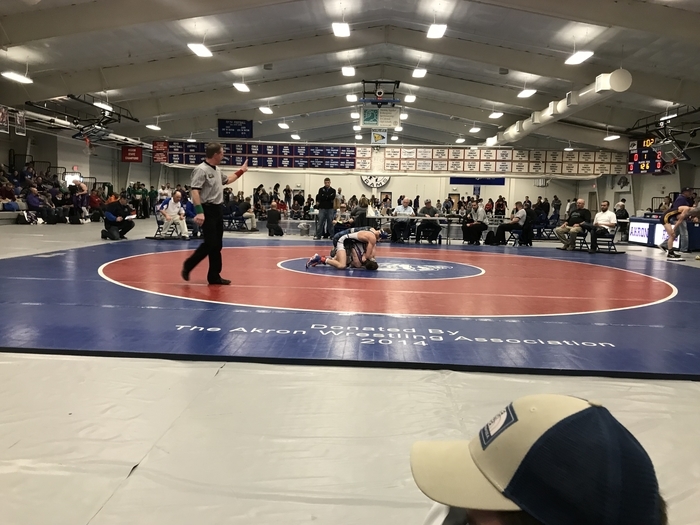 Region 3 Wrestling at NJC The Akron Ram wrestlers had five placers and placed 4th as a team with 96 points. Placers: Justin Traxler 2nd, Carson Reese 2nd, Derrick Poss 3rd, Seth Dorrenbacher 4th and Jeffery Pieper 4th. 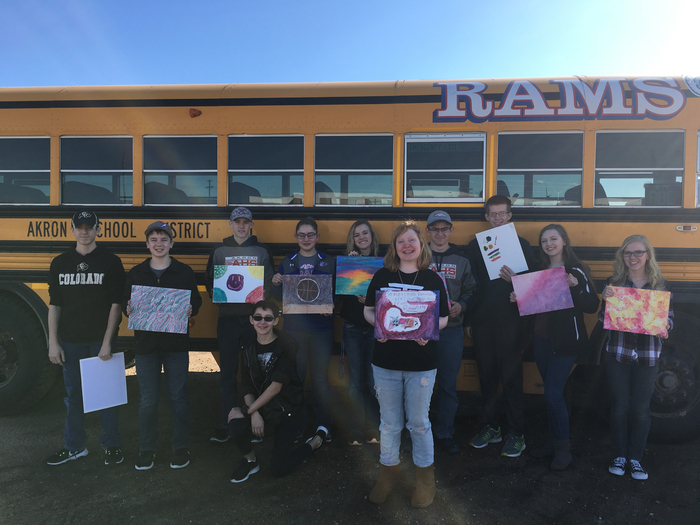 Good luck at State Rams! The Akron Ram J.H. 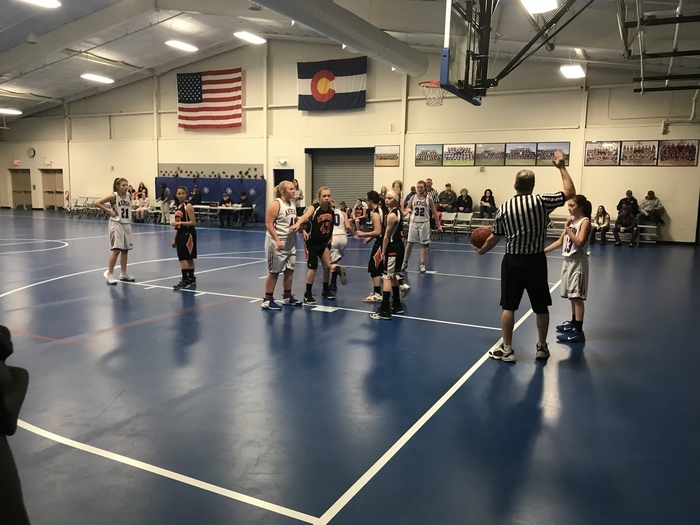 girls basketball teams competed in the LPAA league tournament today at Caliche. Our ‘A’ and ‘B’ teams both finished in 3rd place. 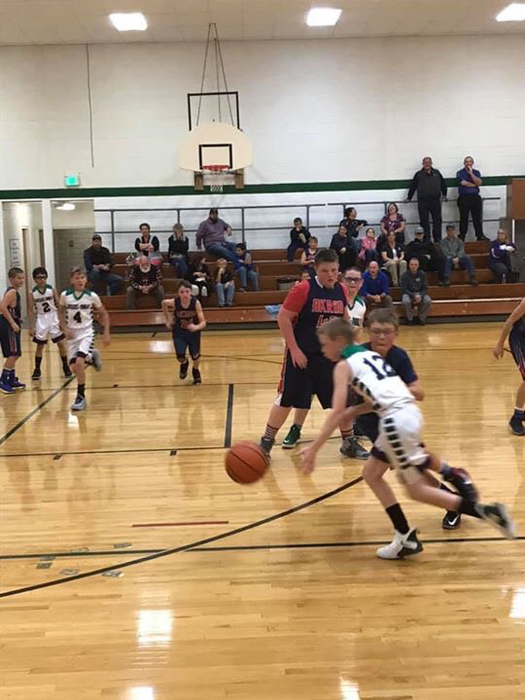 The ‘B’ team lost to Wiggins 11-17 then beat Caliche 48-12. 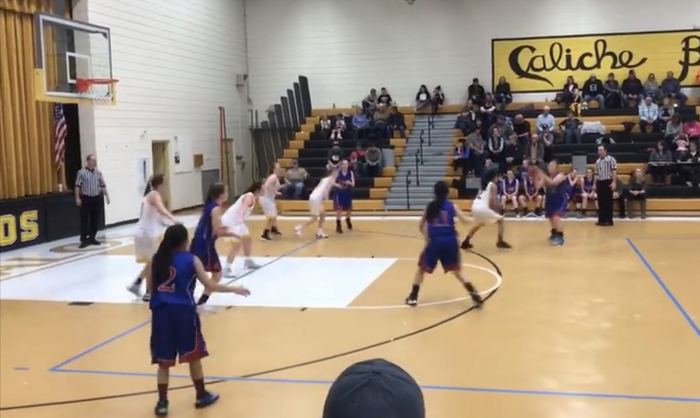 The ‘A’ team lost to Wiggins in overtime 23-19 the beat Caliche 35-22. Go Rams! 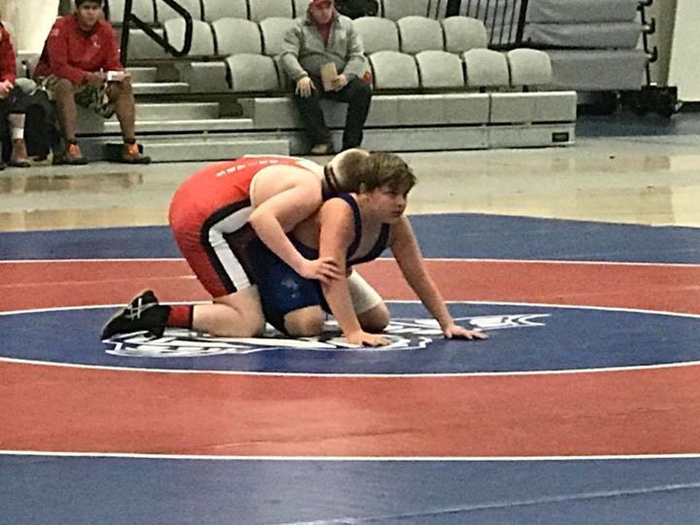 Regional Wrestling Update Justin Traxler and Carson Reese have advanced to the championship round tonight. Seth Dorrenbacher, Derrick Poss, and Jeffrey Pieper are battling through the consolation side of their brackets. Go Rams! 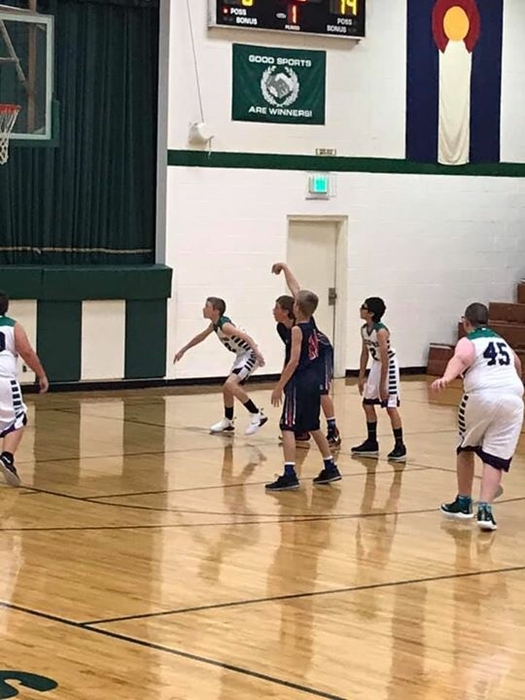 The Akron Ram basketball teams hosted the Wray Eagles tonight. 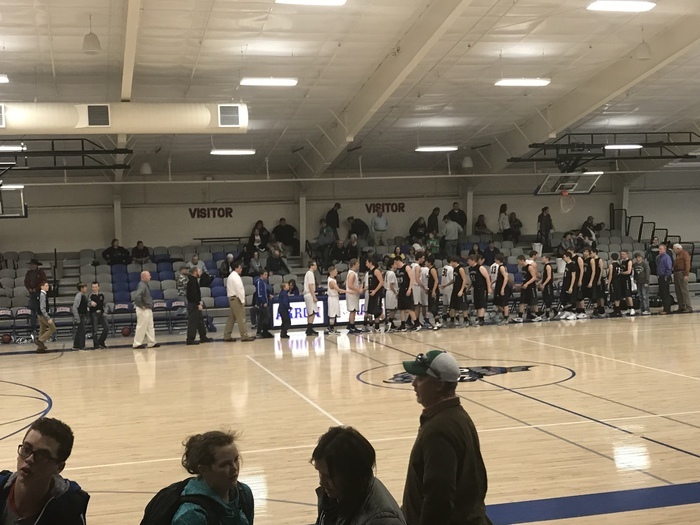 The girls lost 44-75 and the boys won 57-44. The teams will be in action again next Thursday at Yuma. Go Rams! 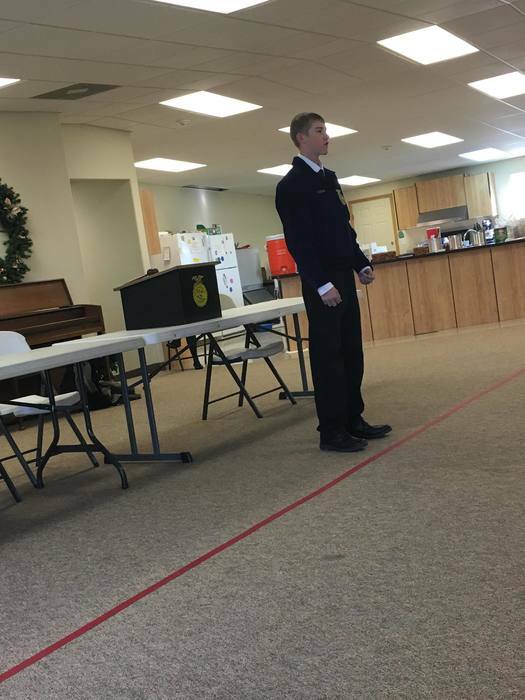 Pictures from the first round of Regionals at NJC. 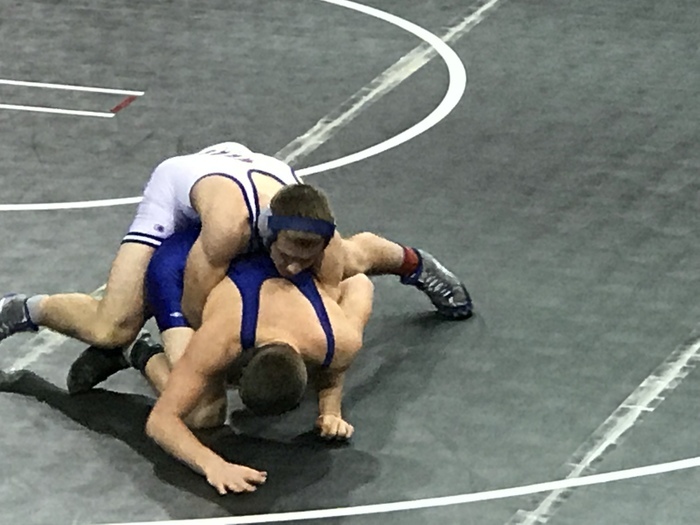 Five Ram wrestlers advanced to the semifinals tomorrow. Go Rams! 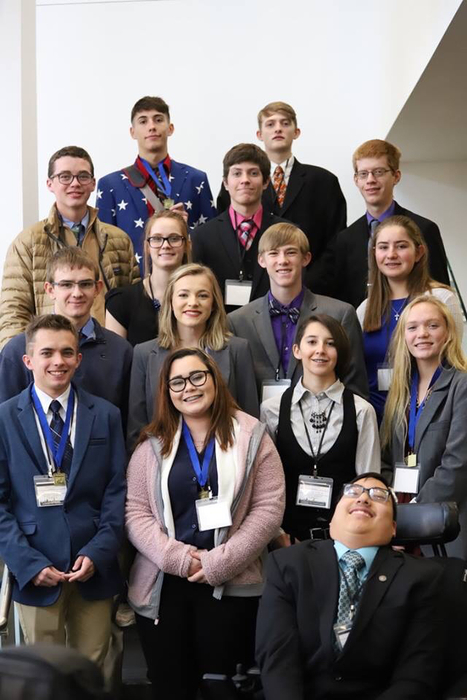 Our Akron FBLA students had another great district competition yesterday, as 27 of our students placedin the top five. 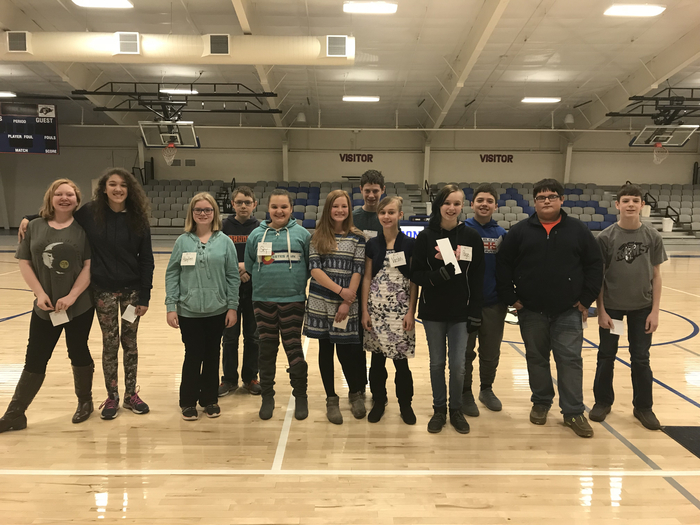 Several students qualified for the state competition that will be held this spring in Vail, CO. Congratulations to all of our students and to their leader Mrs. Ali Houston. Great job Rams!!! 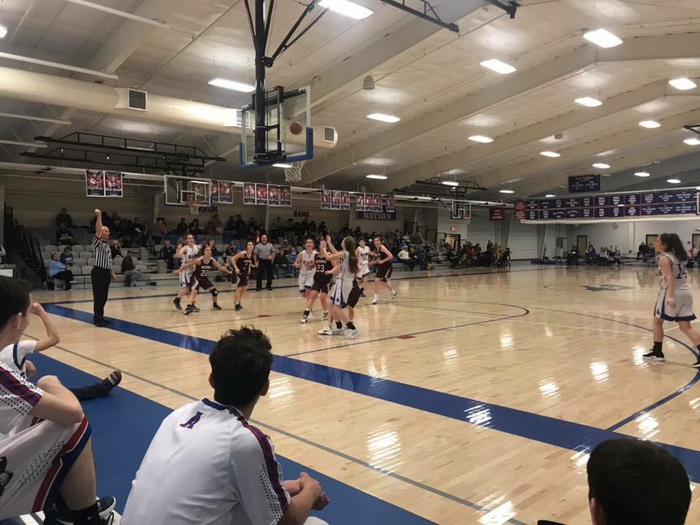 The Akron Ram basketball teams were on the road last night against SedgCo at Julesburg. 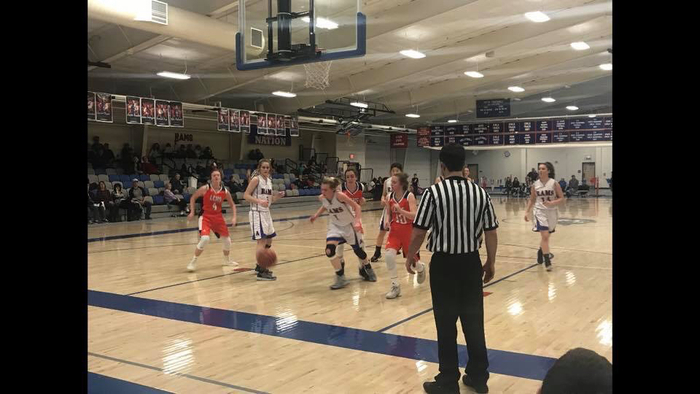 The girls lost 24-44 and the boys lost a close one 40-42. The teams will be at home against Wray tomorrow. First game game starts at 5 pm. Go Rams! We are happy to be hosting this event on February 19th. Please join us for the evening community speaking engagement at 6:30 p.m. Attention Basketball Parents Schedule for Friday vs. Wray No Boys ‘C’ or JV games. 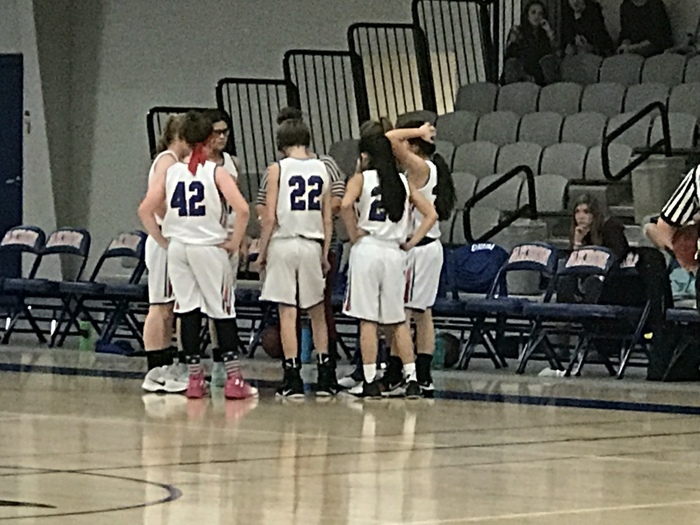 5:00 pm-Girls JV (2 x 8 min.) followed by parents/senior night before Girls Varsity Warmup. Girls Varsity then Boys Varsity. 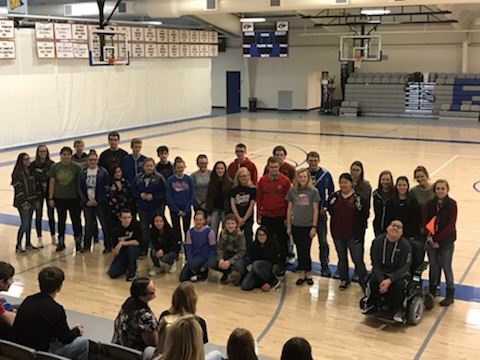 We had a short assembly on Tuesday for our Big Buddy program and winter sport recognition. Go Rams! 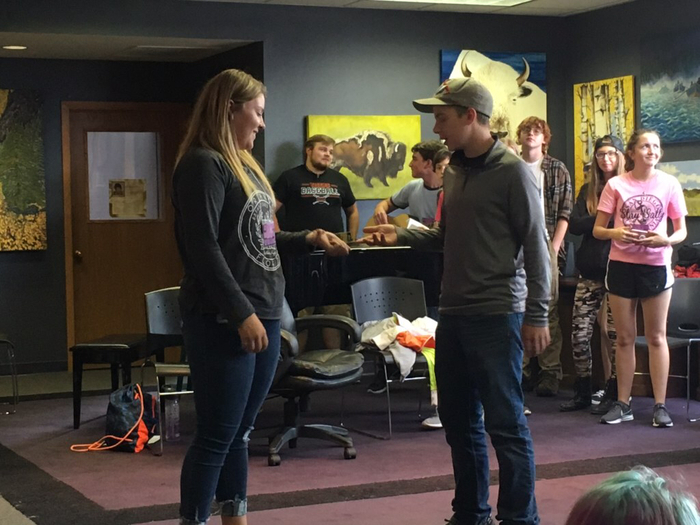 On Monday, Akron FBLA members were treated to a presentation by a couple of young entrepreneurs from Kookie Fairy. 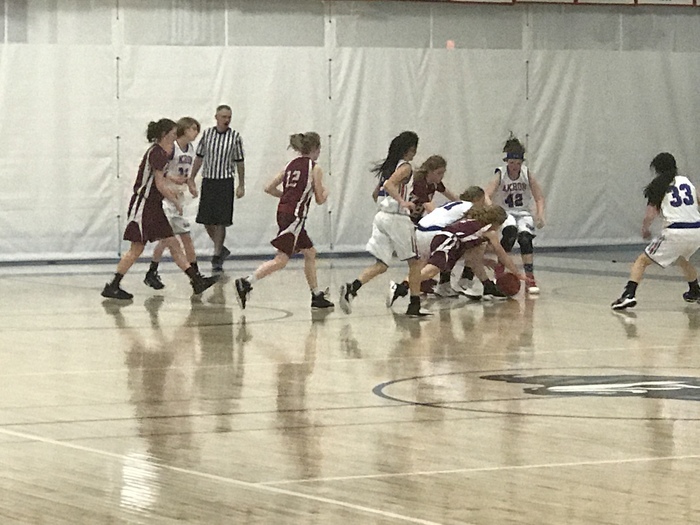 Pictures of our Akron JH girls’ basketball team playing in the Akron Tournament on Monday. Akron J.H. 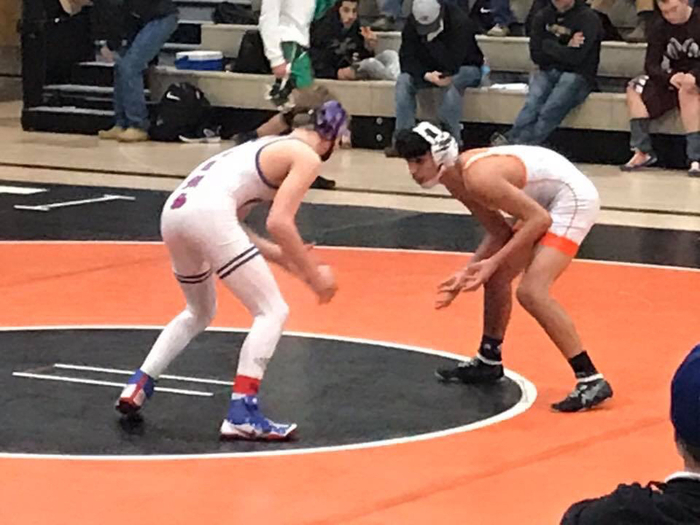 wrestlers competed against other area wrestlers at the Merino Bash on Monday. 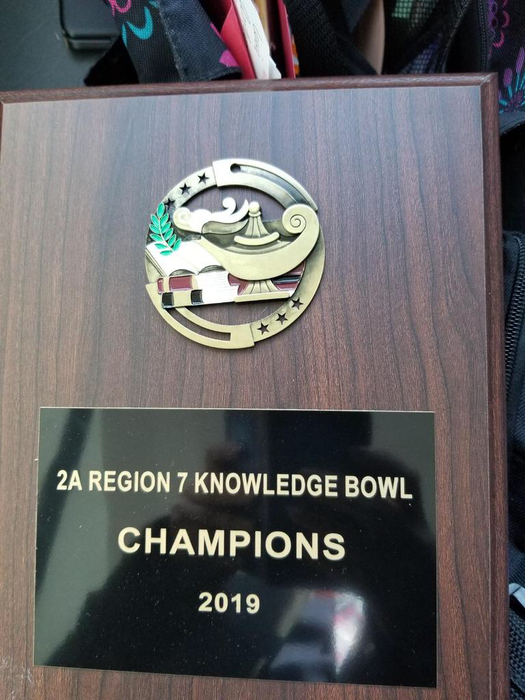 KNOWLEDGE BOWL REGIONAL CHAMPIONS Our high school knowledge bowl team won the 2A Region 7 Championship today and qualified for State. Go Rams! 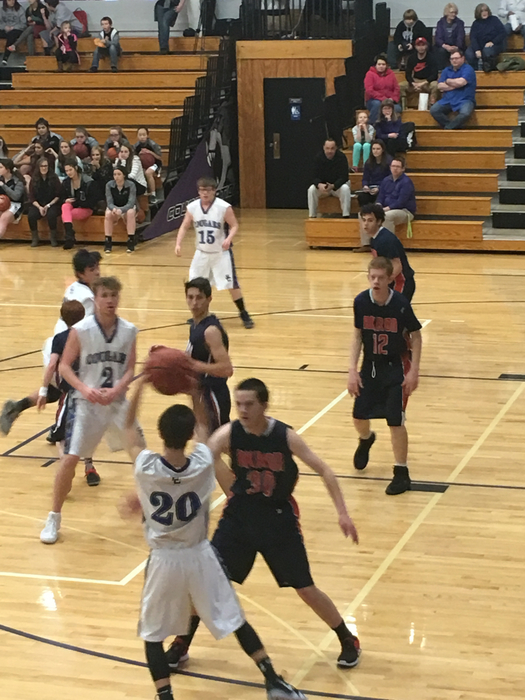 The Akron Ram basketball teams hosted the Holyoke Dragons last night.. 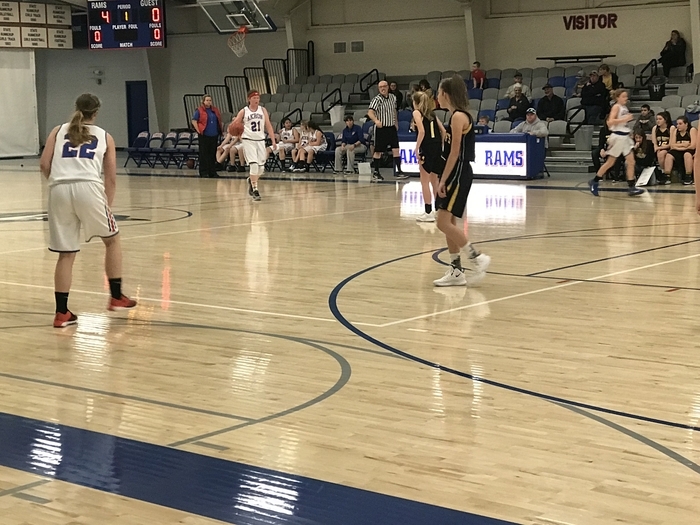 The Rams lost a close one in the varsity boys contest 46-44 and 56-15 in the girls game. 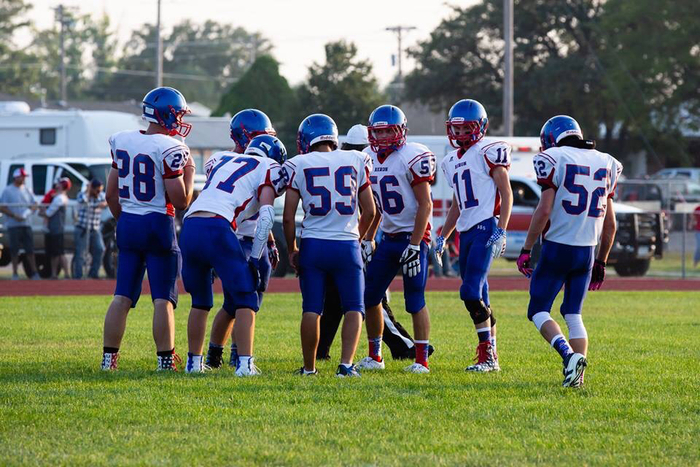 The Rams will look to get on track against Sedgwick County next Thursday at Julesburg. Go Rams! 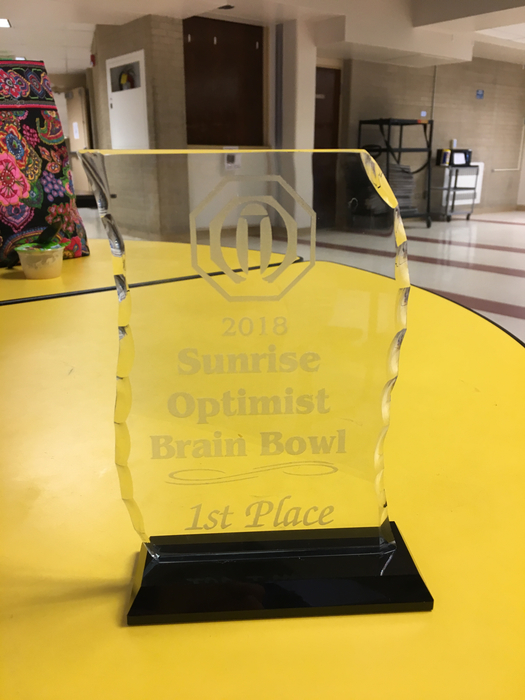 Brain Bowl Champs We had students competing in the Sunrise Optimist Brain Bowl competition held today in Ft. Morgan. 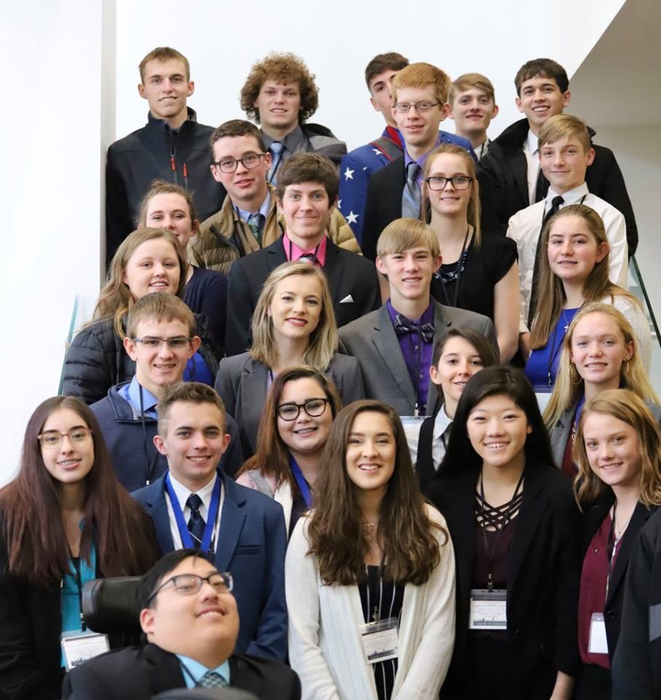 We are extremely proud of all of the students who competed! We had a group in the 5th & 6th grade division win the competition. 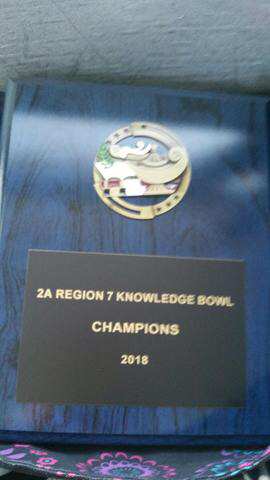 Congratulations Akron Rams!!! 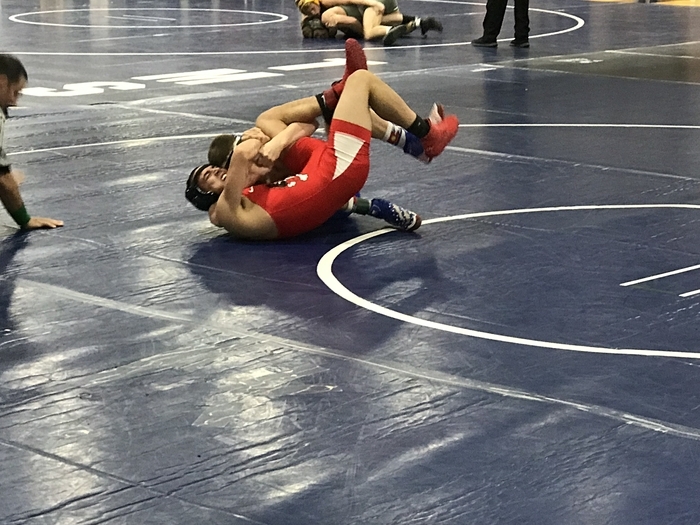 Pictures of our Akron Ram wrestlers at the Eaton Team Tournament held today. 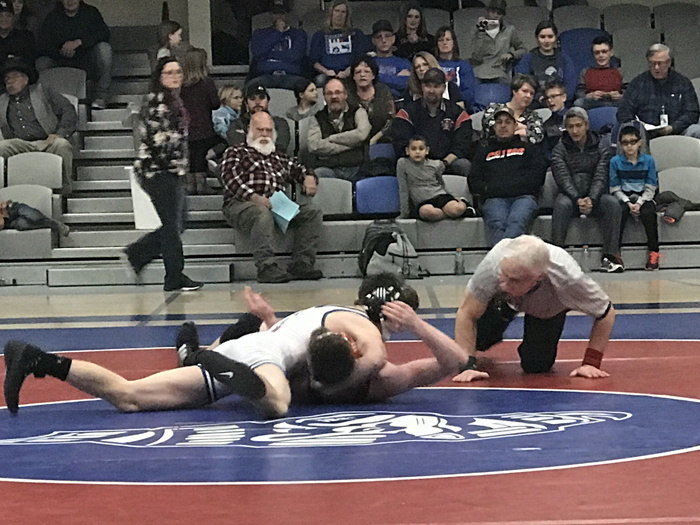 The Ram wrestlers will compete in Regionals next Friday and Saturday at NJC in Sterling. Go Rams! 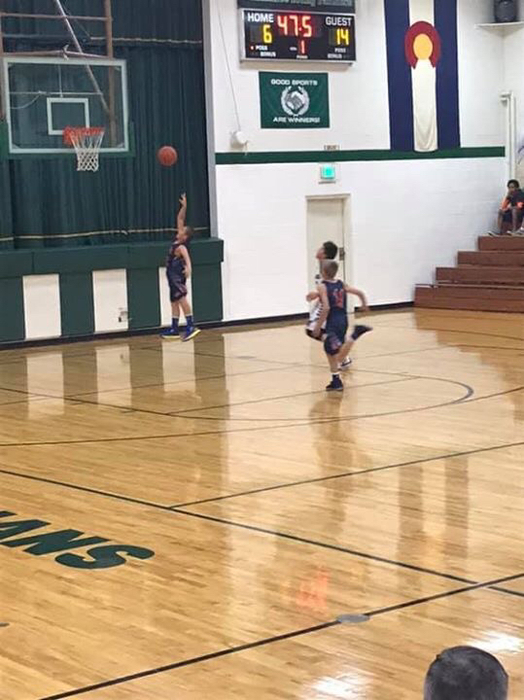 Our Akron Ram basketball teams were on the road at Haxtun tonight. 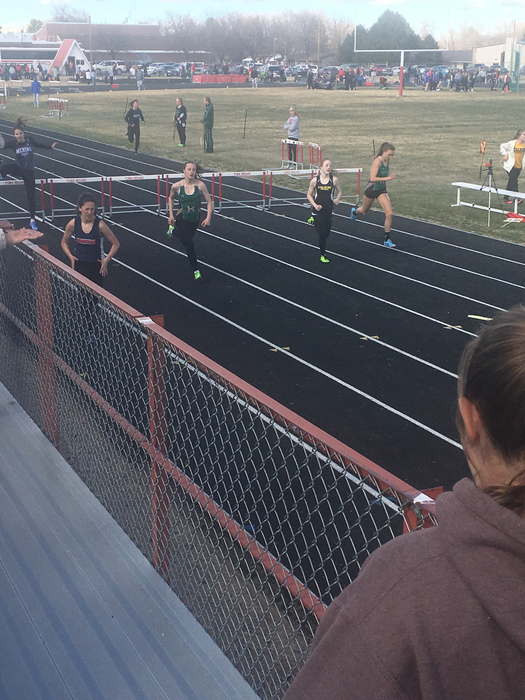 Akron results: JV Girls won 21-14, JV Boys lost 34-13, Varsity Girls lost 35-67, and Varsity Boys lost 54-57. 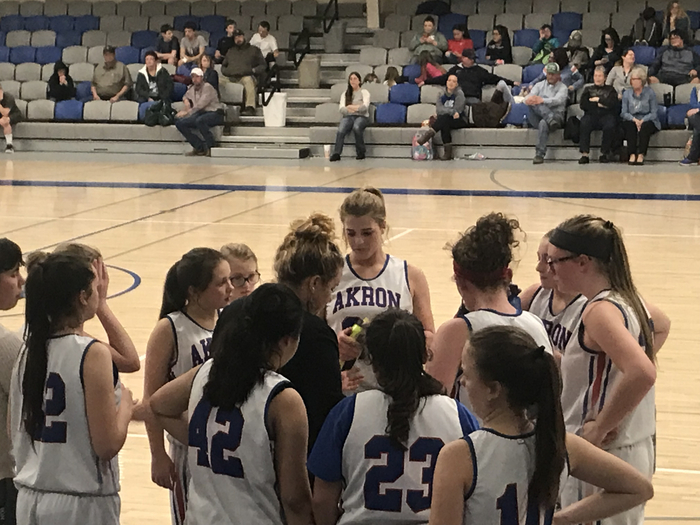 The Akron Ram basketball teams will host the Holyoke Dragons tomorrow starting at 2 p.m. Go Rams! 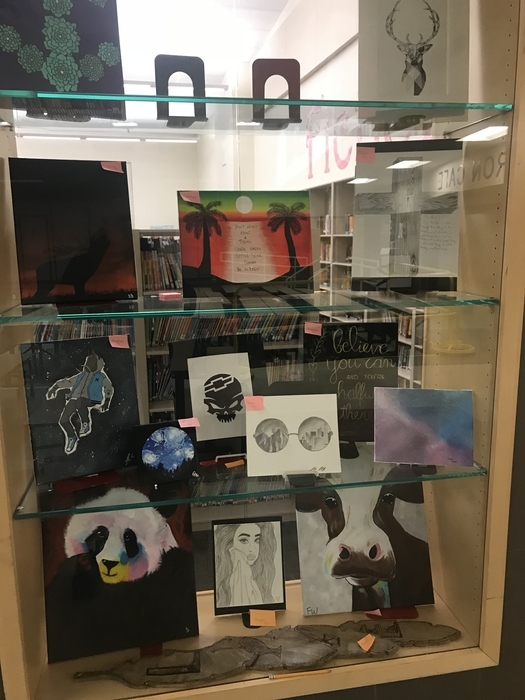 Akron Ram student art is on display in our cafetorium. We had the privilege of meeting Ms. Kylie Gardener at our home basketball game on Thesday night. She is the daughter of Tanya Thomsen Gardener who graduated from Akron H.S. in 1993. Kylie has been through a lot for a 17 year old and is now on a mission to bless others. 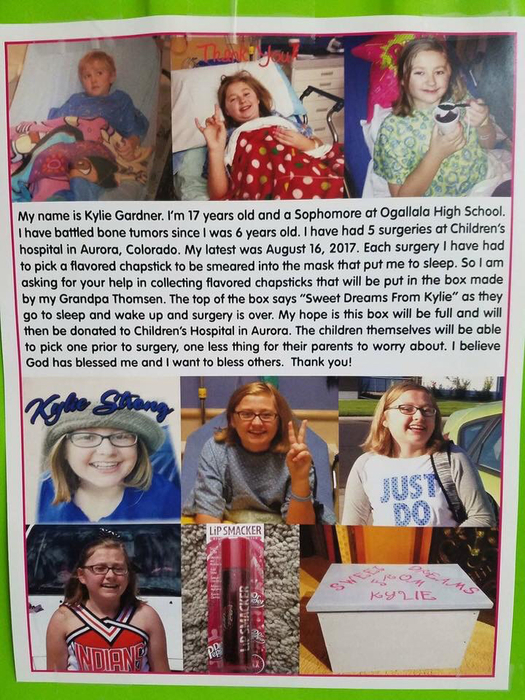 Please take the time to read her story in the photo below. The Akron Lady Ram basketball team met Kylie and gave her flavored chapsticks they collected for her cause. 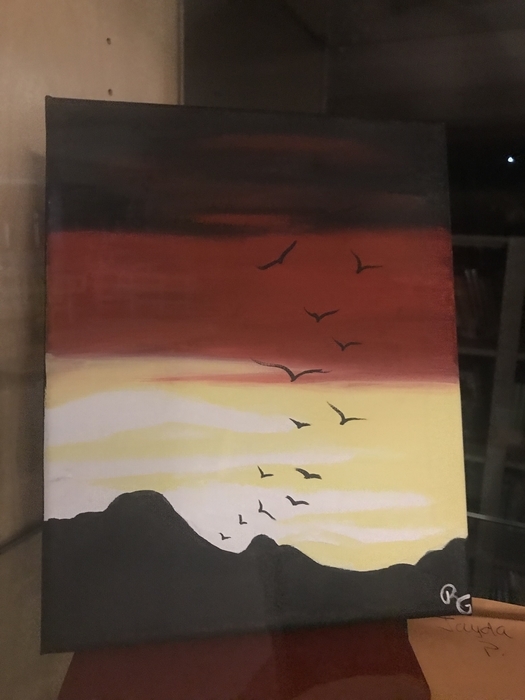 Thank you, Kylie! 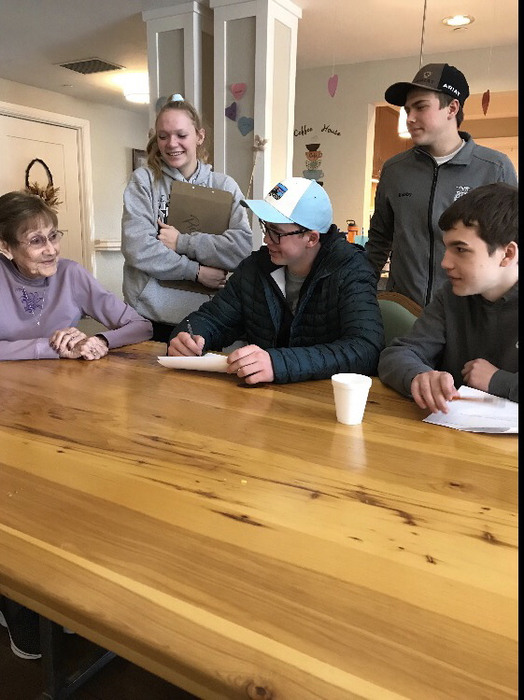 Students from Mr. Samber’s history class visited the Washington County Nursing Home on Thursday to interview their elders. 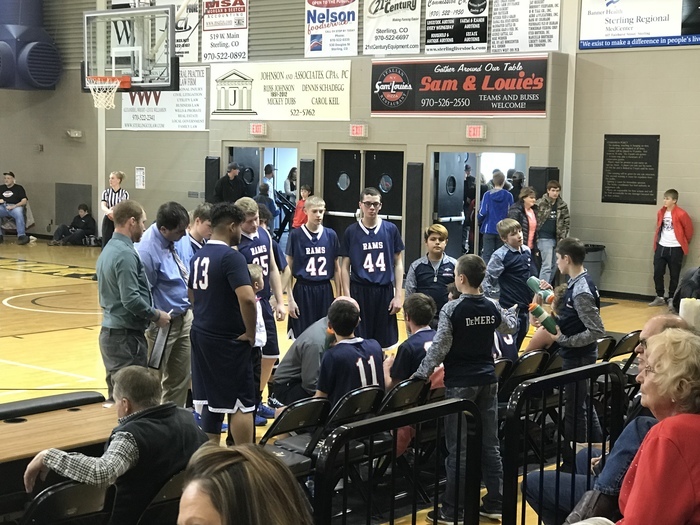 The Akron Ram basketball teams hosted the Fleming Wildcats on Tuesday night. 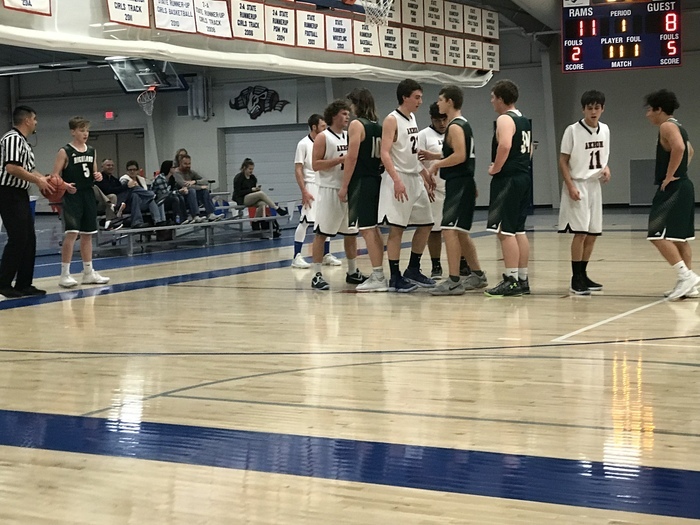 The girls lost 21-64 and the boys won 51-45. Go Rams! 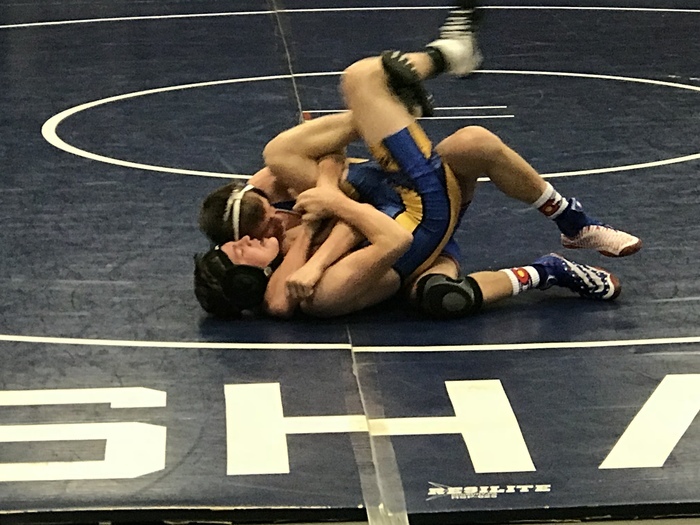 Thornton Invitational Our Akron Ram wrestlers faced some good competition at the Thornton Invite yesterday. As a team the Rams scored 53 points and finished 13th out of 24 teams. Placers: Carson Reese 3rd, Justin Traxler 4th, and Derrick Poss 4th. Good job Ram wrestlers! 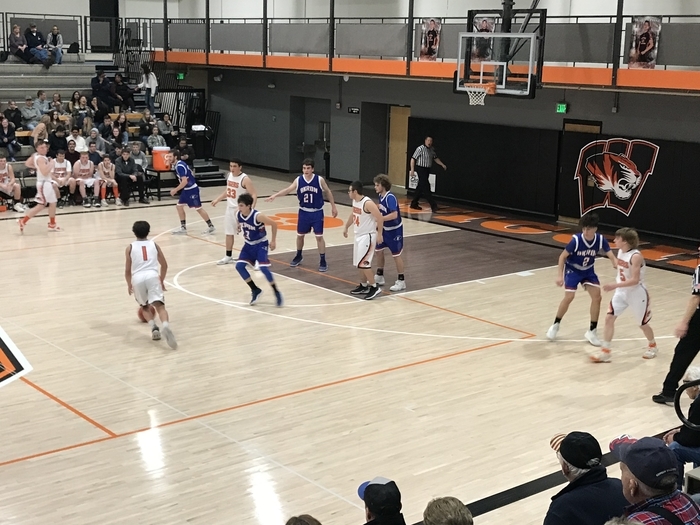 The Akron Ram boys basketball team beat the Wiggins Tigers tonight 59-40. Go Rams! 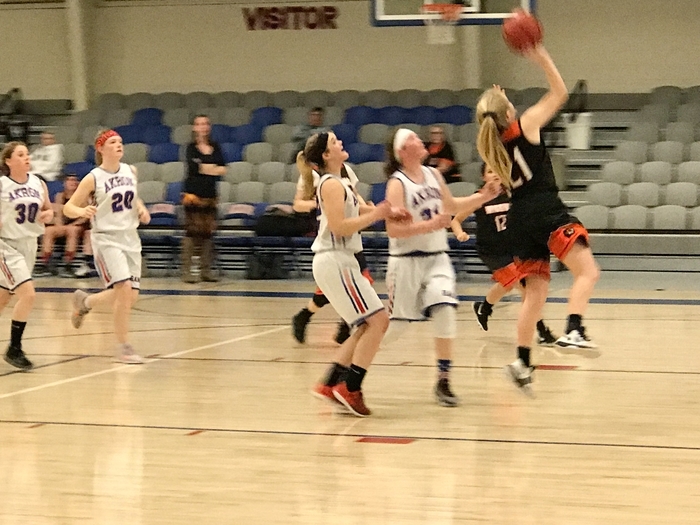 The Akron Lady Ram basketball team lost to the Wiggins Lady Tigers tonight 33-44. 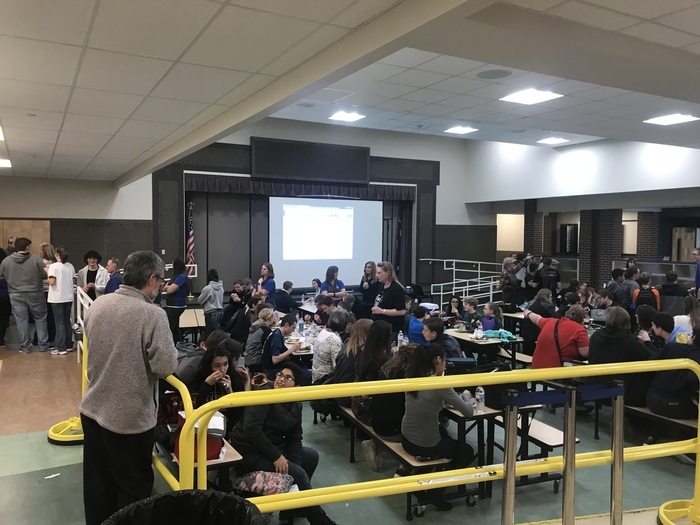 We had a wonderful day hosting the Akron JH and HS Knowledge Bowl today. 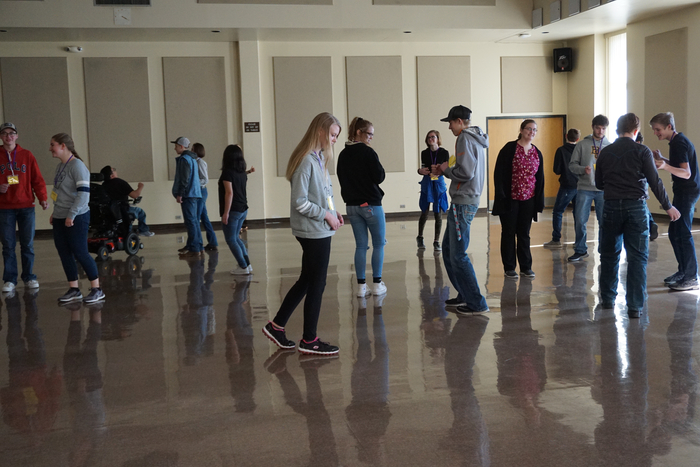 We had over 120 students compete today from Akron, Burlington, Holyoke, Ft. Morgan, Merino, Wiggins, Wray, and Yuma. Top 3 JH results in order: Wiggins, Ft. Morgan, and Burlington Top 3 HS results in order: Ft. Morgan, Akron, and Holyoke. Thank you to everyone who helped and competed today! 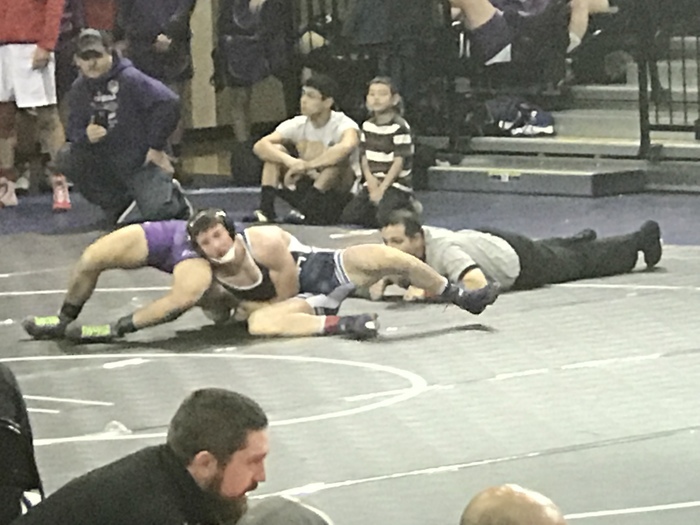 The Akron HS wrestlers won their dual against Holyoke last night 33-18. Good job Rams! 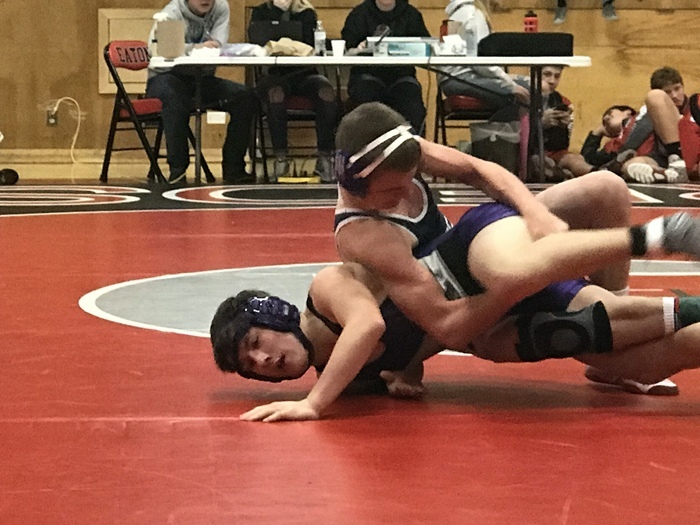 Our Akron JH wrestlers got things started last night in the wrestling dual against Holyoke. Good job guys! 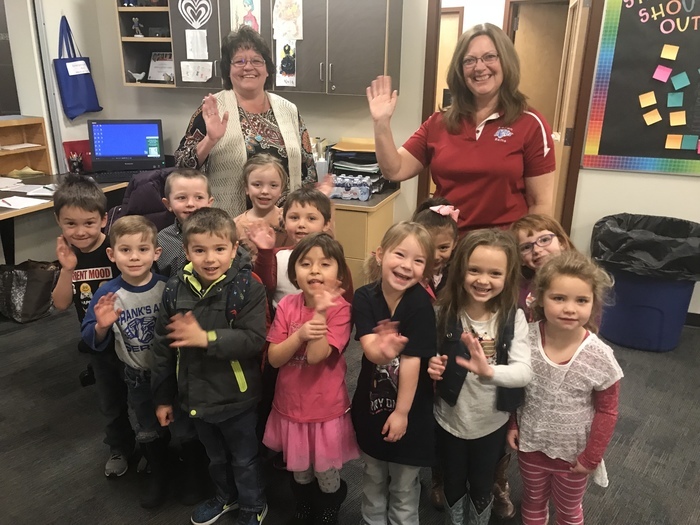 Mrs Blake and Mrs. Hill were in the office yesterday morning with their preschool students to lead the school in the Akron Ram fight song. 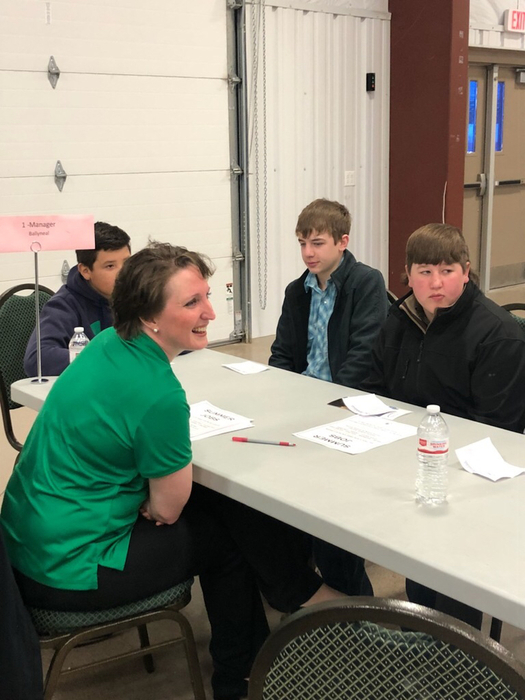 Career Fair Mrs. Weers and our 8th grade students attended a career fair in Holyoke this week. 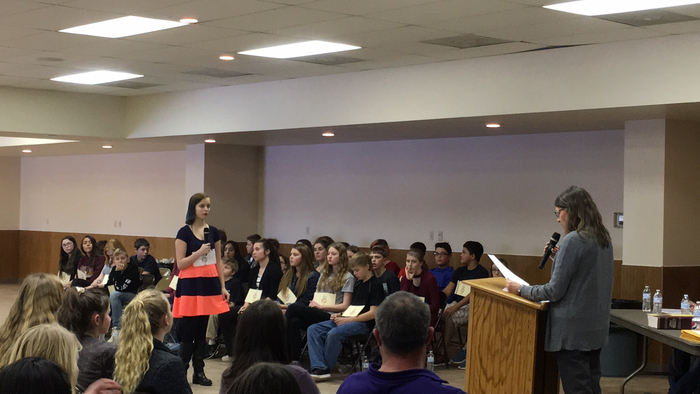 Pictures from the Regional Spelling Bee held in Brush this week. 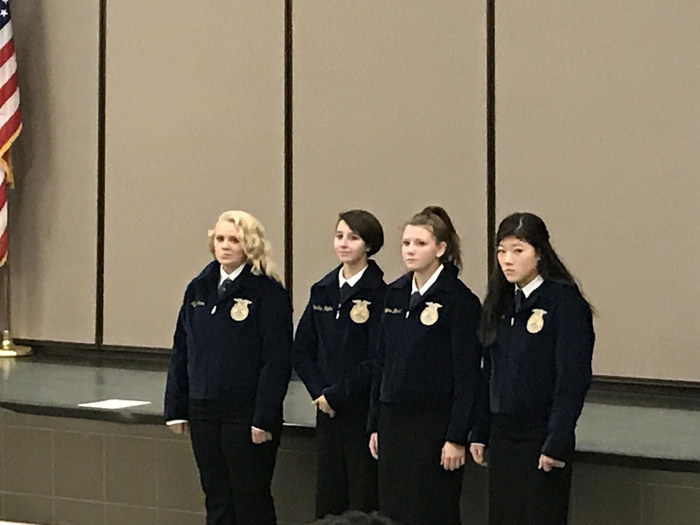 We had four students advance to the oral round and one qualify for State. 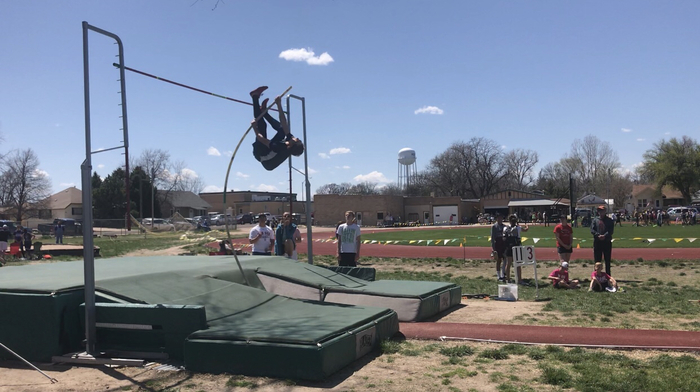 Congratulations and good luck at State, Syvannah McGuire! Our J.H. 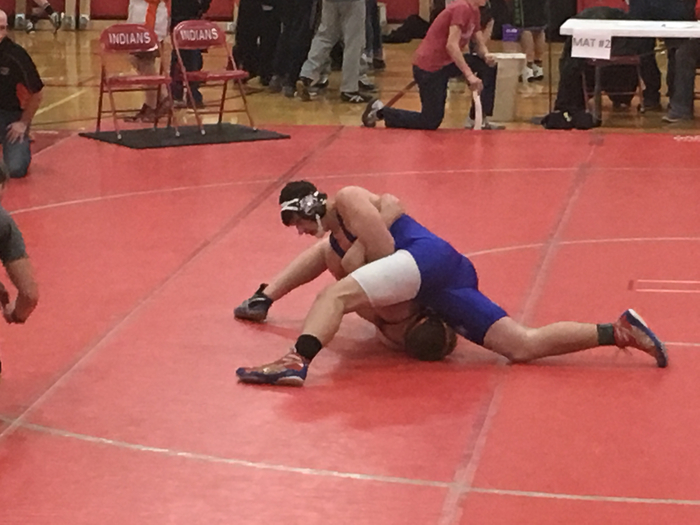 wrestlers performed well at the Brush Invitational today. Placers: Anthony Benavides 1st, Laden Sampson 2nd, Xavier Livesay 2nd, Gavin Brown 2nd, Evan Vogt 3rd, and Wade Brown 3rd. Good job Rams! 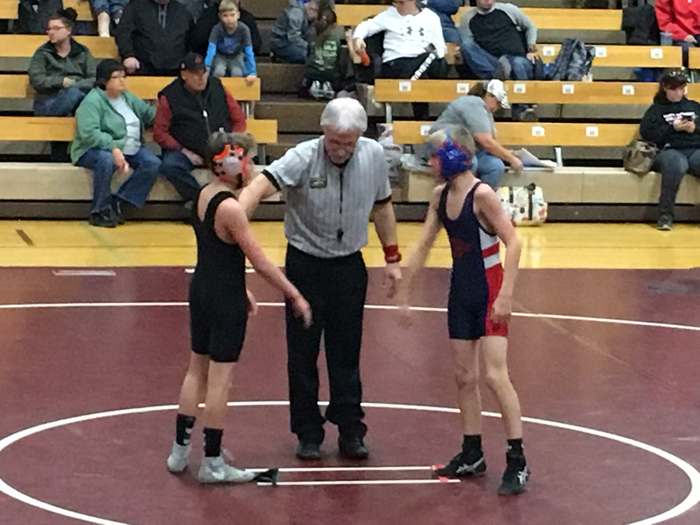 Our Akron Ram wrestlers were at the Platte Valley Team Tournament in Kersey today. 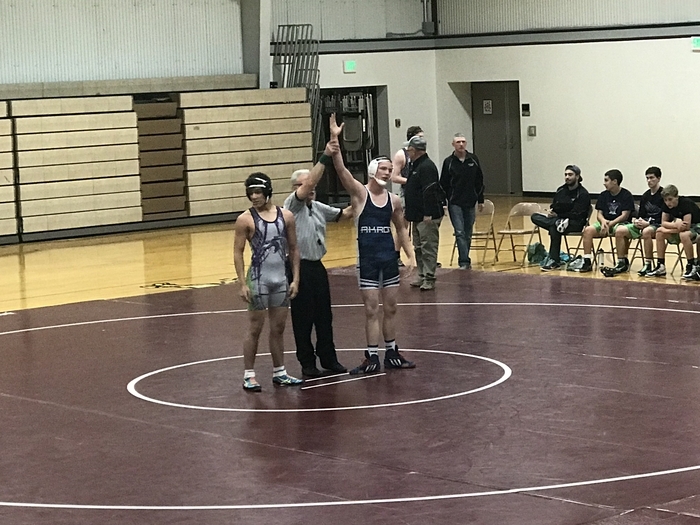 The Rams won just one dual as a team because of forfeits at open weights but had several very good individual performances. Good job Rams! 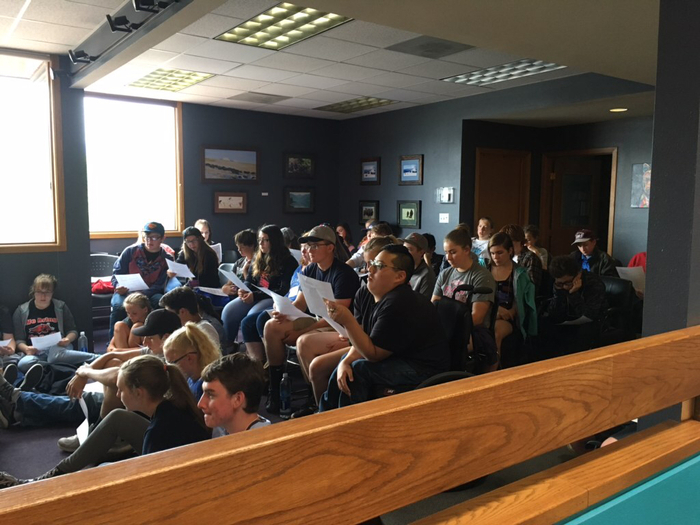 Mrs. Cambell’s first block class was in the office yesterday for Fight Song Friday. 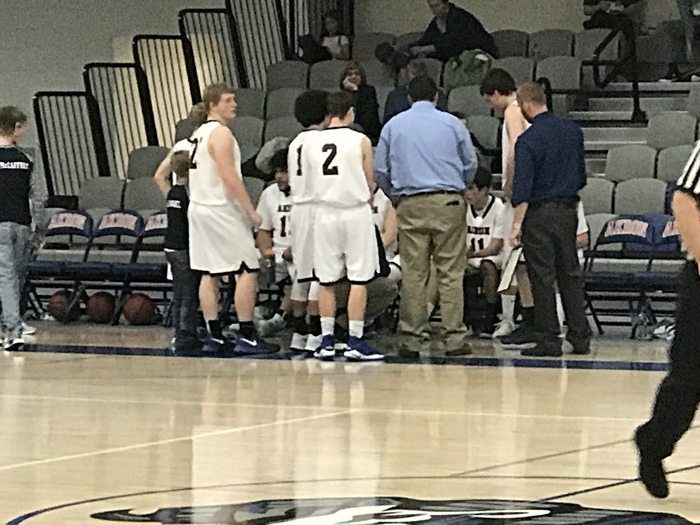 The Akron Ram basketball teams lost their contests against the Highland Huskies tonight. 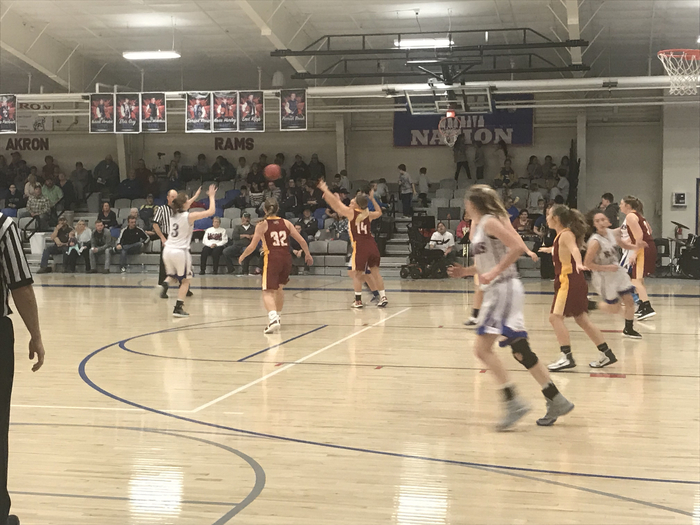 The Lady Rams lost to the Lady Huskies 44-25. The Akron Ram boys lost a hard fought game 61-55. 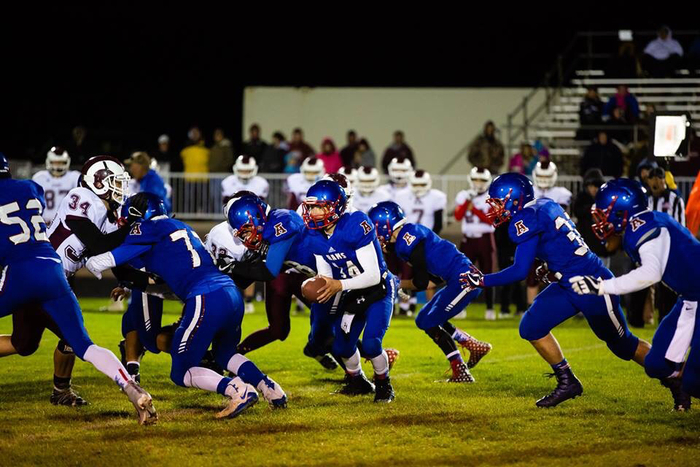 The Rams will play at Limon tomorrow night. Go Blue! 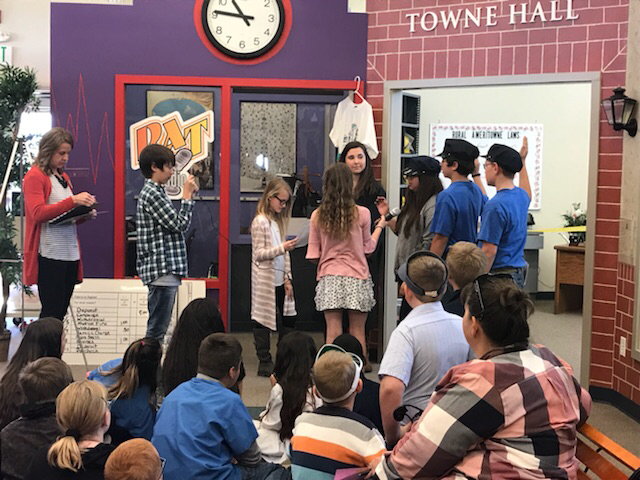 We had our district spelling bee yesterday. 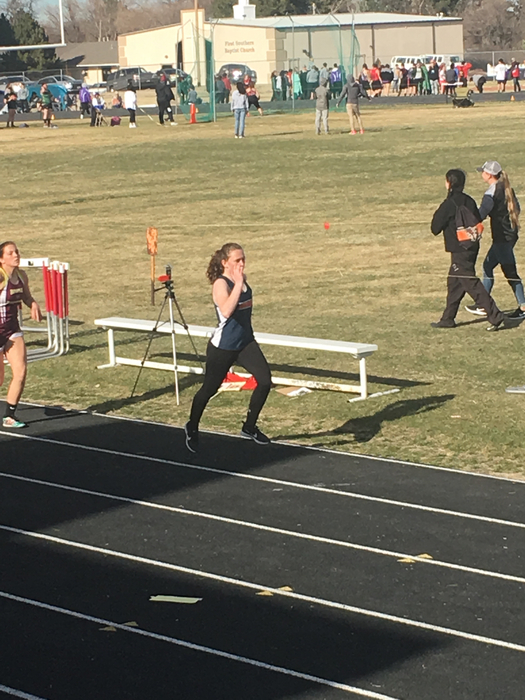 Paige Werner finished 1st and Syvannah McGuire 2nd. Six other qualifiers will be joining our two finalists at regionals in Brush next week. Great job Rams! 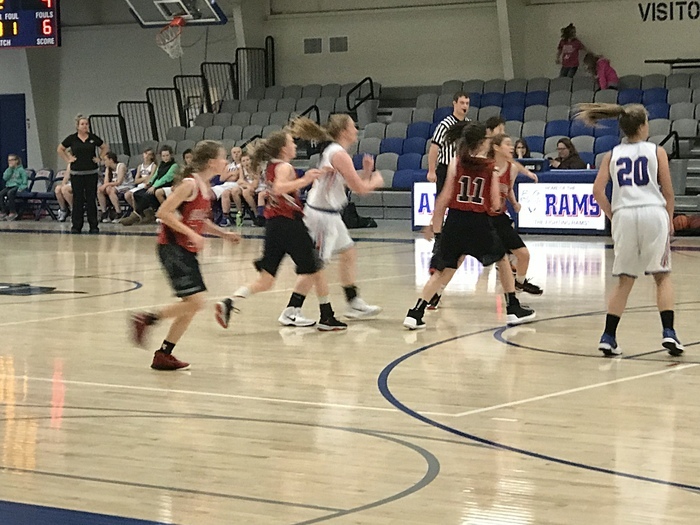 The Akron Ram JH girls basketball teams hosted the Merino Rams tonight. The ‘C’ team won, ‘B’ and ‘A’ teams lost. Our girls continue to show improvement. Good job ladies! 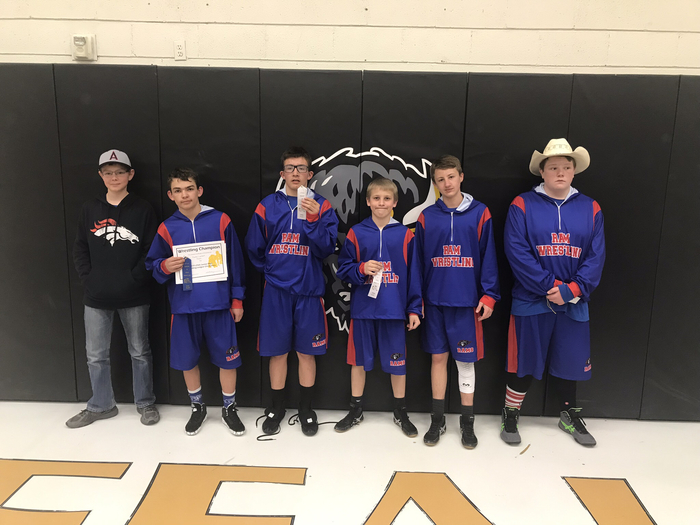 The Akron Ram wrestlers had a very good day at the Englewood Pirate Invitational in Denver on Saturday.. All seven wrestlers placed and as a team the Rams finished 4th with 94 points. 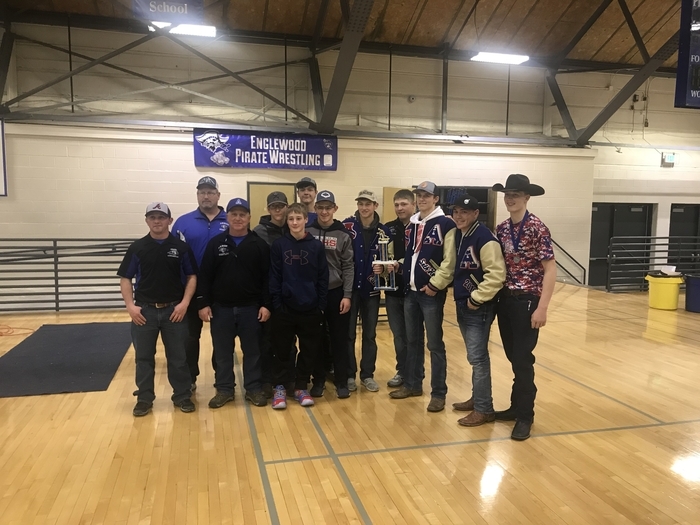 Placers: Elvis Guy 1st, Seth Dorrenbacher 1st, Justin Traxler 1st, Derrick Poss 1st, Cameron Collin 3rd, Carson Reese 3rd, and Jeffrey Pieper 4th. Great job Fighting Rams! 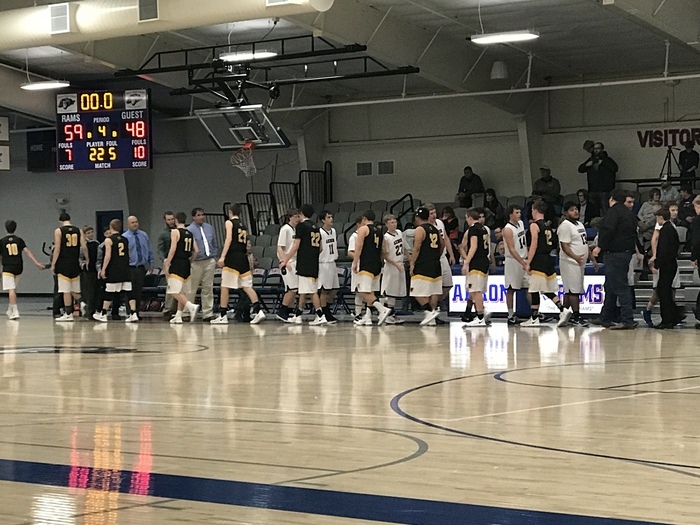 The Akron Ram boys basketball team defeated the Merino Rams 44-29 Friday night. Good job Akron Rams! 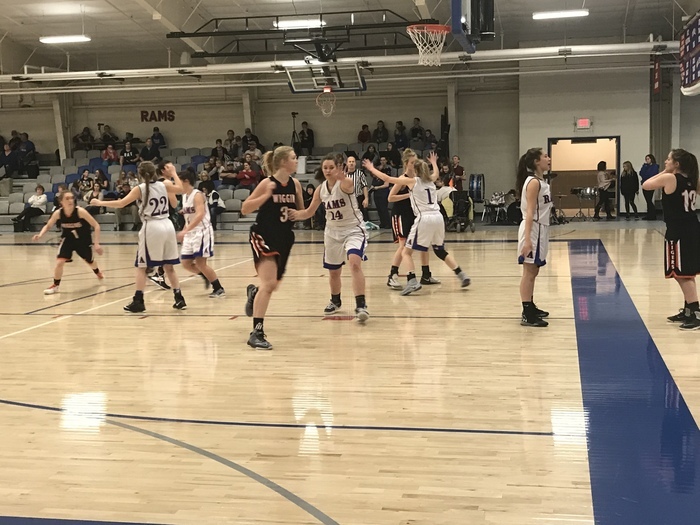 The Akron Lady Rams lost to the Merino Lady Rams Friday night at home 36-23. 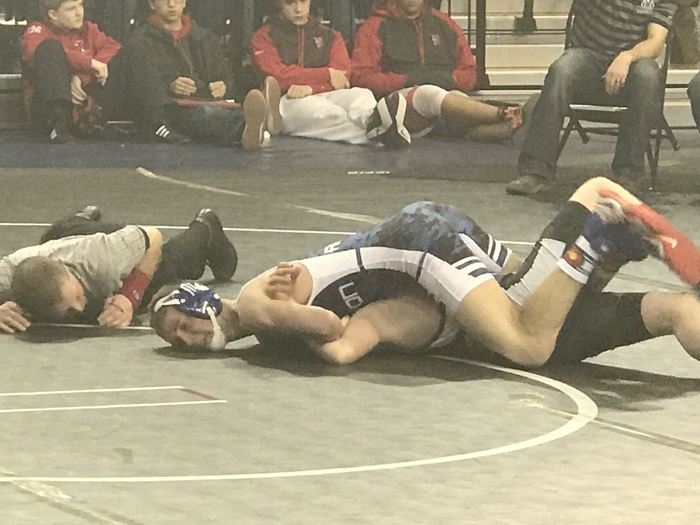 Pictures from the Akron HS wrestling dual against Yuma this past Thursday night. Nice job Ram wrestlers! 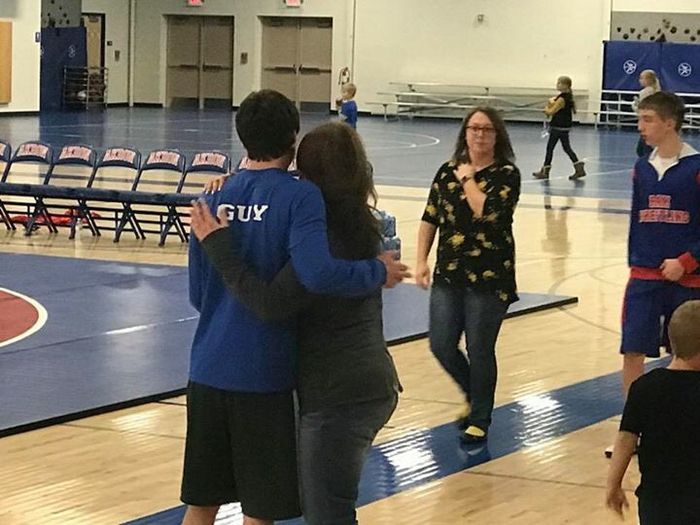 Parents Night was held prior to the wrestling dual against Yuma Thirsday night. 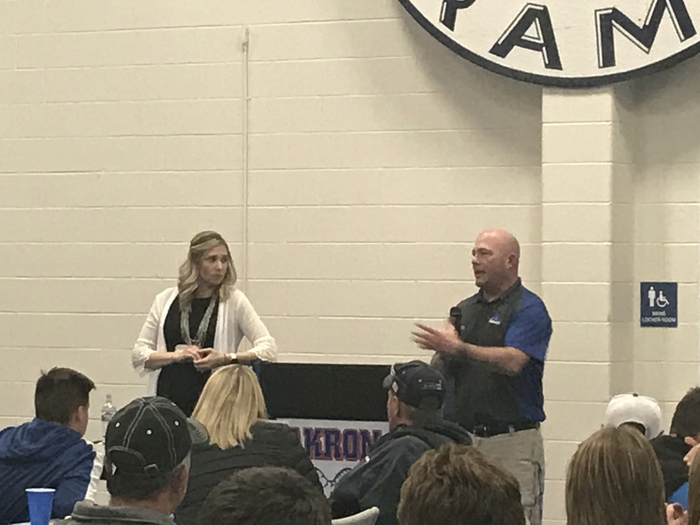 Thank you parents for all you do to support your wrestler and the Akron team! 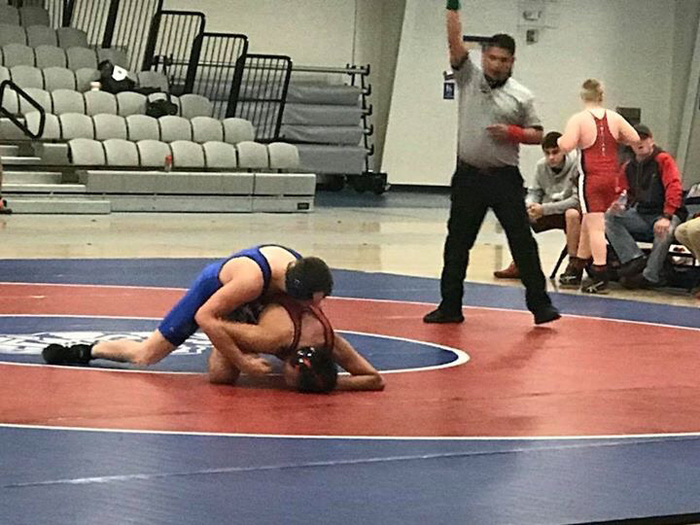 Akron JH wrestlers in action last Thursday against Yuma. 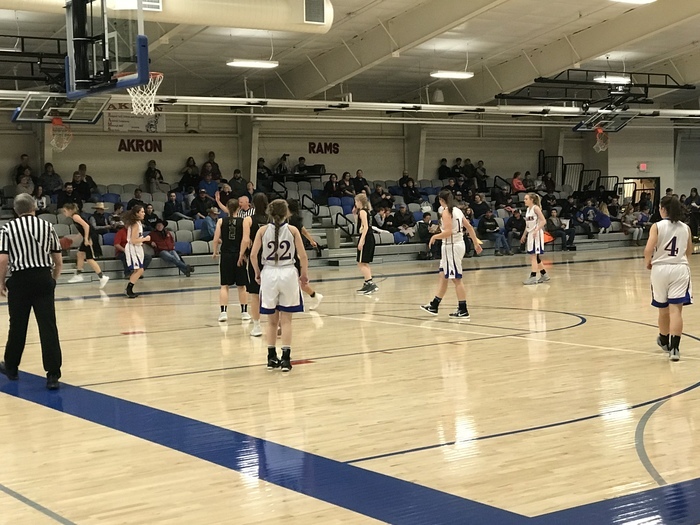 The Akron Lady Rams lost to the Merino Lady Rams tonight at home 36-23. 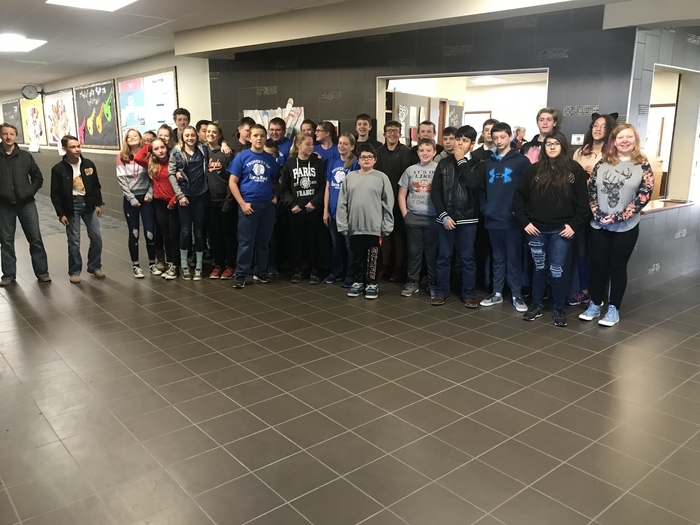 Pictures of JH and HS students being recognized on the Honor Roll for first semester. Great job Rams! Mr. McFadden and his 5th grade class in the office this morning to lead the school in the fight song. 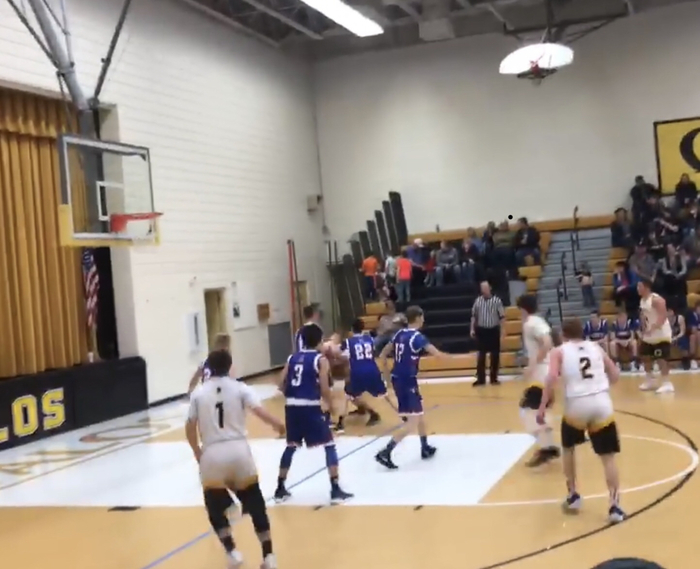 The Akron Ram boys basketball team won their game at Otis tonight 61-46. Great job guys. Go Fighting Rams! 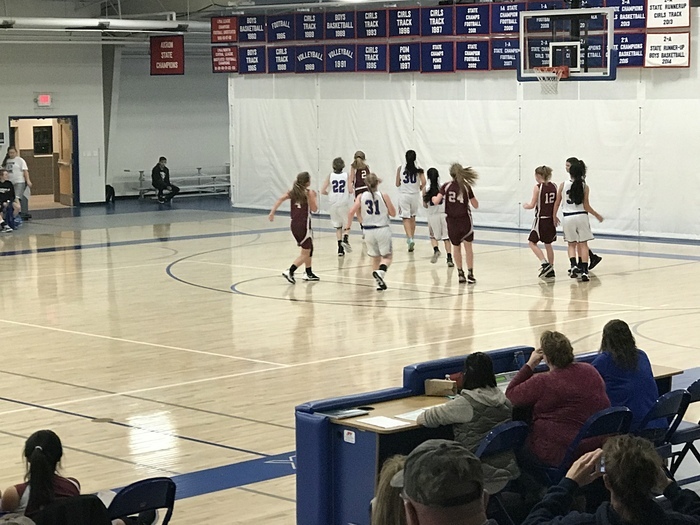 The Akron Lady Ram basketball team picked up a win on the road at Otis 32-27. Great job ladies! Go Fighting Rams! 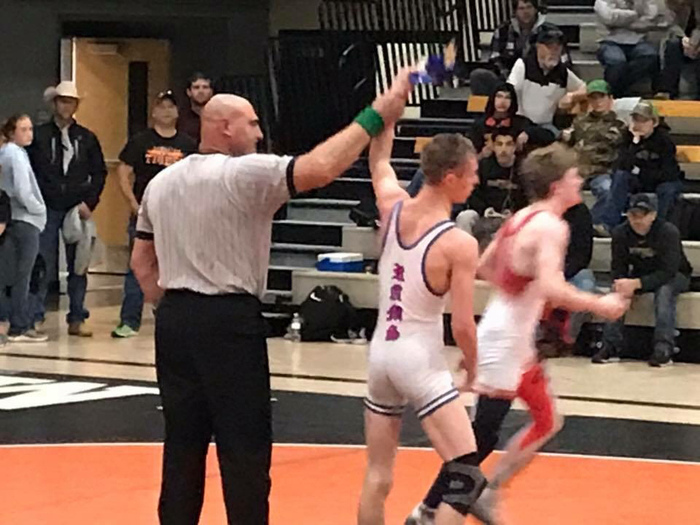 Arnold Torgerson Invitational in Ft. Collins The Akron Ram wrestlers didn’t have any placers today but they did wrestle well against some very good competition. 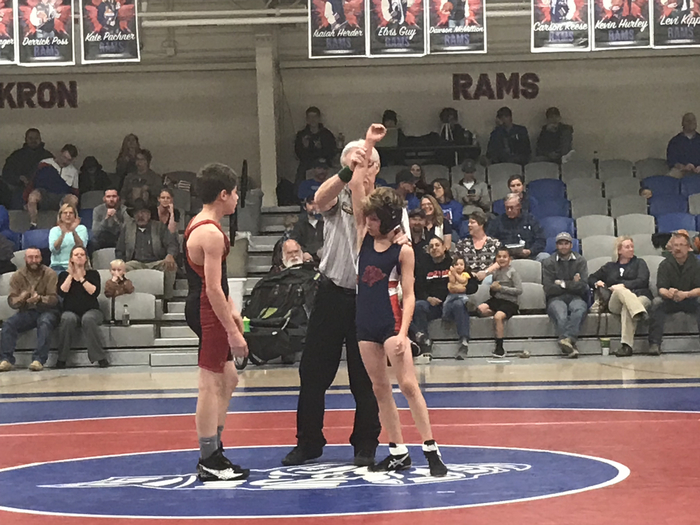 The Ram wrestlers will be in action again this next Thursday at home against Yuma. 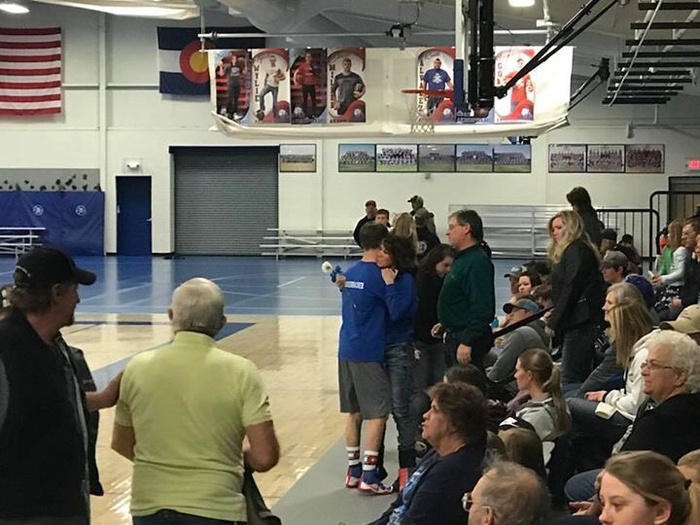 It will also be parents night so come out and fill up the field house to support our wrestlers who spend a big part of their season on the road. Go Fighting Rams! 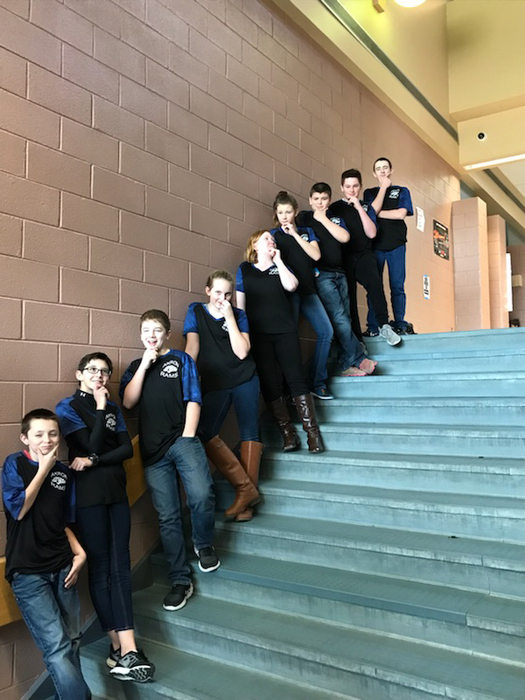 Our JH Knowledge Bowl teams in Denver today. The Akron Ram H.S. 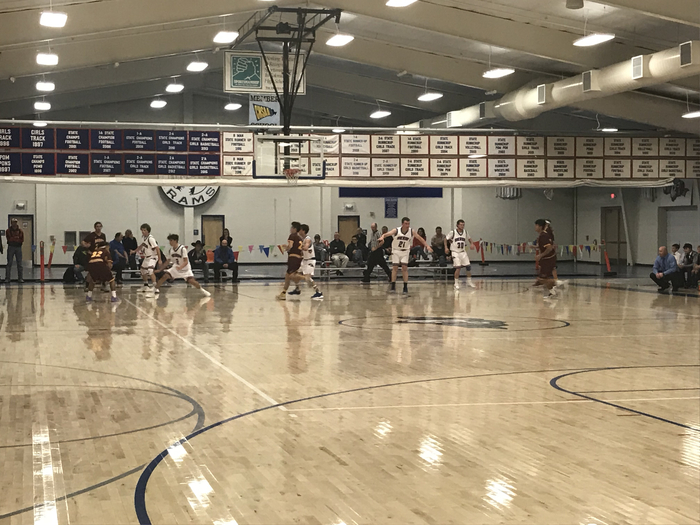 basketball teams hosted the Caliche Buffaloes last night. 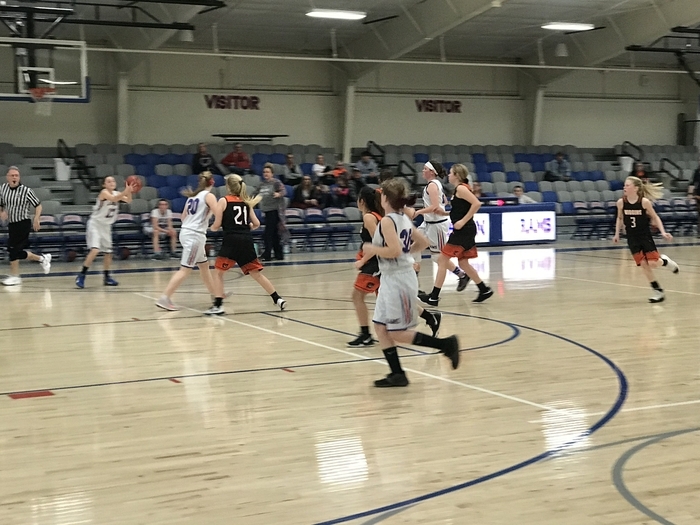 The varsity girls battled but came up short 33-46. 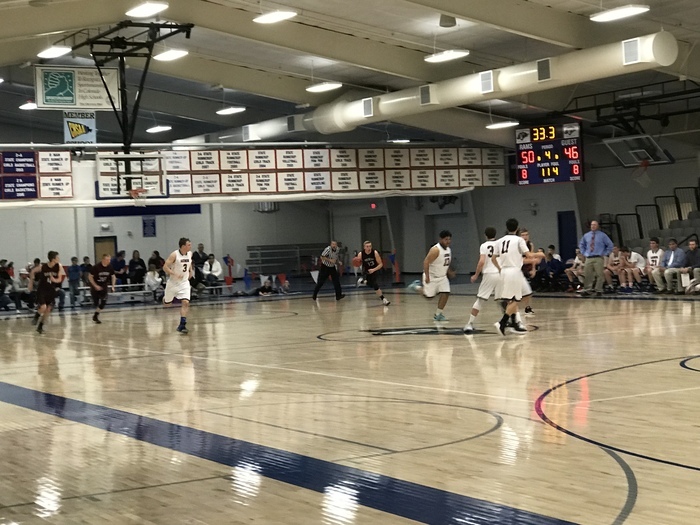 The varsity boys pulled away in the 4th quarter for a 59-48 victory. Go Rams! 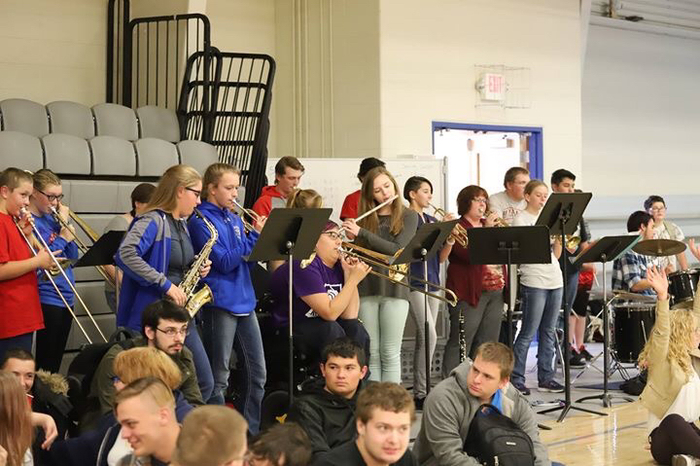 Ms. Lowry and her Akron Ram band playing at the basketball games last night. 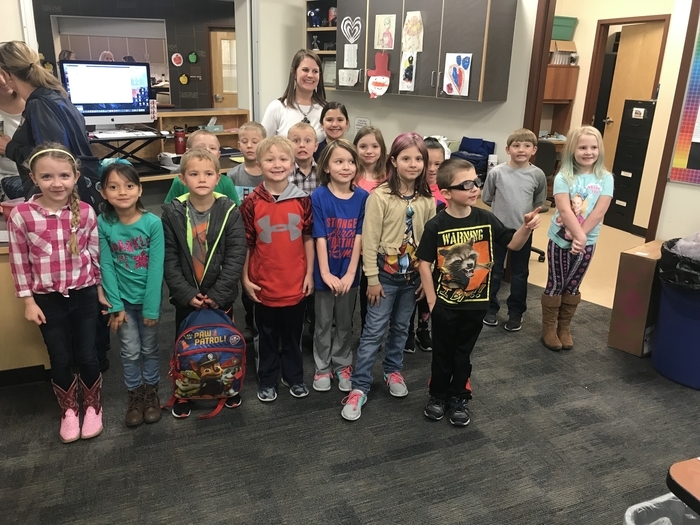 Mrs. Poss and her kindergarten class led the school in the fight song yesterday for Fight Song Friday. Go Rams! Attention Akron Ram Basketball Parents and Fans The games at Otis on Saturday will be varsity only. Girls will play at 3 pm and Boys at 4:30 pm. 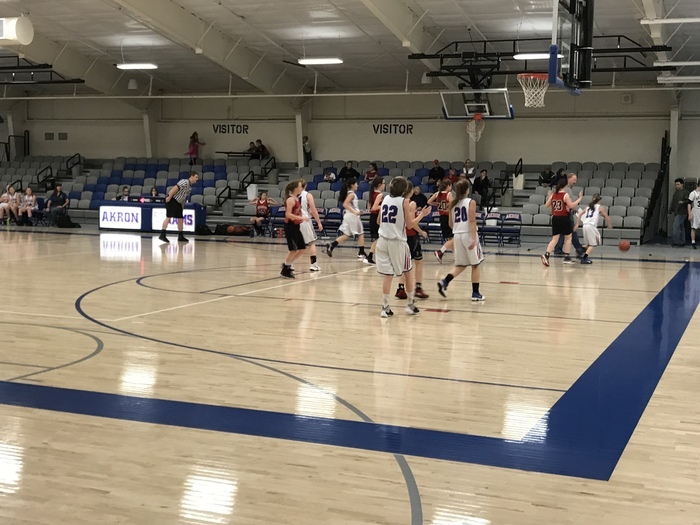 Akron JH girls and boys basketball against Otis tonight. Great jobto both teams! 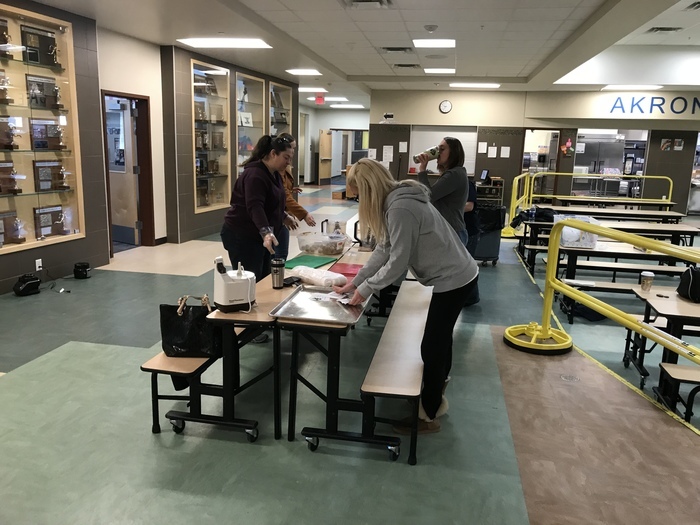 We had some volunteers in today preparing the snack for our Rockin’ Rams Refuel program. 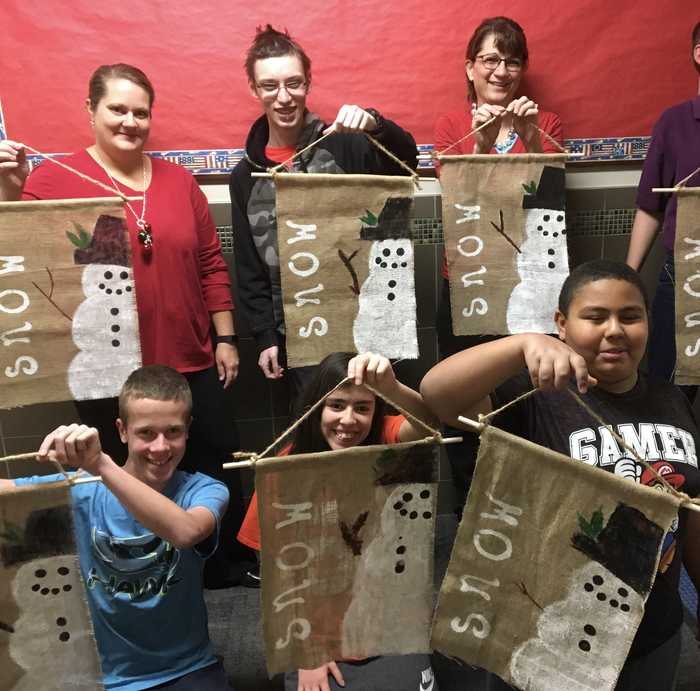 Akron students had a blast with their snowman project! Do you like our new website? Download the app for your mobile devices! 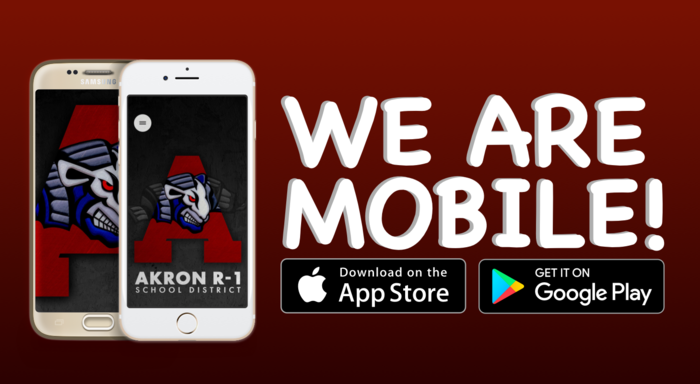 Search your app store for Akron School District.